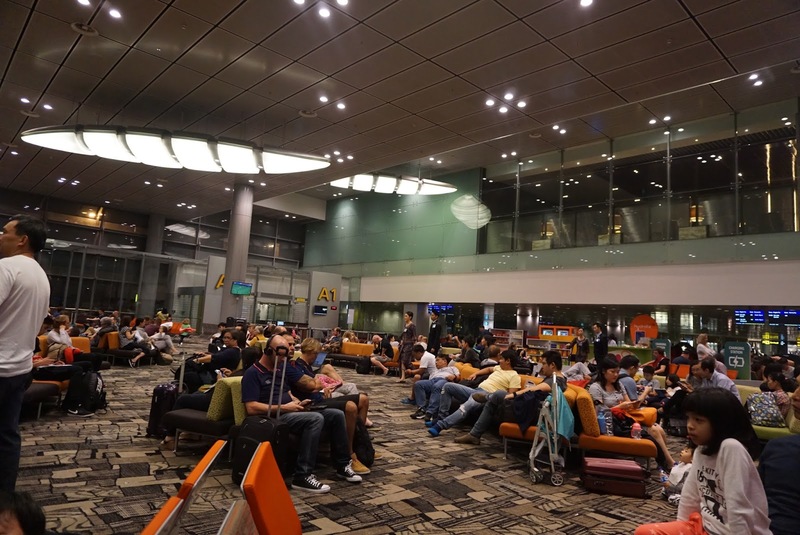 Singapore Airlines uses Terminal 2 in Singapore Changi Airport for flights departing to Bangkok. 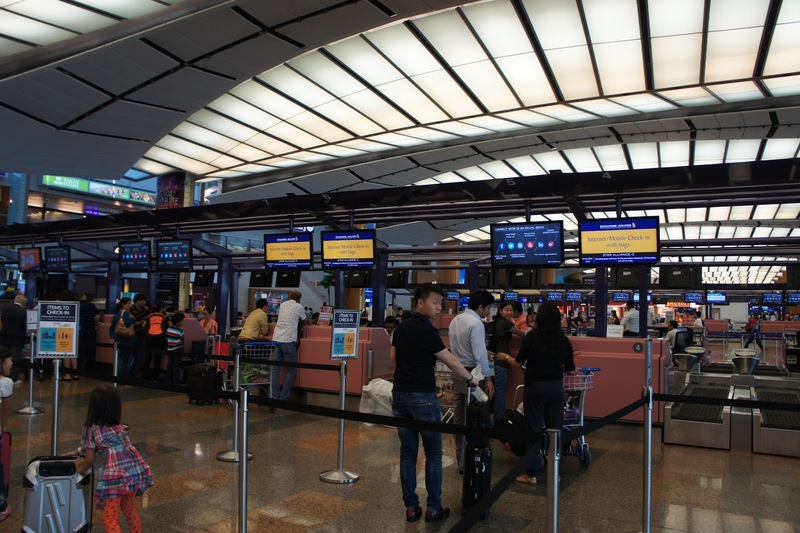 Check-in counters for SQ are located in rows 3 and 4, with row 4 catering for passengers who opt for self check-in and baggage drop offs. 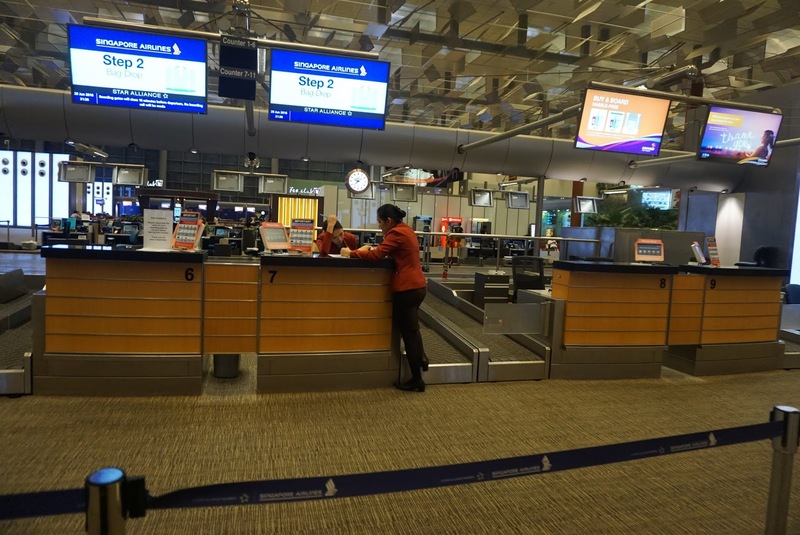 We used the counters in row 3 to check-in due to our bulky luggage. 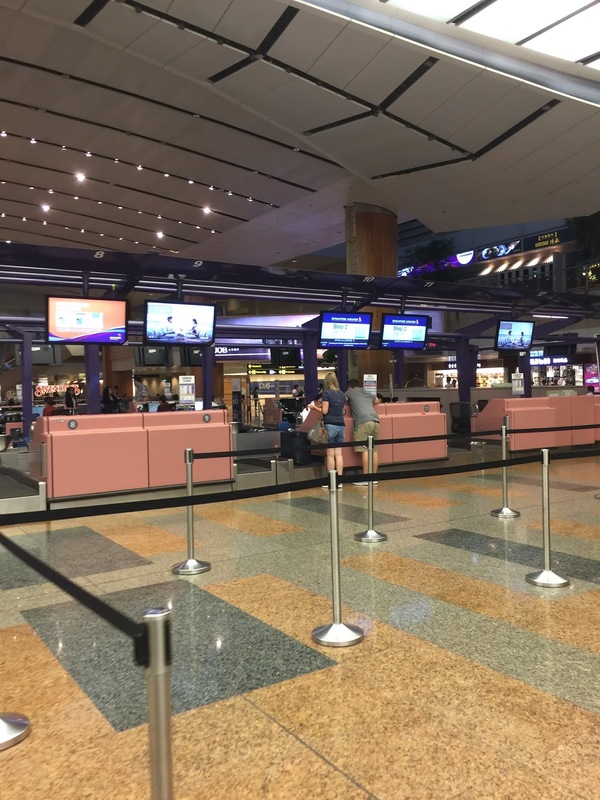 There was no queue at the check-in counter probably due to SQ encouraging their passengers to use the self check-in counters, as there are ground staff deployed at the check-in rows to direct passengers to the self check-in machines. 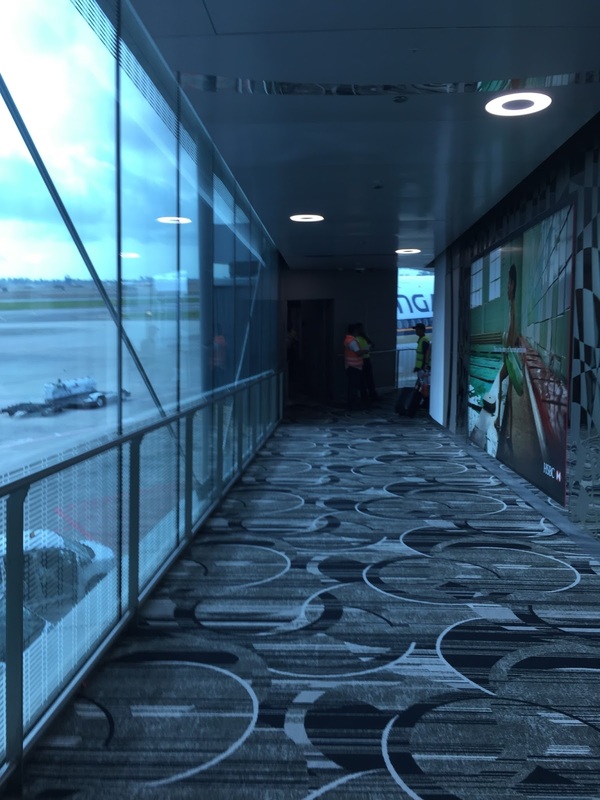 We were greeted by a friendly ground staff who processed our check-in with haste and reminded us the boarding gate and the time to be at the gate. 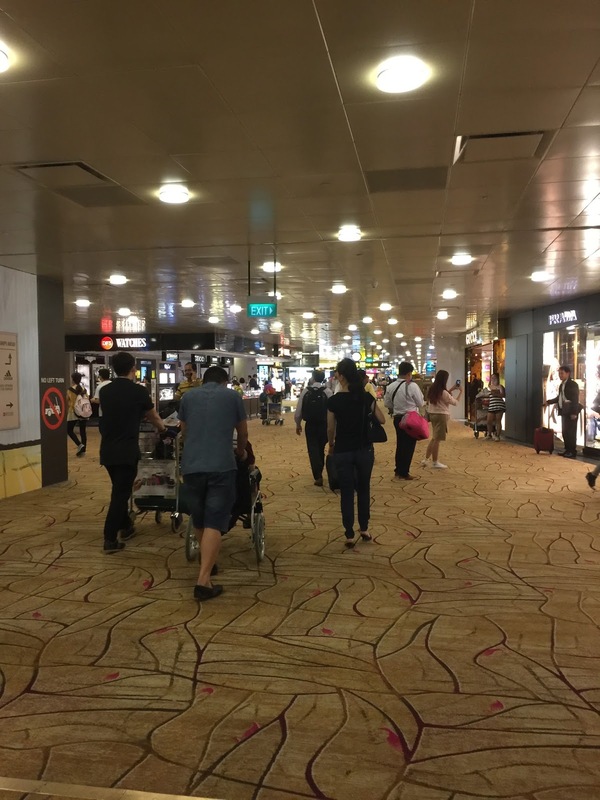 Singapore Changi Airport is a shopping haven with lots of activities for passengers to spend their timing waiting for their flight. 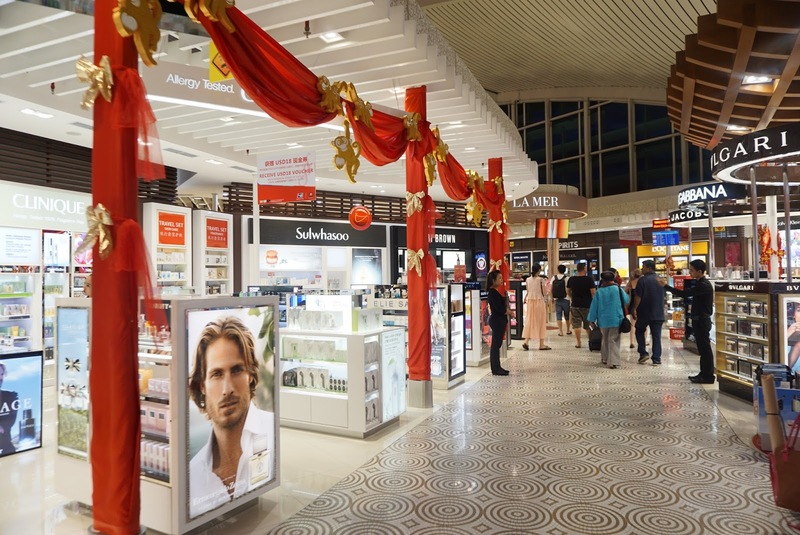 Other than numerous luxury brand boutiques, duty free cosmetics and liquors, there are activities such as gardens, movie theatres, snooze areas for passengers to kill their time. 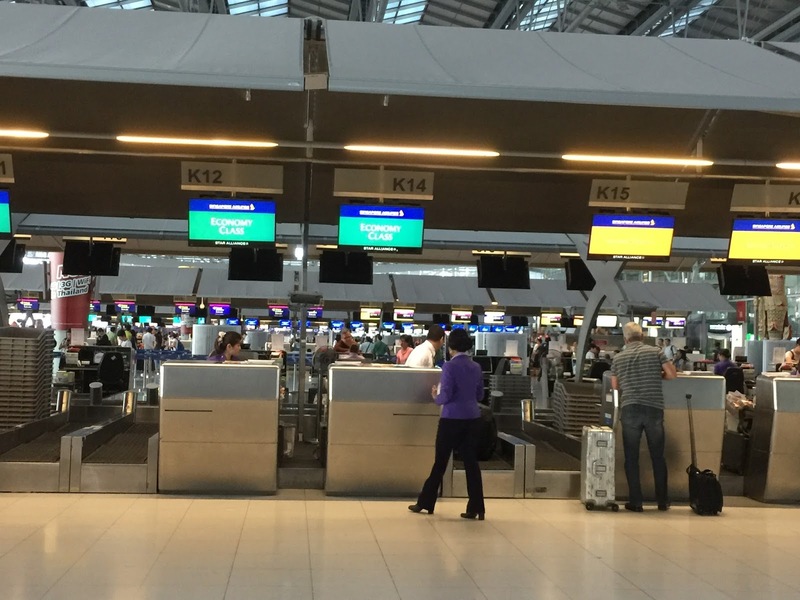 Check-in rows for Singapore Airlines are located in Row K in the centre of Bangkok Suvarnabhumi Airport. 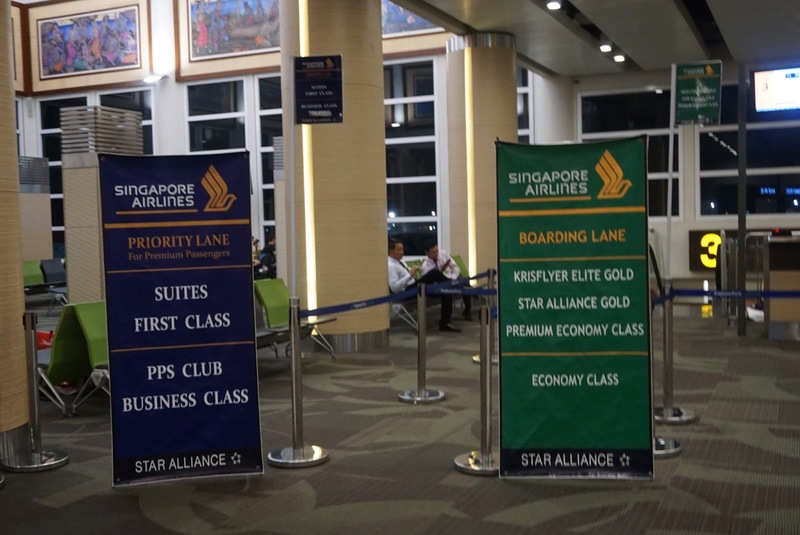 3 queues are set up for passengers flying with Singapore Airlines in the airport, one each catering for Business Class passengers, Economy Class passengers and passengers who has completed online check-in. 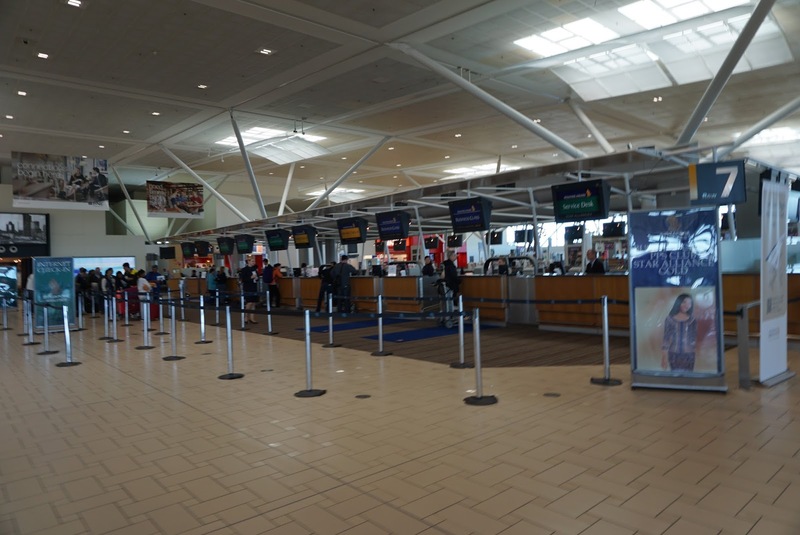 As we were early for our flight, all three queues were relatively short. 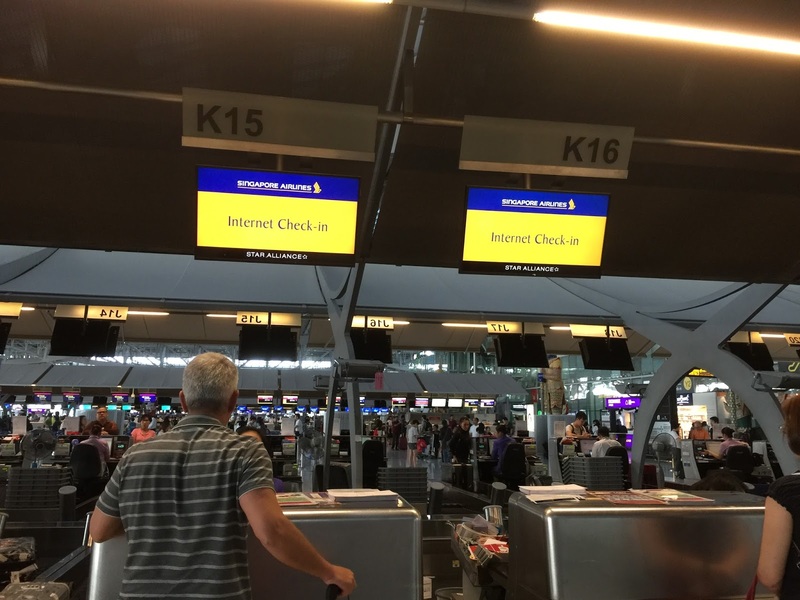 I have the habit of completing online check-in whenever I fly as the queue is usually much shorter then the other queues. There were no one waiting in line at the time we were at the airport. 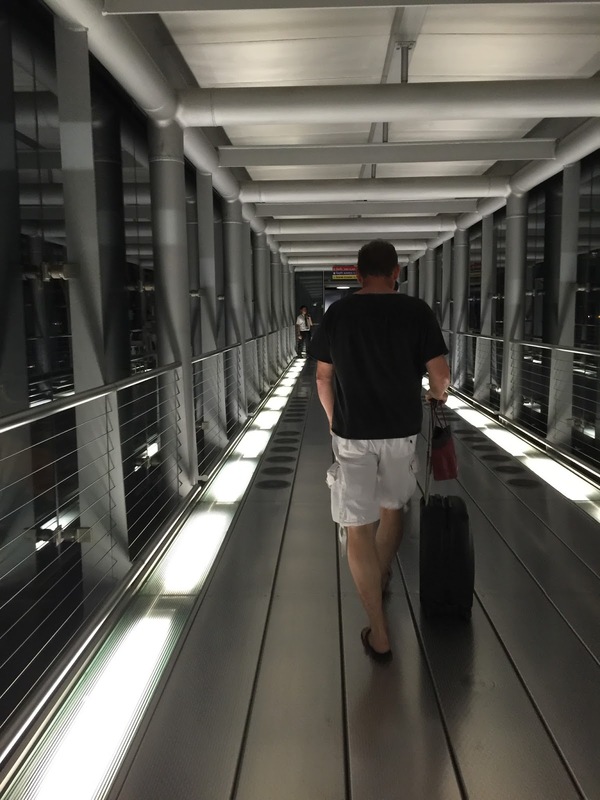 We were served promptly by the ground staff, who processed our check-in and took our luggage swiftly. The friendly ground staff briefed us on the gate for our flight as well as the time of boarding. 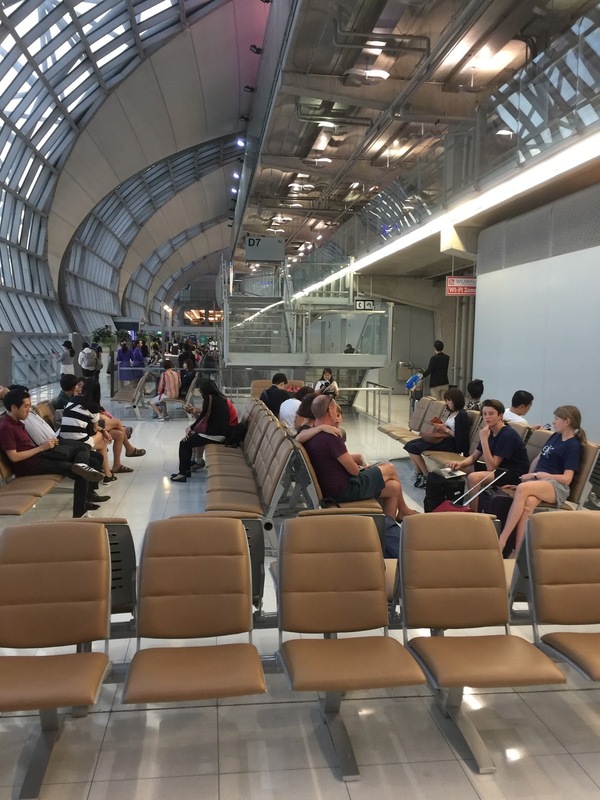 Bangkok Suvarnabhumi Airport is always bustling with life, there are huge crowds in the airport. We spent a considerable amount of time clearing immigration. 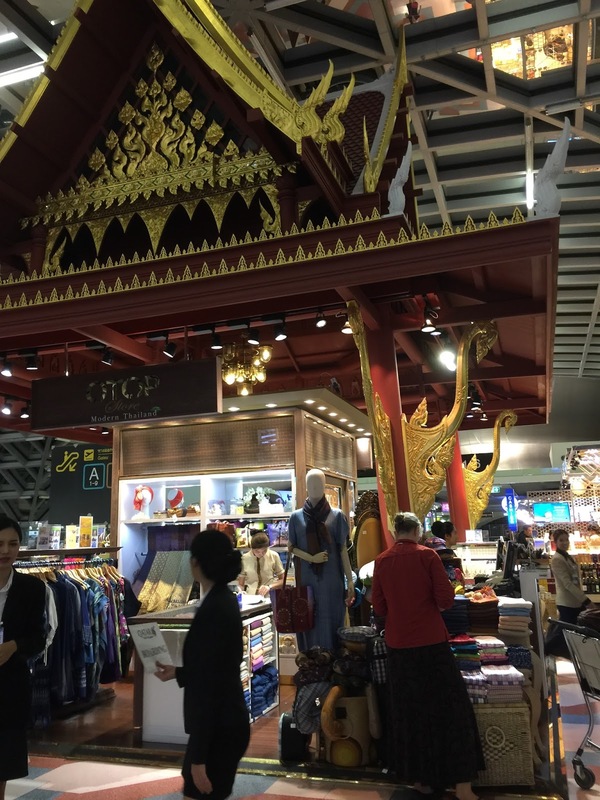 There are no lack of shopping in this airport, particularly souvenirs, however the souvenirs are much pricier than that found in downtown Bangkok. 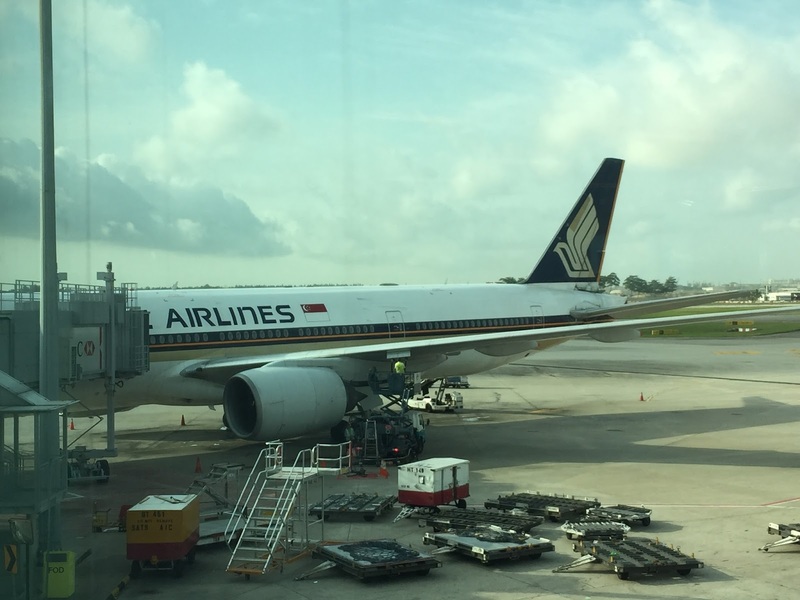 Singapore Airlines uses B777-200 for this leg of the flight. 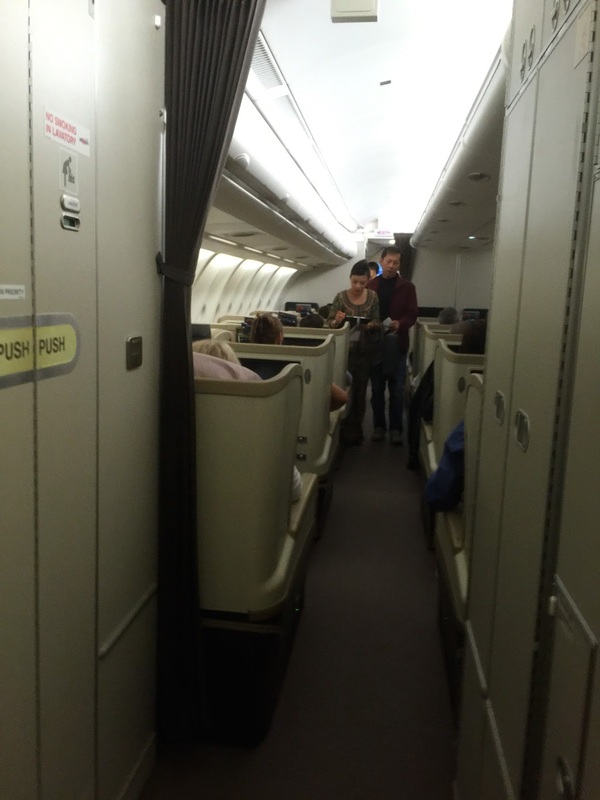 The Economy Class cabin look aged as I entered the aircraft, which signals the airlines would either replace the aircraft or refurbish it. 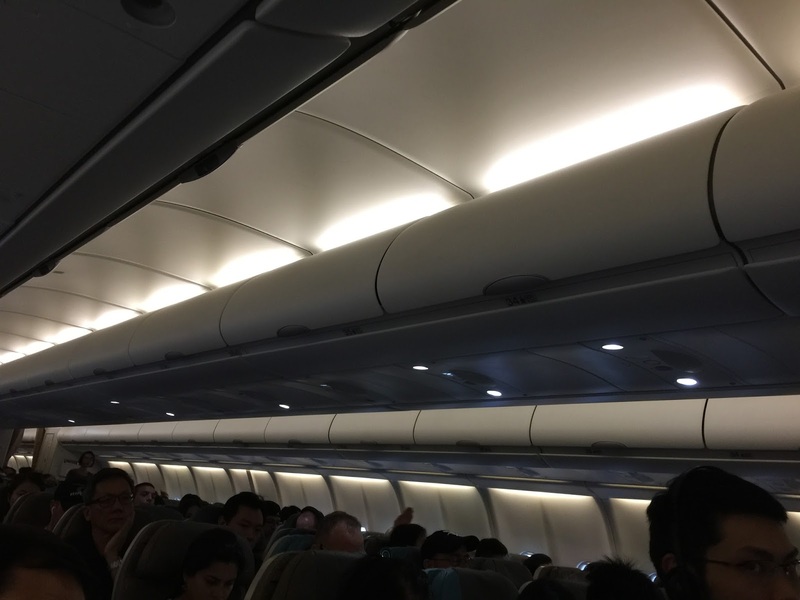 Despite the aged look, the cabin is still bright, thanks to the white lighting used in this aircraft. 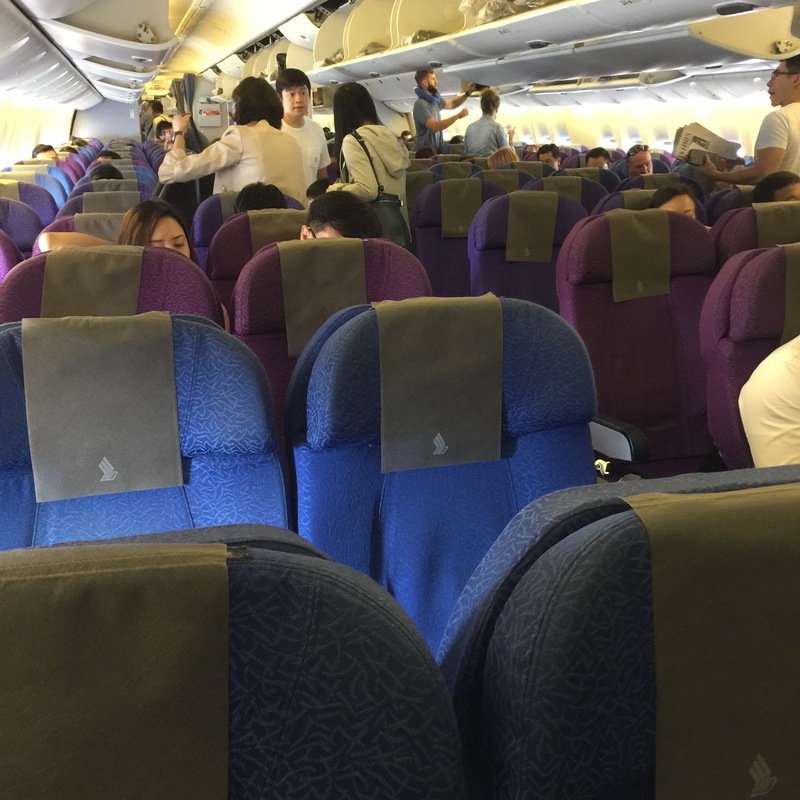 The seats are arranged in a 3-3-3 configuration, draped in hues of blue and purple. 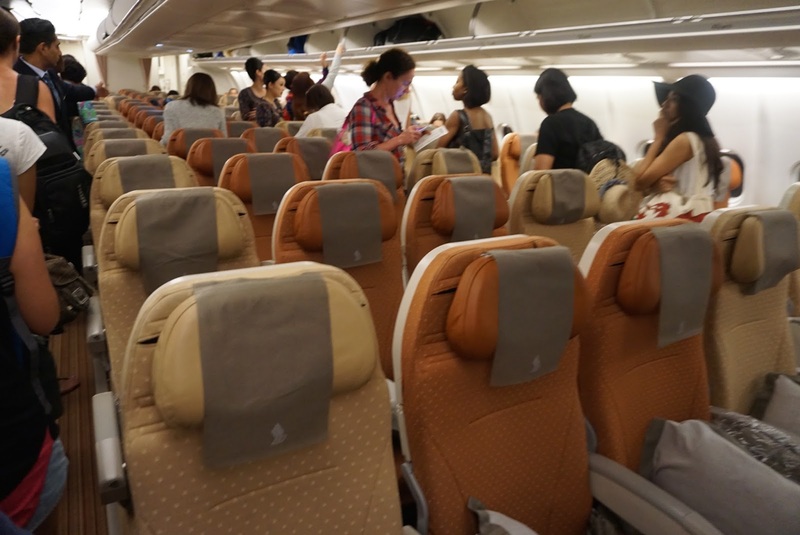 Comparing to the newer aircrafts, the seats onboard Singapore Airlines B777-200 looks more comfortable with thicker cushioning. 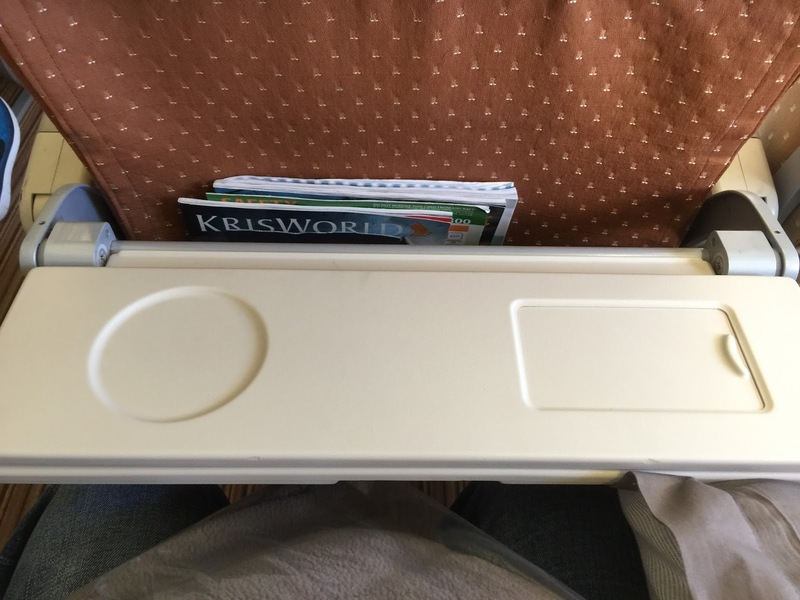 A stark difference from my previous experience with Singapore Airlines (some 7 months back), no pillows or blankets were placed on the seats. 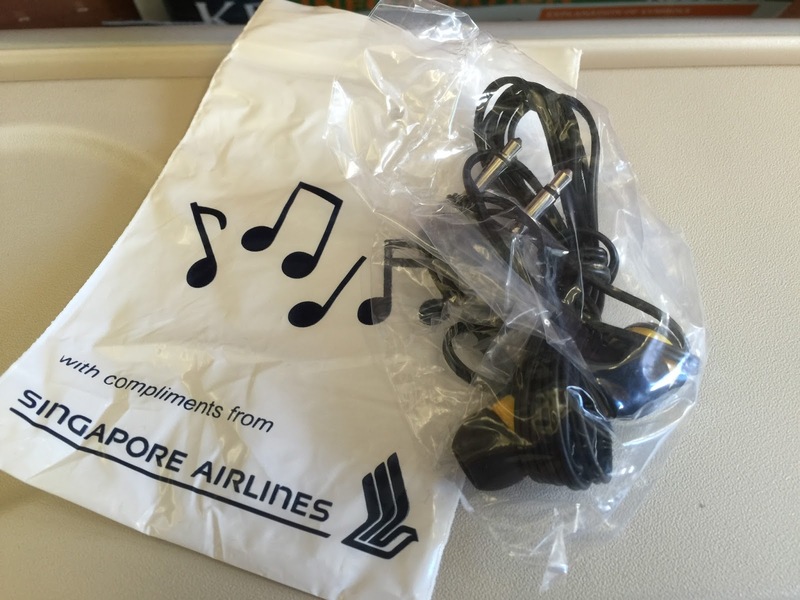 It seem that Singapore Airlines is cutting back budget. Pillows and blankets are available upon request. 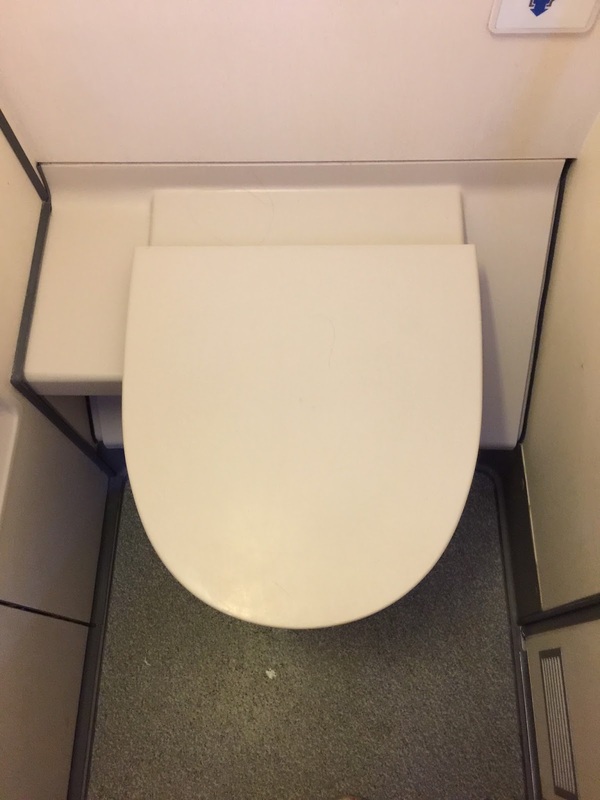 The lavatory is of a decent size, almost the same as its newer counterparts. 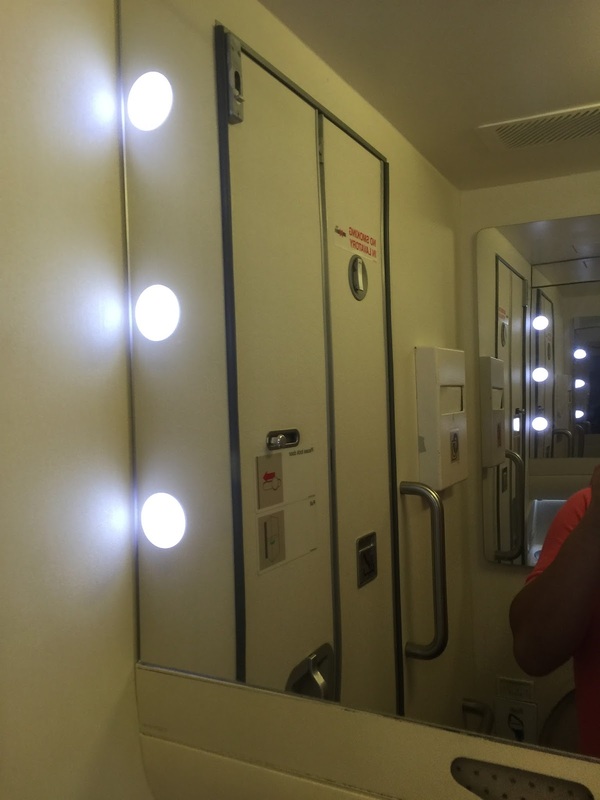 The use of mirrors in the lavatory made it look bigger than it actually is. Despite the aged look, the lavatory is very well maintained. 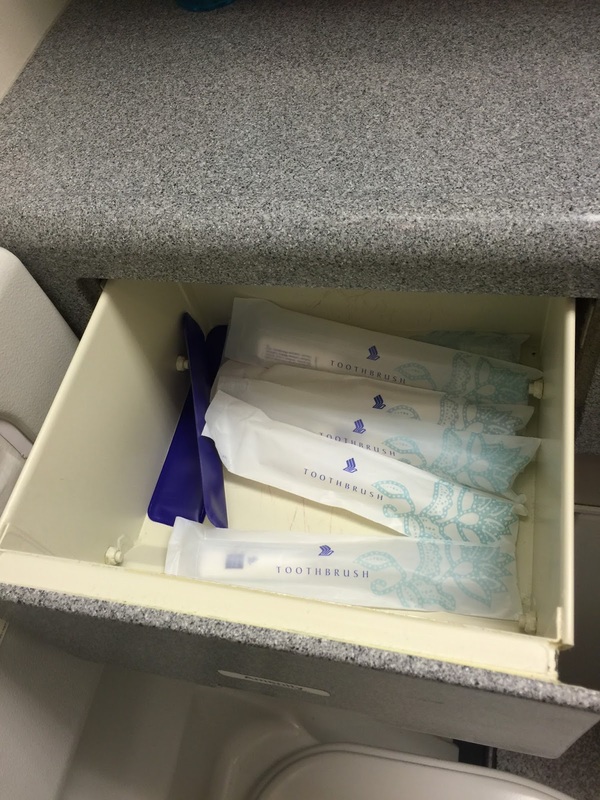 Singapore Airlines places additional amenities such as toothbrush, comb in their lavatory which is getting rare for Economy Class onboard other airlines. 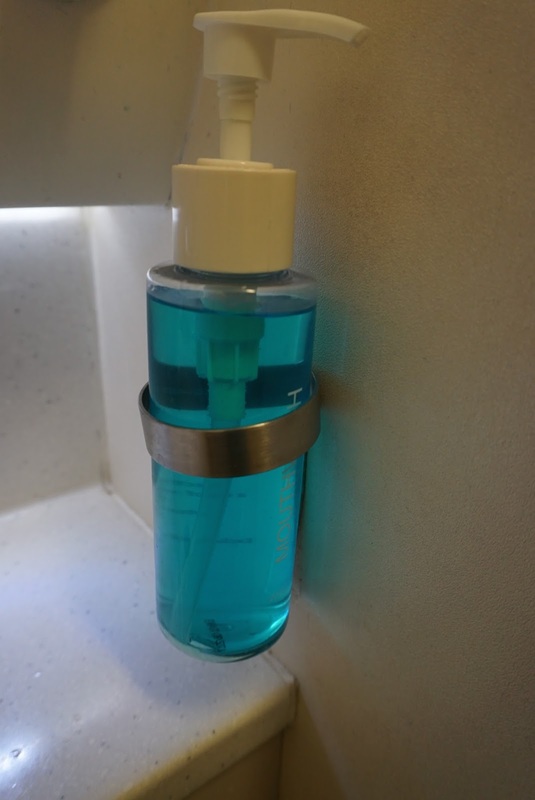 On top of these amenities, the standard amenities such as mouth wash, hand moisturiser and hand soap are also available. 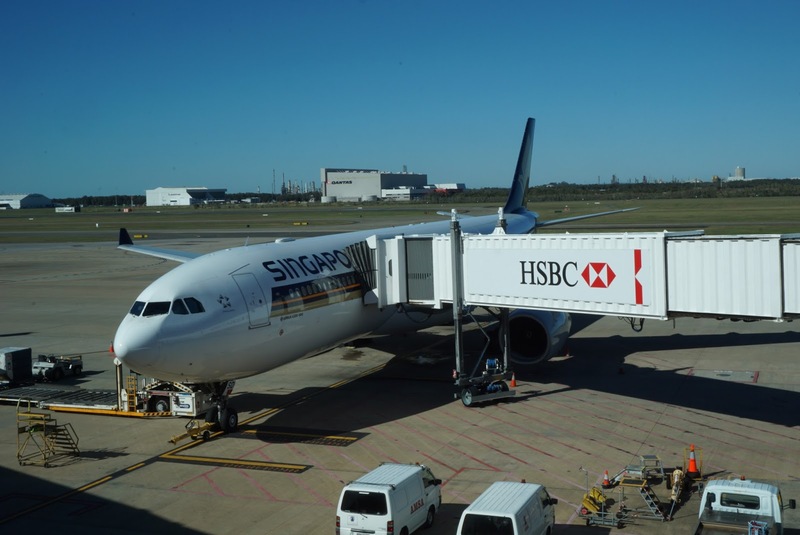 For this sector of the flight, Singapore Airline uses the A330-300. 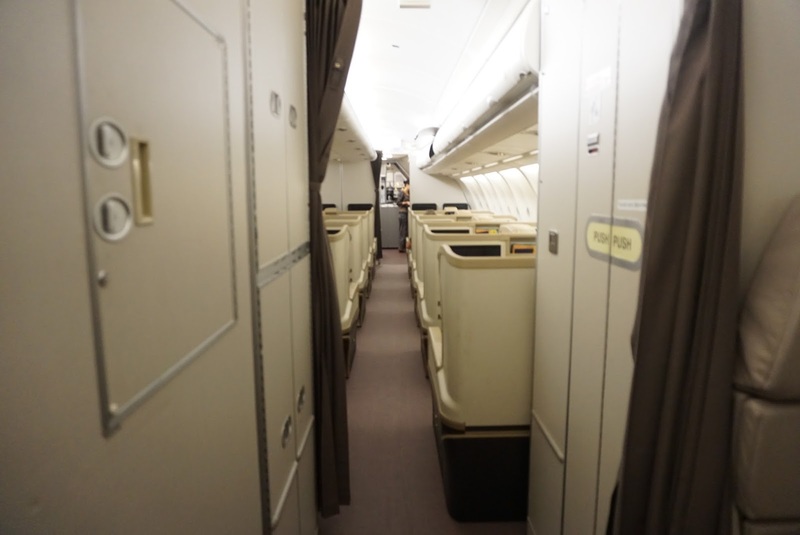 There are 2 different colour tones in the forward and aft Economy Class cabin. The forward Economy Class cabin has a lighter and more “skyish” colour scheme. Decked out in light blue and light brown, the forward cabin feels livelier in the choice of colour. 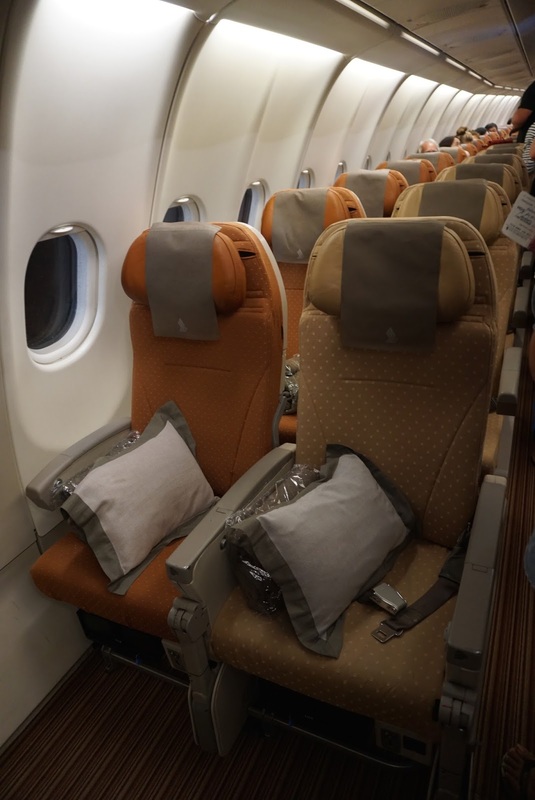 The aft Economy Class cabin is decked in hues of brown, giving it a more earthy feel. 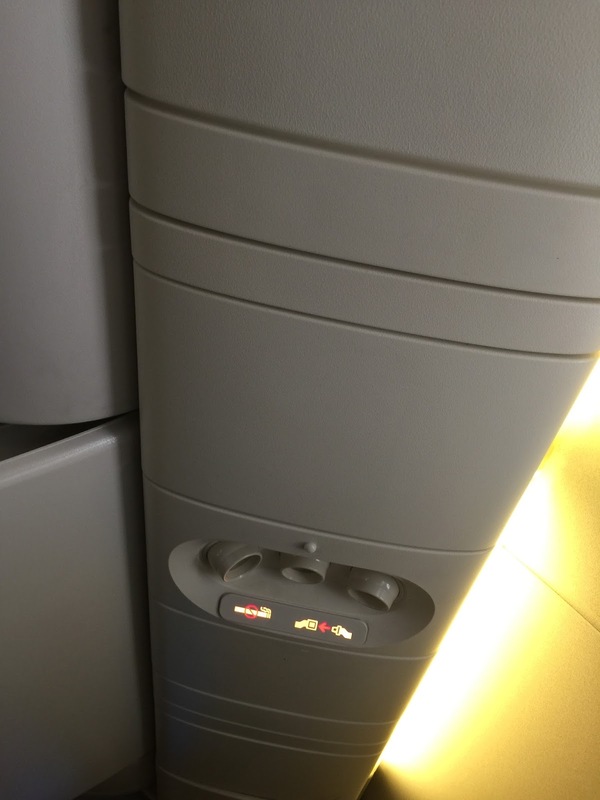 Coupled with the use of mood lighting in the cabin, the Economy Class section feels very comfortable. 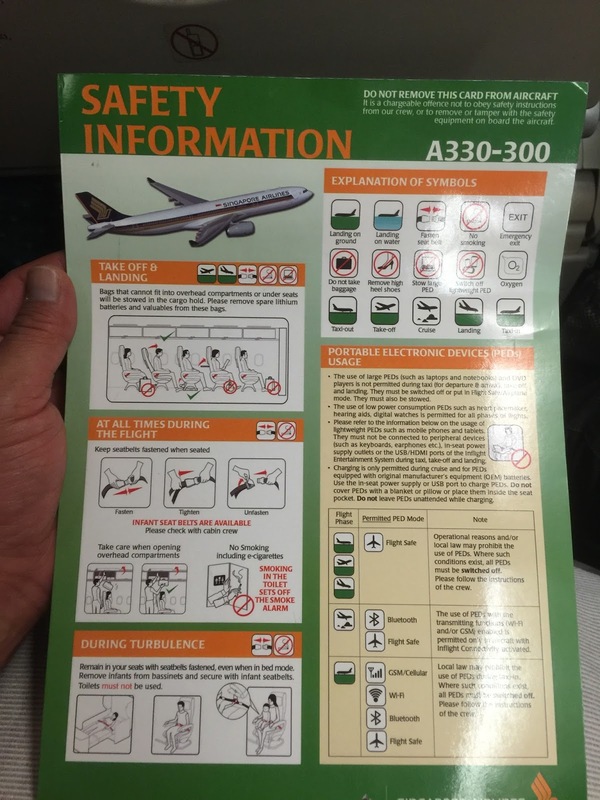 Seats are arranged in 2-4-2 configuration in Singapore Airlines A330-300. 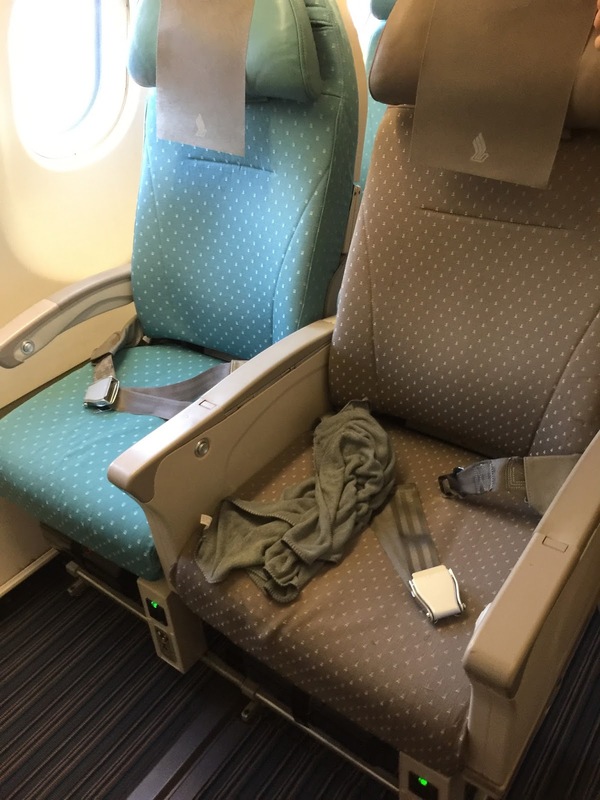 As with the previous flight, no pillows and blankets are placed on the seat. However they are available only upon request from the flight attendants. 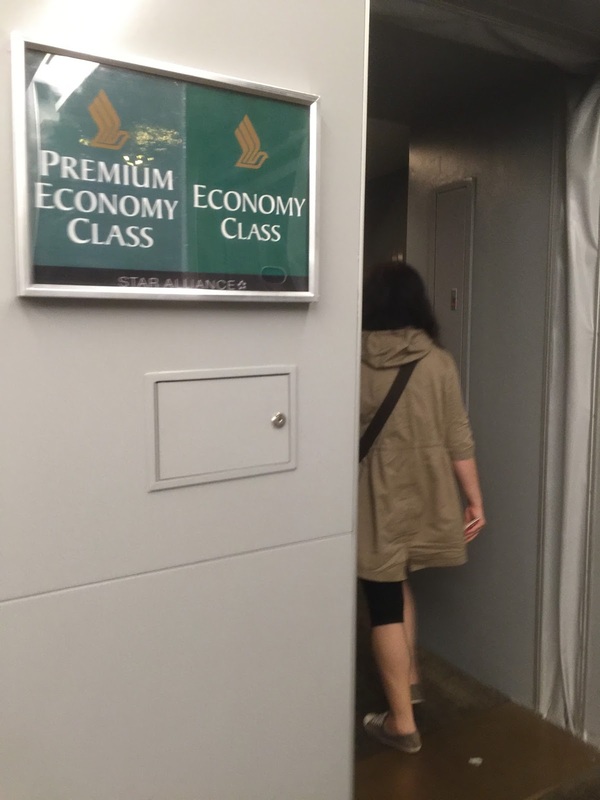 Similar with the previous sector, the lavatory is of a decent size and was very well lighted. 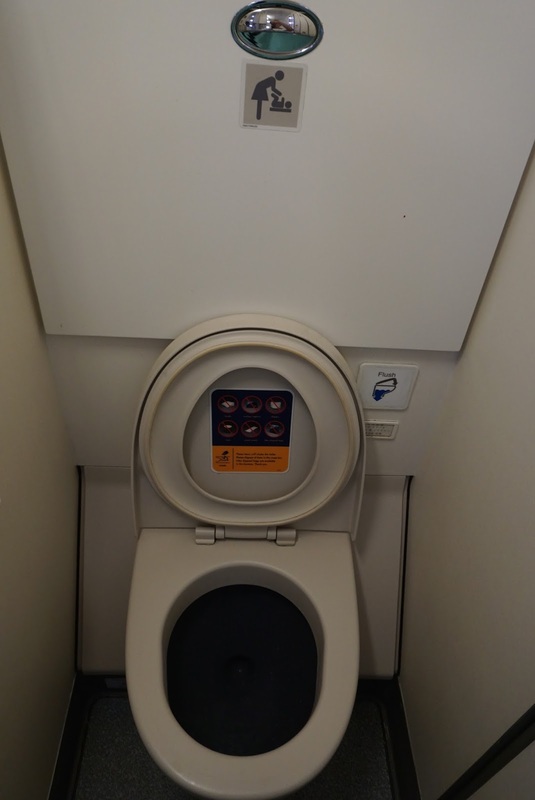 Unlike the lavatory in the B777-200 which uses mainly white lighting, the A330-300 lavatory uses yellowish lighting, which makes it feel comfortable. 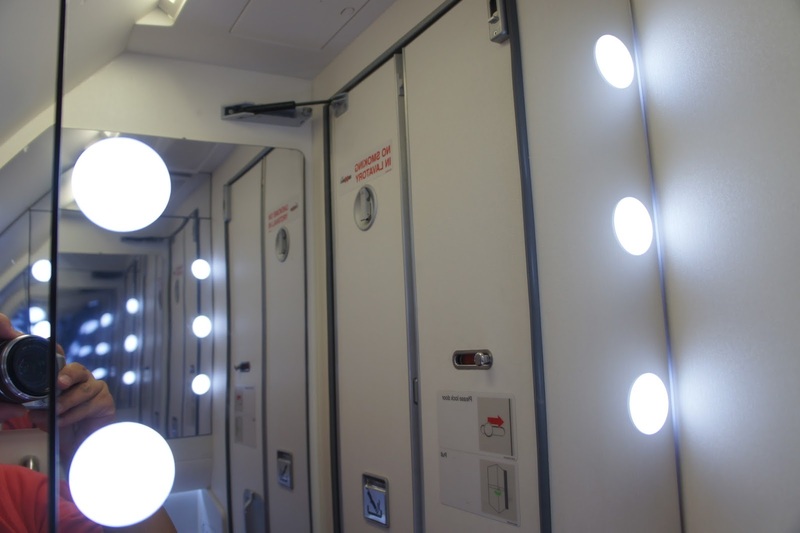 There are Hollywood style lighting in the mirrors of the lavatory onboard this aircraft. 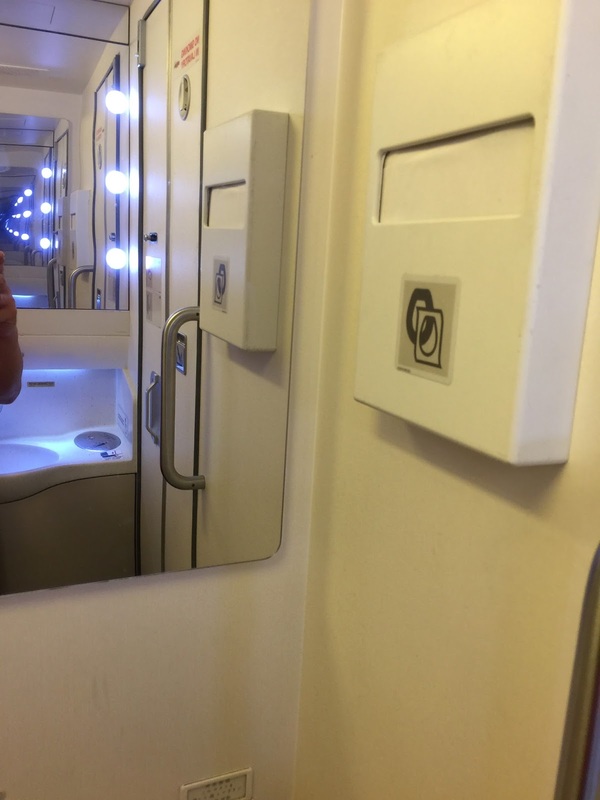 Again the clever use mirrors makes the lavatory feel bigger than it is. 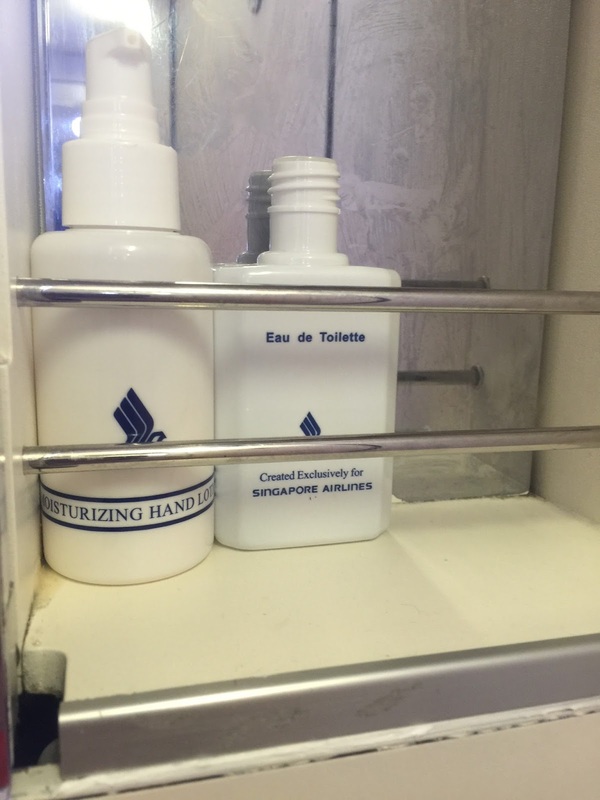 The standard amenities such as hand soap, mouth wash and hand moisturiser are found in the lavatory. 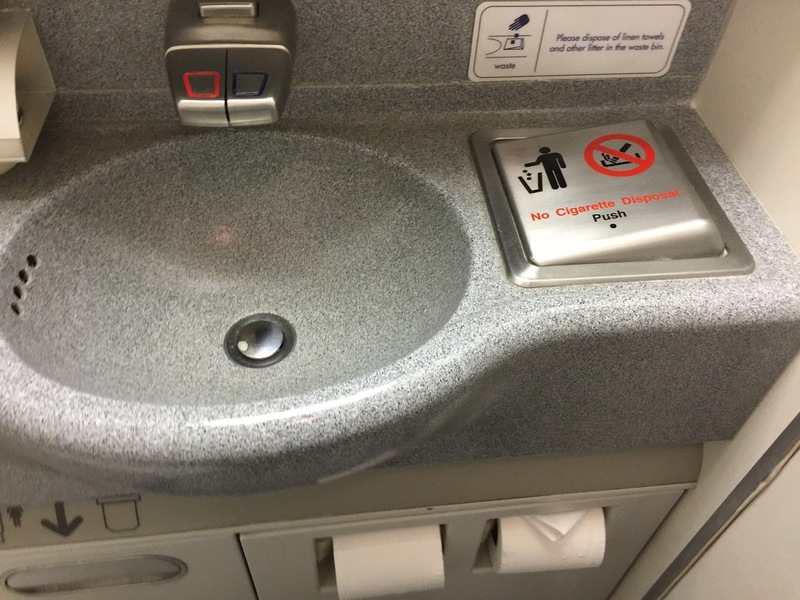 On top of these, additional amenities such as toothbrush and combs are also found in the lavatory. 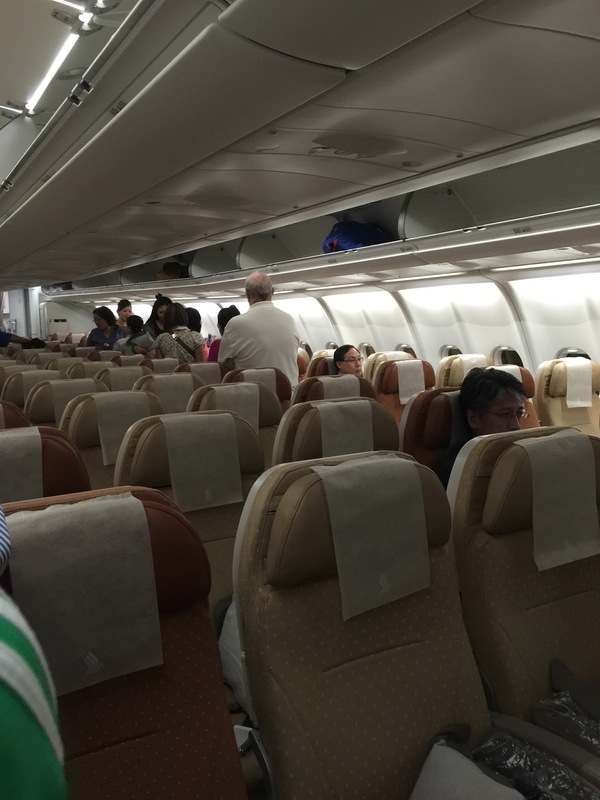 Despite its aged look, the seats onboard Singapore Airlines B777-200 are comfortable and well maintained. Thanks to the thicker cushioning for the seats, it feels as though the seats hugs around my body. 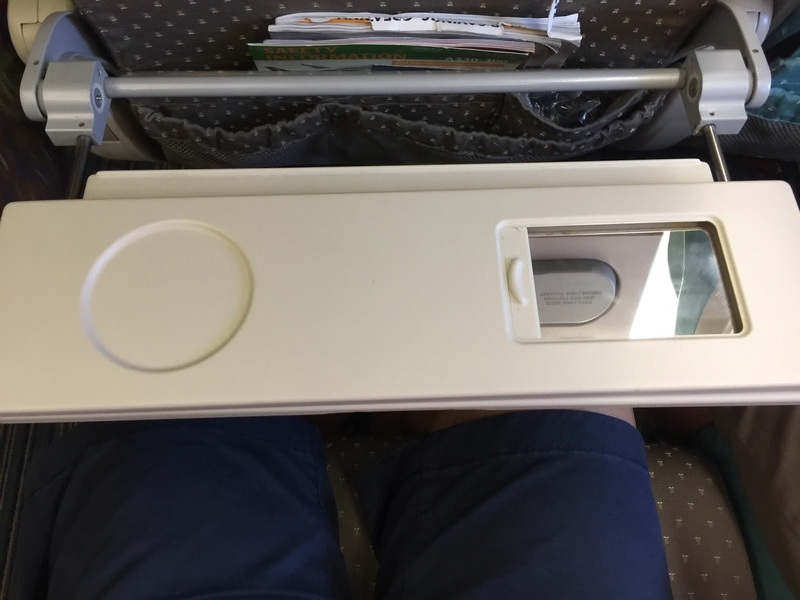 Seats in Economy Class cabin are 32″ in pitch and 17.5″ wide. The legroom is good on the Economy Class cabin. 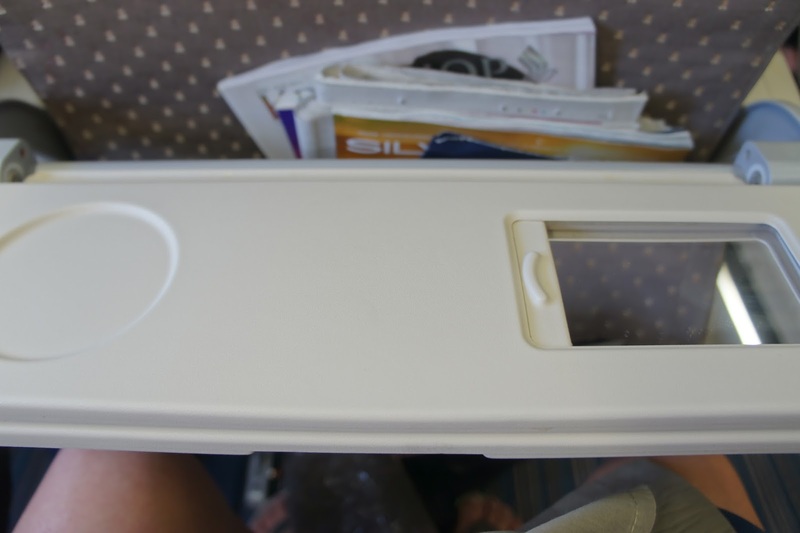 Tray tables are the standard single piece, which is different from the bi-fold design in their A330-300. 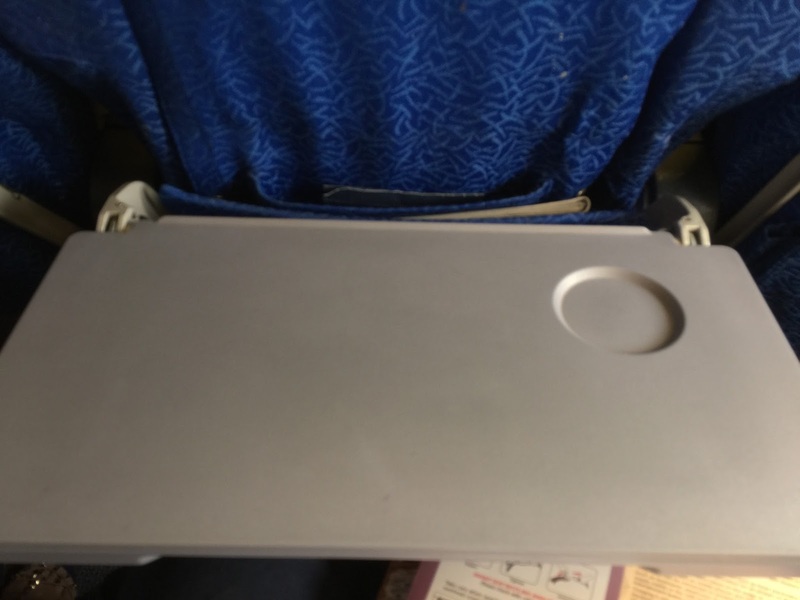 The placement of a small cup holder on the back of the tray table is a good design which allows passengers to stow their drinks when the tray table is folded up. 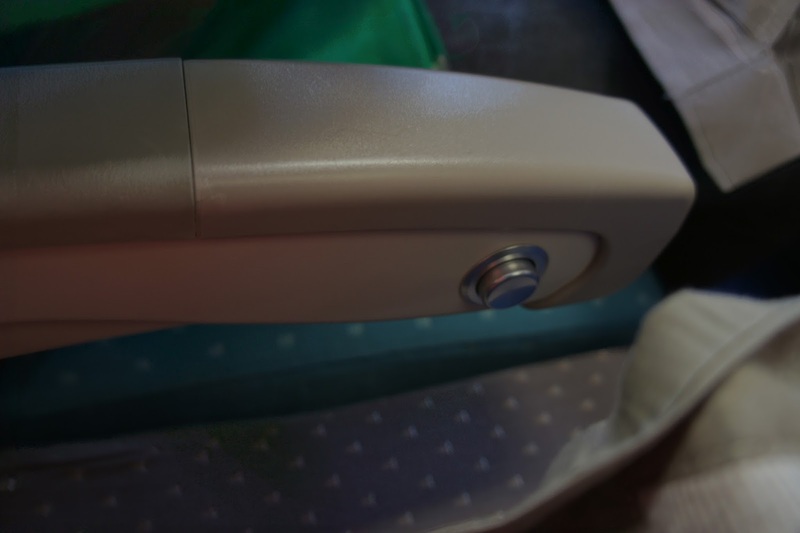 Seat recline button is found on one of the armrests, while the IFE controller is stored on the other armrest on each seat. 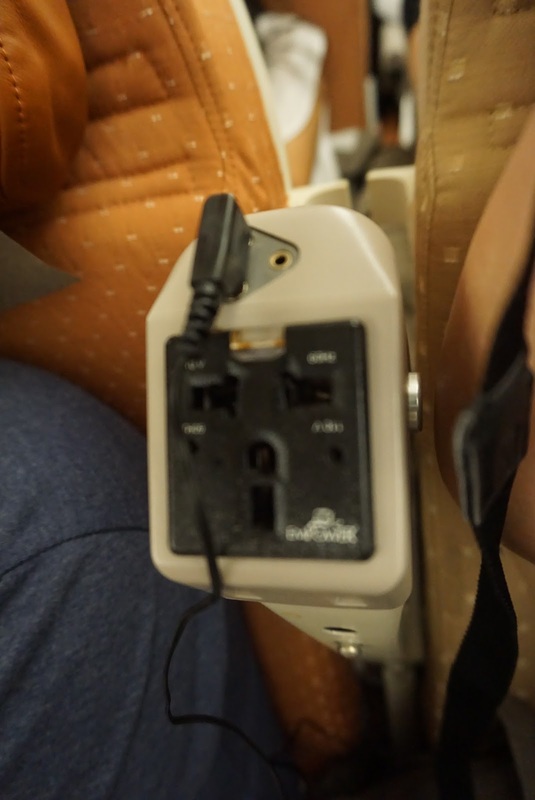 Unlike its more modern counterparts, there are no USB or power sockets onboard Singapore Airlines B777-200 aircrafts. 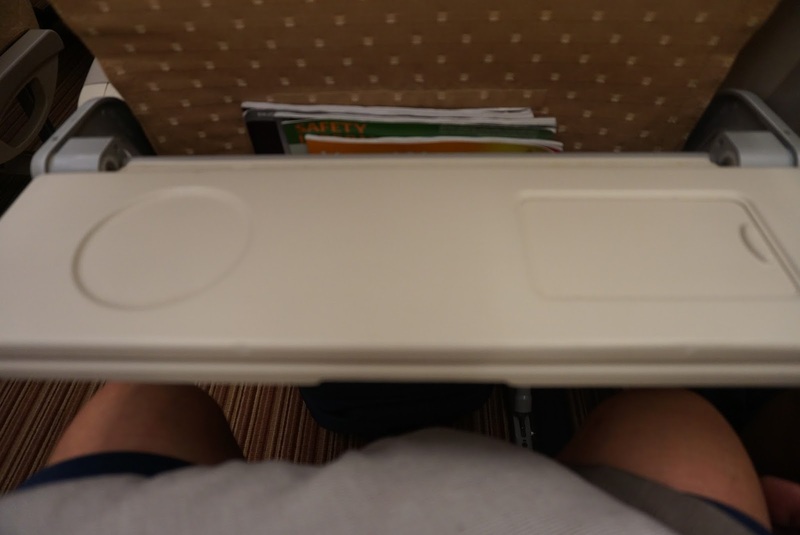 The seats onboard Singapore Airlines A330-300 are very comfortable despite appearing to be thinner in the cushioning compared to their B777-200 counterpart. 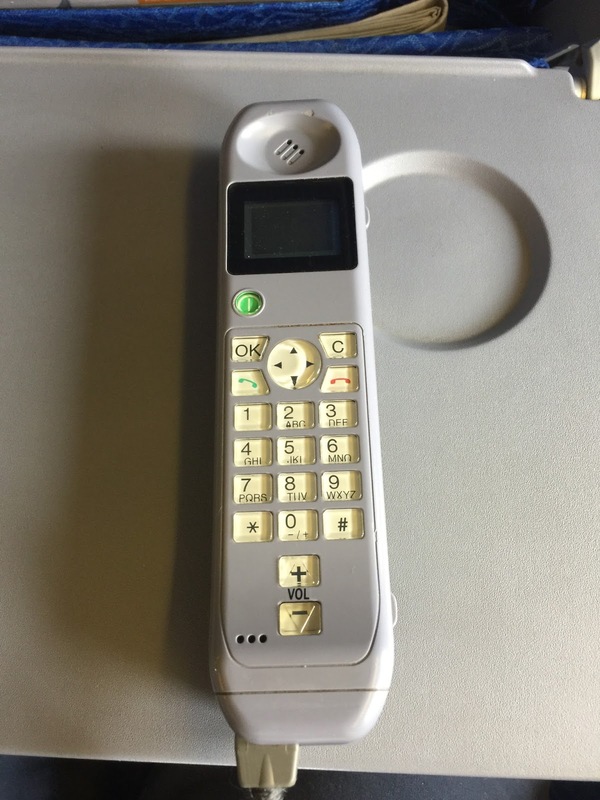 It has a pitch of 32″ and width of 19″. Legroom seem slightly better than the B777-200 in the Economy Class section. 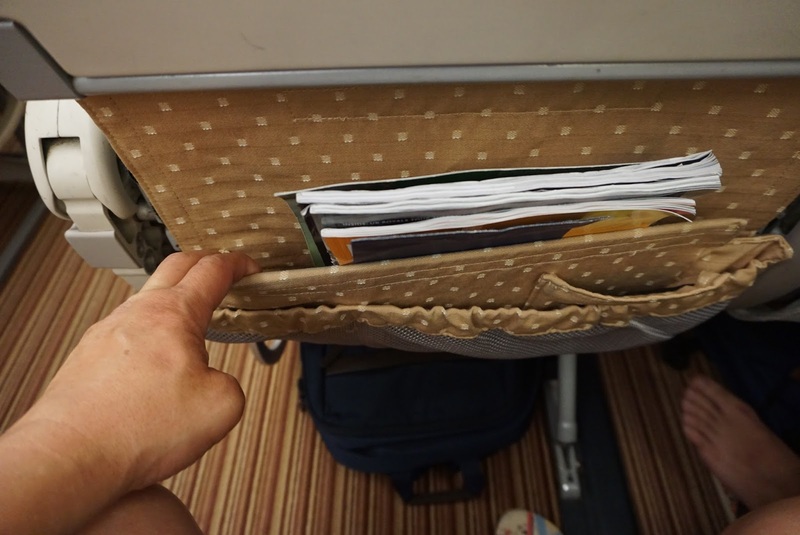 The multiple pocket seat pockets is a welcomed addition in the Economy Class section as it allowed me to store various small items that I carried onboard. 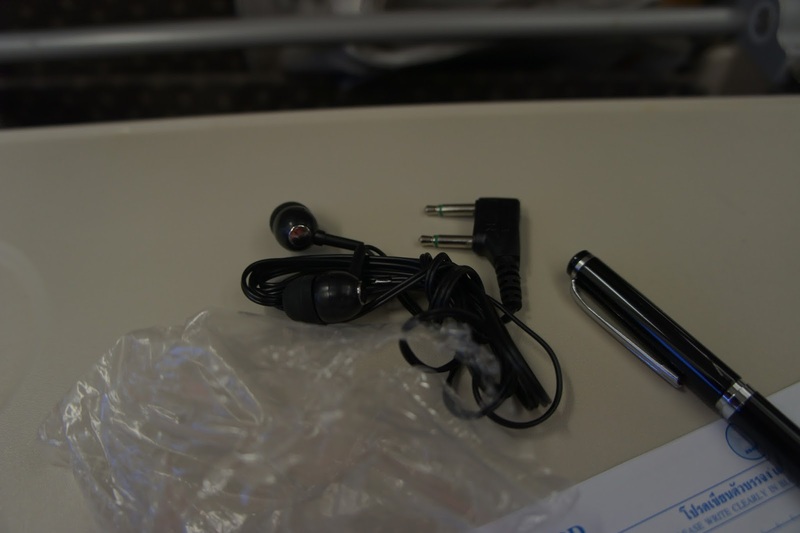 A coat hanger can be found in every seat as well as the audio input and USB connector, which allows passengers to charge their mobile devices inflight. 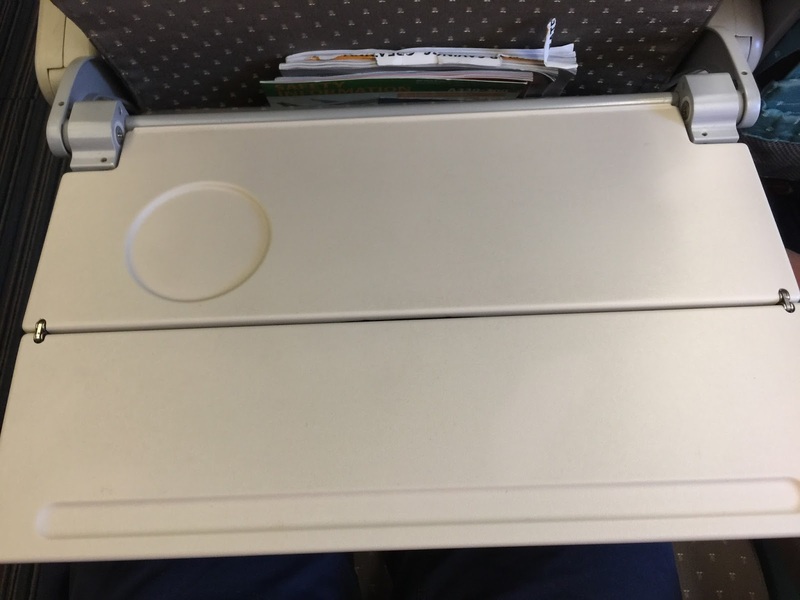 Tray tables are bi-fold, allowing passengers to use the tray table and still allow passenger sitting in the window seat to gain access to the aisle without having to put away the tray table. 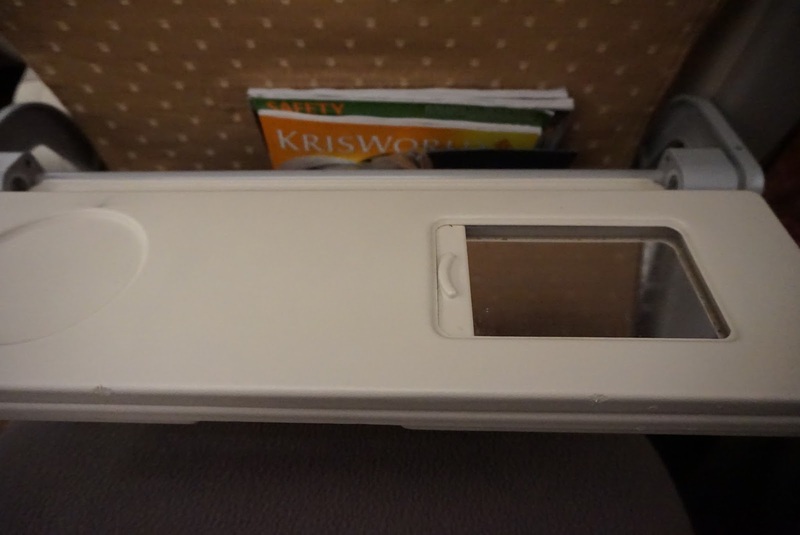 A small mirror on the back of the tray table is a nice touch to the design of Singapore Airlines Economy Class onboard the A330-300. 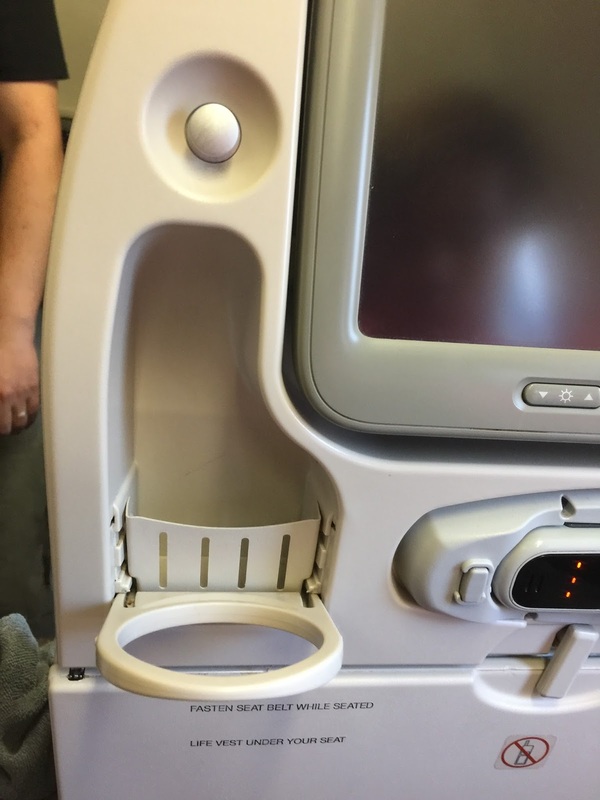 On the top left corner, next to the IFE screen is a small pocket that allows passengers to store small item, a cup holder is also found in this area, which means passengers can put away the tray table and not have to hold their drinks on their hands. 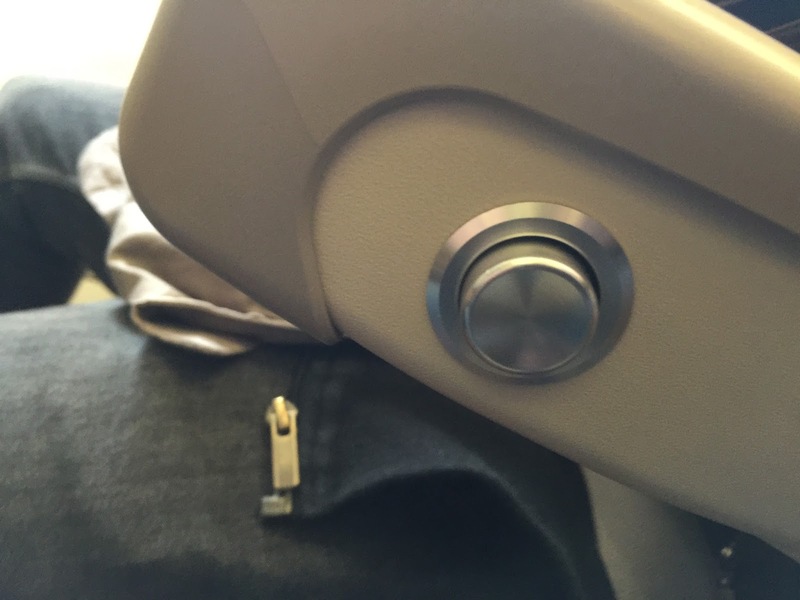 The seat recline button ad headphone jack is found on the armrest of each Economy Class seat. 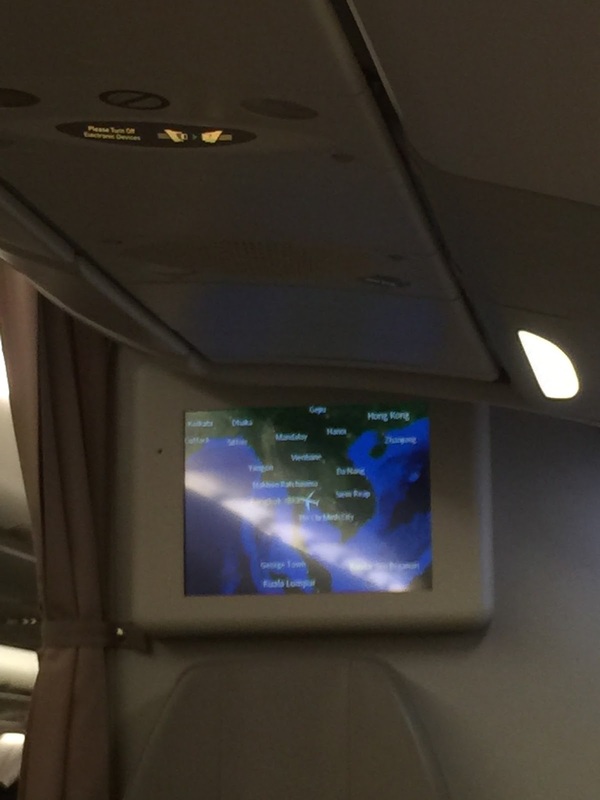 Singapore Airlines B777-200 has a smaller 6.5″ screen for their IFE compared to their A330-300 aircrafts. 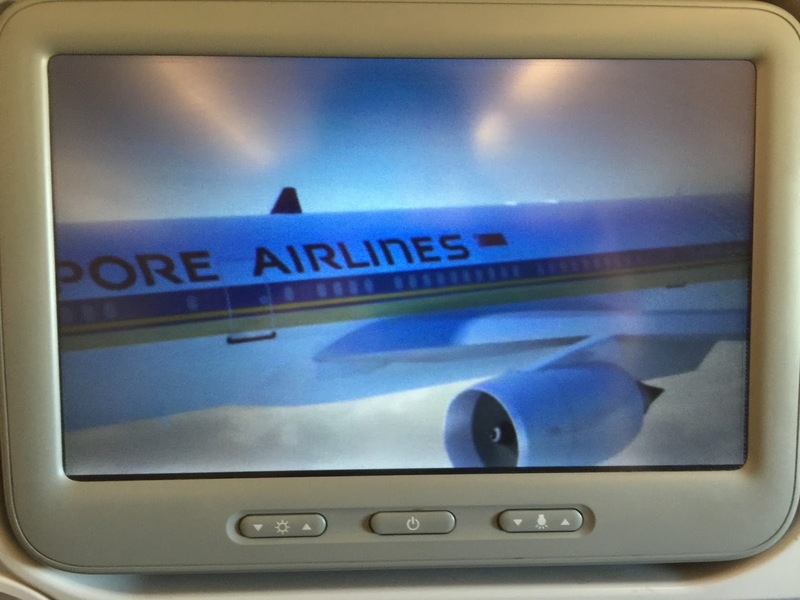 IFE onboard Singapore Airlines B777-200 features video on-demand, which allows passengers to watch the shows available as and when they like. 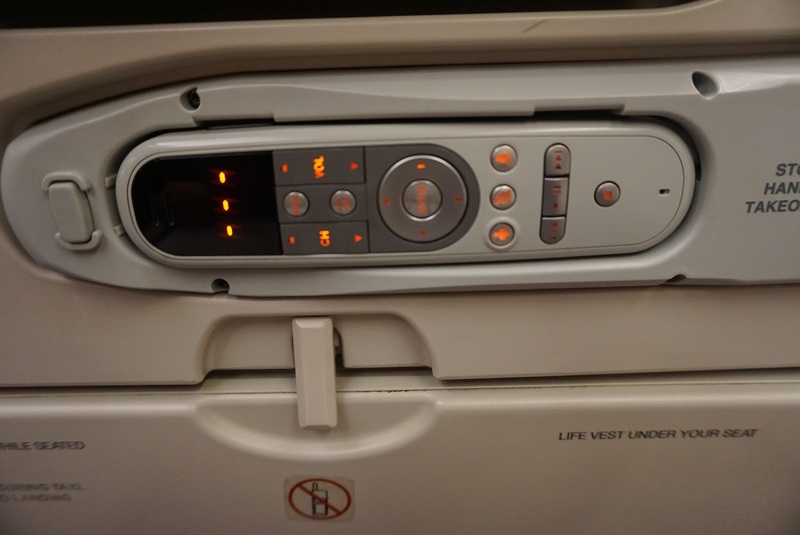 The IFE does not have touch screen function and lagged a fair bit when used with the controller stowed on the armrest. 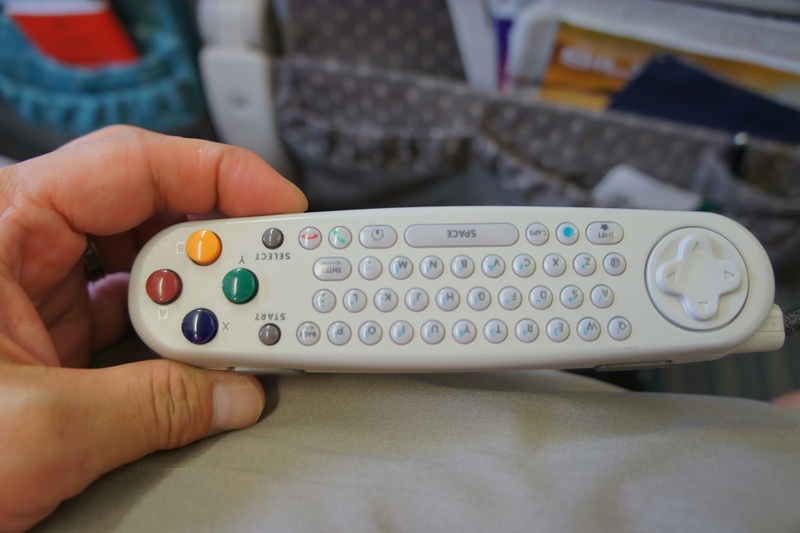 Despite the aging equipment, the IFE still packs a wide selection of movies, TV shows, games that kept me entertained throughout the flight. 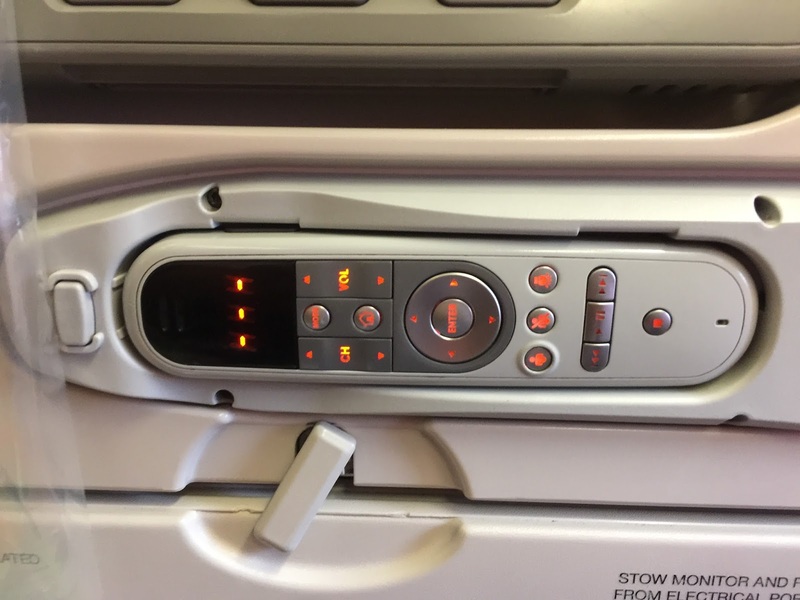 The IFE on my seat malfunctioned halfway through the flight, showing the age of the equipment. 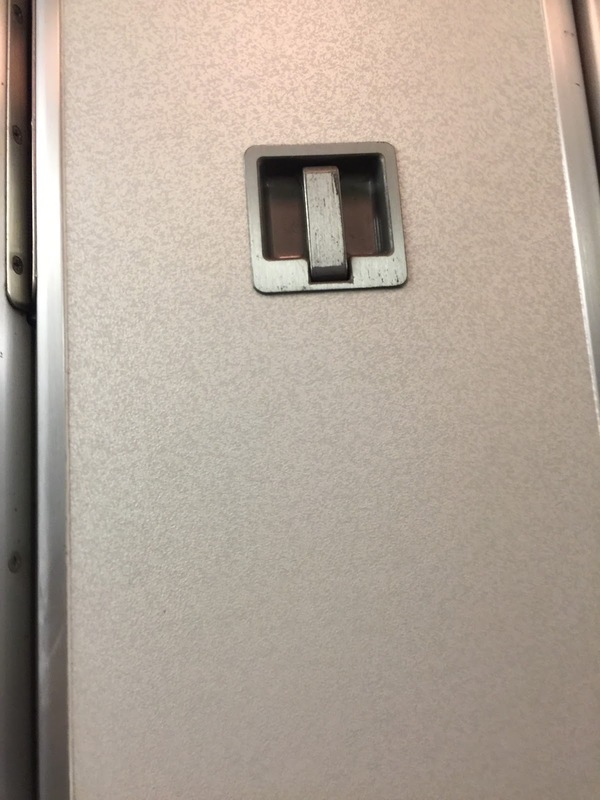 My screen resetted itself halfway through the flight and I was faced with a blank screen. 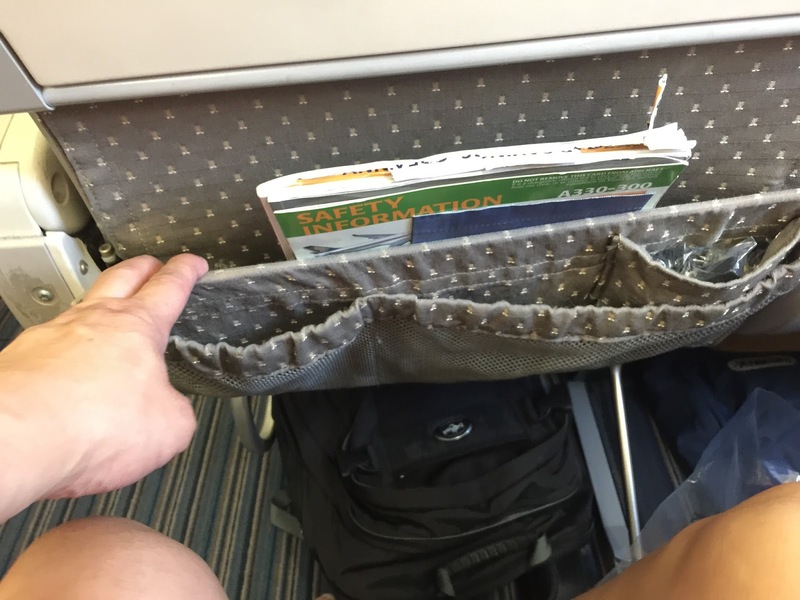 I highlighted this issue to the flight attendant and she resetted the system for my seat. 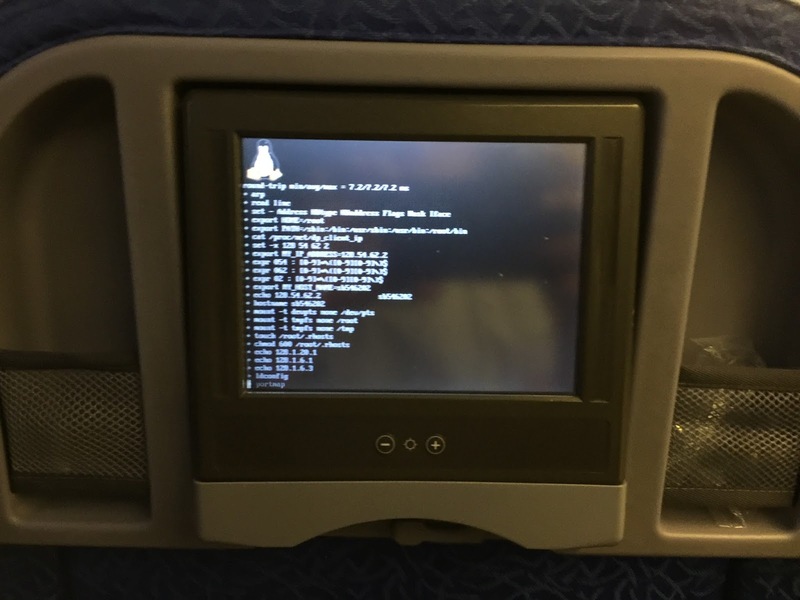 However after the reset, the IFE lost its on-demand function and I was only able to watch movies through the schedule timing. 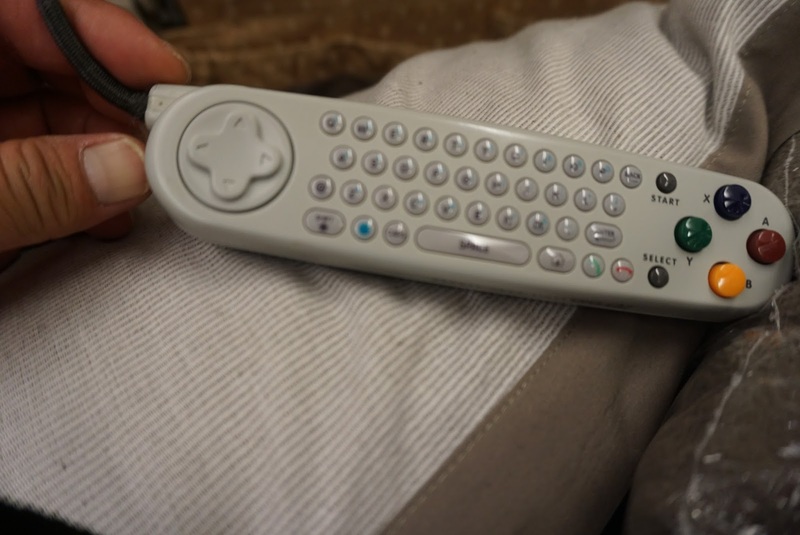 The IFE controller is aging as well, it did not respond well to the button pressing and lagged a fair bit. 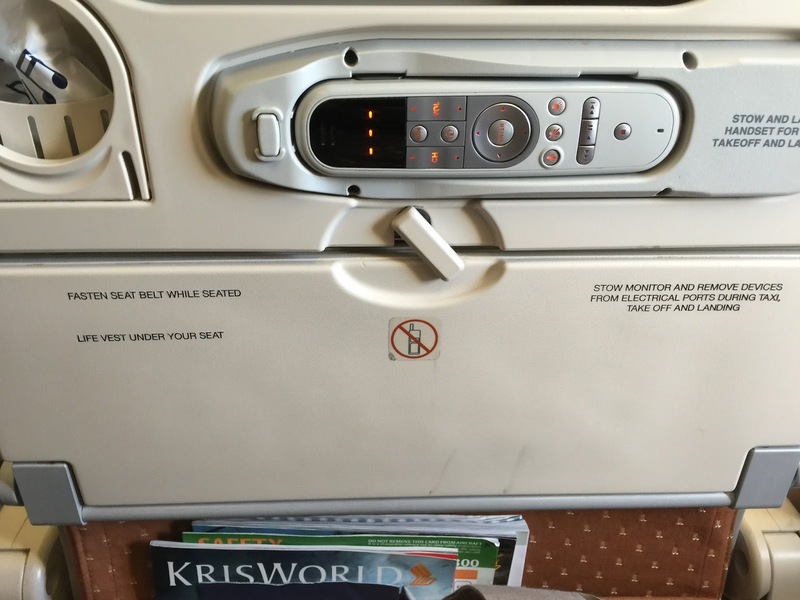 One would have to have patience when operating the IFE onboard this aircraft. 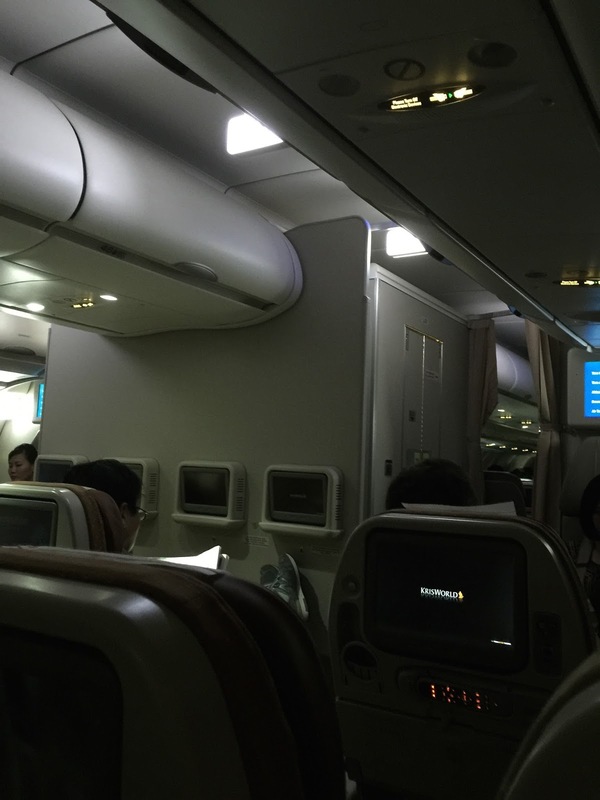 The IFE onboard Singapore Airlines A330-300 has a large 10.5″ screen compared to the B777-200 aircraft. 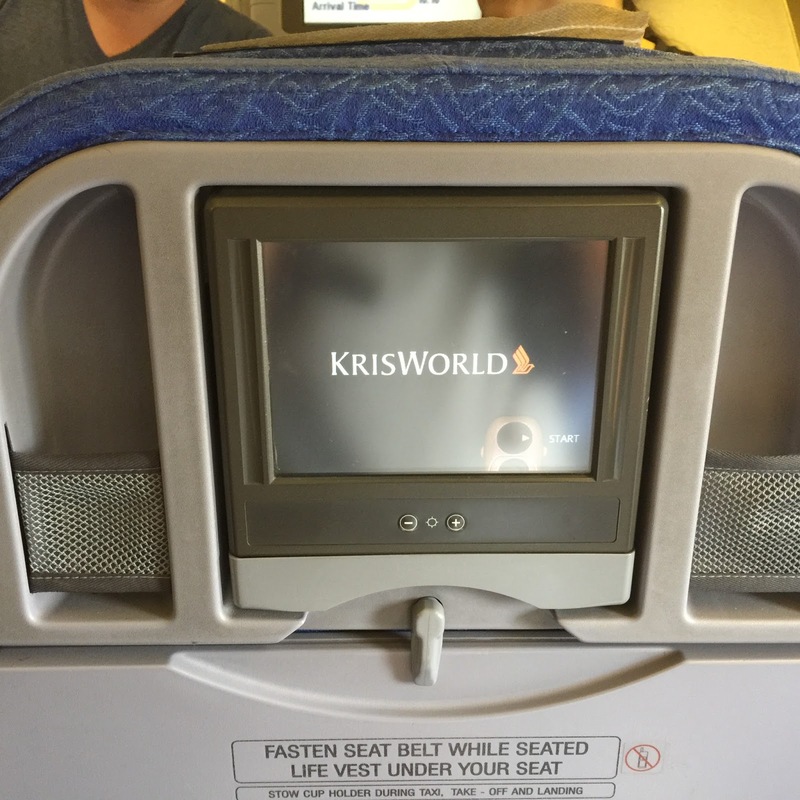 As with all aircrafts on Singapore Airlines, passengers are treated to video on-demand allowing them the flexibility to watch the shows they wanted onboard. 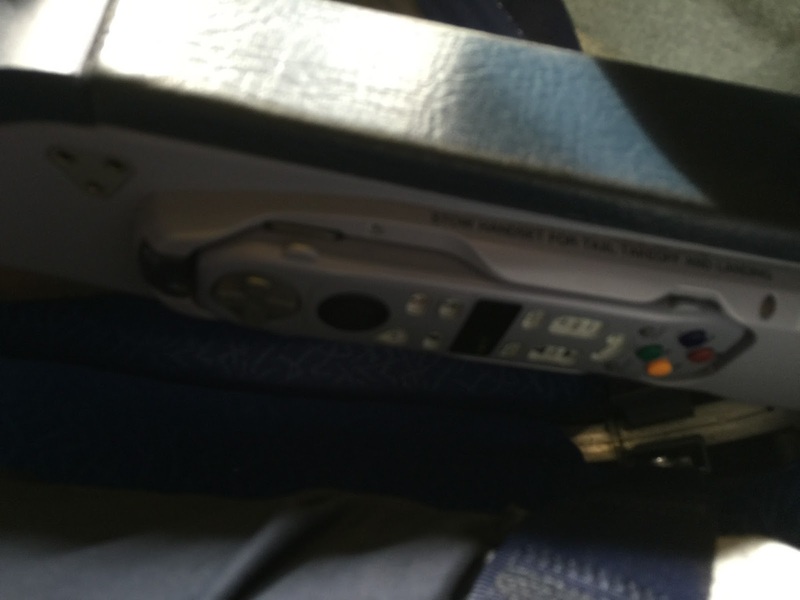 The controller for each seat is stored below the IFE screen. 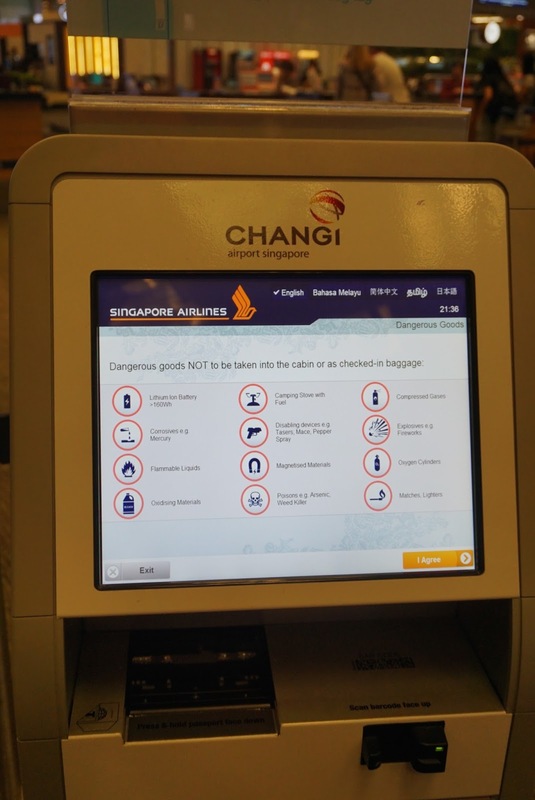 As with most of Singapore Airlines aircrafts, there are no touch screen function for the IFE, however the system is rather responsive with the controller. 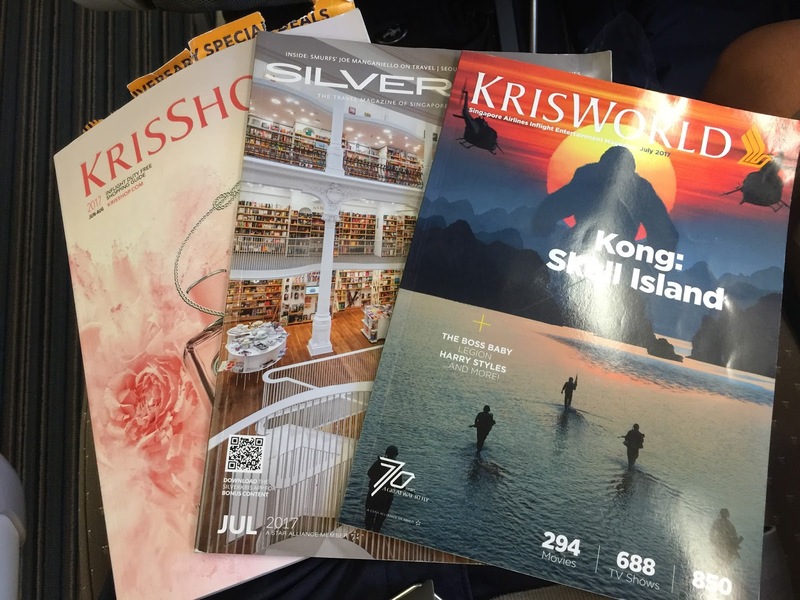 Singapore Airlines has a good library of entertainment options, ranging from the latest Hollywood blockbusters to TV shows, that is sure to keep its passengers entertained throughout the flight. 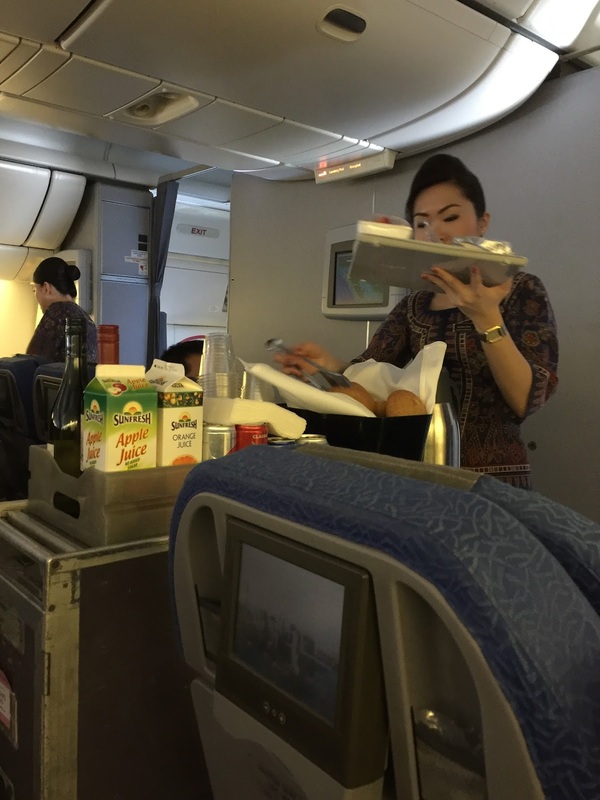 As the SIN-BKK leg lasts around 2 hours, flight attendants sprung into action preparing the meals soon after the seat belt sign is turned off. 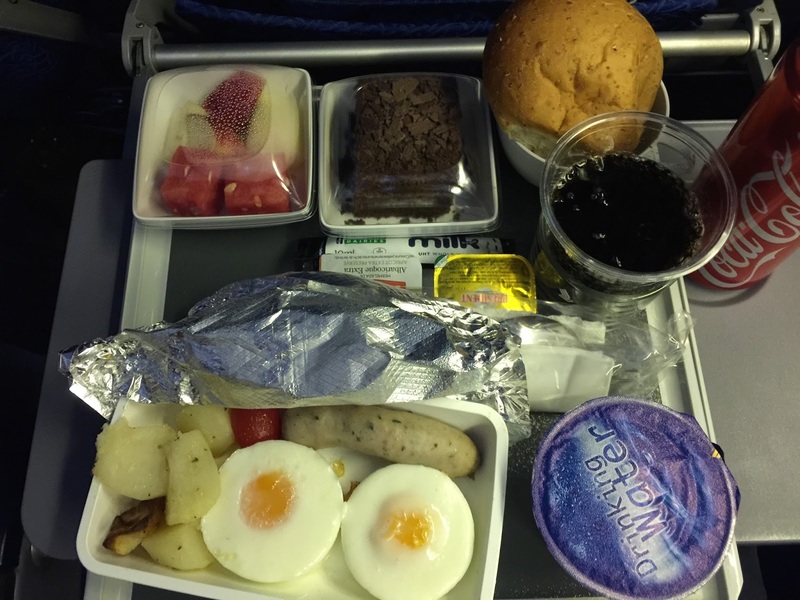 On this leg of the flight, passengers are given the meal options of Chicken Sausage with Egg or Fish with Rice and Omelette for breakfast. 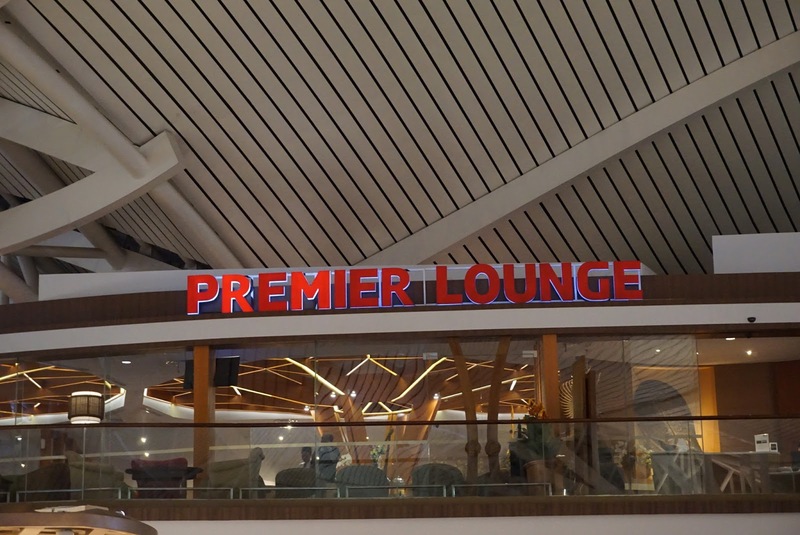 Passengers are also treated with the standard drink options such as soft drinks, beer and various juices. I opted for the Sausage option, which is tasty and well seasoned. The fried eggs are done perfectly and the mash potatoes are moist. Despite portion looking small, it is enough to fill my stomach. Each meal comes with fresh fruits and chocolate mouse cake, which are tasty as well. My friend opted for the Fish and Rice, which is well flavoured and tasty. The omelette is full of flavours as well. 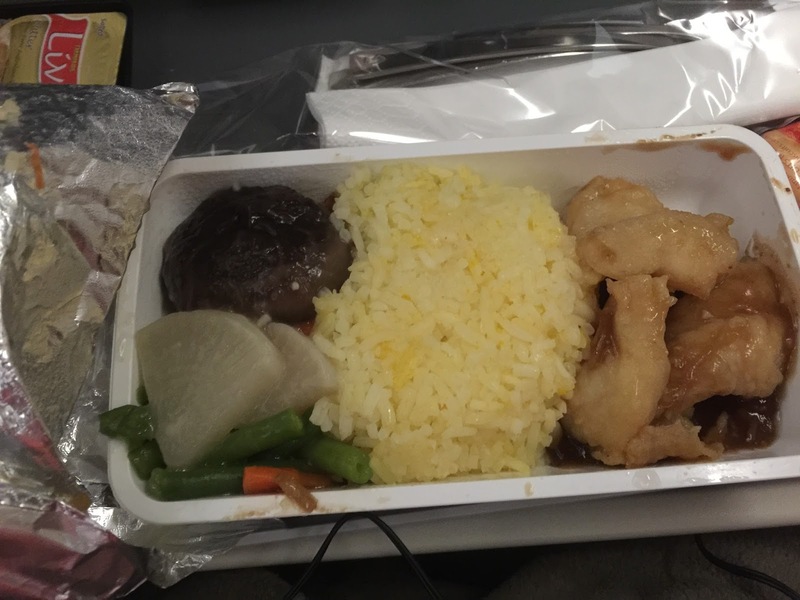 For this leg of the flight, passengers are given the option of Chicken with Rice or Beef with potato option. I took the Chicken with Rice option which comes with apple and prawns as appetiser and coconut cake as dessert. The chicken is well marinated and is very tasty. The prawn is well poached but the apple is a little to sour for my liking. 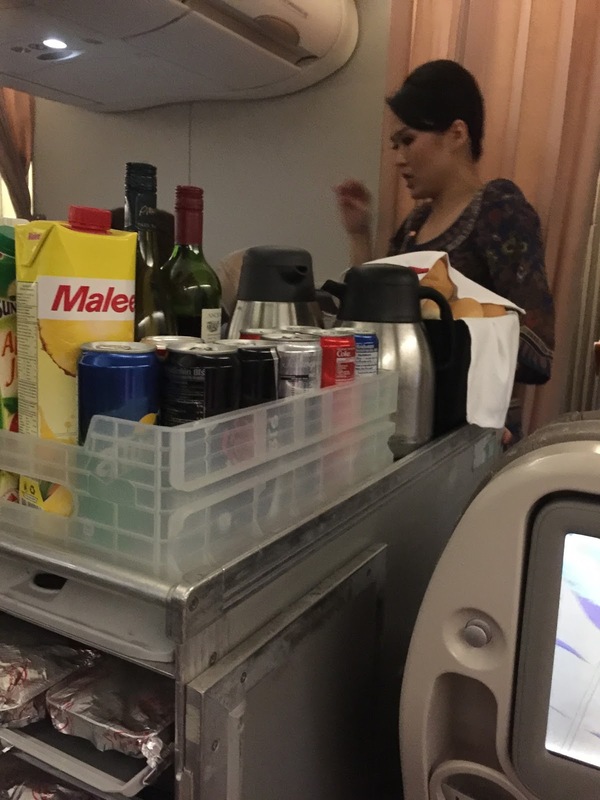 Standard drinks such as soft drinks, juices and beer are available for passengers. 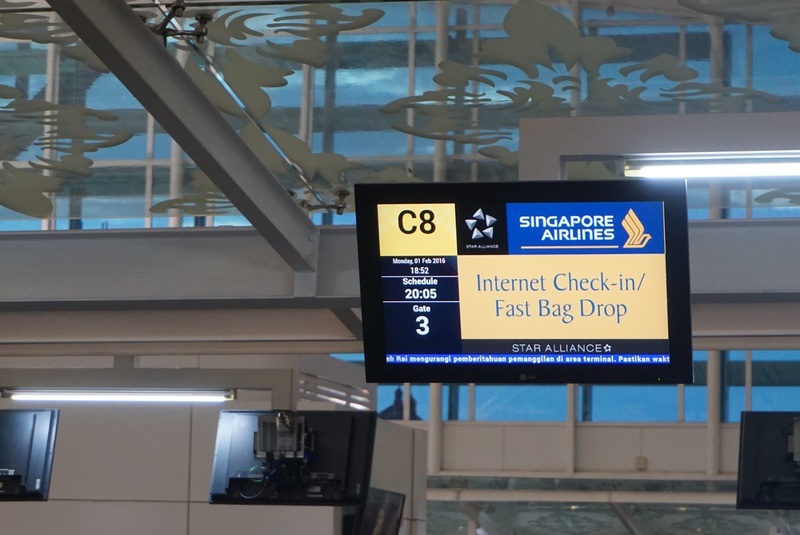 Service onboard Singapore Airlines is impeccable on both legs. 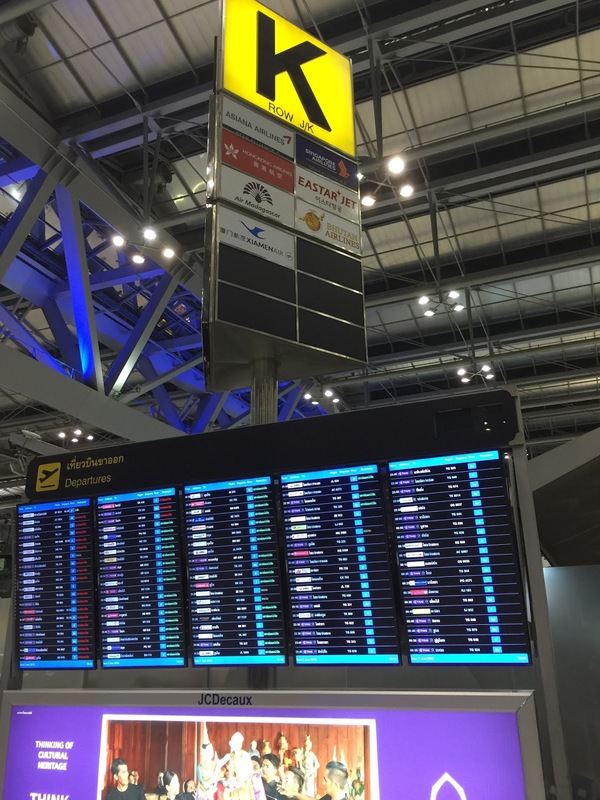 For the SIN-BKK leg, the excellent service started at the time of boarding. Flight attendants are seen helping passengers with the carry-on luggage and helping passengers settling into the seat before taking off. Service is always done with a smile. As my sister is traveling with my young nephew, flight attendants are seen checking on them constantly to ensure they are comfortable and well taken care off. 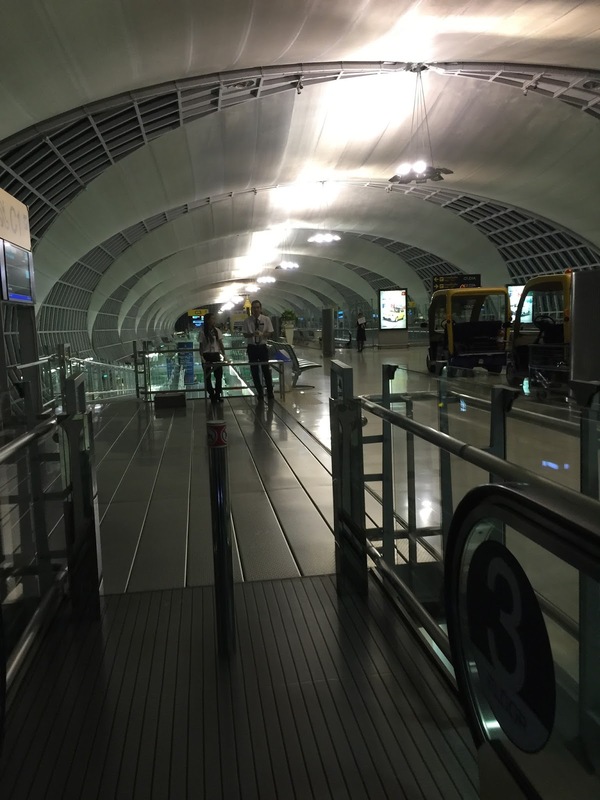 The service on the BKK-SIN leg is nothing short of excellent as well. 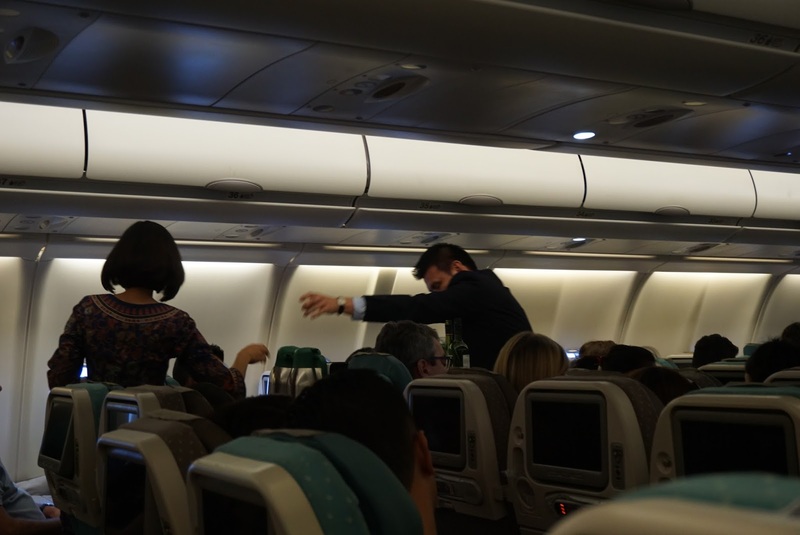 The team of flight attendants were friendly and did not feel imposed upon when requesting for items such as additional bread or drinks or even blankets. During the fight, Eunice Tan made us feel comfortable and ensured that all our requests are being attended to. 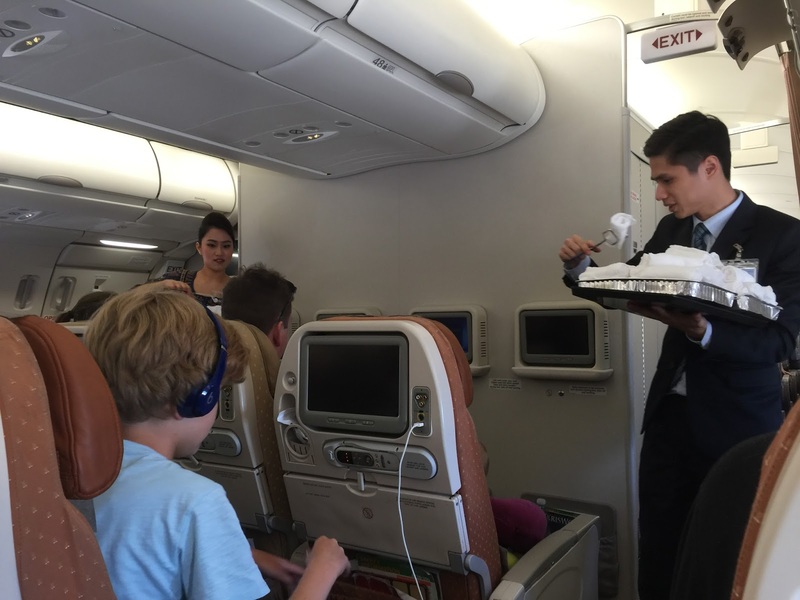 Usually flight attendants would forget about requests for drinks during meal service. This is not the case for Eunice. Despite the drink I wanted was not in her cart, Eunice offered alternatives and promised to get back to me after servicing the section she was responsible for. Eunice was seen rushing back to the galley after doing her job and emerge with the drinks I wanted. Eunice was also attentive when she noticed that my drink was finished, she took the initiative and asked if I need more drinks. 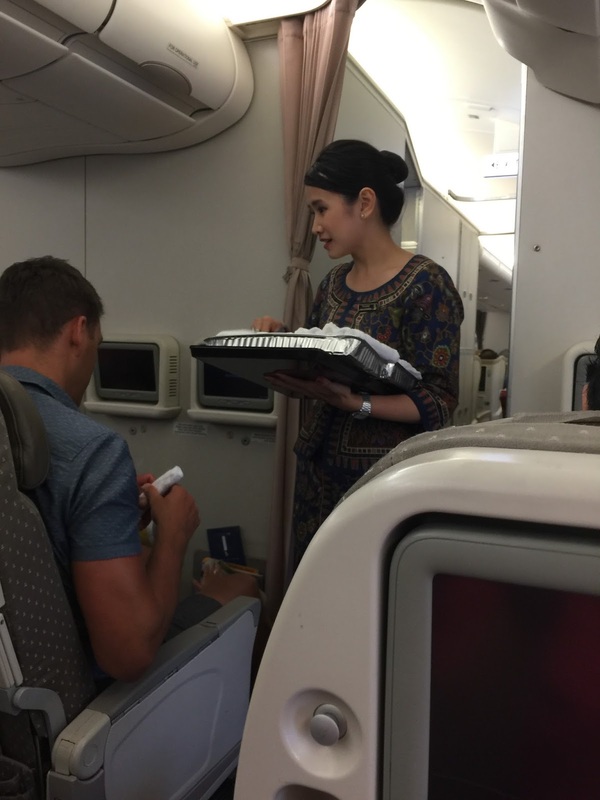 This is the first time I encountered such attentive service onboard Singapore Airlines. Eunice was attentive to my sister as well. During meal time, she was seen suggesting to my sister to be served meal first, so that my brother-in-law can “entertain” my nephew. Eunice took note of the meal option for my brother-in-law and returned later to check if my sister has finished her meal. After clearing the meal tray from my sister, Eunice promptly returned with my brother-in-law’s meal. The other crew onboard that truly stands for what the Singapore Girl means is Ploypom. 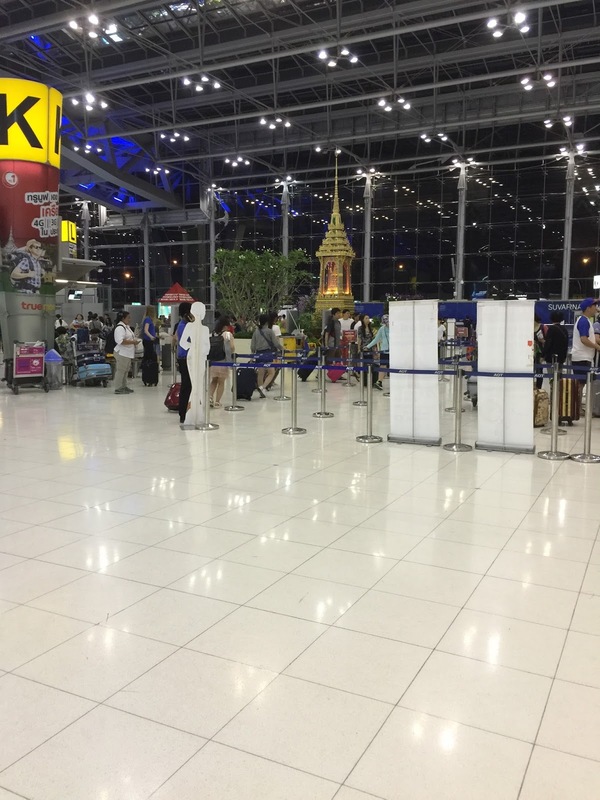 When I requested for a blanket from Ploypom, she responded to my call for attendant promptly and took the initiative of bringing 2 blankets, with the other 1 for my friend as well. Such thoughtful gesture surprised me, Ploypom did not only do what was requested, she went above and beyond that. 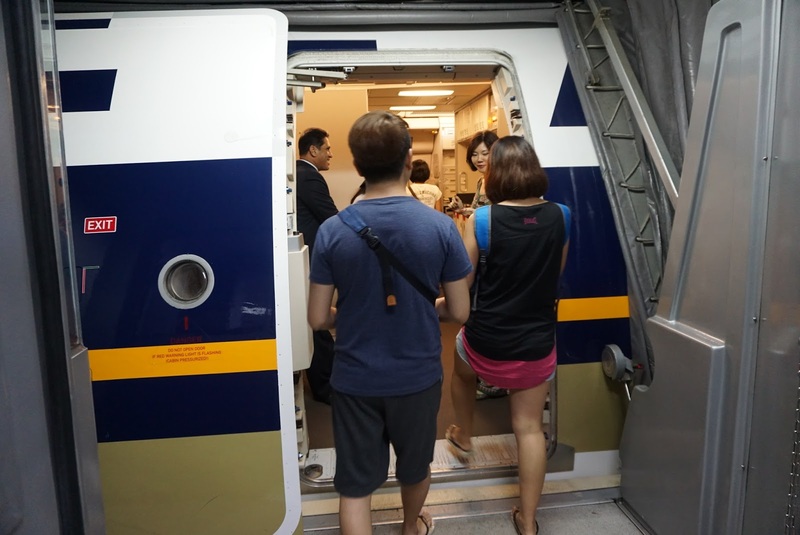 I had a comfortable flight with Singapore Airlines for this Bangkok trip. 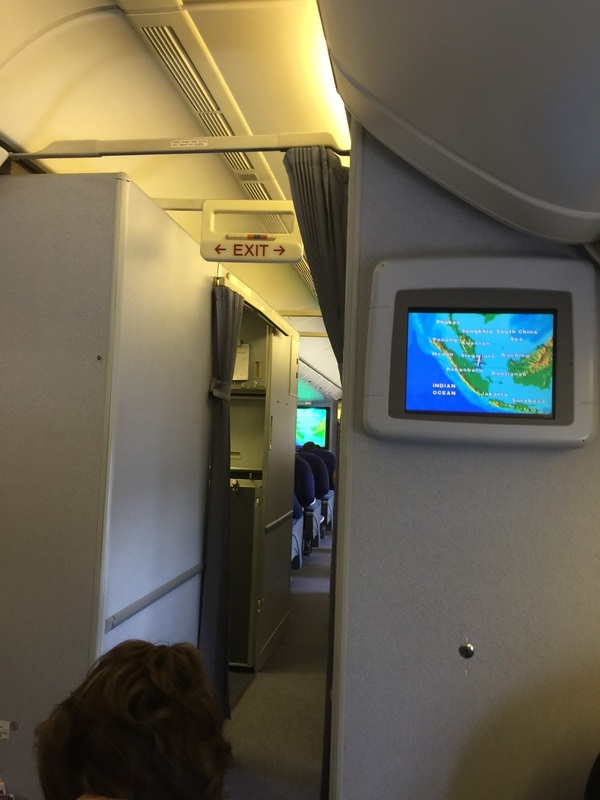 Despite its B777-200 being aged and a small hiccup on the IFE, the aging aircraft is comfortable to fly in. 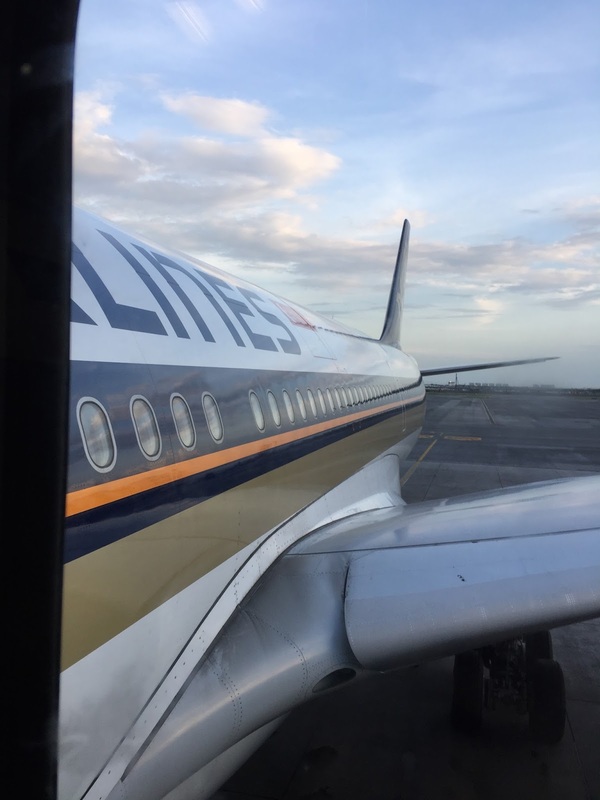 The A330-300 that Singapore Airlines deployed is comfortable and the IFE system kept me entertained throughout the flight. 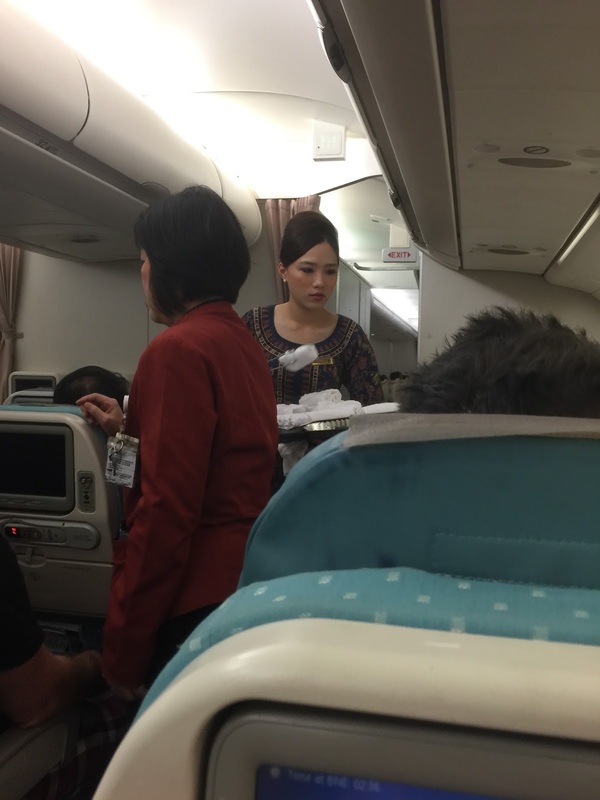 The service is impeccable onboard both legs of the flight. 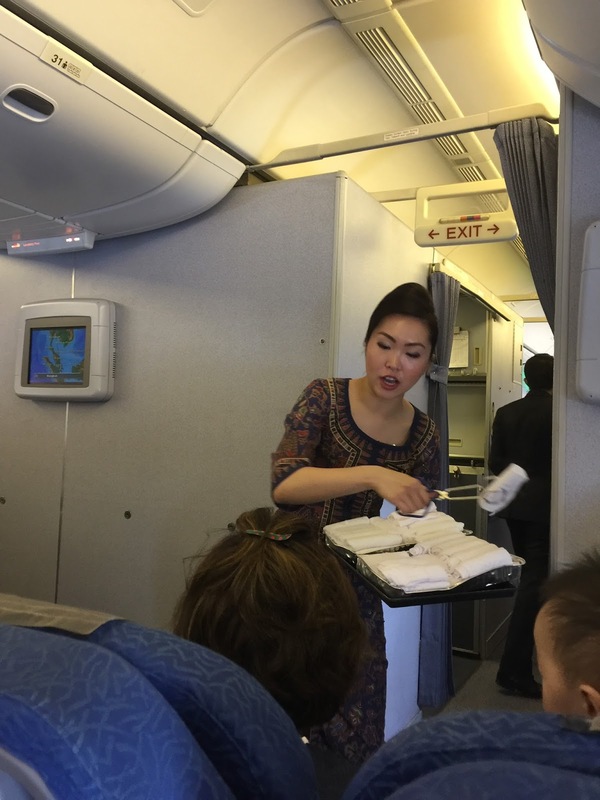 Flight attendants are seen serving the passengers well and ensured that our needs are being taken care of. 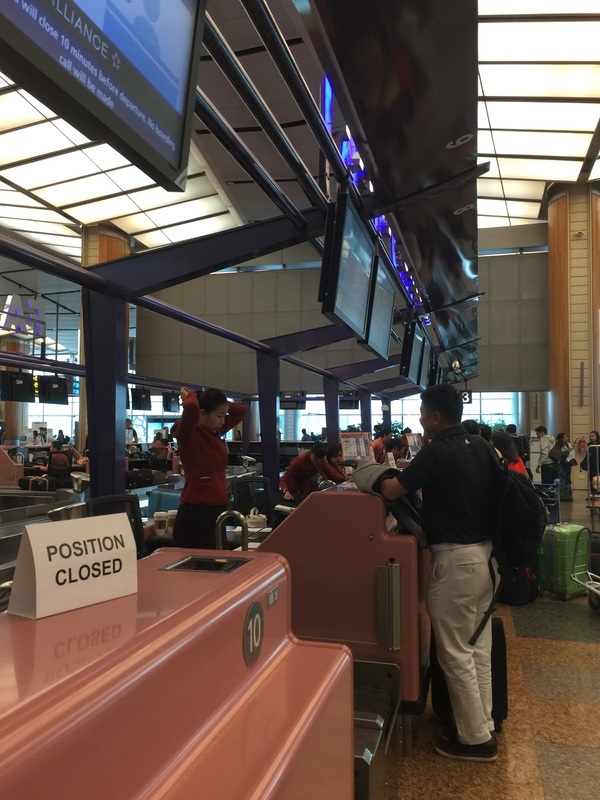 Nothing seem to be too troublesome for these industrious flight crew who strived hard to keep the standard of service that Singapore Airlines is well known for consistent. 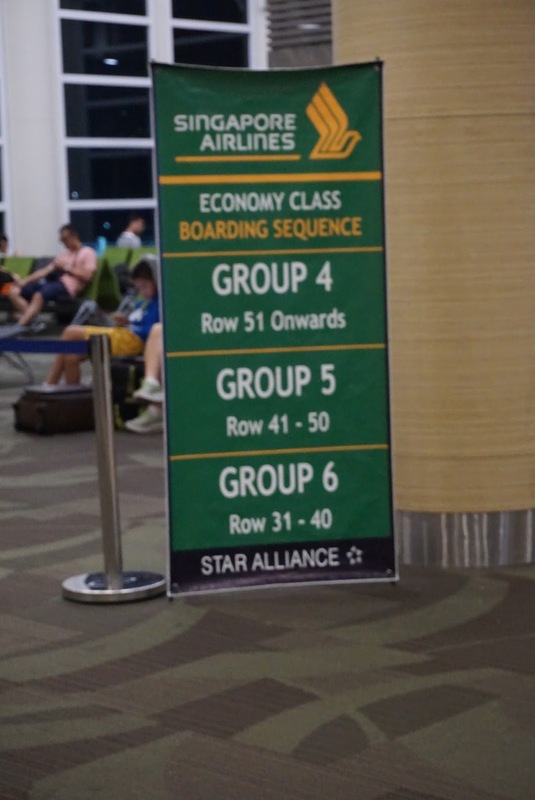 Despite traveling with infant, Singapore Airlines does not offer priority boarding for passengers with young children, boarding is done sequentially by rows organised in groups. 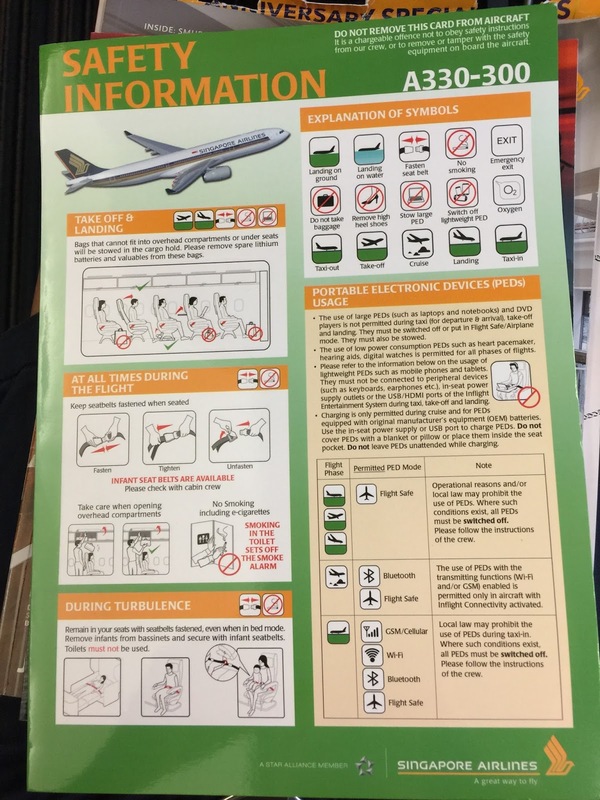 Singapore Airlines no longer provide pillows and blankets on their seats during boarding, these amenities have to be requested should passengers need them. 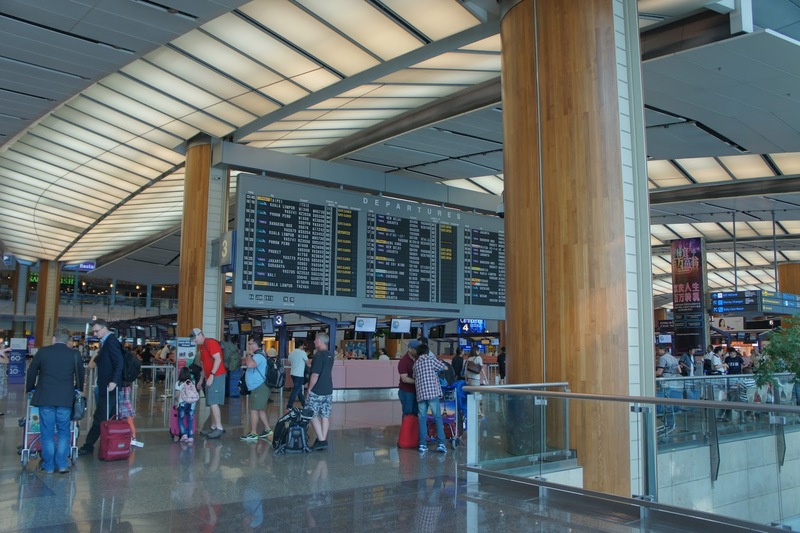 The flight from Singapore to Brisbane departs from Singapore Changi Airport Terminal 3. 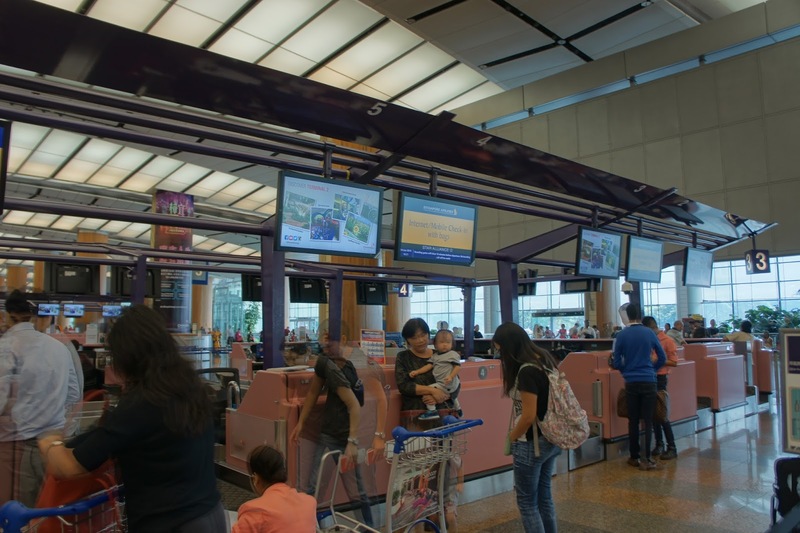 SQ has several check-in counters in Terminal 3, including the self check-in and baggage drop off. 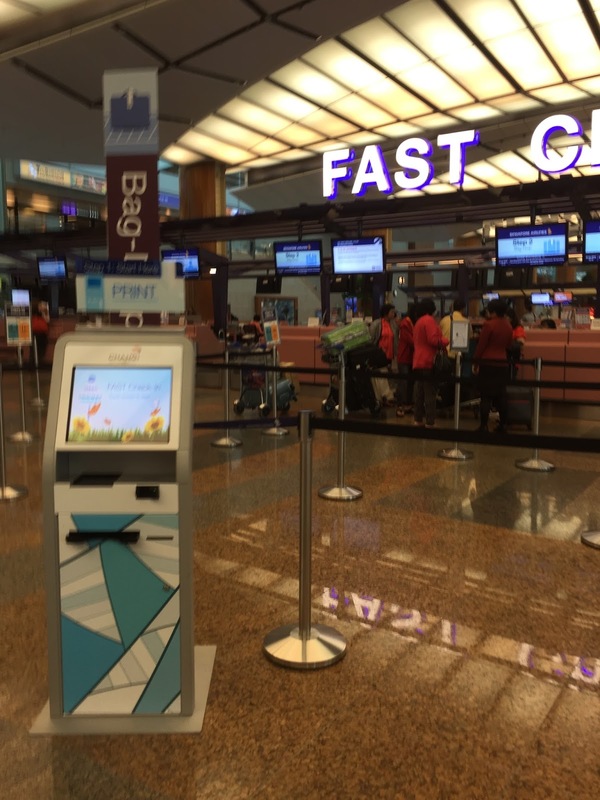 For this trip, I used the self check-in kiosks located at row 3. 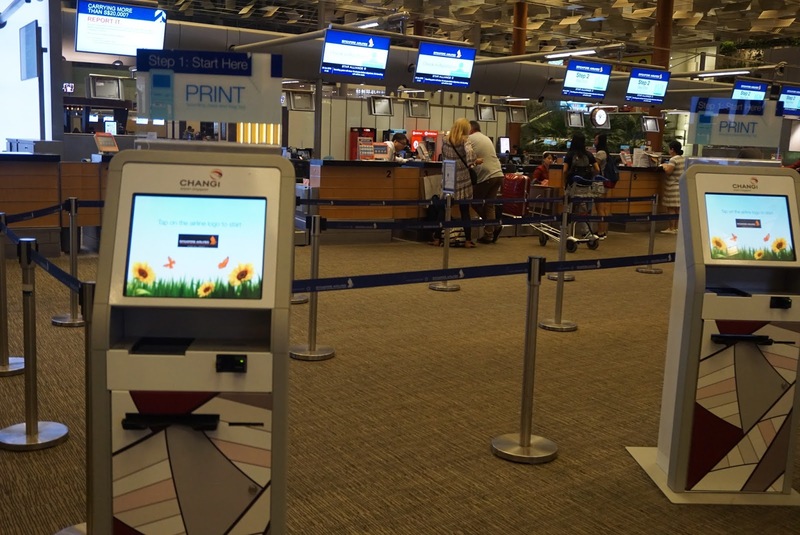 The kiosk is easy to use and prints out my boarding pass swiftly. 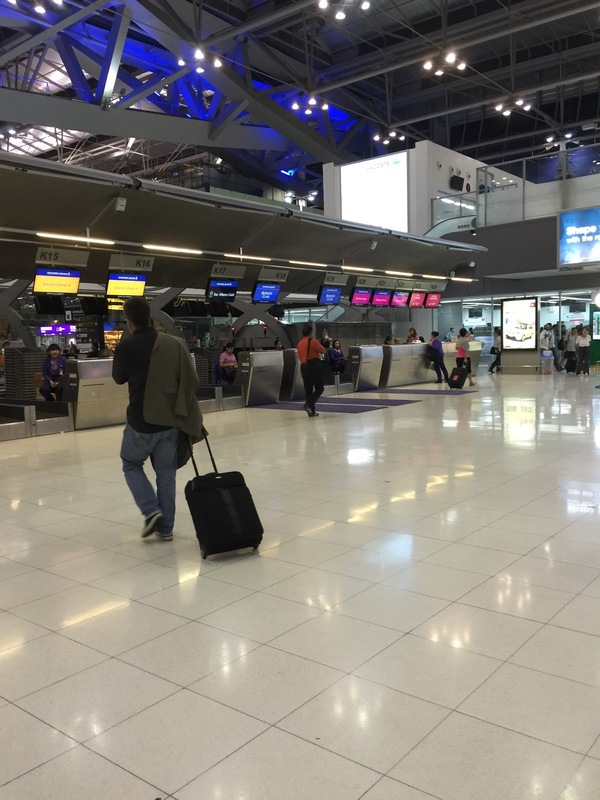 As I had bags to check-in, I proceeded to the check-in counter behind the kiosks to drop off my luggage. There are ground staffs stationed at the kiosks ready to render help to passengers should they face any problem. 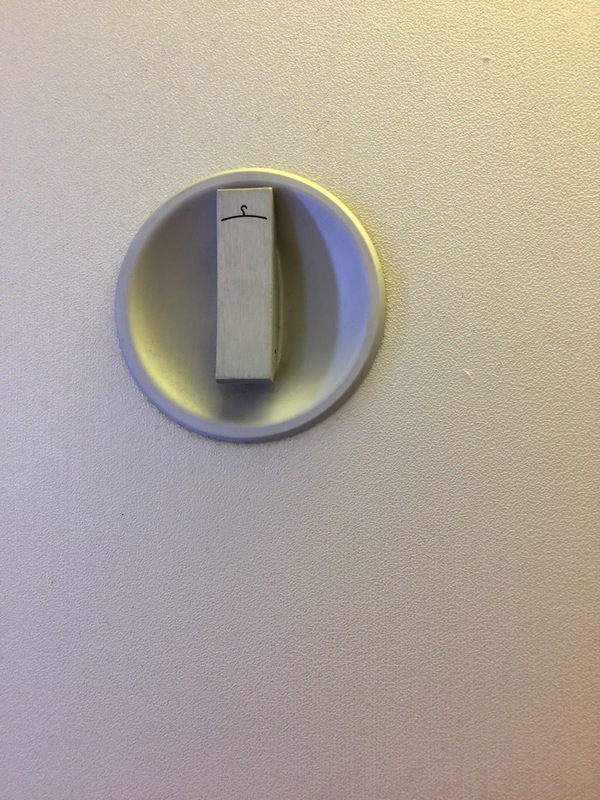 Having gotten my boarding pass, I realised the boarding gate was not printed on it. 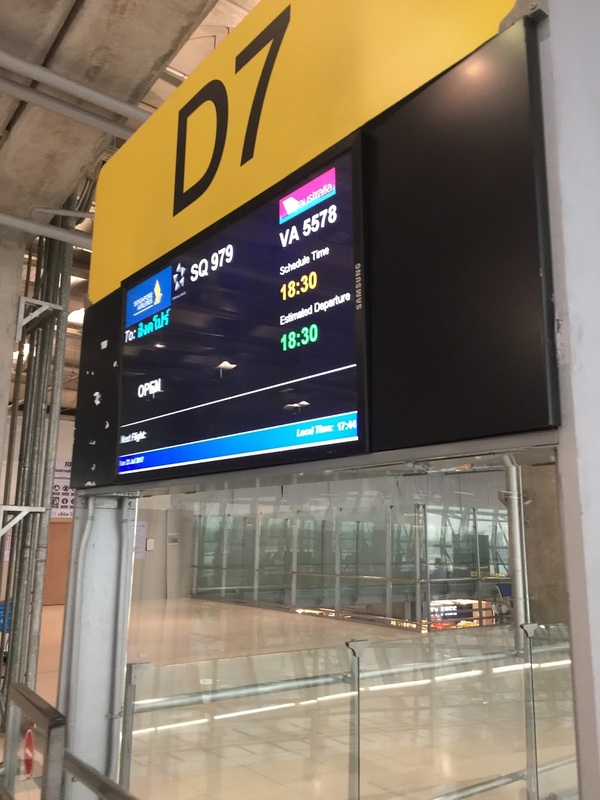 I had to constantly check the flight information screens, scattered around the air side of the terminal for my boarding gate. SQ255 departs from Gate A5. 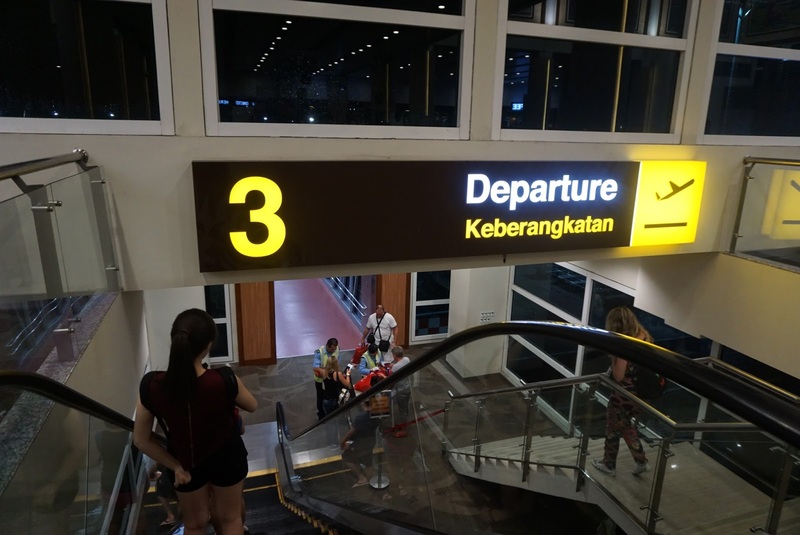 Passing the security checks for this boarding gate, the waiting area for the flight comprises of several gates which was rather chaotic especially there are two SQ flights with similar flight number leaving for Australia at around the same timing. Ground staffs seem to compete with each other for attention of the passengers when processing for boarding. 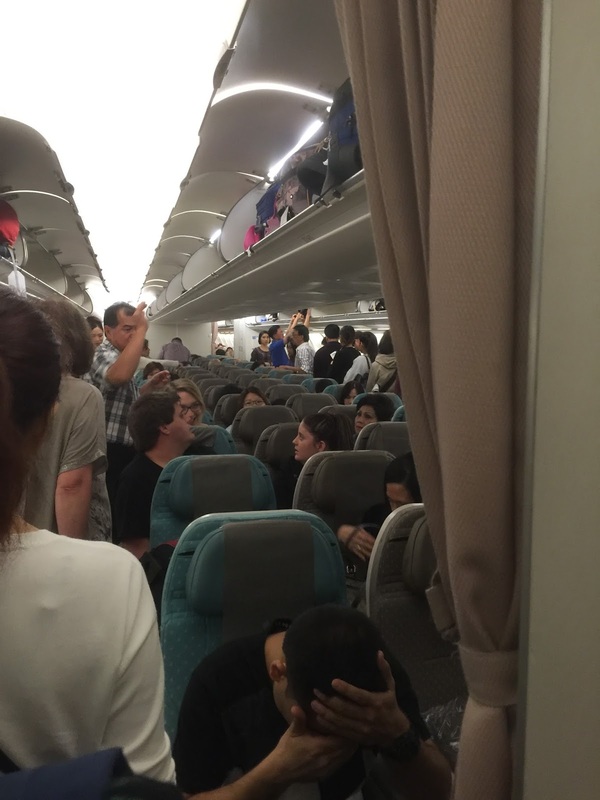 Boarding for Economy Class passengers is done in groups, which are separated by the rows on the aircraft. I thought this arrangement has hugely reduced the long queues for passengers waiting to board on Economy Class. 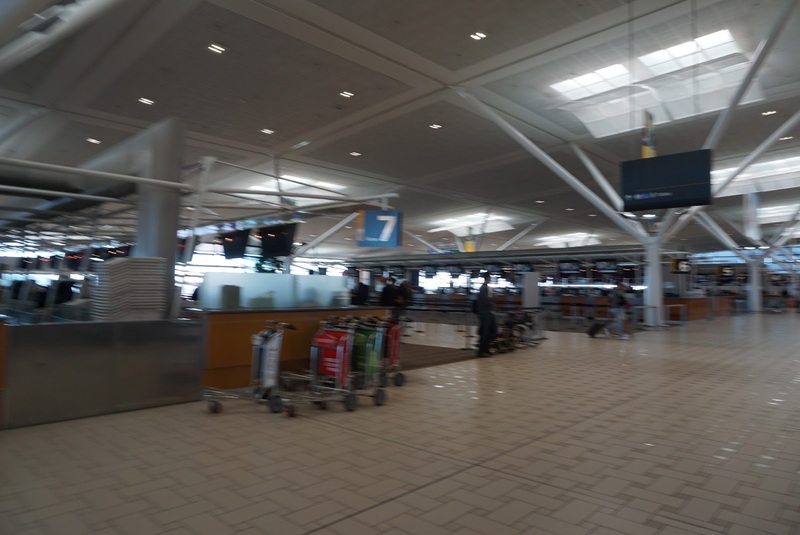 Check-in for SQ flights are located at Row 7 on the departure level of Brisbane International Airport. 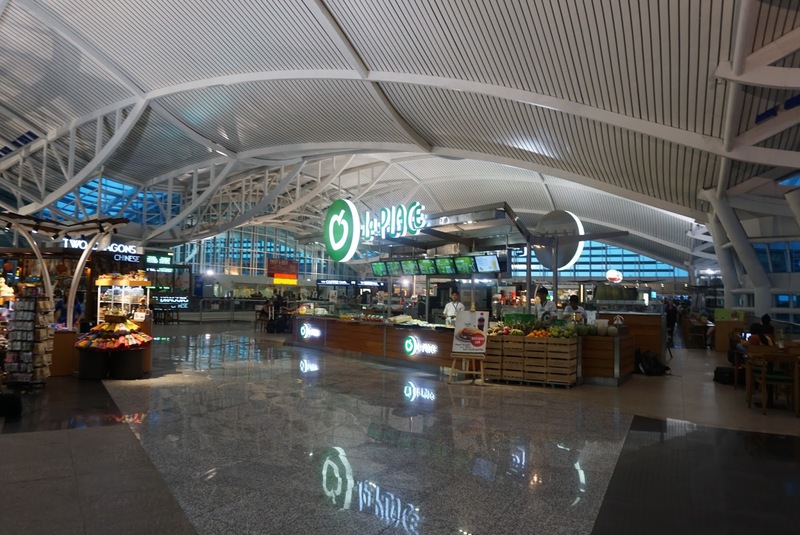 There are three queues for passengers traveling on SQ in this airport for Business Class, Economy Class and passengers who has done online check-in. 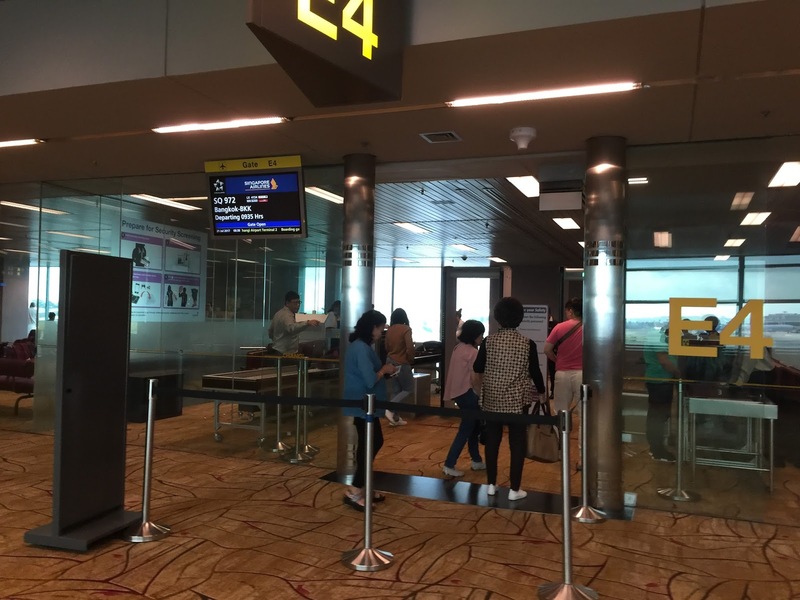 As I had done my check-in via SQ’s mobile app, I headed for the online check-in queue. 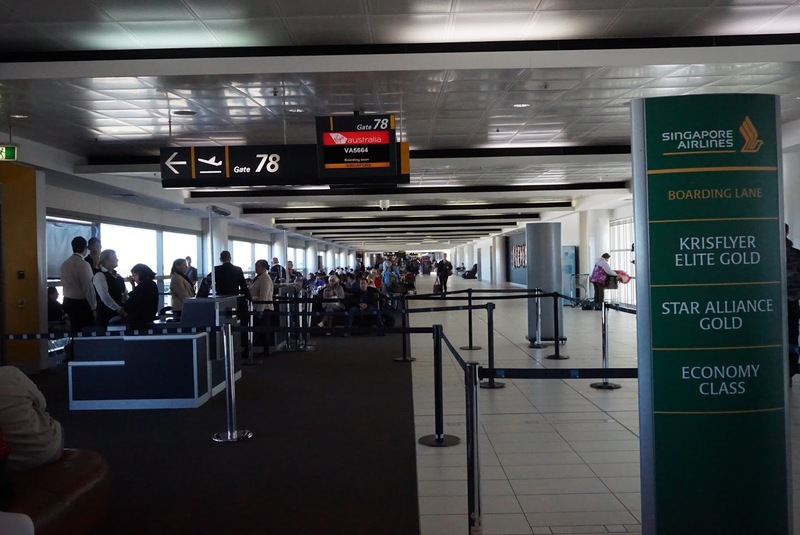 There are hardly any passengers in this queue and my check-in was promptly completed. SQ236 leaves from Gate 78, located at the other side of air side of the terminal after the immigration area. 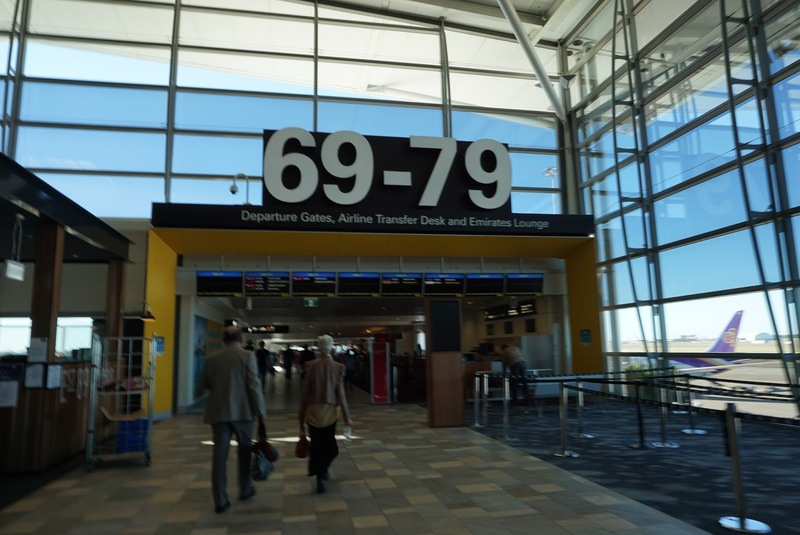 Gate 78 has a dedicated area for passengers to wait around for their flight. 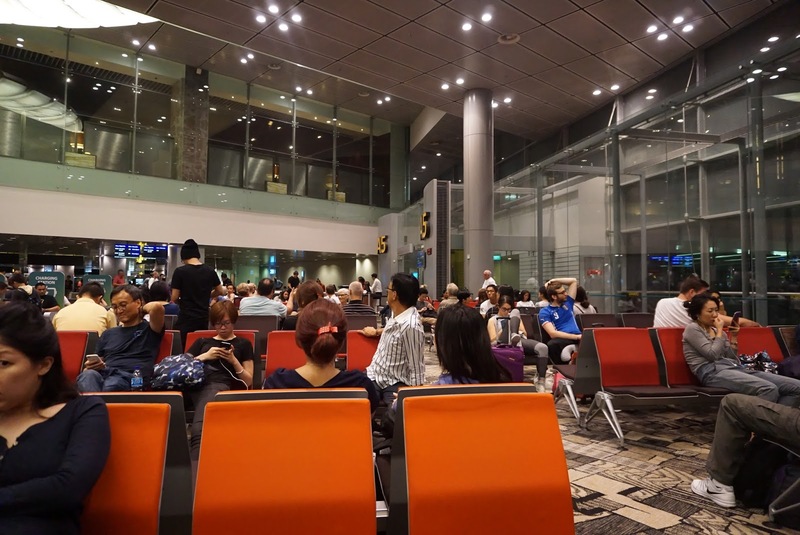 However there are limited sitting available at this gate, a number of passengers are seen standing around the boarding gate waiting for boarding. 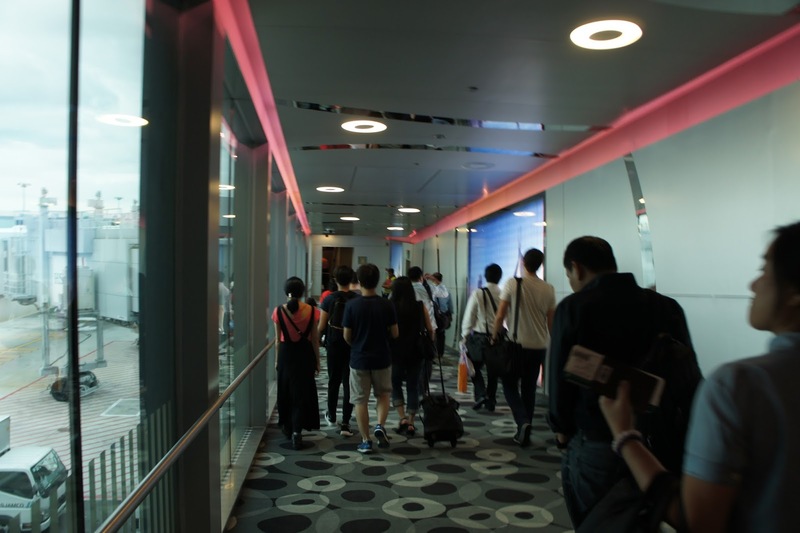 As with my outbound flight, boarding was also done by groups with passengers sitting at the rear most section being boarded first. 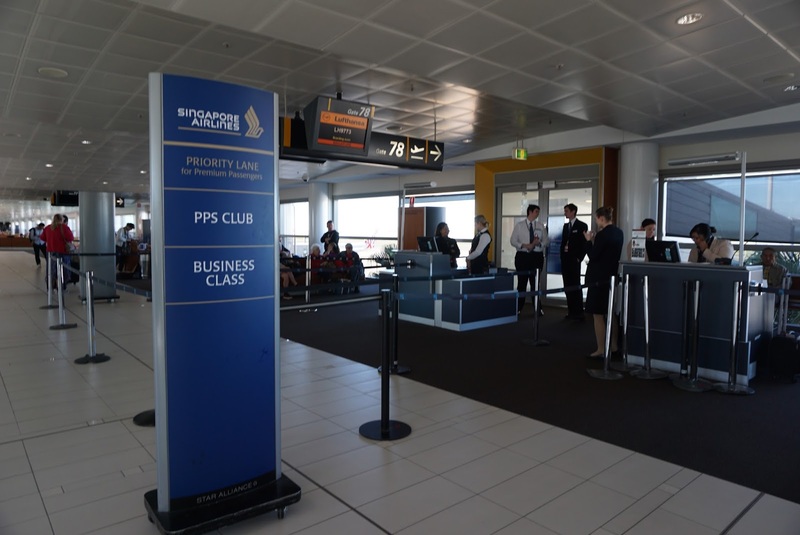 There is a separate queue for Business Class passengers. 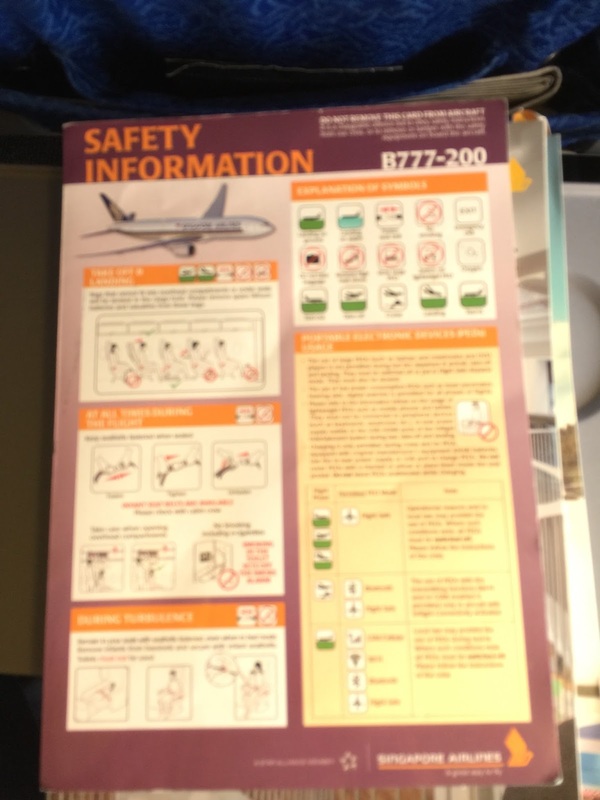 SQ uses the A330-300 for both legs of the flight.There are a total of 255 Seats in Economy Class arranged in a 2-4-2 configuration divided into two sections. 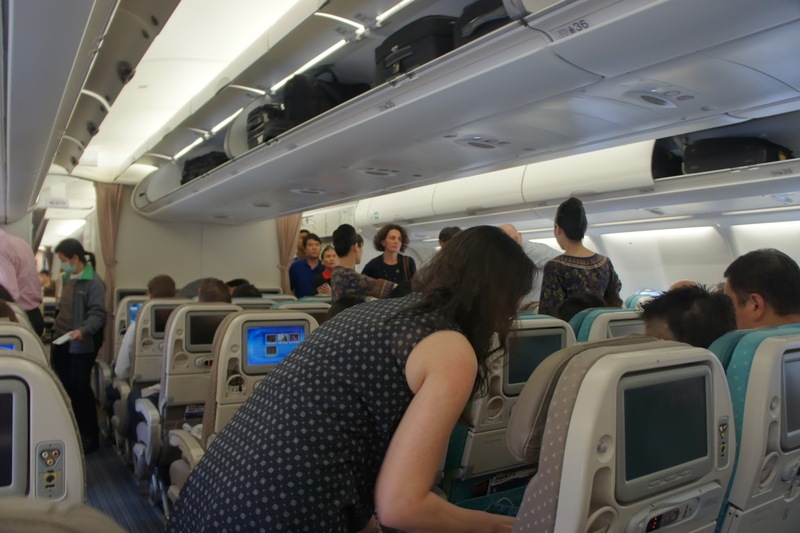 The cabin ambience feels comfortable with the use of grey and turquoise coloured seats in the front section of the cabin and two different shades of brown in the rear section of Economy Class sections. 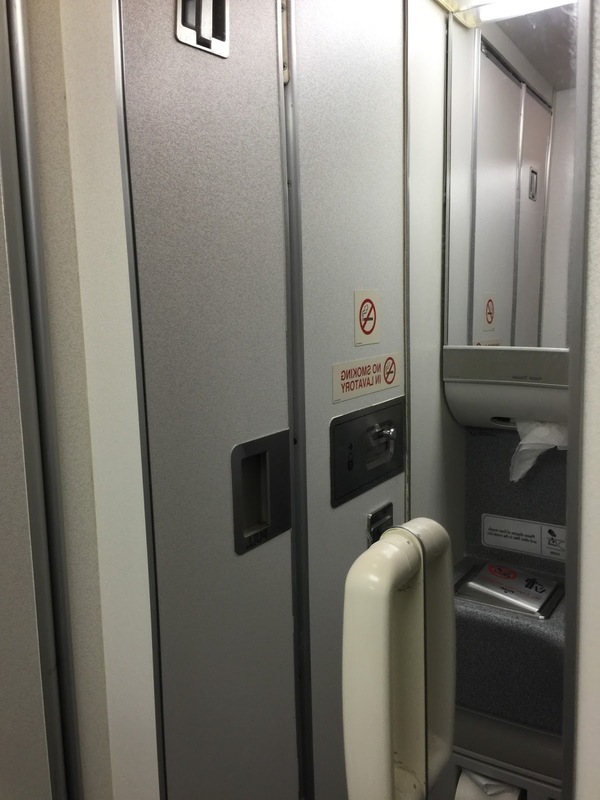 There are several lavatories located across the Economy cabins in the aircraft. 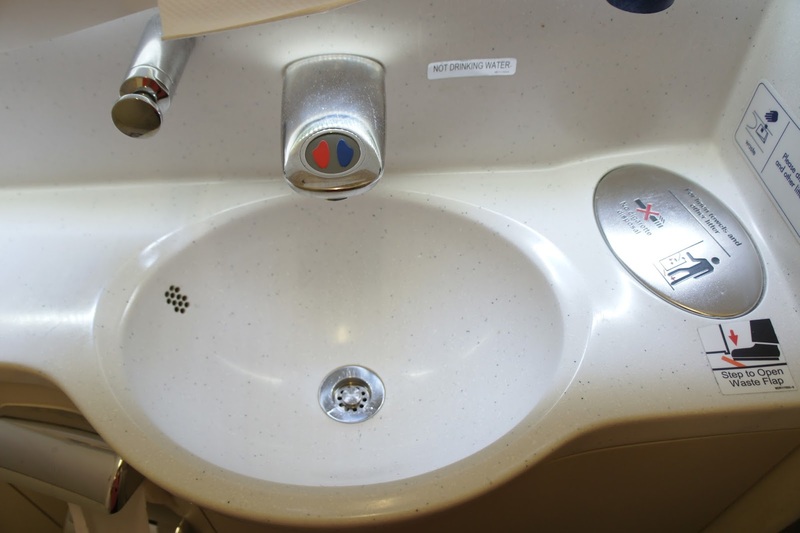 The lavatory is tad small, and are well stocked with amenities such as toothbrushes and combs. 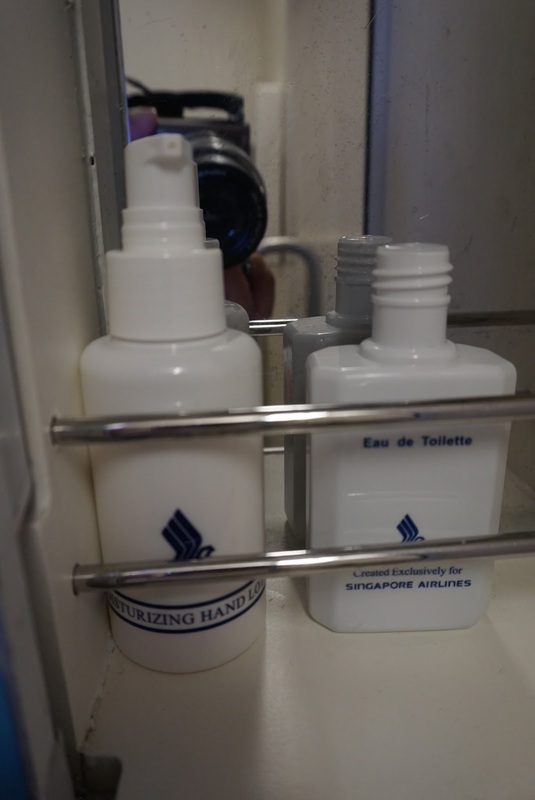 Other than the standard hand soap which is common across most of the airlines, the lavatory is also stocked with mouth wash, hand moisturising lotion and eau-de-toilette. 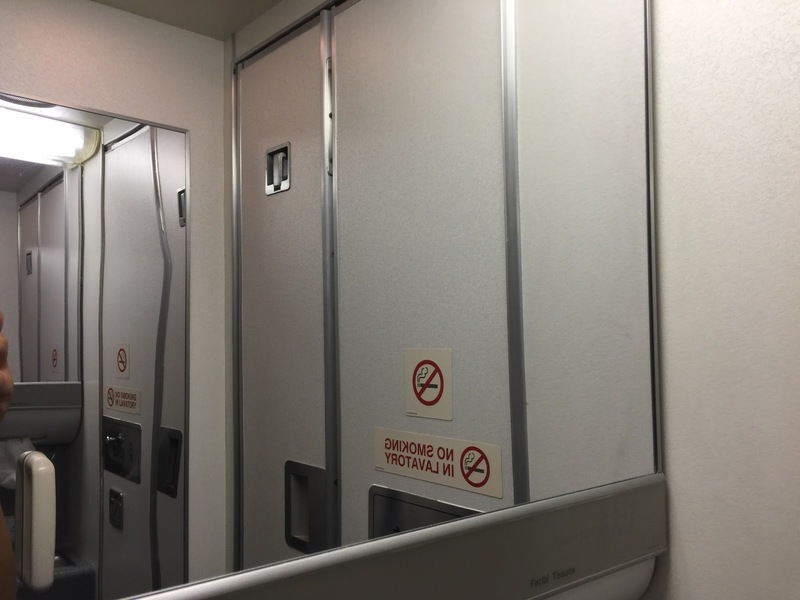 The large mirrors in the lavatory gives one a sense of spaciousness. 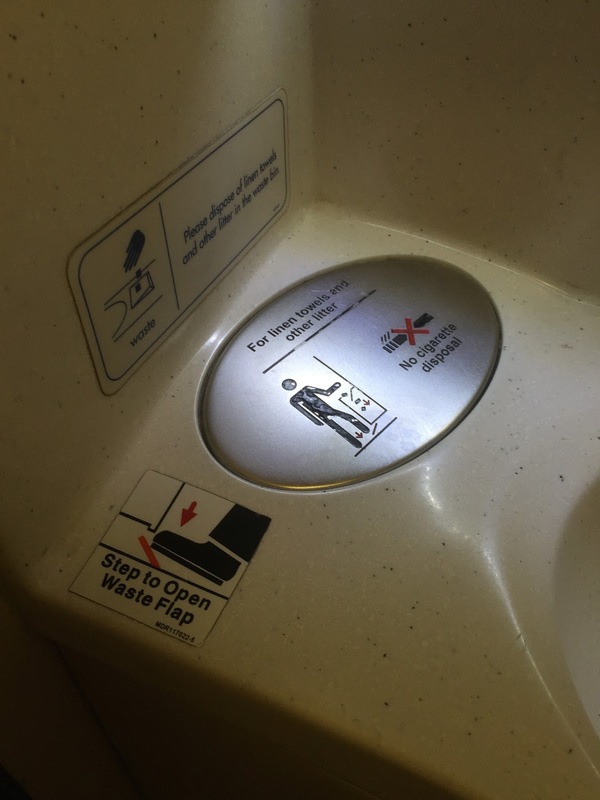 What I like about the toilet onboard SQ is that the trash bin cover is activated by a step pedal located at the bottom of the bin, which means passengers do not have to dirty their hands while trying to throw rubbish in it. 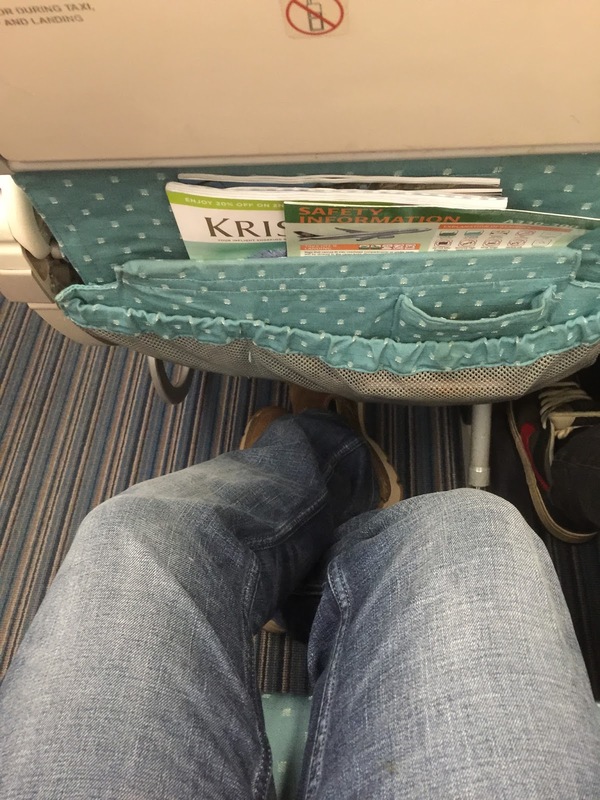 Legroom for the seats on this aircraft is rather generous measuring 32″ pitch and 19″ wide and reclines at 115 deg. The seats are comfortable and capable of providing me with a good rest for the red-eye flight. 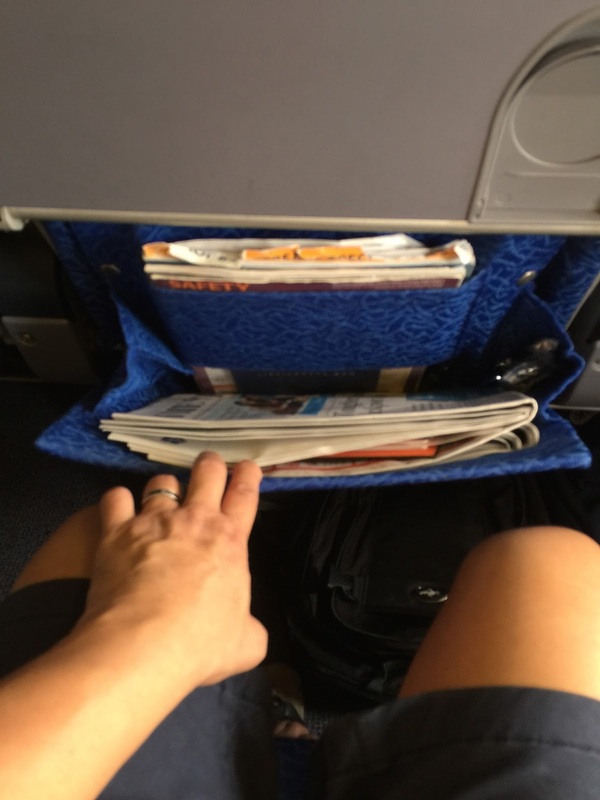 There are ample storage space in the seat pocket behind the seat in front of mine. 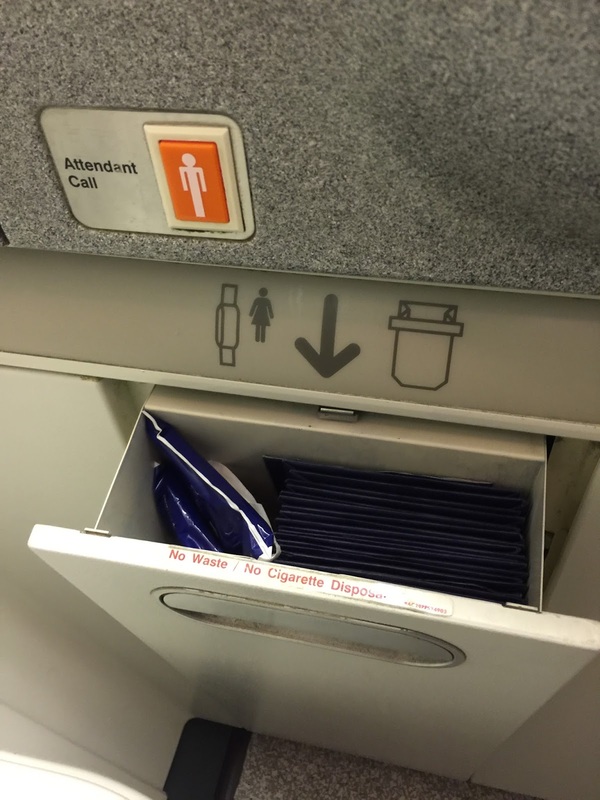 There is a small compartment in the seat pocket, large enough to put a mobile phone and passport. 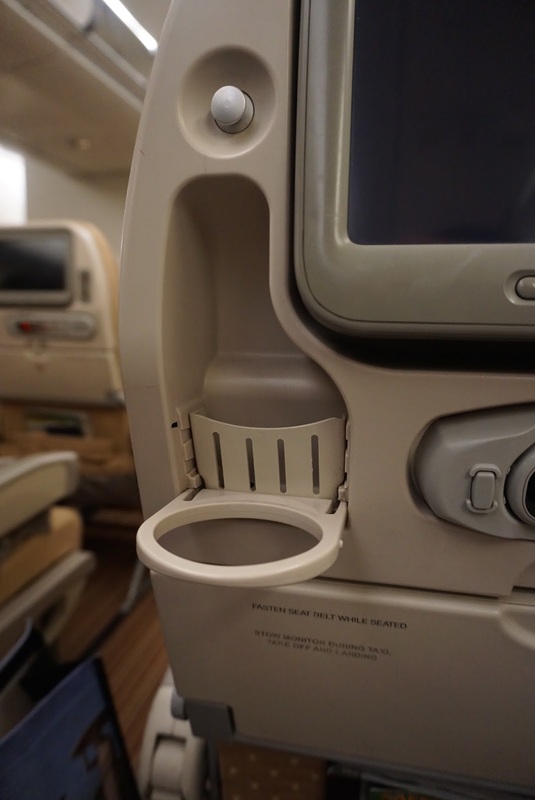 The seat has a bi-fold tray table with a vanity mirror on the back side of it, great for passengers who want to look good before deplaning. 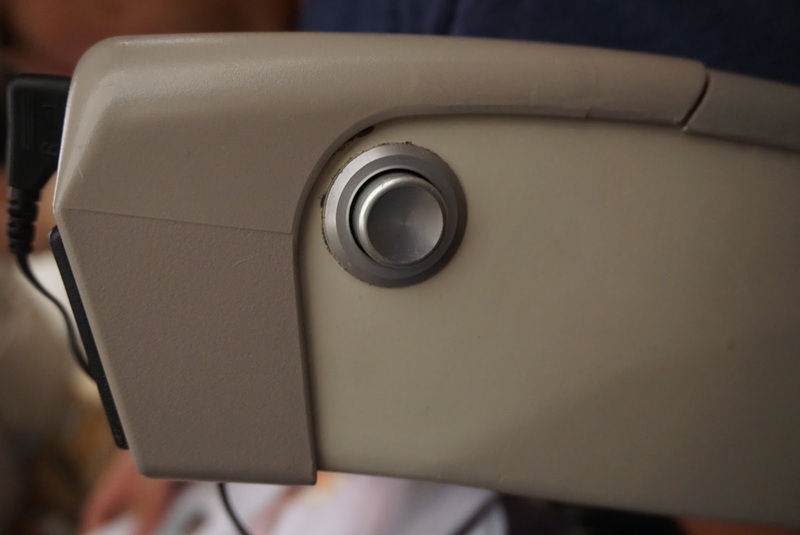 The recline button is located on the right armrest along with the jacks for the earplugs for the in-flight entertainment system. 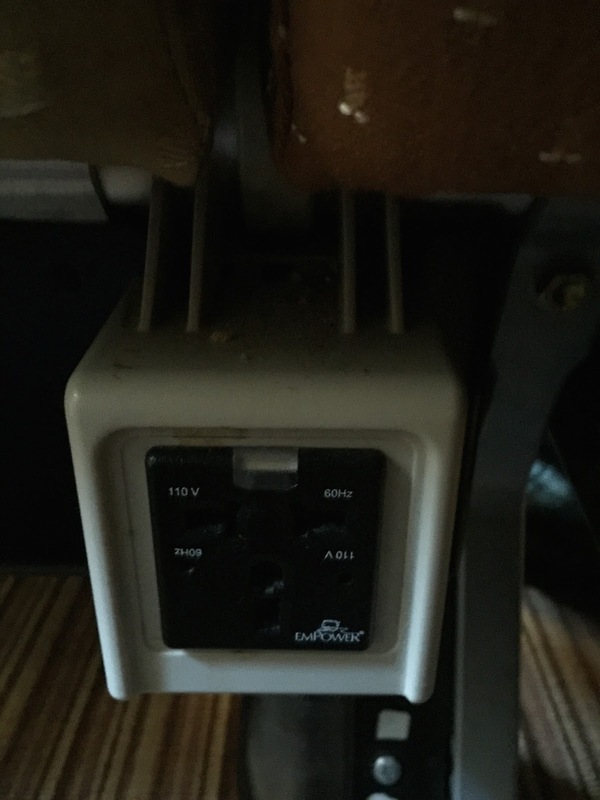 A multi-pin power socket is also located on the armrest or underneath the seat, depending on which seat one is seated at. 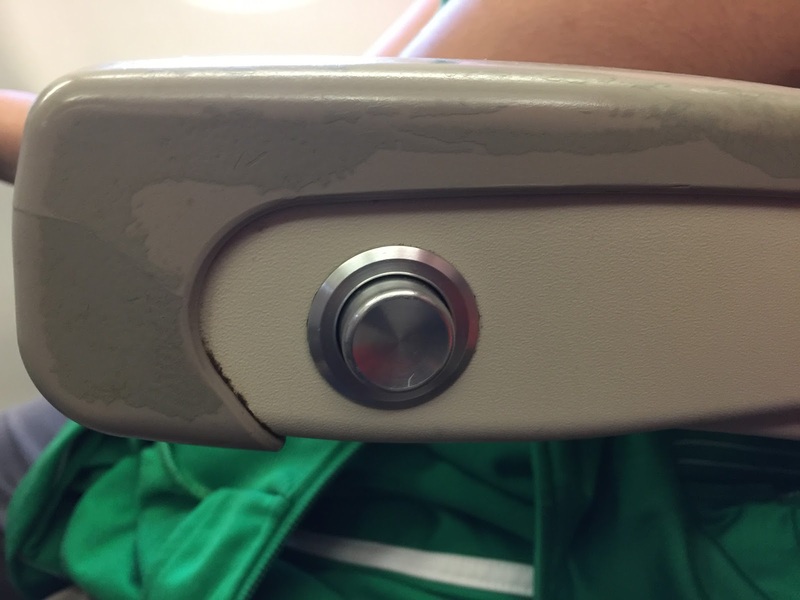 The seats are not without its flaws. For the SIN-BNE leg, I was seated on row 34. When I was doing my check-in on my mobile app, there was no indication if that seat was “unique”. 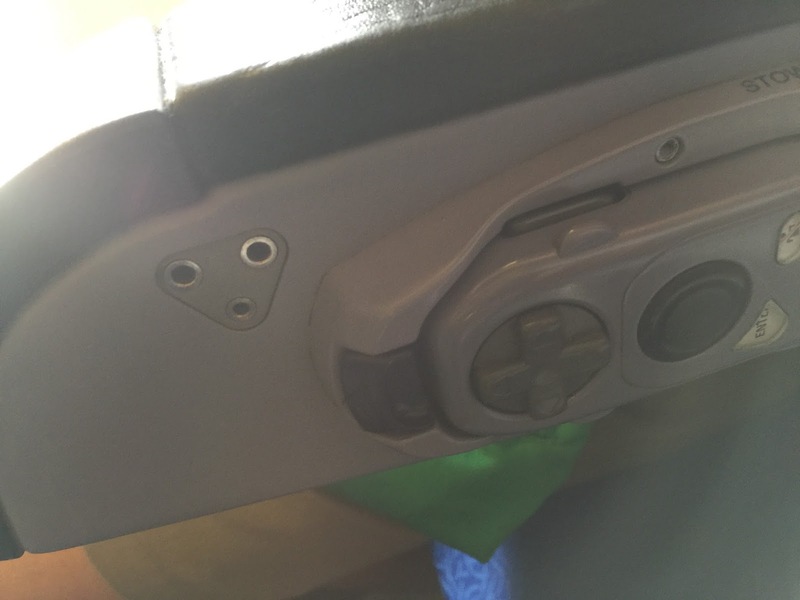 Upon arriving at my seat, I was shock that the seat was without a window. 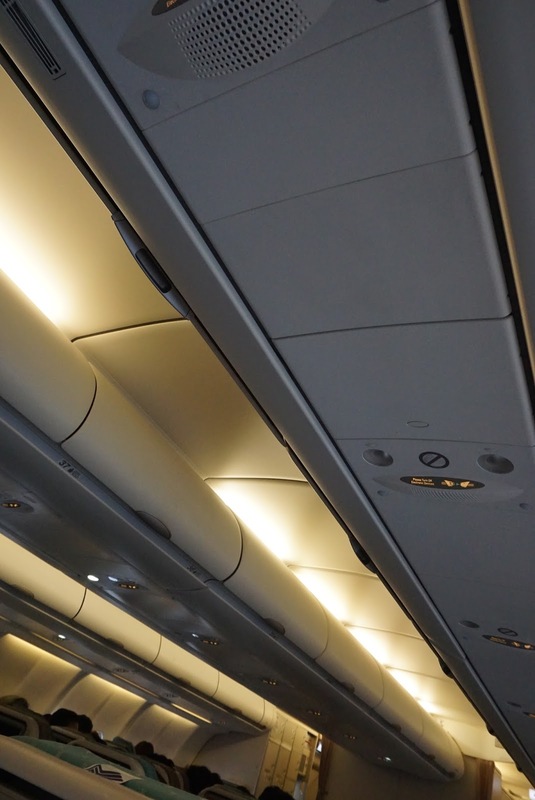 The condition of the seats onboard both flights were rather dirty with spots and dusts everywhere. 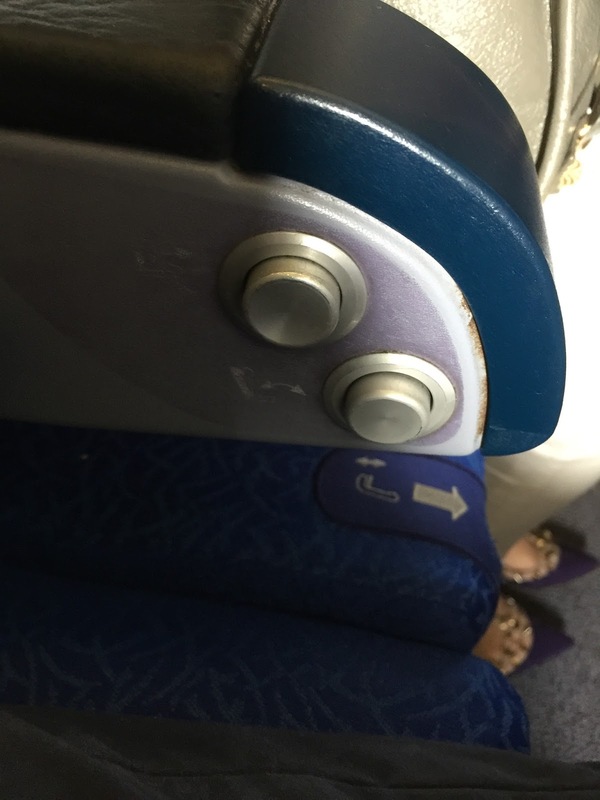 There are also stains on the bulk head of the seat where there was suppose to have a window. 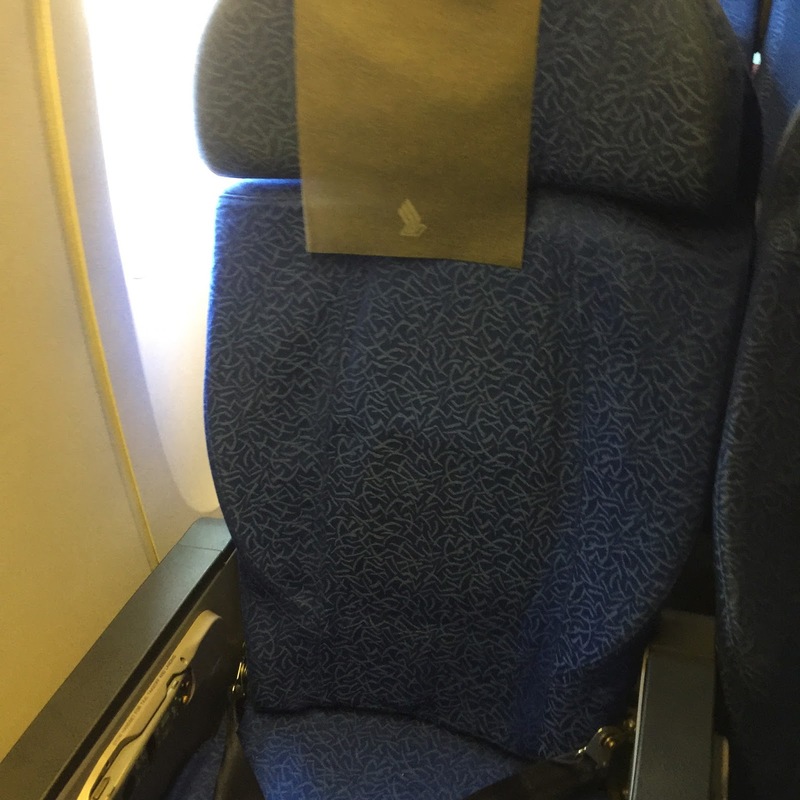 The seat I took on the BNE-SIN leg could not recline. 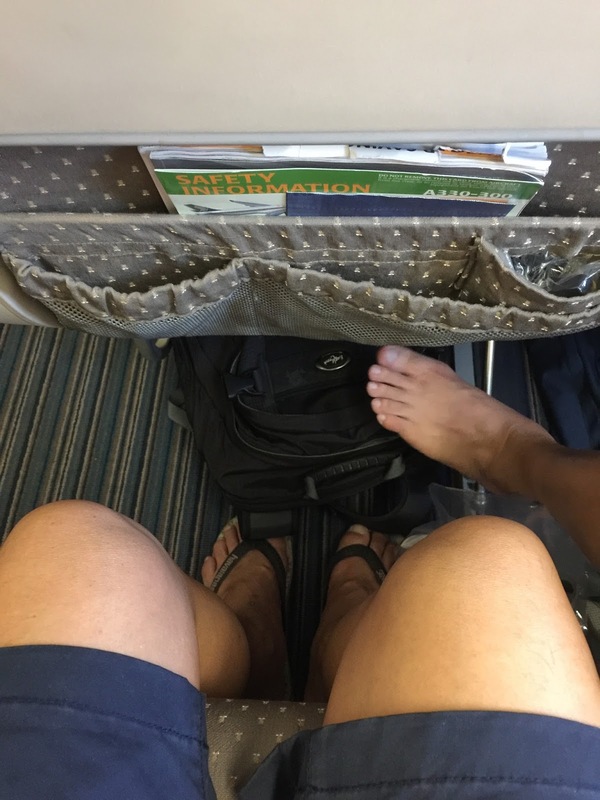 A stewardess had to give it a hard push for it for recline. 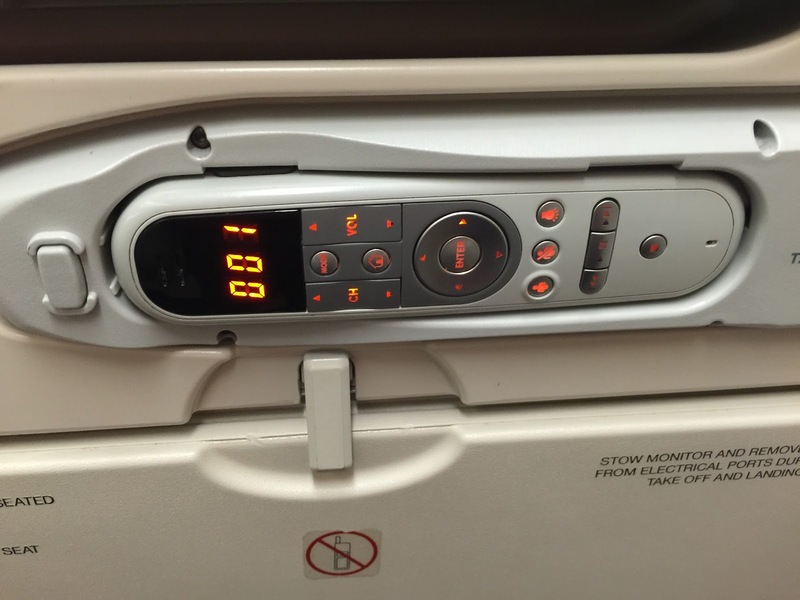 All seats in Economy Class has a 10.6″ personal TV, however they are not touch screens. 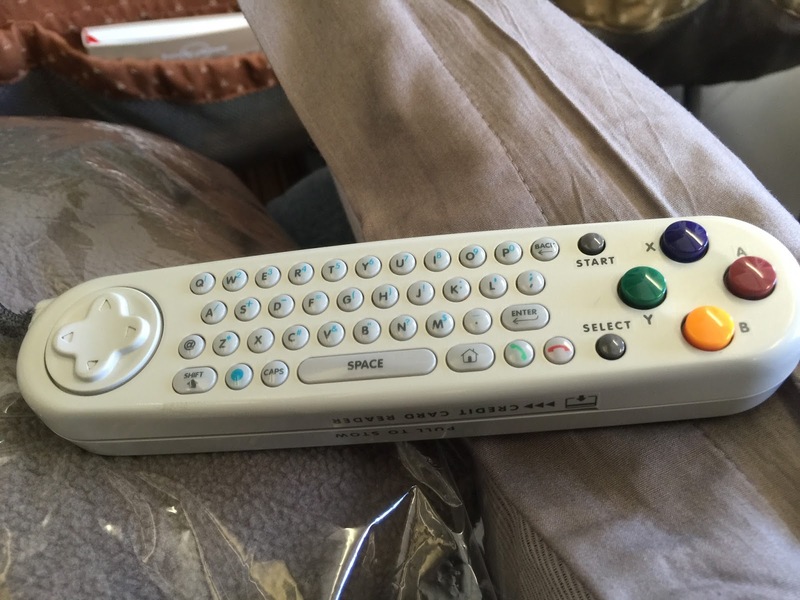 The controller to the PTV is stowed onto the ledge underneath the TV screen. 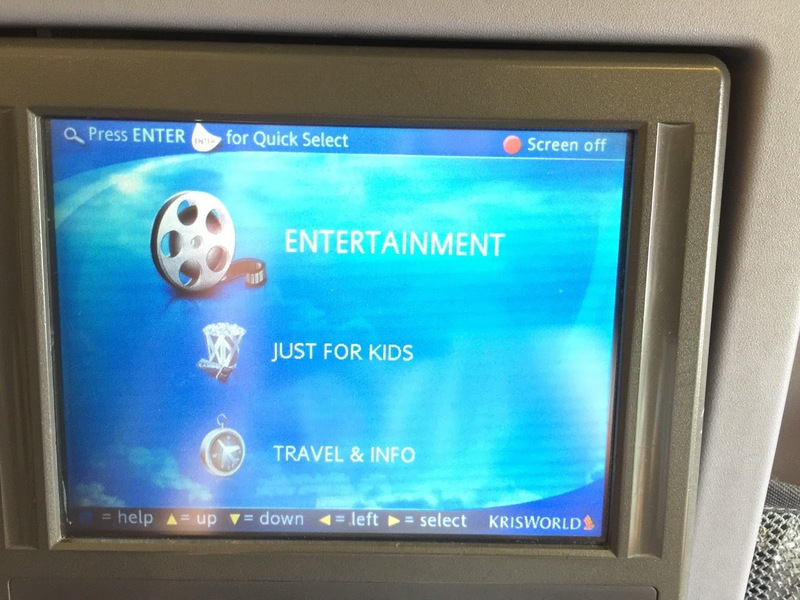 There are no lack of movies and shows in the IFE, which kept me well entertainment throughout the 8-hour flight to Brisbane. However when I was watching movies on the IFE, there are pauses on the IFE every 20 mins, which is quite irritating. 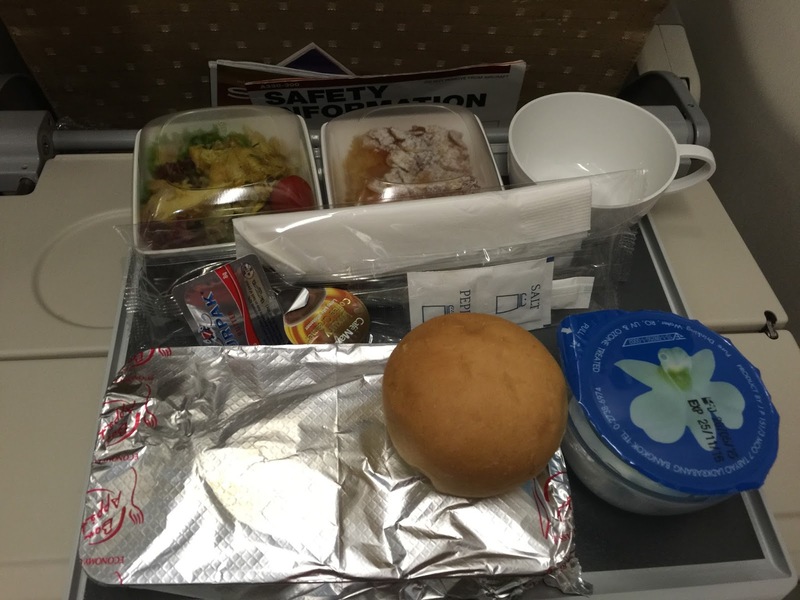 There are two meal services for each leg of the flight. 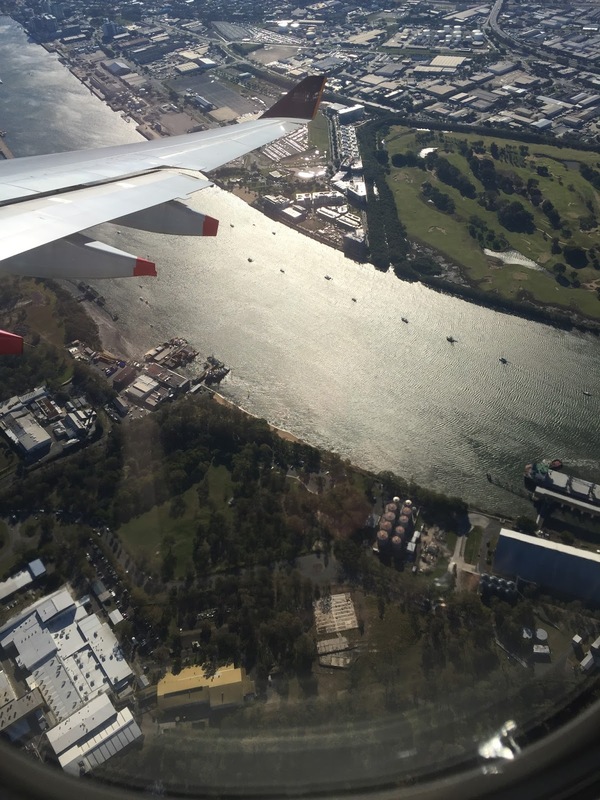 For the SIN-BNE leg, pursuers jumped into action to serve refreshments to the passengers about 30 mins into the flight. 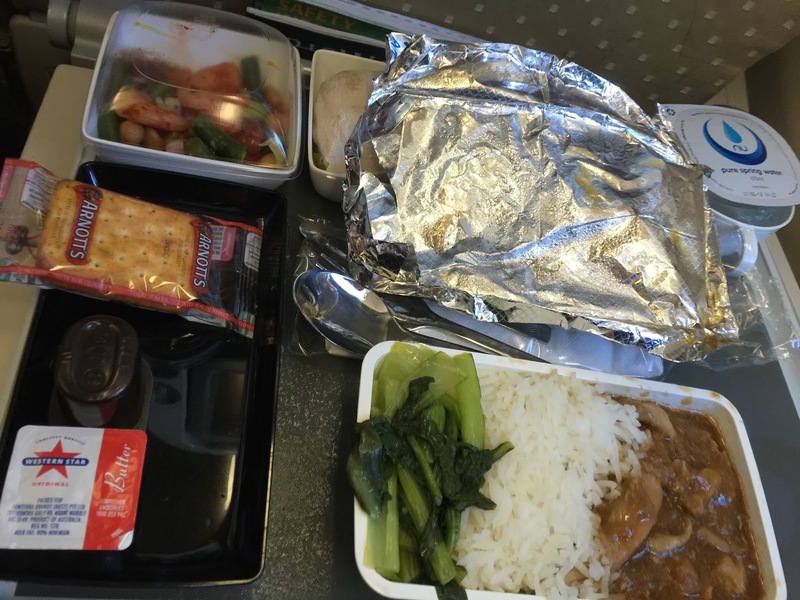 Supper was served about 30 mins further into the flight for passengers to catch maximum rest for the over night flight to Brisbane. 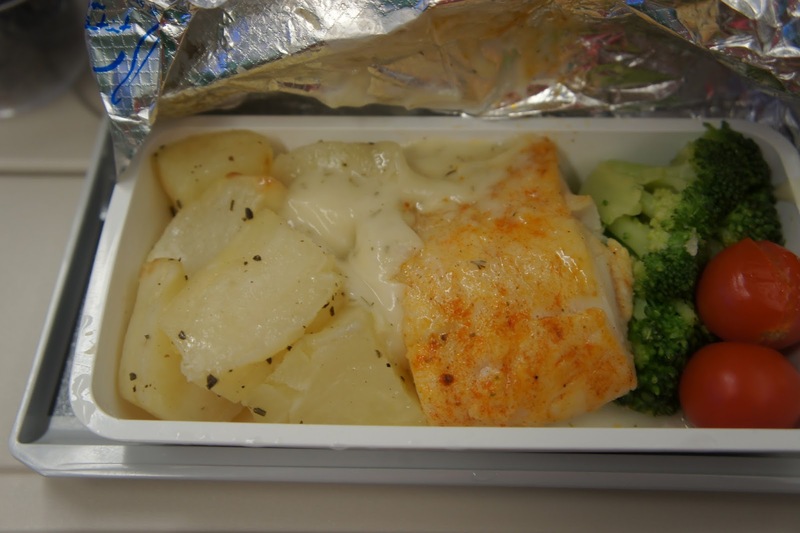 Chicken and fish are in the menu for passengers to choose from. I opted for the fish which is tasty and the fish was well seasoned. 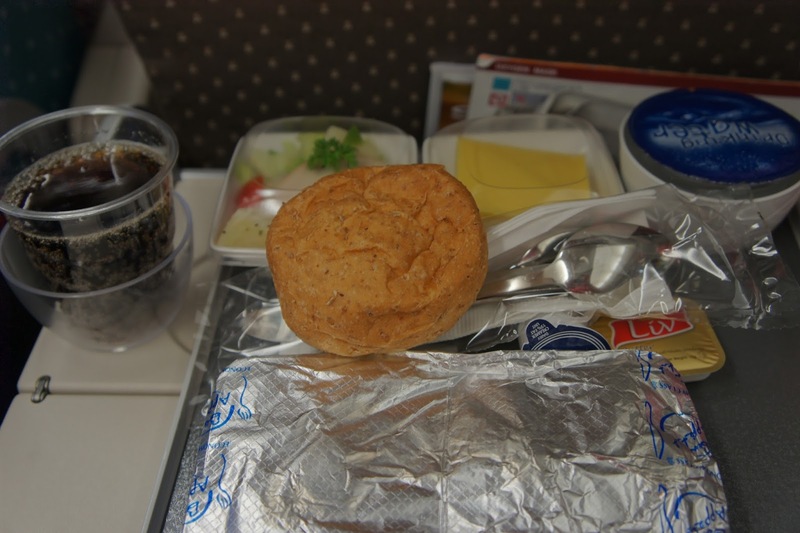 Breakfast, comprising of a bread and a muffin served with coffee or tea, was served about two hours before landing. 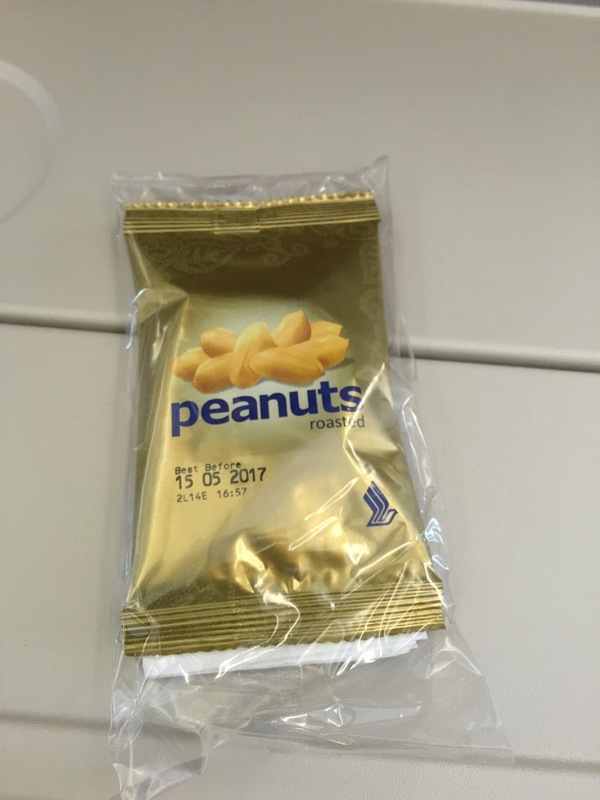 For the BNE-SIN leg, peanut and drinks was served around 45 mins into the flight, followed by lunch about 30 mins later. 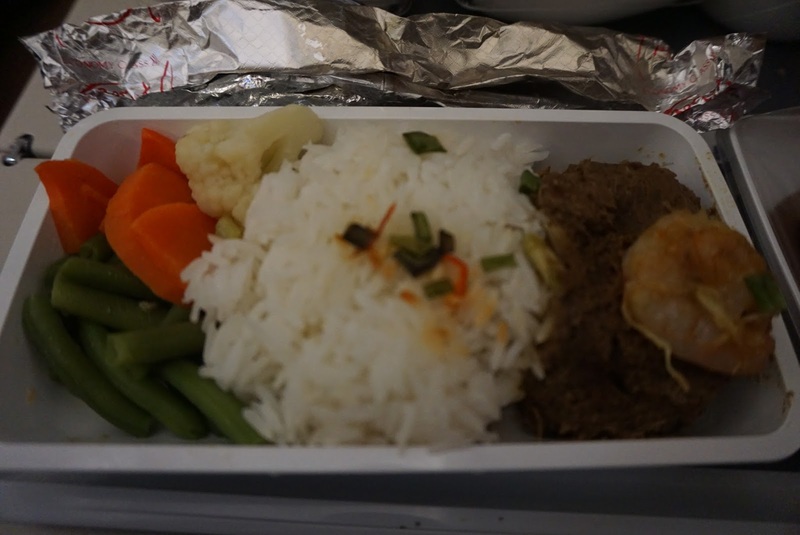 For lunch, passengers are given a choice of chicken with rice or beef with mash potato. I opted for the beef, which is tender and well marinated. The mash potato is well seasoned as well. Perhaps due to my hunger, I found the portion a tad small. 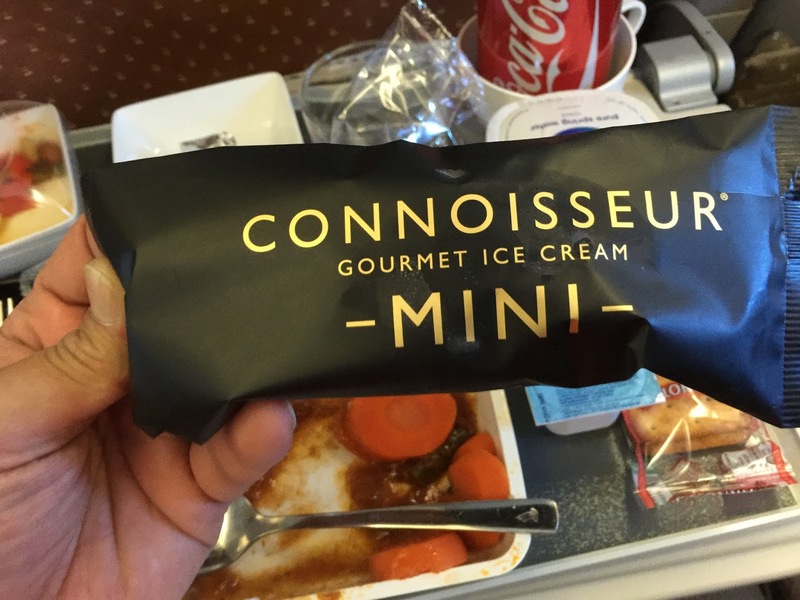 Pursuers distributed ice-cream to passengers 30 mins after distributing lunch. 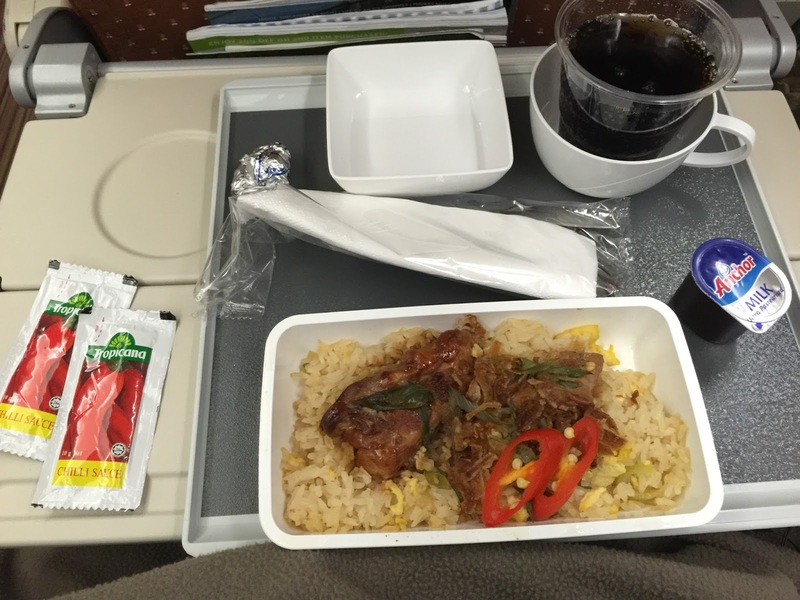 Fried rice with chicken was the only option for pre-arrival meal, which was served about two hours prior to arrival. The fried rice is delicious and the chicken was rather tender. 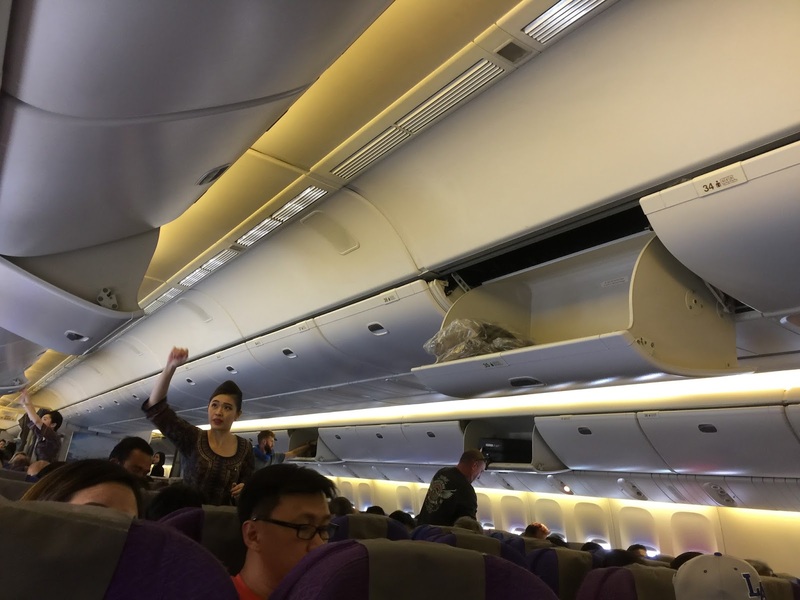 As soon as the seat belt light went off shortly after the aircraft got airborne, the pursuers sprung into action distributing hot towels to passengers in Economy cabin. 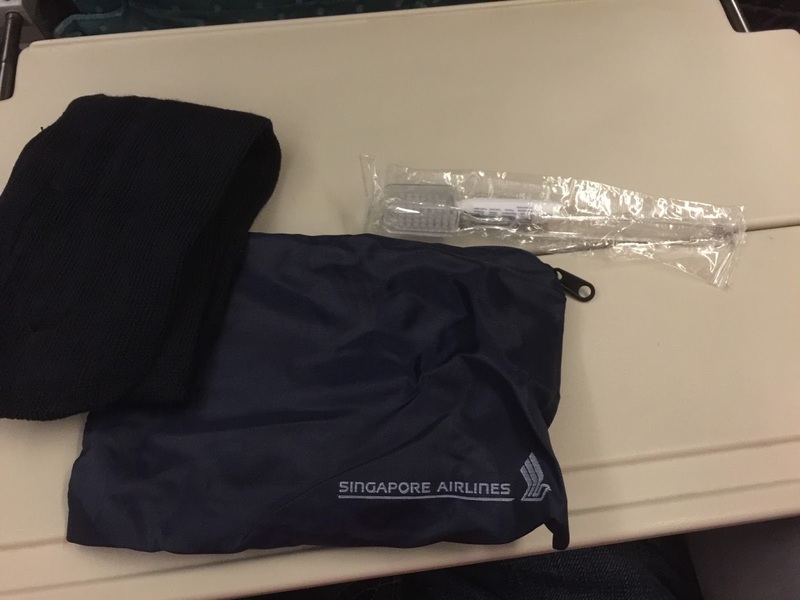 Another staff came distributing amenity kits to all passengers. 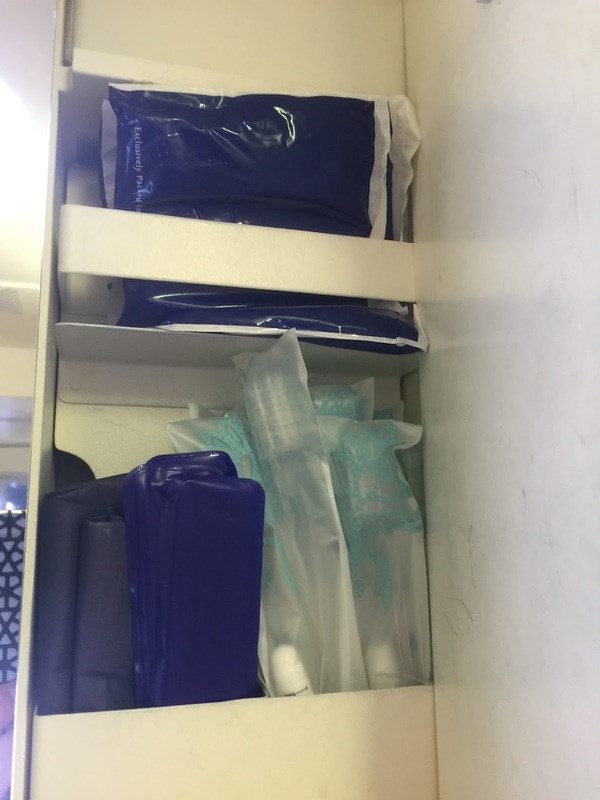 The amenity kits in Economy Class, though not as elaborate as that in Business Class, comprises of socks and toothbrush which is a nice touch to the service onboard. However the good service seem to stop there. 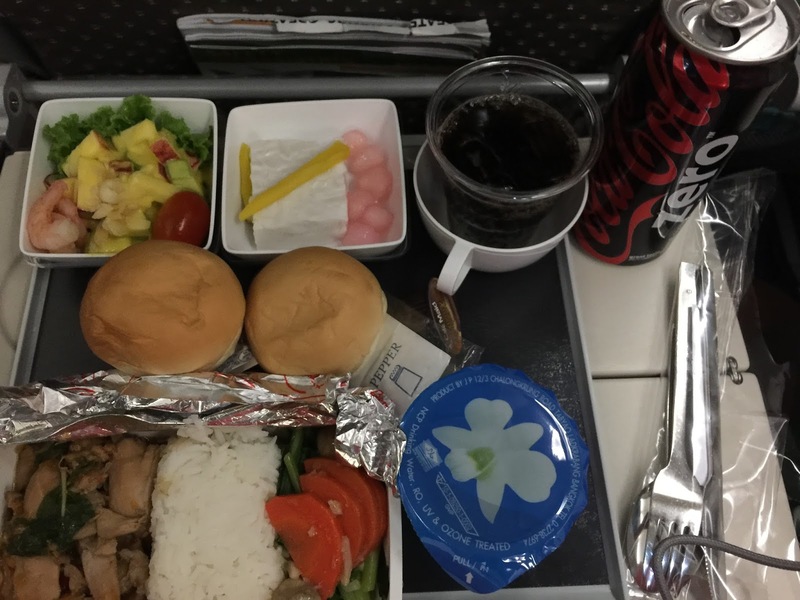 During meal service, I requested a can of coke from the pursuer and was declined by the pursuer, stating that there might not be enough coke to go around for the 8-hour flight. The pursuer gave me half a cup of coke and promised to return to me if there are leftover cokes to go around. No alternatives, such as giving me another cup of coke or offering of alternative drinks were given. 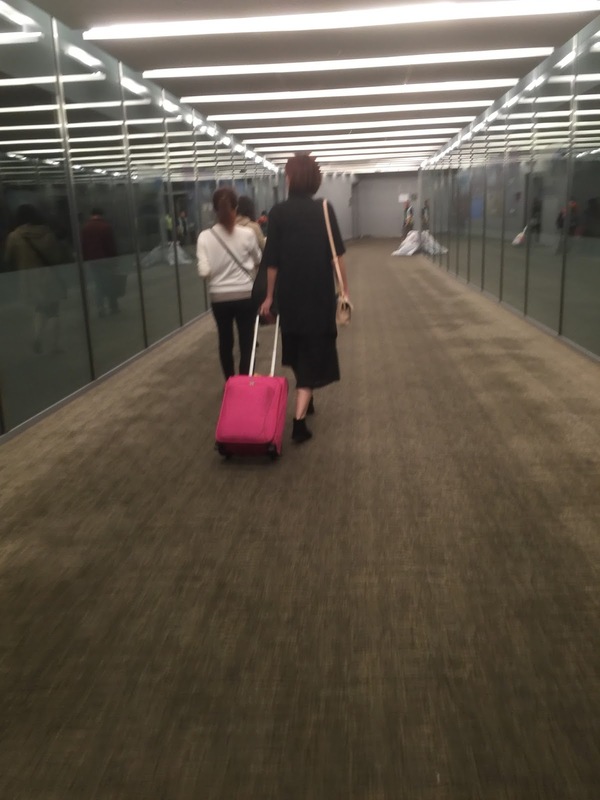 The same pursuer walked by a few times during the flight, but refused any eye contact nor did she got back to me about drinks. 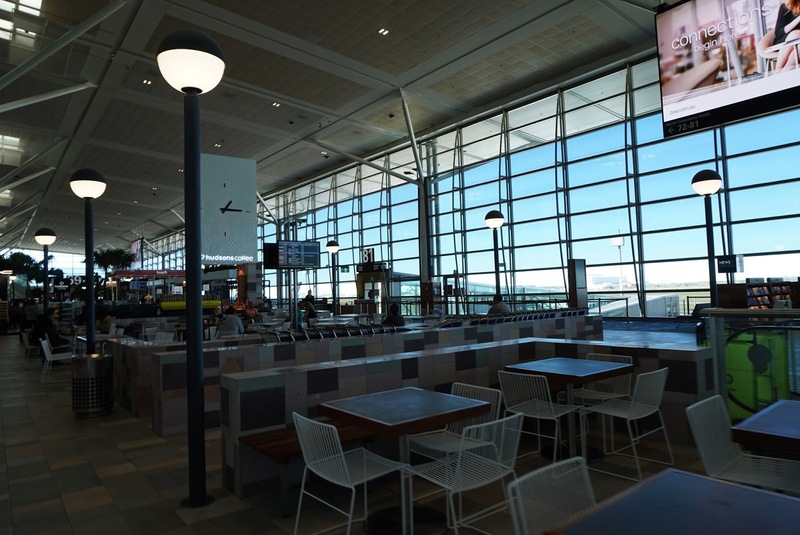 However, the same pursuer was seen serving a Caucasian passenger seated across me three cups of soft drinks (one can of coke pours roughly two cups). The same pursuer was also seen topping up the cups of the said Caucasian passenger’s cup. 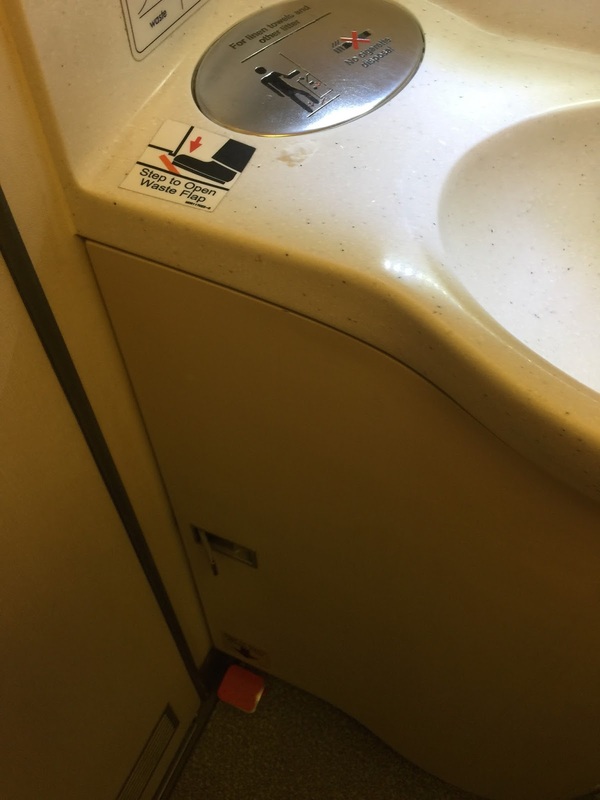 At no point (other than landing), did I see the Caucasian passenger’s cup was empty. I raised my displeasure with the in-flight manager, but was met with a series of defensive excuses. The in-flight manager also resort to playing with words during my conversation with him. I also raised my displeasure for allocated a windowless seat (what’s the point of selecting a window seat without windows?) 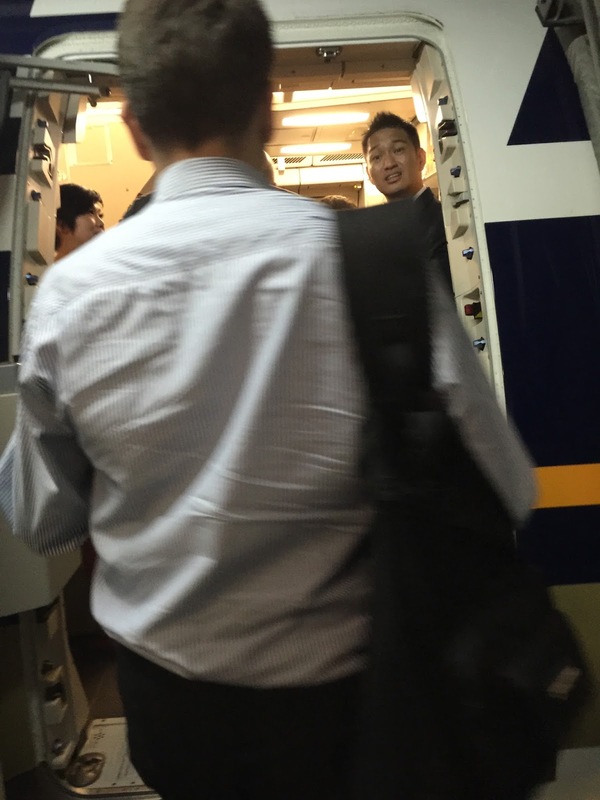 not once but three times to the in-flight manager, but was brushed aside by the manager. 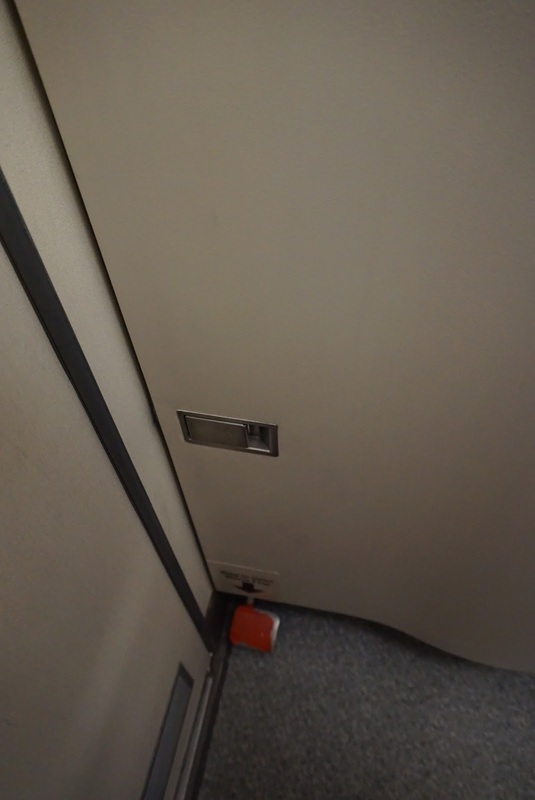 The manager did not even bother to address my displeasure with the windowless seat. 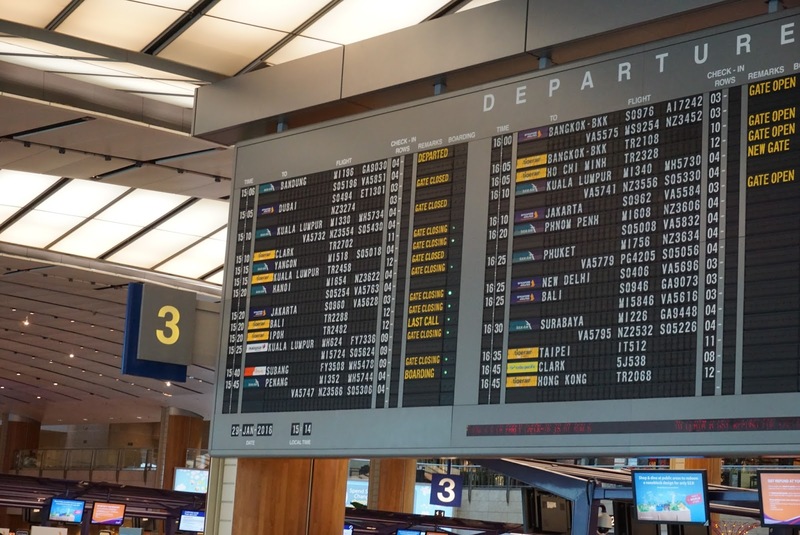 I was deeply disappointed to have received discriminatory service and a in-flight manager who is defensive and brushed aside my concerns, which was not the SQ that many of us has came to know. 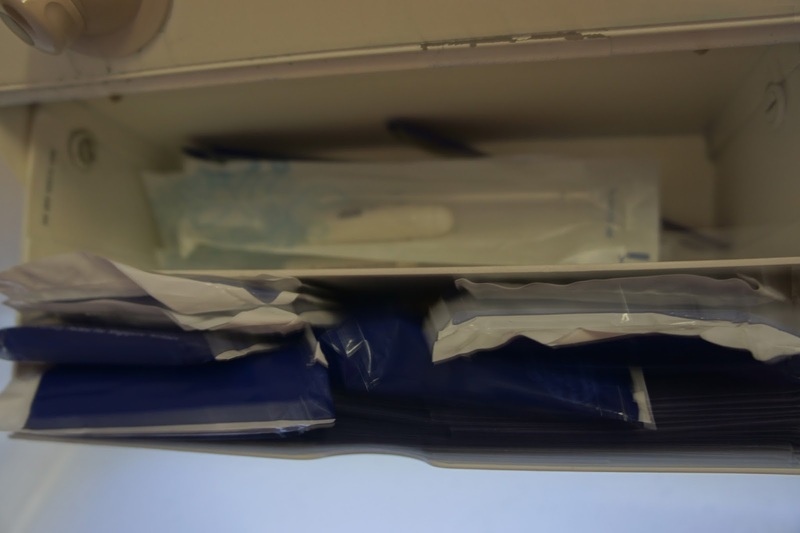 As with the outbound flight, pursuers went around distributing hot towels and amenity kits for a day flight. 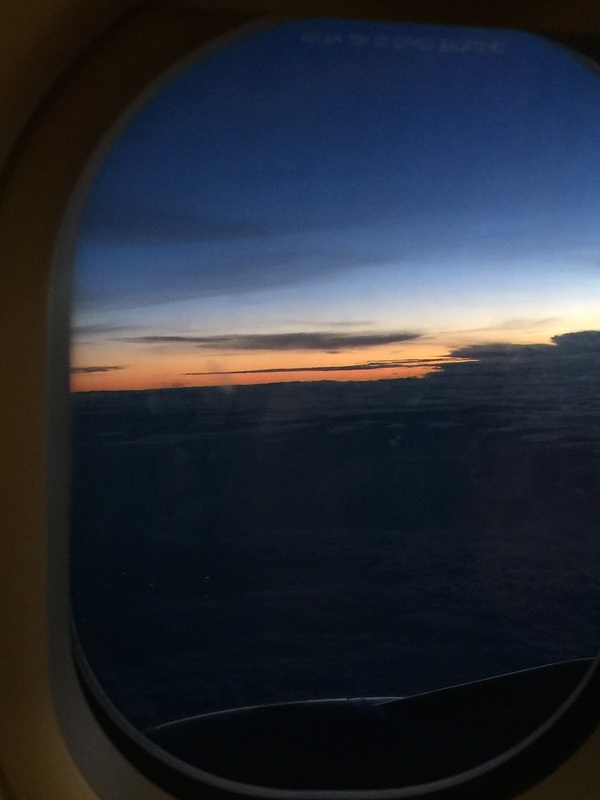 The pursuers were much better in offering service and ensuring passengers feel welcome and are comfortable during the flight. My request for drinks were well met and was offered another round when the pursuers saw my cup being empty. One of the meal option consists beef, as my friend is unable to take beef due to religious reasons, I highlighted my friend’s meal preference and the reason to two pursuers on two occasions to two different pursuers. I was happy that my friend’s meal preference was taken note by both pursuers. 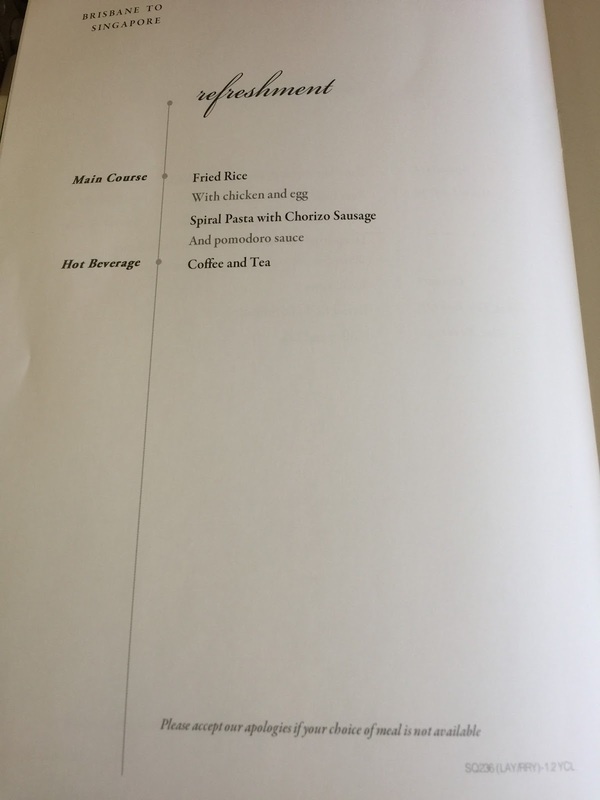 However when meal service came, the same pursuers asked my friend if he wanted chicken or beef. I was shocked to have found out that my friend’s meal preference was not taken into account despite having raised to them twice. Luckily there are sufficient chicken meals to go around and my friend was able to have his meal. 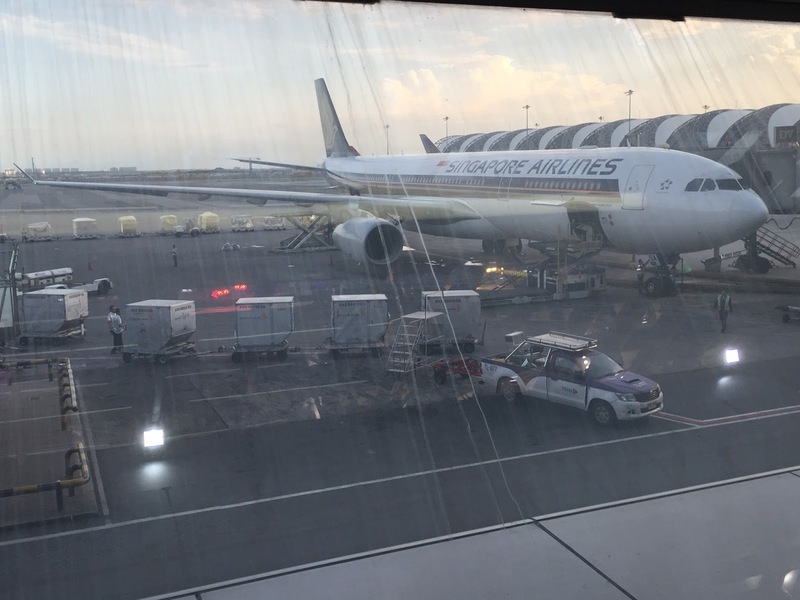 Other than this little hiccup, the service onboard is generally good with pursuers frequently seen patrolling the cabin and responded to passengers’ requests swiftly. 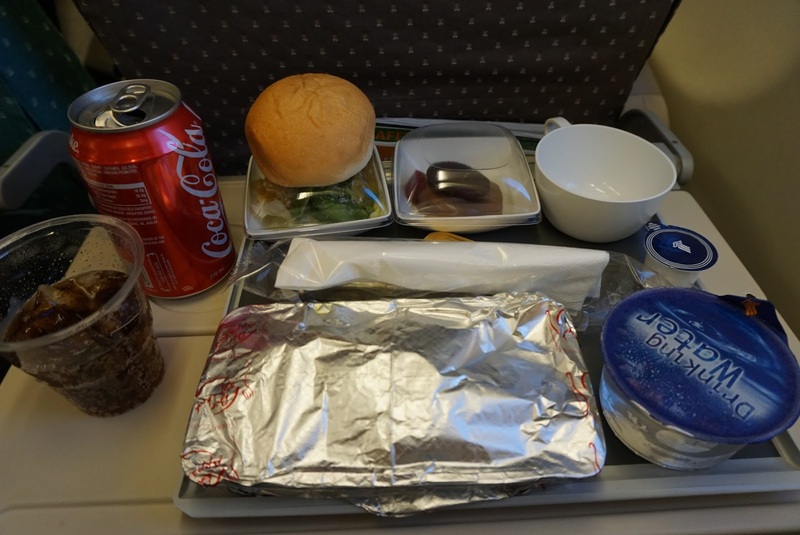 Meal service was completed efficiently and passengers were given ample time to finish their meals. Trays were collected swiftly as well. 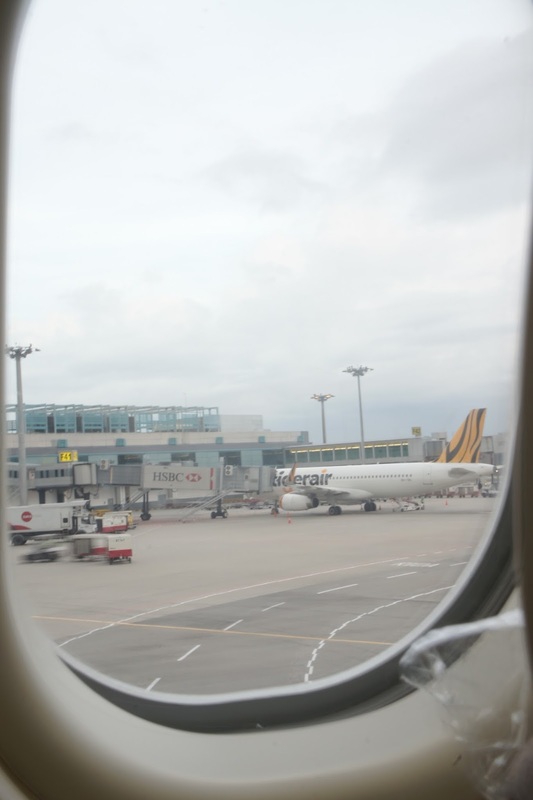 Compared to SQ255, service onboard SQ236 were much better, befitting of the service that SQ has came to known. 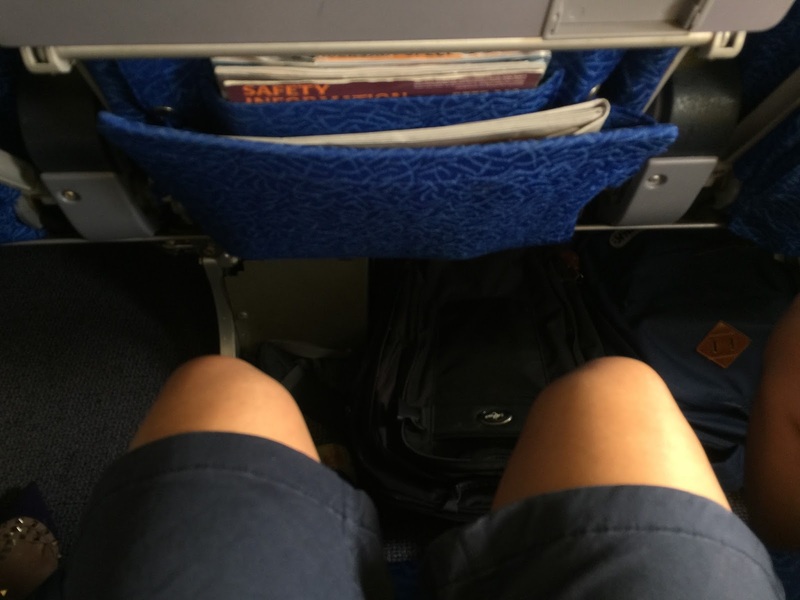 Both legs of the flight were comfortable, despite the outbound flight seem aged. 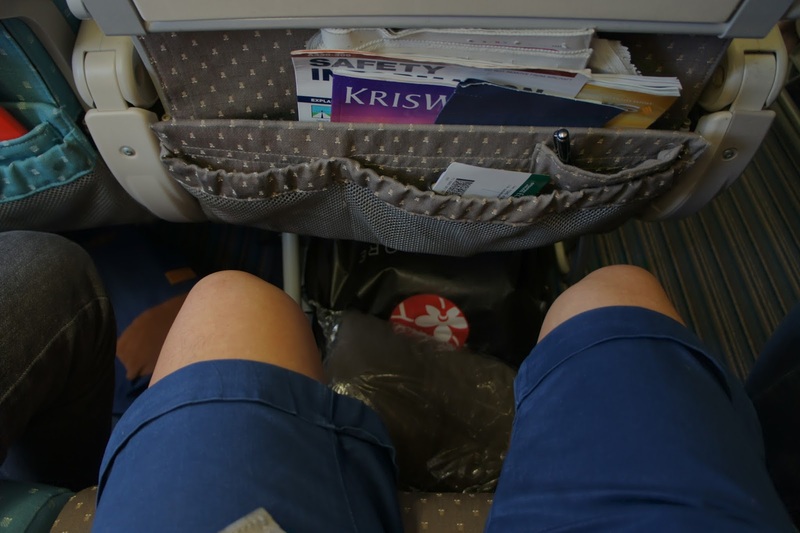 Legroom was superb in Economy Class and the lavatories are well stocked with amenities. 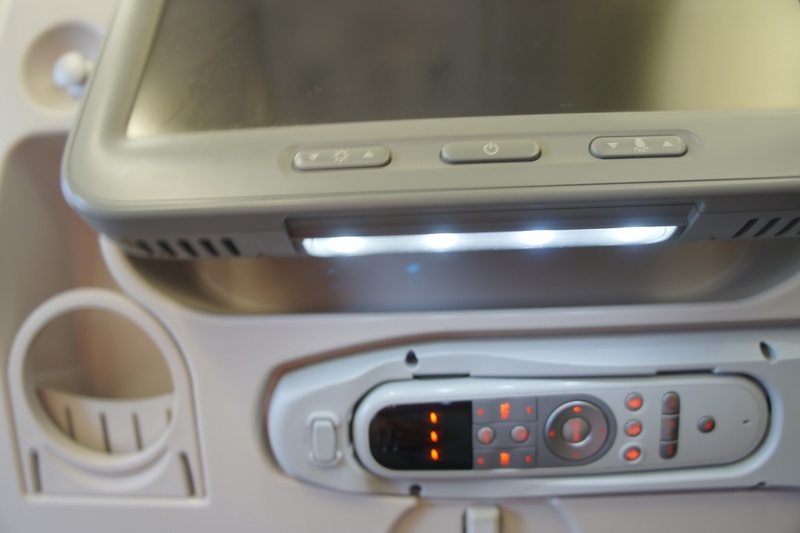 The IFE great in keeping passengers entertained throughout the 8-hour flight time. 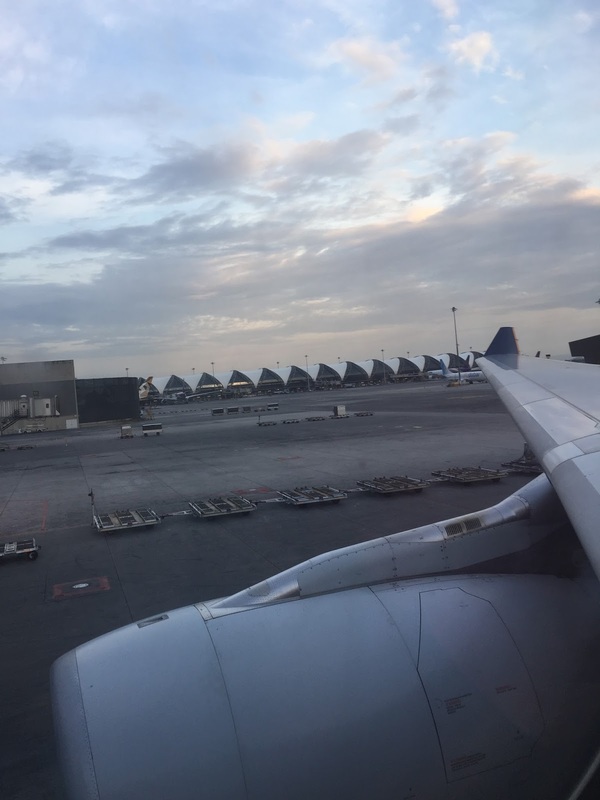 Service was a mix, where I experienced discriminatory service and pursuers as well as in-flight manager whom couldn’t care less about providing equal service to their Asian passengers as compared to the Caucasian passengers. 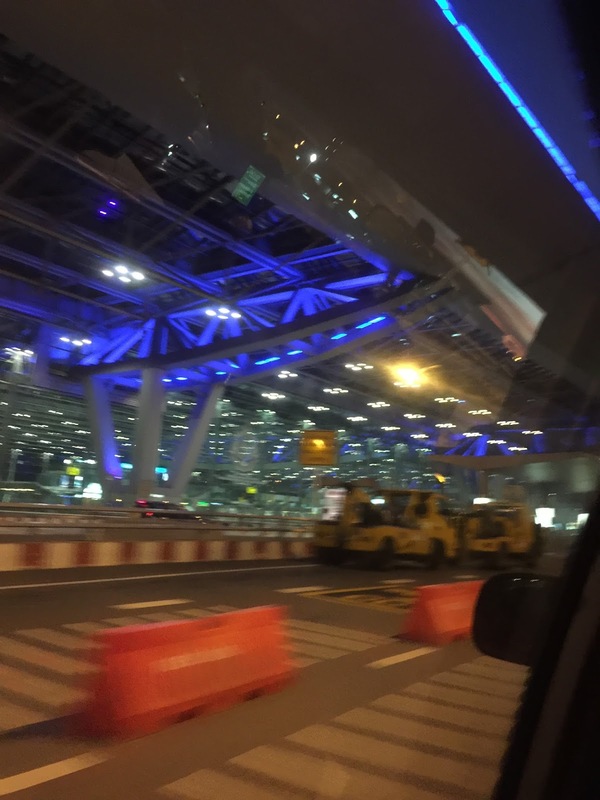 The service for the inbound flight was way better than that of the outbound flight, which is the warm and attentive service that SQ has came to know. 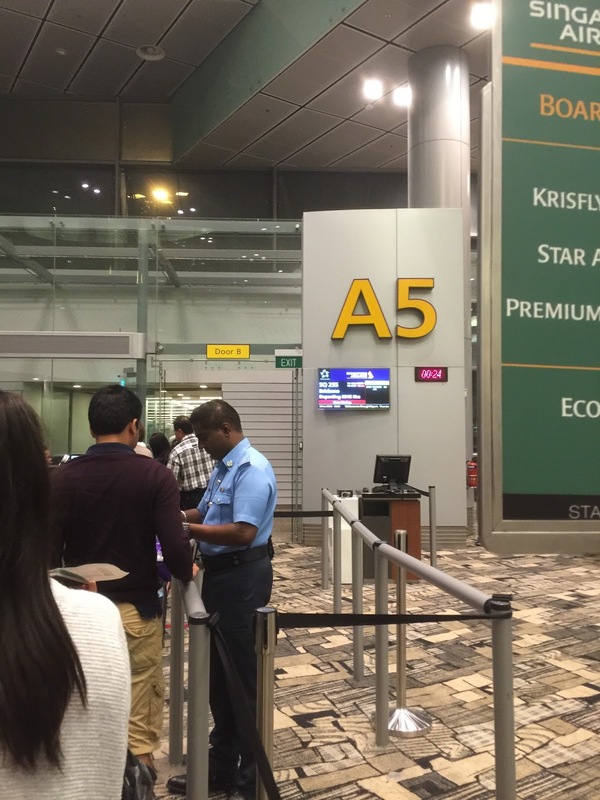 My outbound flight experience of discrimination was not the first time that I had experienced onboard SQ. 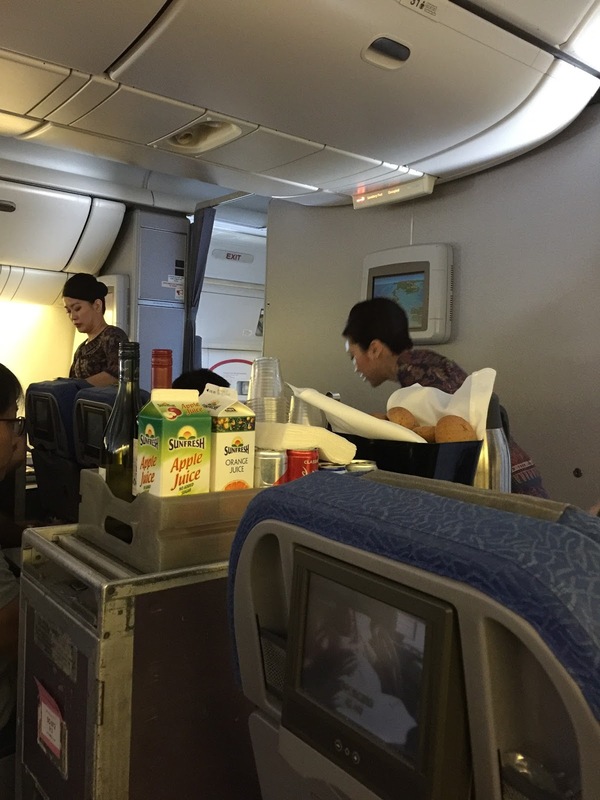 I also experienced similar discrimination during my flight to Bali onboard SQ some five months ago in Jan 16. 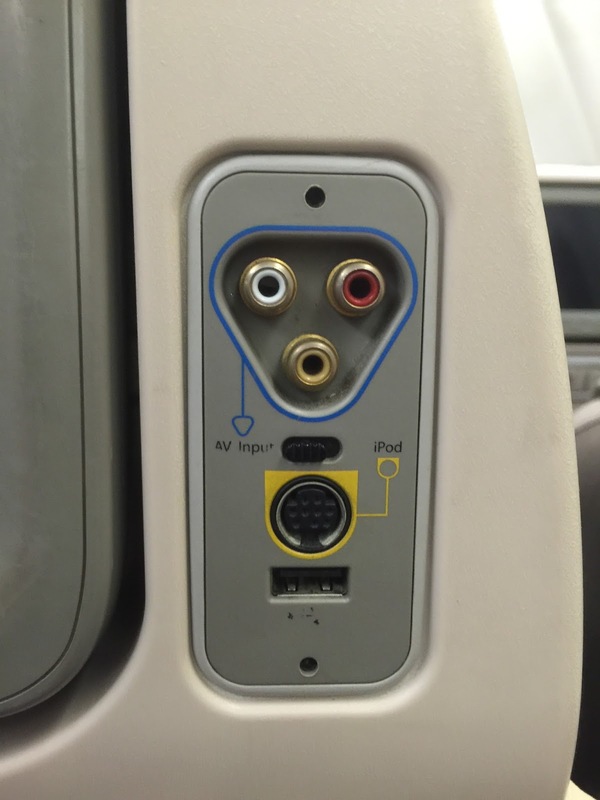 These has enough to put me off flying onboard SQ. 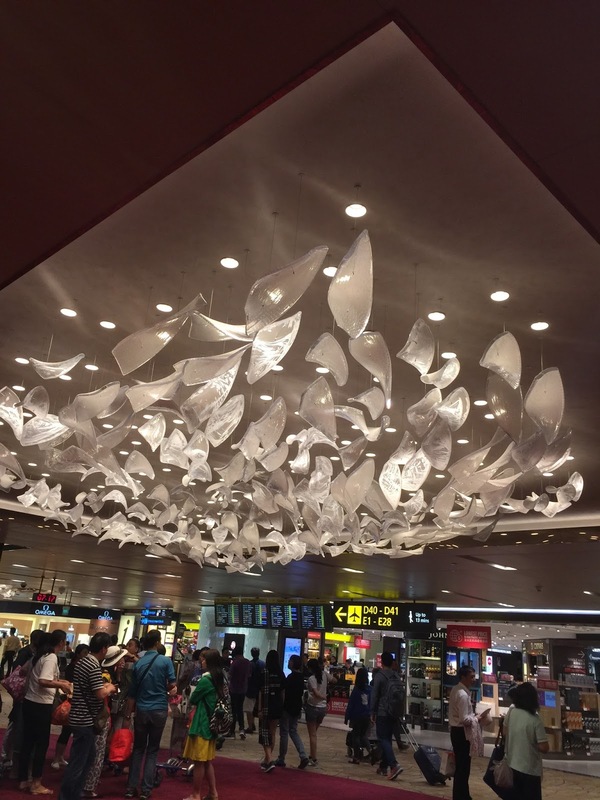 If not for my paid booking for a trip to Taipei later part of the year, I would NOT have chosen SQ again. 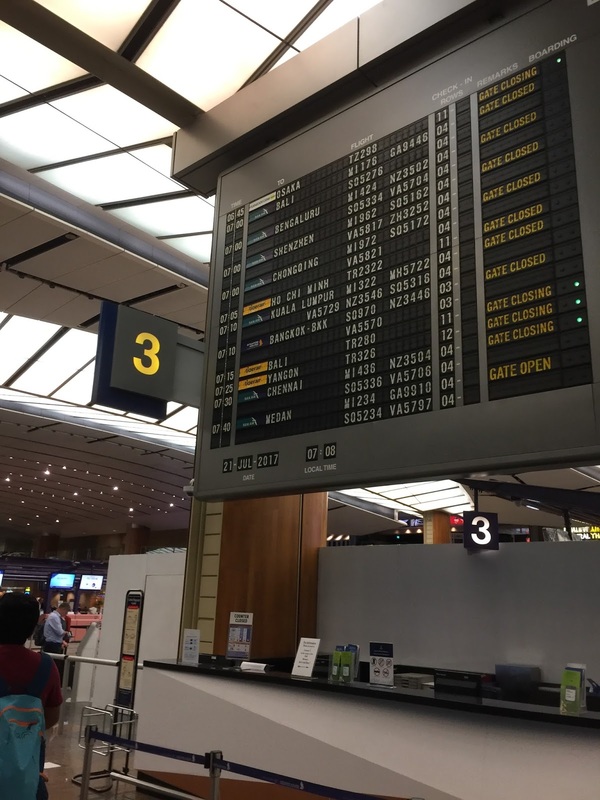 My Nov flight with SQ will be my last time with SQ! 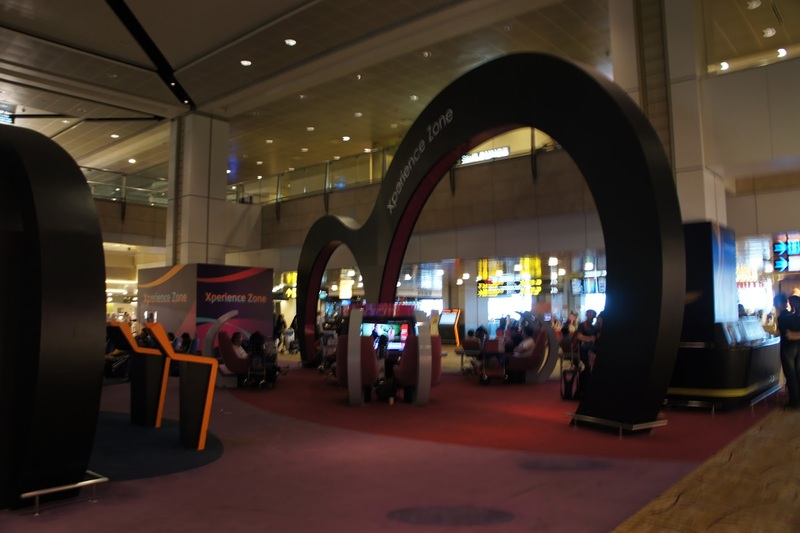 SQ uses both terminal 2 and 3 in Singapore Changi Airport for its outbound flights to anywhere else in the world. 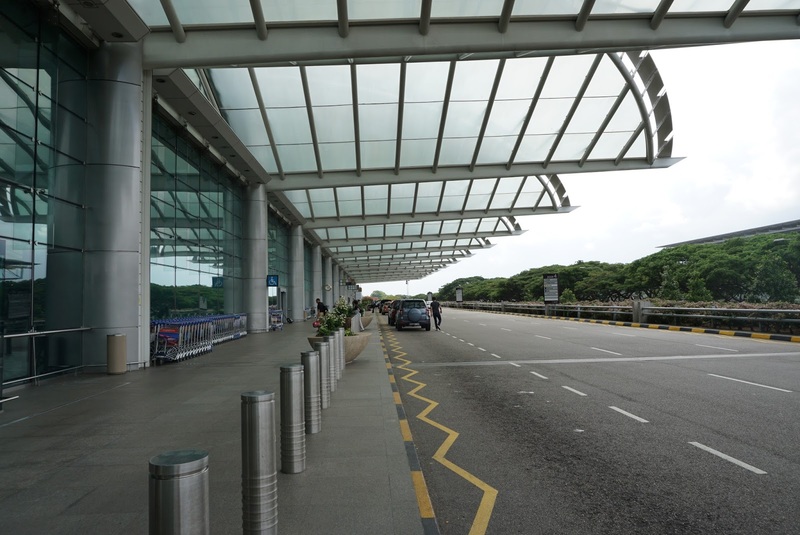 SQ uses Terminal 2 for regional flights and Terminal for outbound flights to anywhere else in the world. 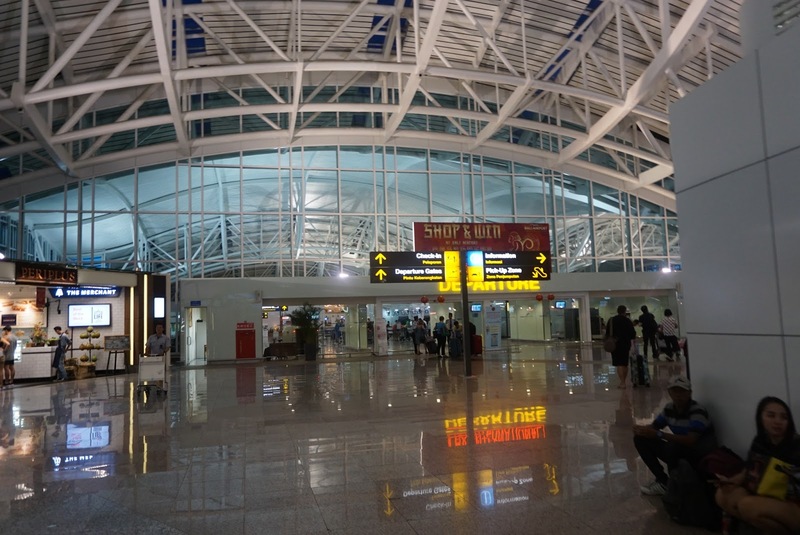 The flight bound for Bali departs from Terminal 2. 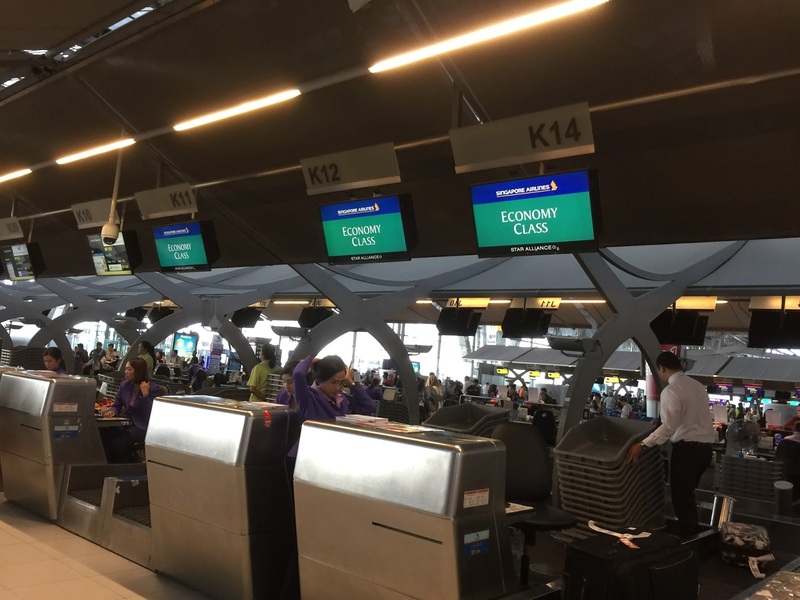 There are several dedicated rows for SQ in the terminal, mainly rows 1 – 4. 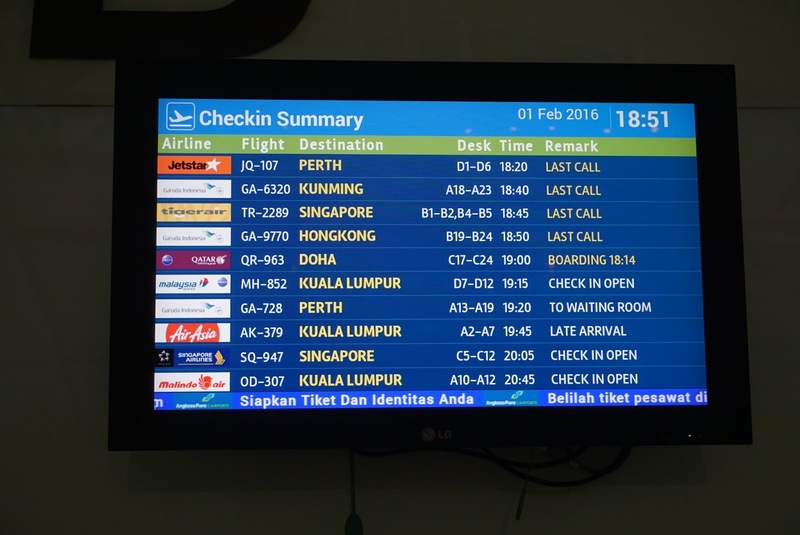 Row 3 is dedicated to passengers whom has checked in online flying to anywhere in the region. 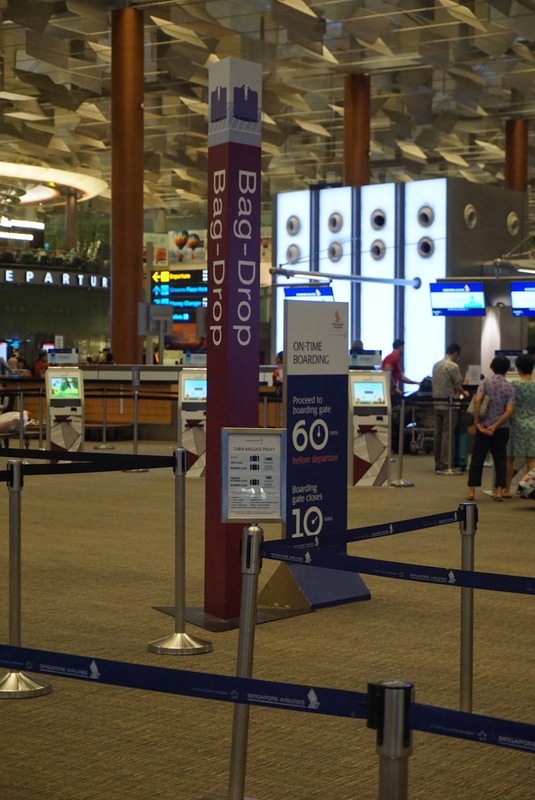 As we had done our check in online, this row is where we drop our luggage. 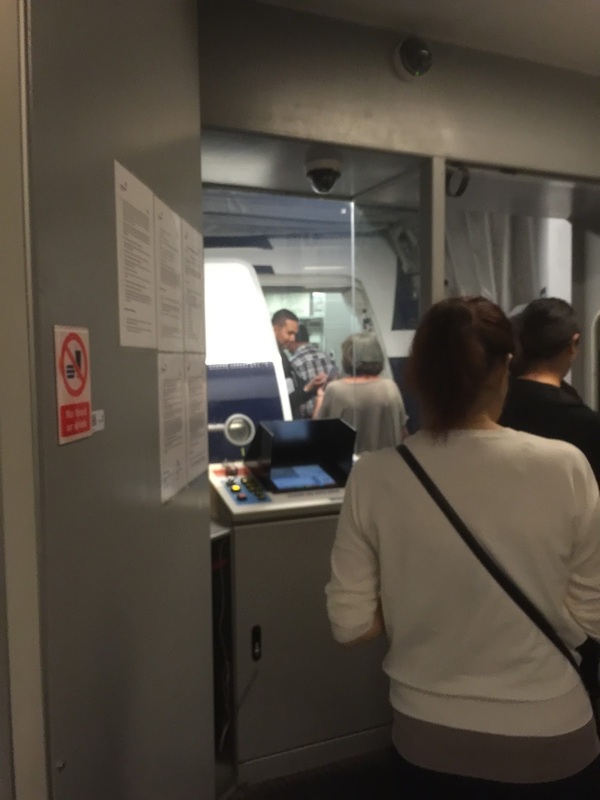 There are 2 sections to this section, one for drop off of luggage for passengers who prefers to print their own boarding pass and tag their luggage at the machines outside the queue in the row. 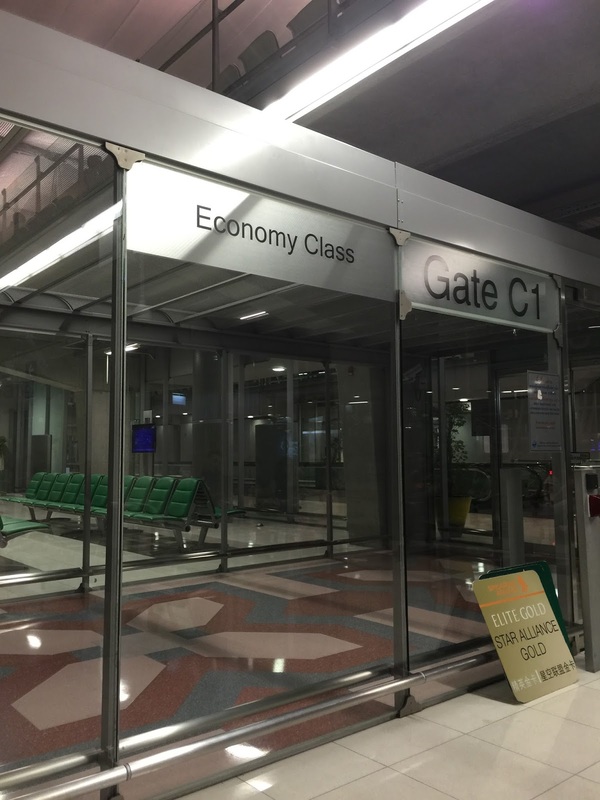 The other section is for passengers who prefer to have a ground staff checking their luggage in. We opted for the assistance in checking in. As the queue were pretty short, we got checked in pretty swiftly be the ground staff. 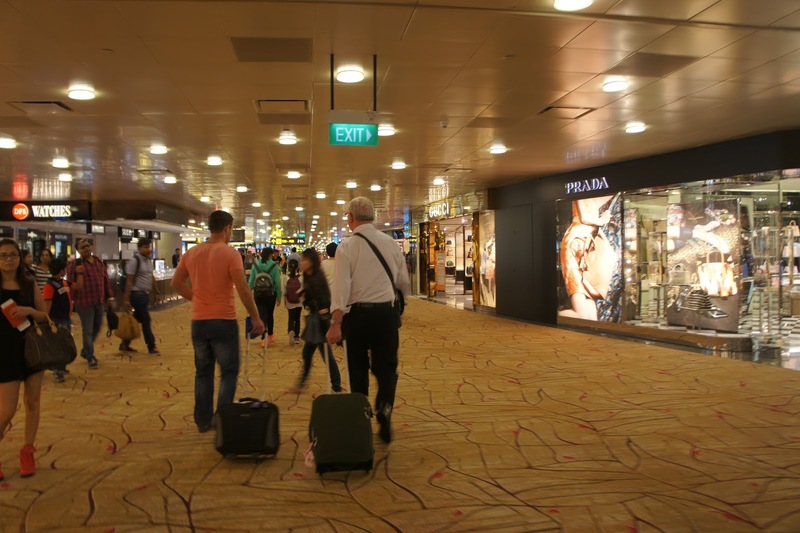 Changi Airport airside is like a shopping mall. 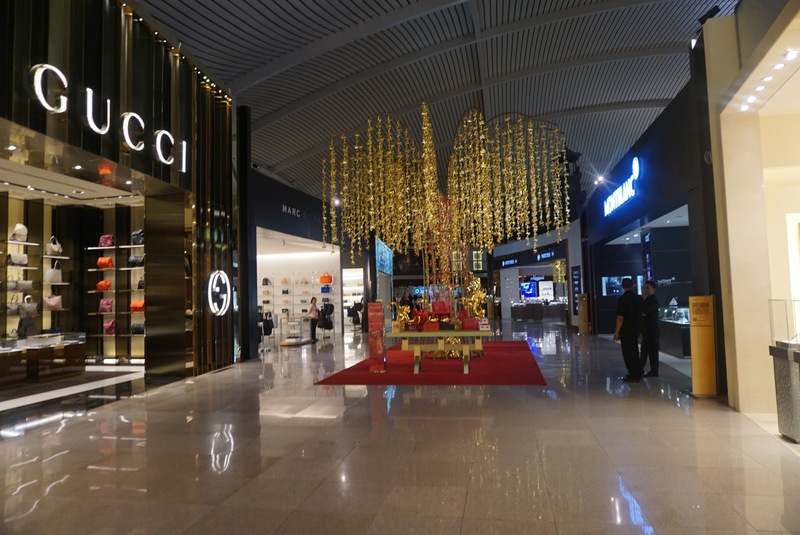 There are no lack of shopping from luxury brands to the more affordable range brands. 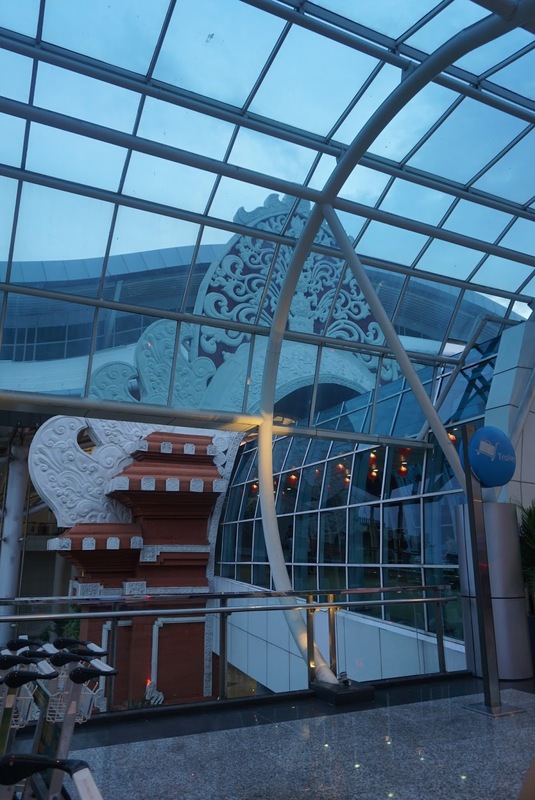 There are several gardens around the airport spread across 3 terminals as well as cinemas and rest areas. 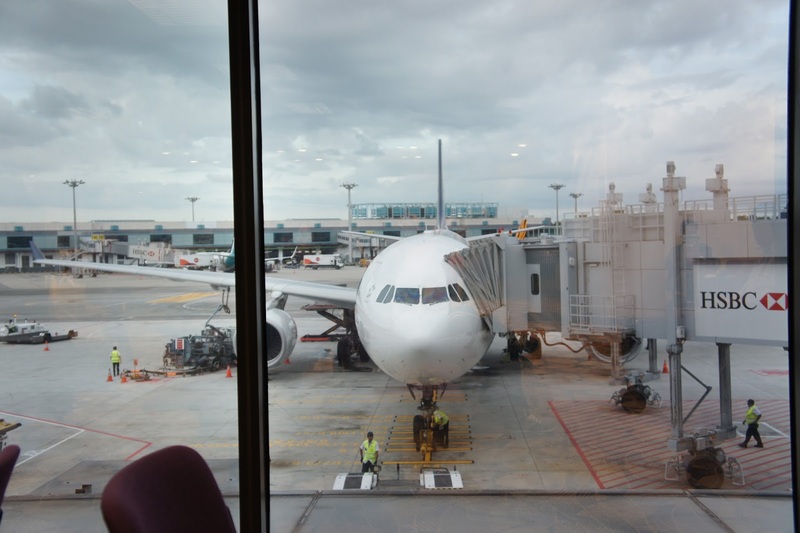 Most of the rest areas are facing the tarmac for passengers to rest and do some plane watch while waiting for their flights. 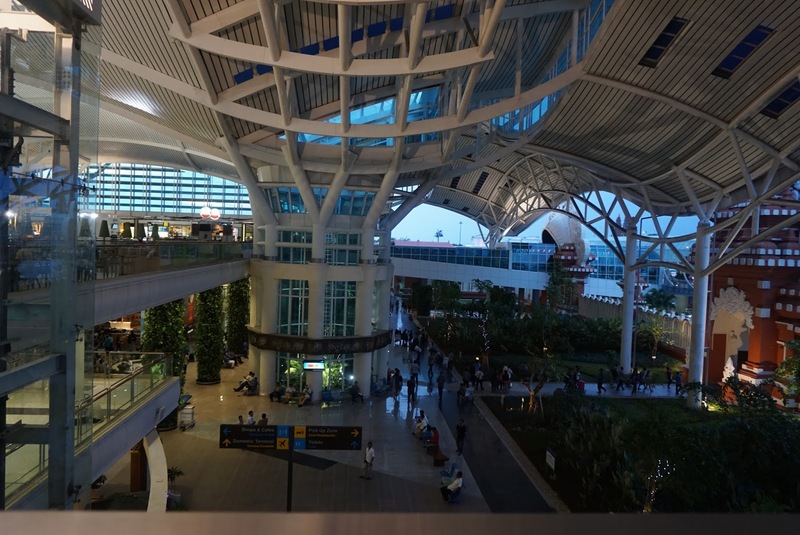 The new Denpasar International Airport was opened in 2013. The terminal building still looks new despite being about 3 years old. 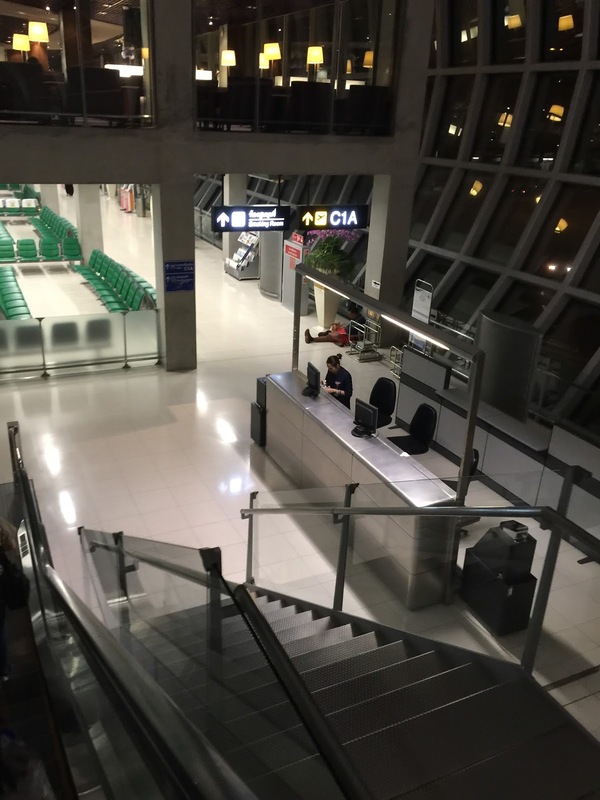 To gain access into the terminal building, security personnel matched the tickets of passengers with their passport. 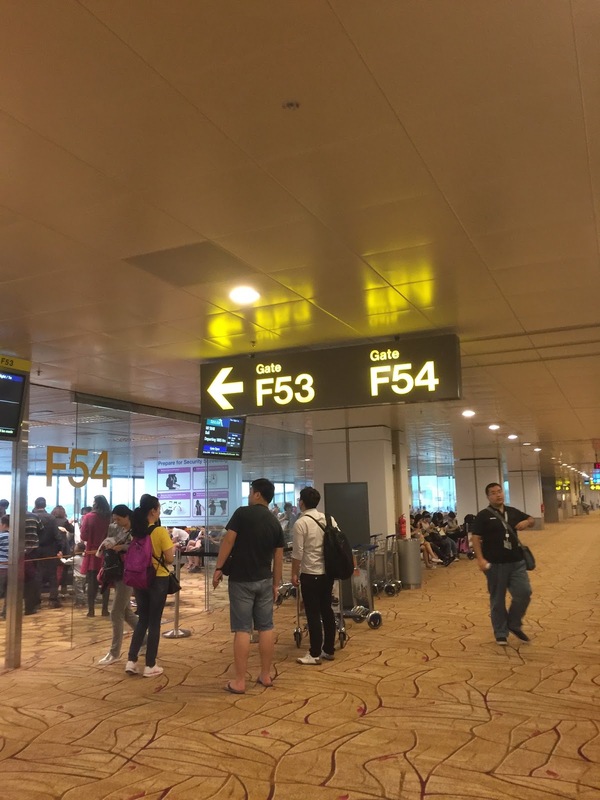 SQ uses half of Row C (C5 to C12) for their passengers flying out of DPS. 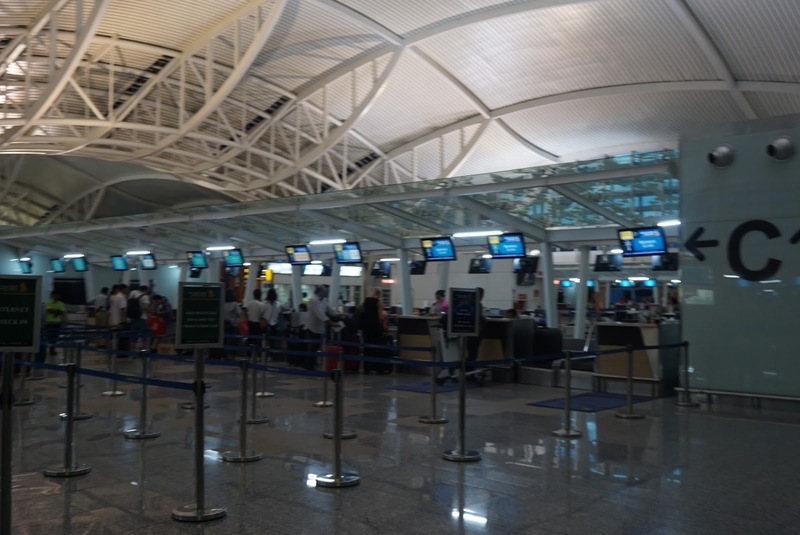 3 counters are dedicated to Business Class passengers and 2 counter are dedicated to passengers whom have done their check in online. As we were early for our flight, there is no one in the queue and we did not have to wait for our turn. 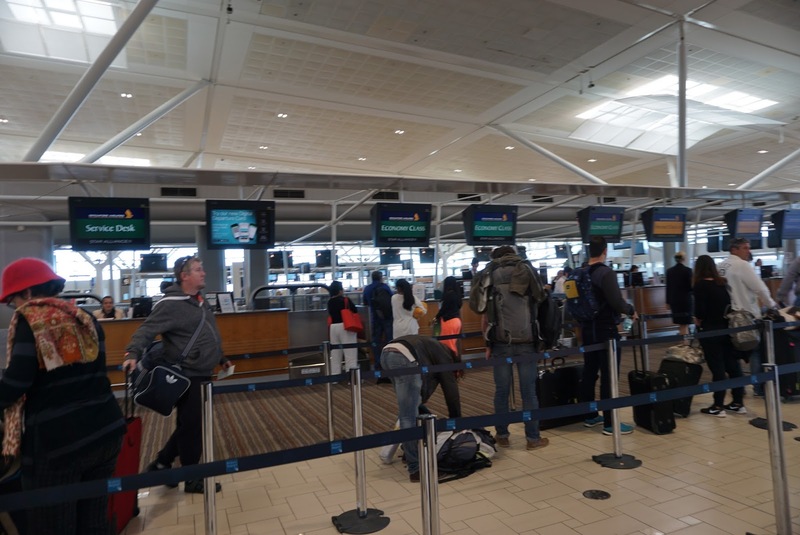 The ground staff at the counter acknowledges our online check in and process our check in very quickly and briefed us on our boarding time and gate number. 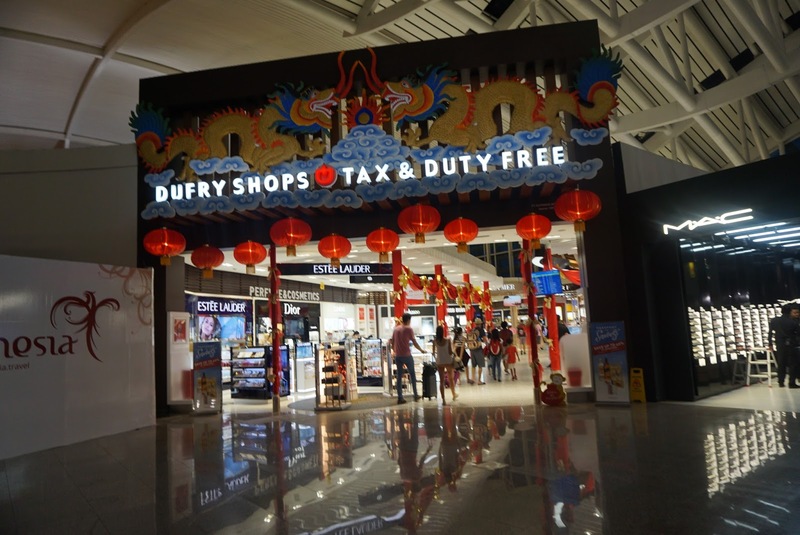 Once cleared immigration, passengers are made to walk through duty free shop before arriving at a part of the airside where one can find duty free shopping. 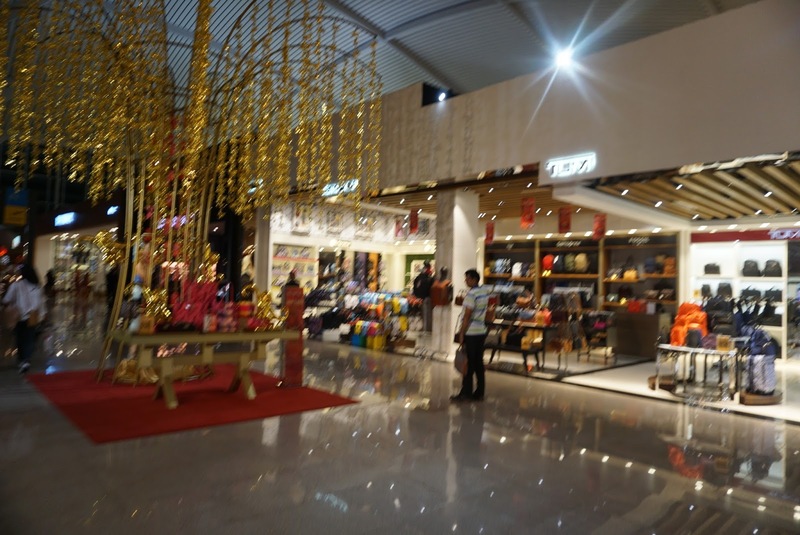 There are some luxury brand shops and mostly shops selling overpriced Balinese souvenirs. 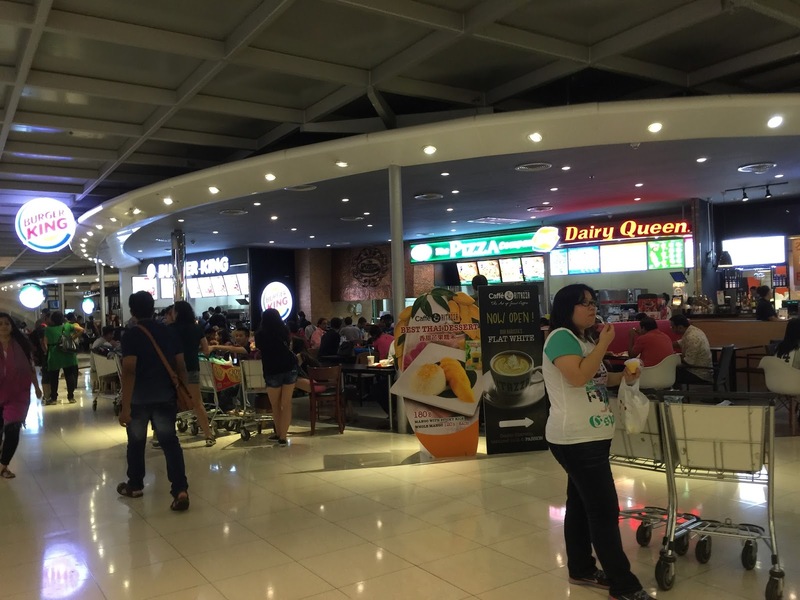 There are limited eateries around in the airside of the terminal.I particularly liked the queue system of Economy Class in DPS airport. 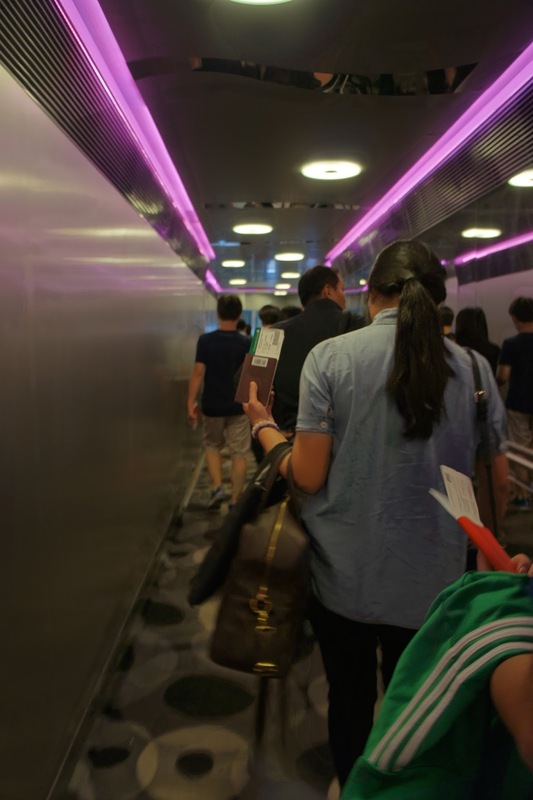 Passengers are grouped by row numbers and there are lanes for passengers to queue up according to the group they are assigned to. 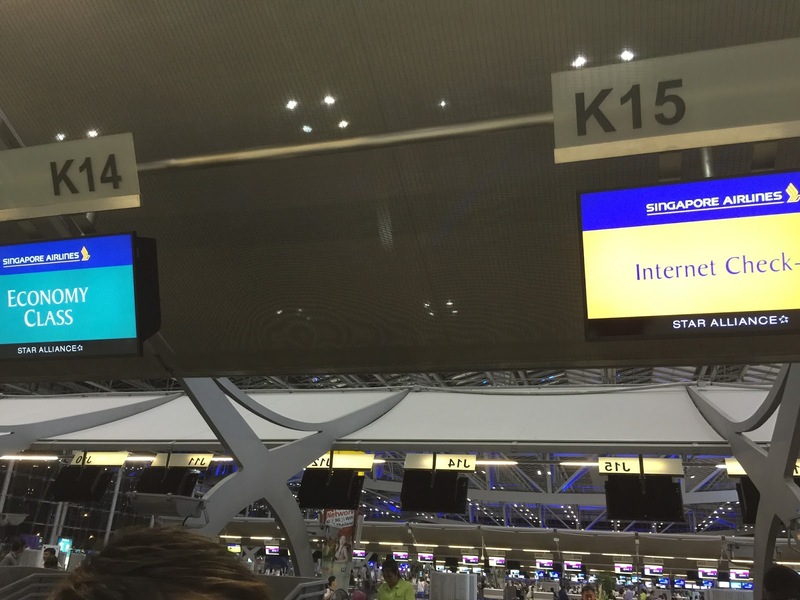 This makes boarding very efficient and boarding queue seem shorter. 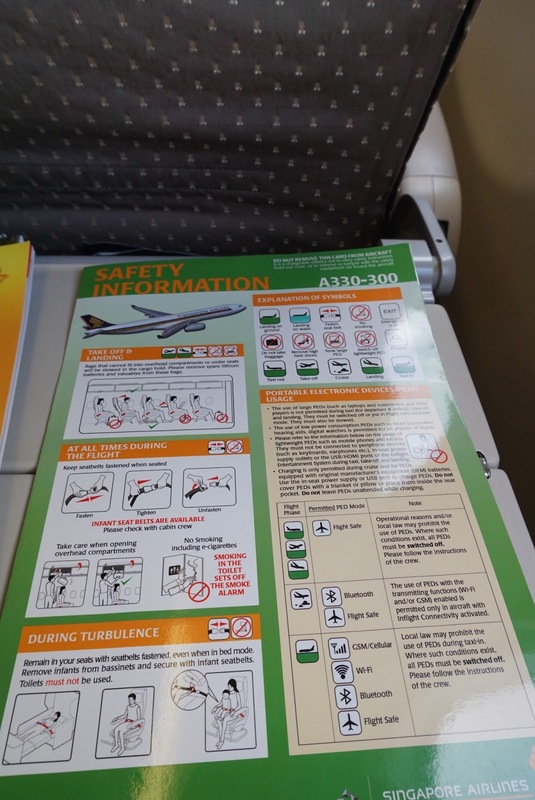 SQ uses A330-300 for both legs of the flight plying between SIN and DPS. 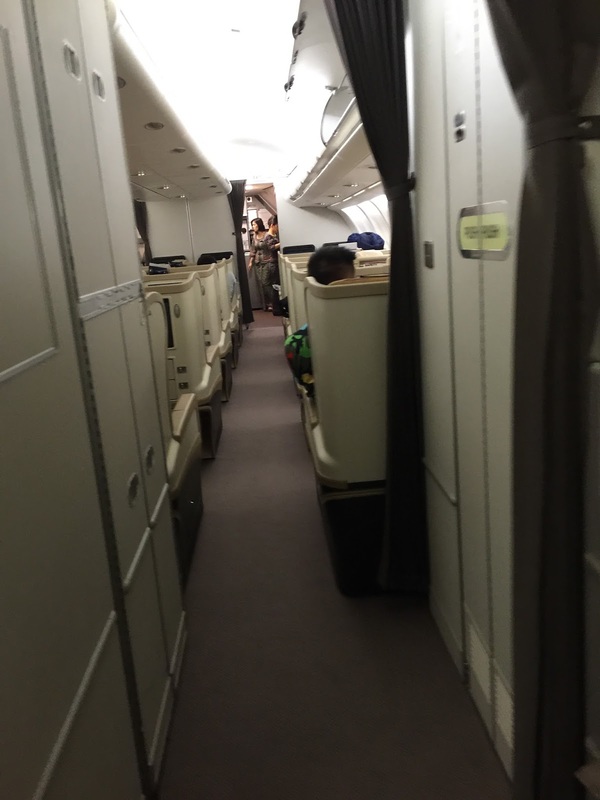 The aircraft is configured to take up 30 passengers in Business Class and 255 in Economy Class. 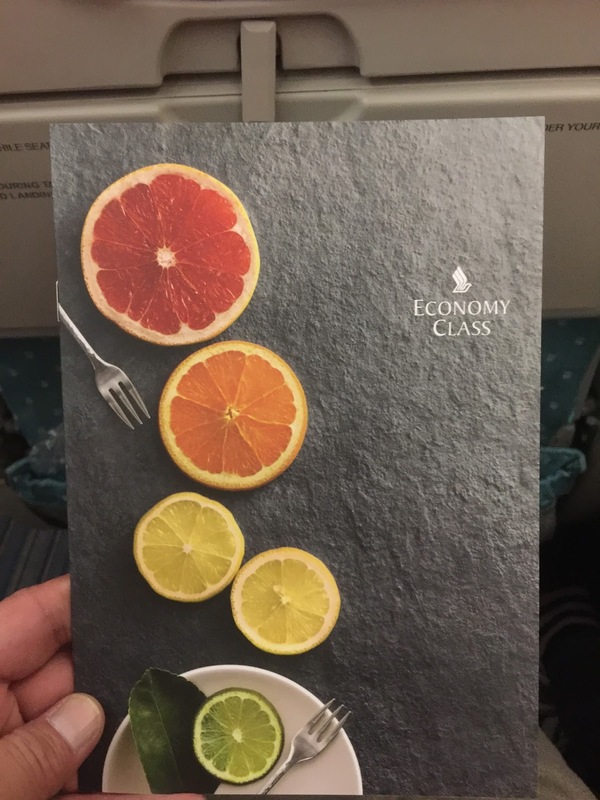 The Economy class is further divided into 2 sections, each with its own colour theme. 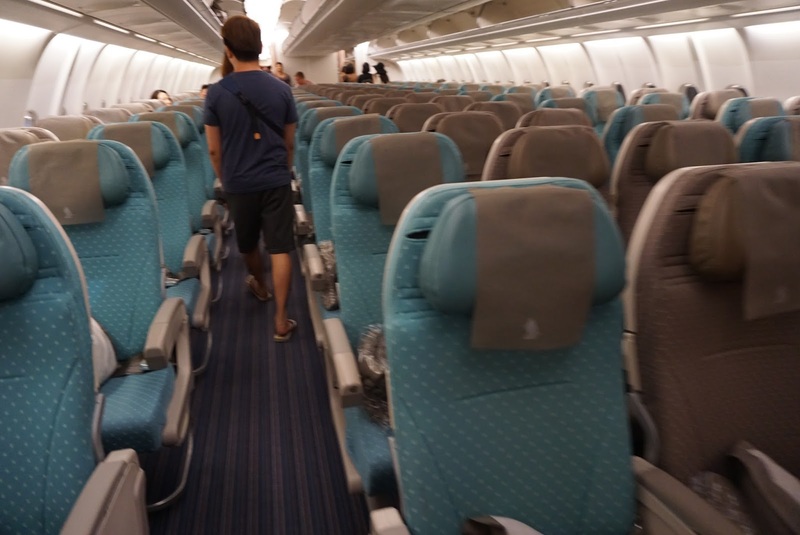 The forward section of Economy Class has a brighter theme, attributed to the use of turquoise colour in the seat with light brown. 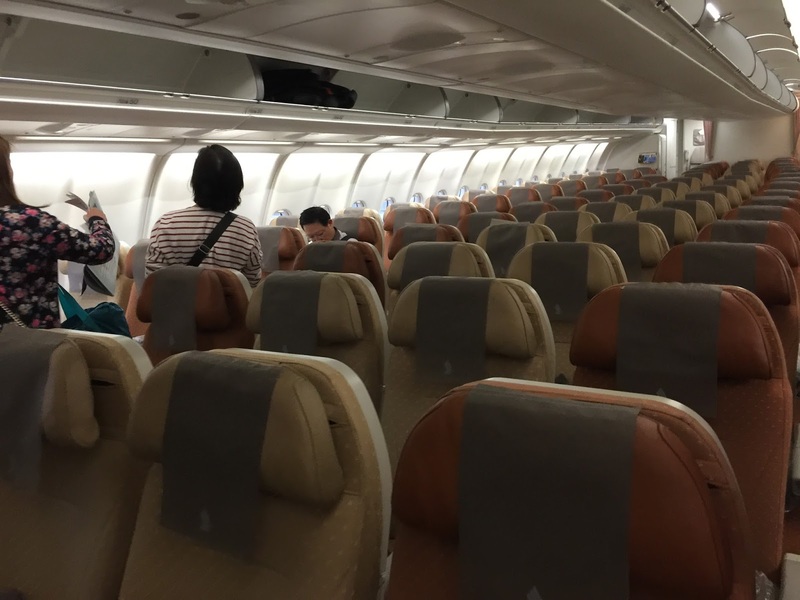 The aft section of Economy Class is decked in beige and dark orange seats. The forward gives passengers a lighter and brighter feel, while the aft section gives passengers a more warm and cosy feel. 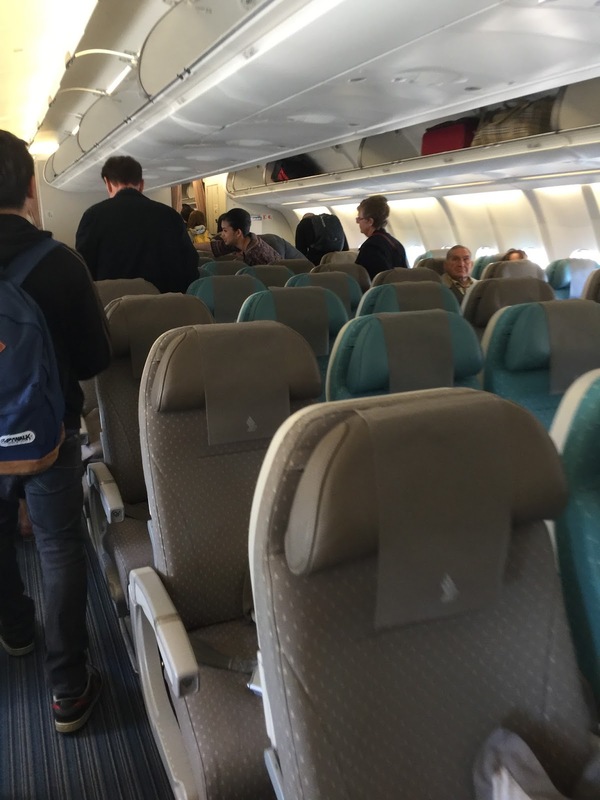 Economy Class is configured with 2-4-2 seating arrangement. 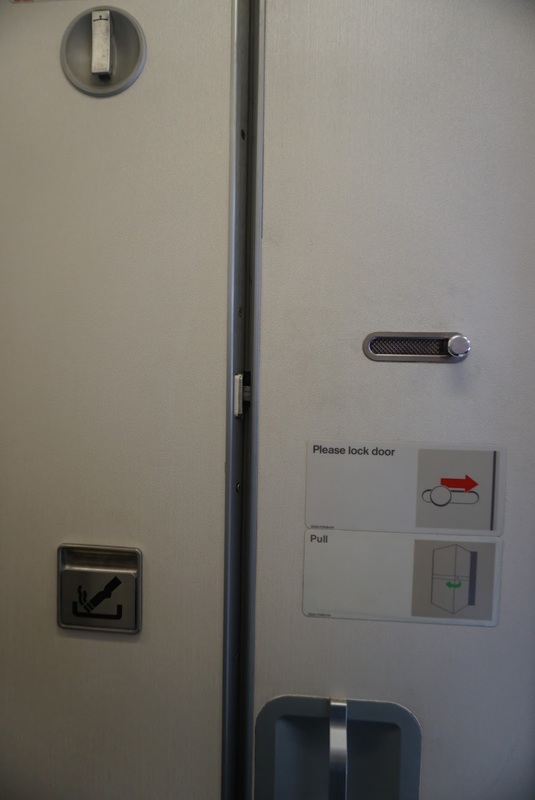 The lavatory in Economy Class is rather standard. 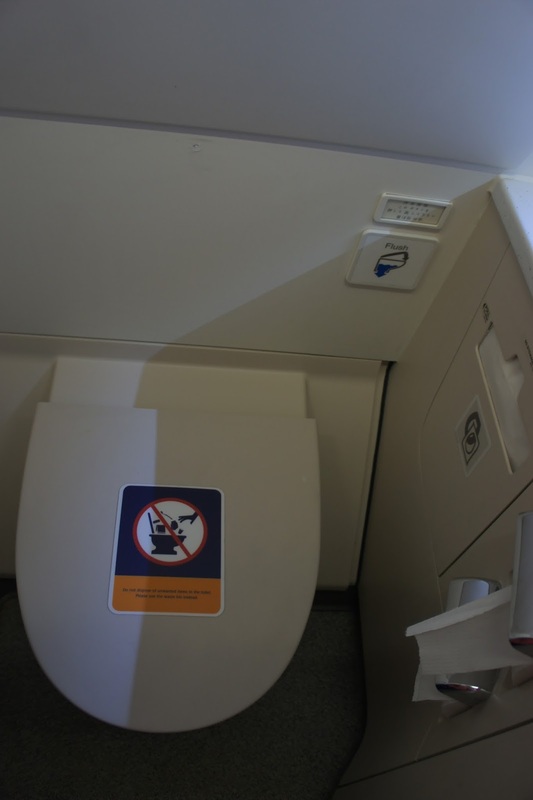 As with most airlines, the lavatory in Economy Class tend to be a tad cramp. 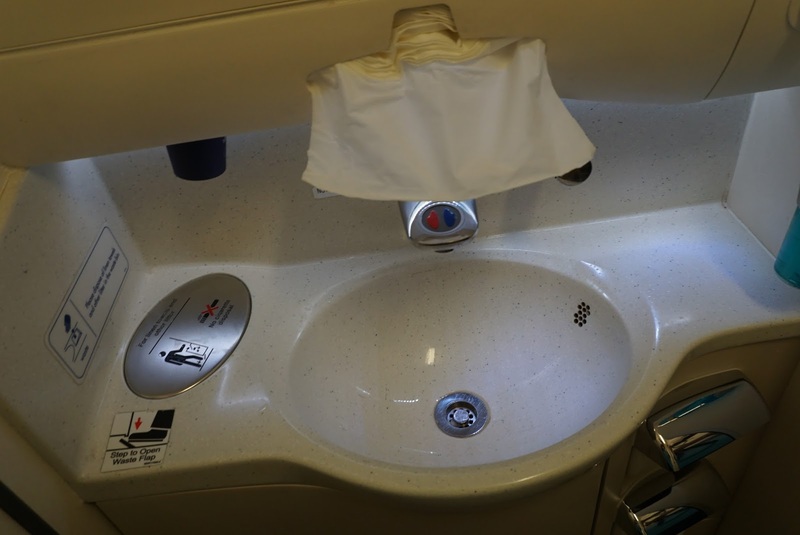 The lavatory onboard both SQ948 and SQ949 have the standard fixtures. 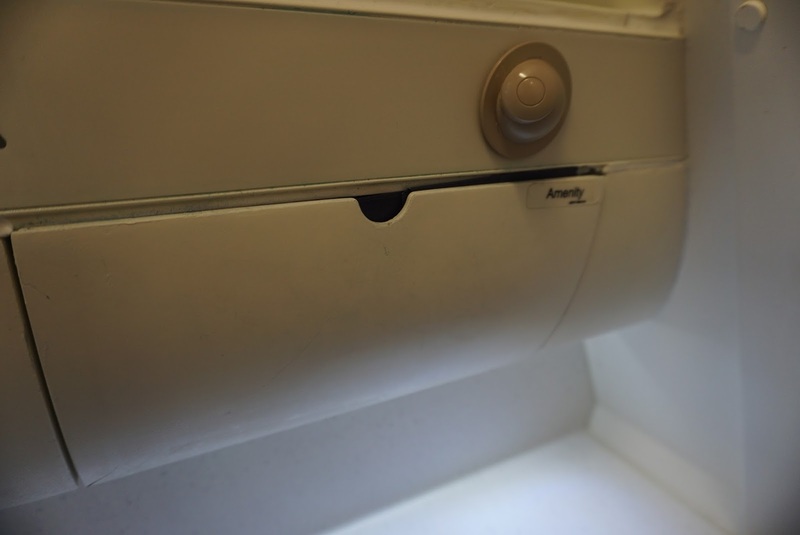 I particularly like the step level which opens the trash bin cover by the sink. I thought this is a nice touch. 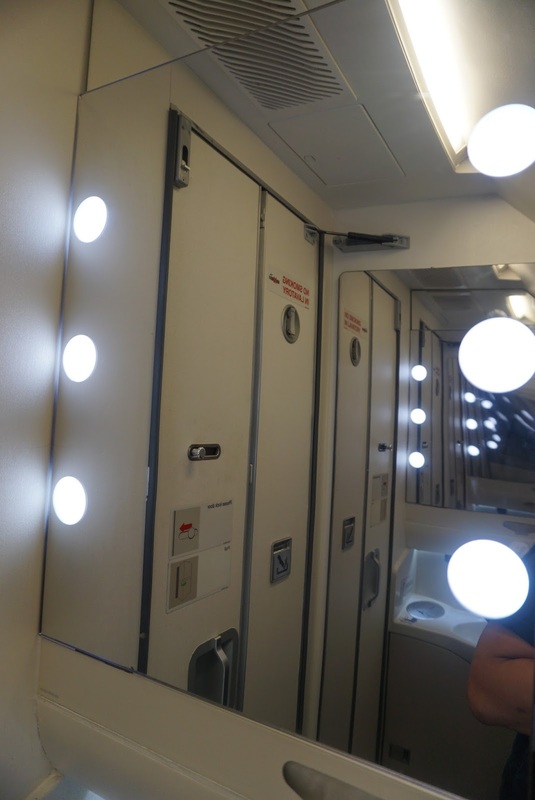 The lavatory is well lighted with what the airline terms as “Hollywood-style” mirror. 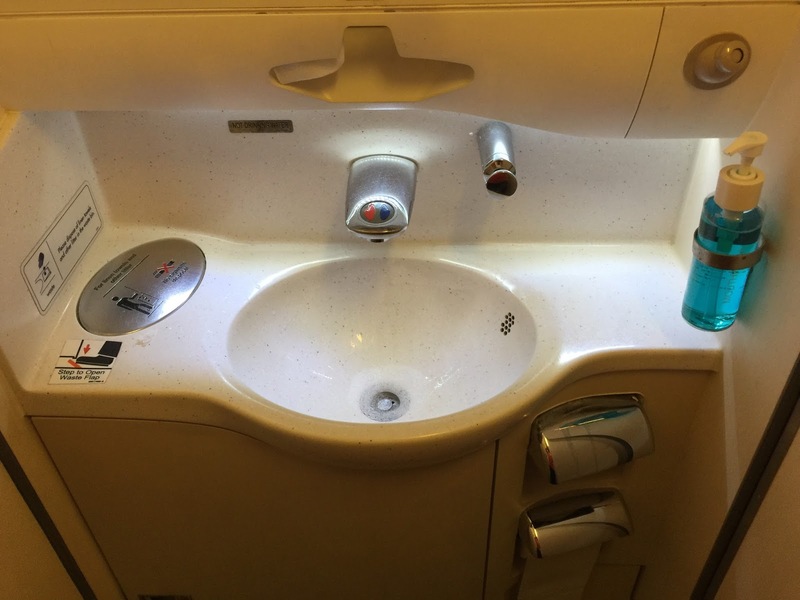 SQ provide more standard amenities in its Economy Class lavatory. 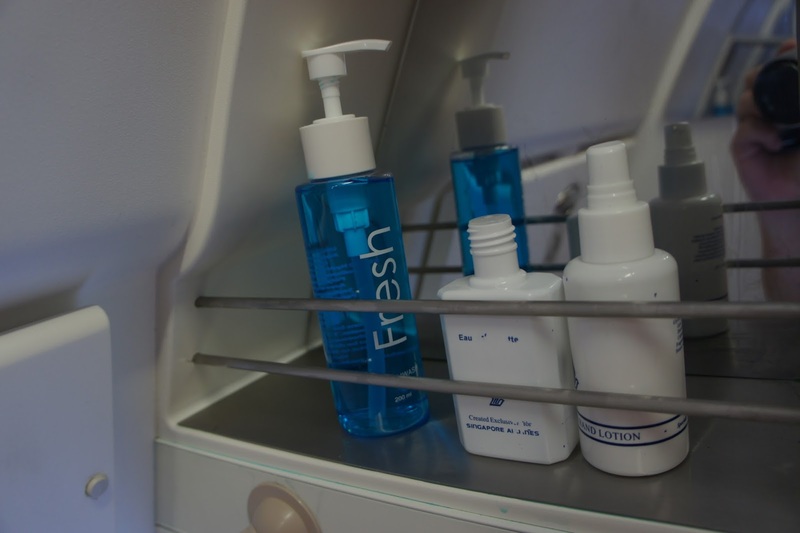 Amenities such as handsoap, mouth wash, hand moisturiser and eau de toilette are available onboard SQ Economy Class lavatories. 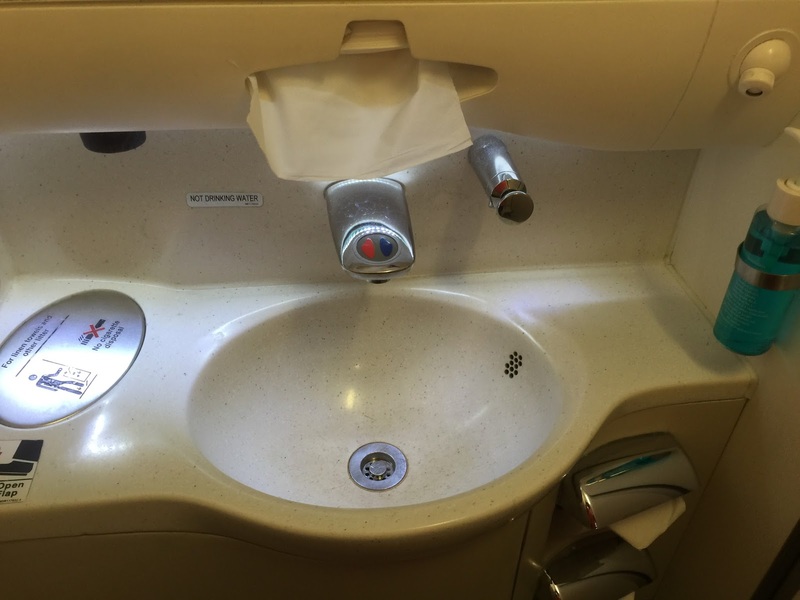 These amenities are more that what most airlines offer in their lavatories. 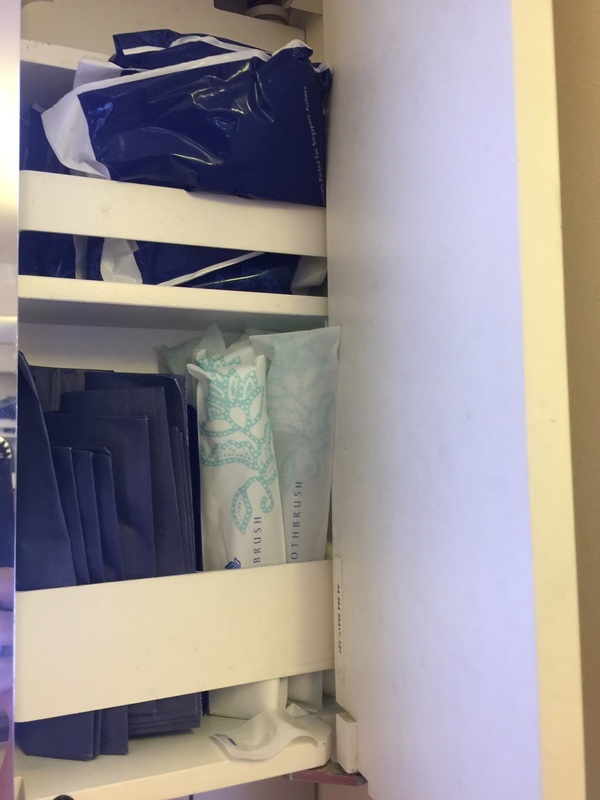 On top of these amenities, sanitary pads, combs, toothbrushes are also available in the Economy Class lavatories. 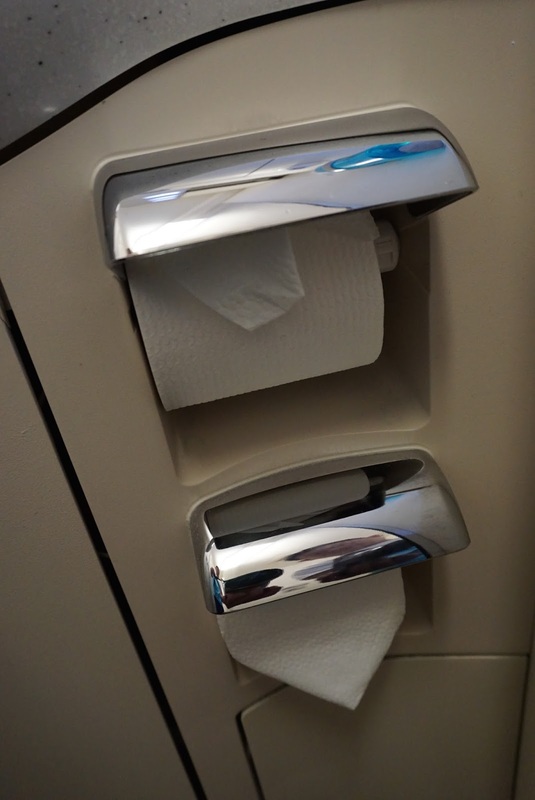 Most airlines these days do not provide toothbrushes onboard, I am glad SQ still provides these additional amenities. 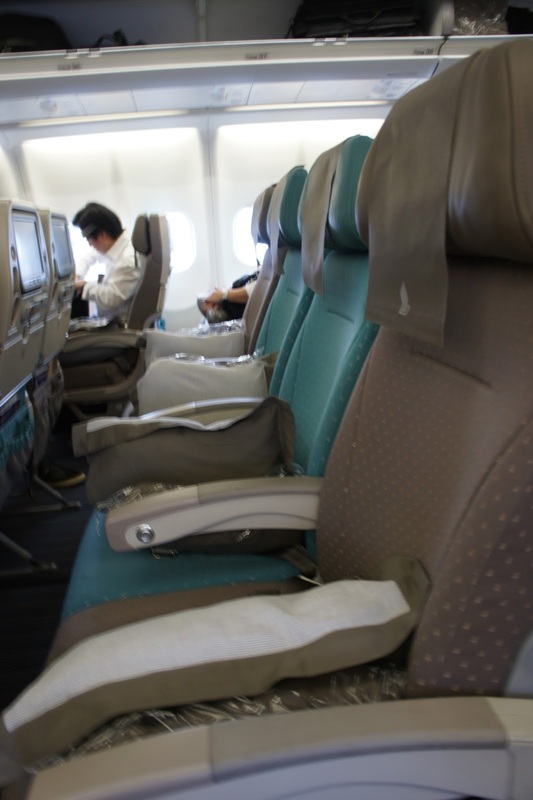 The seat in Economy Class is comfortable, with a generous seat pitch of 32″ and a width of 19″. 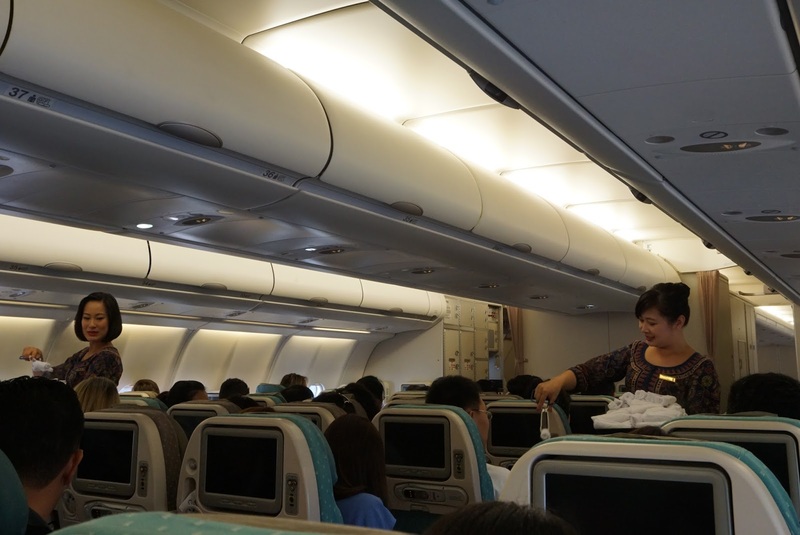 There are a total of 255 seats in the Economy Class split into 2 sections. 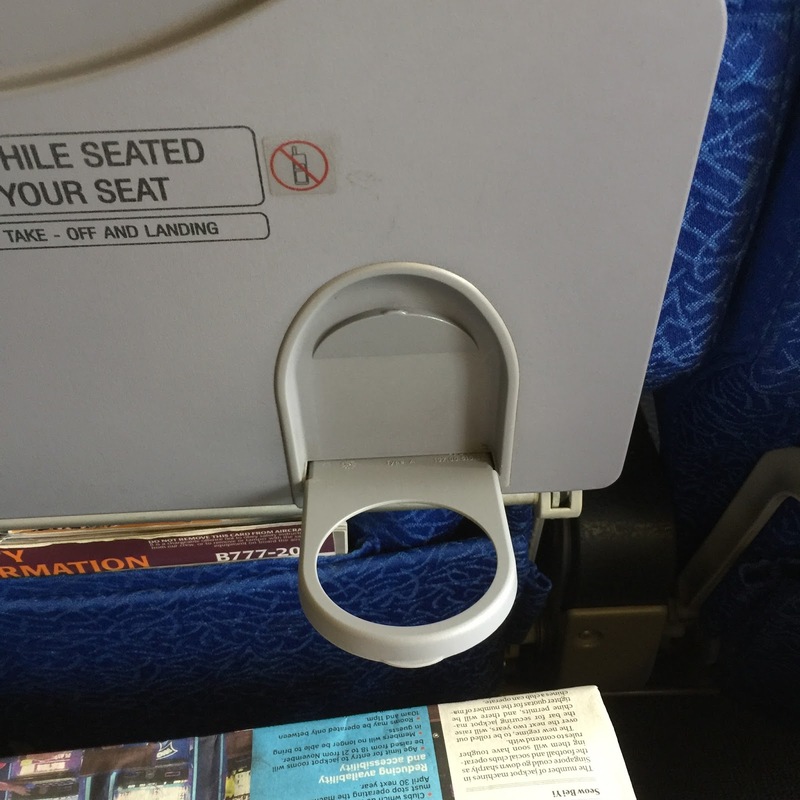 A small cup holder and a compartment is found behind each seat, providing more storage space for its passengers. 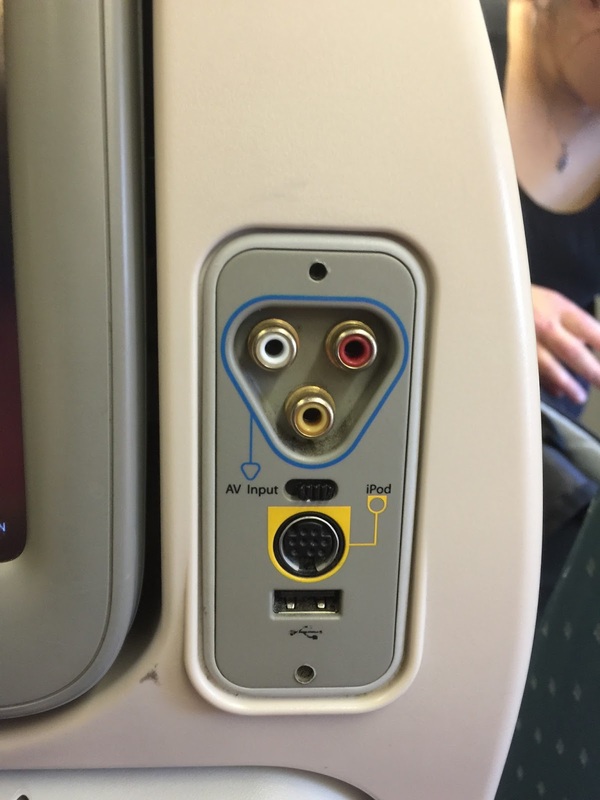 The seat also has an AV jack, a USB port and an outlet for one to plug in their iPod to enjoy music from their personal lifestyle device. The seat pocket is rather generous, with 2 large pockets and 1 small pocket providing ample space for passengers to store their stuff. 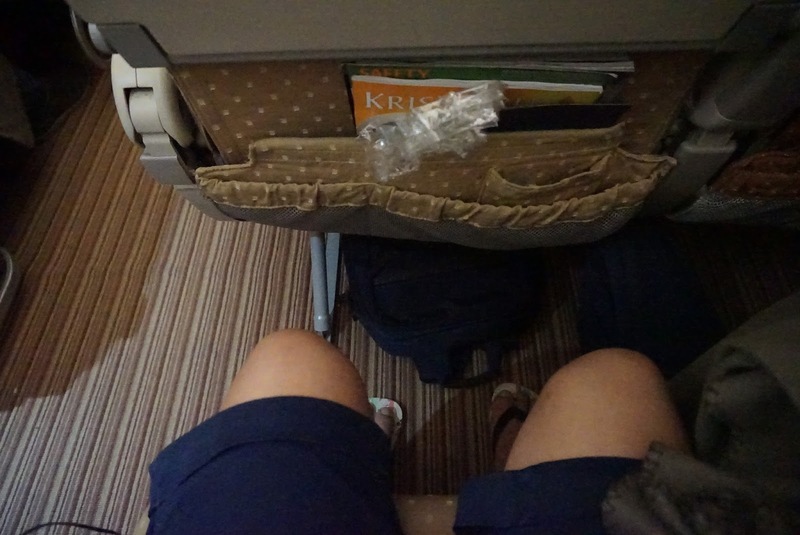 The legroom is great for Economy Class, and I have sufficient leg room for stretching. 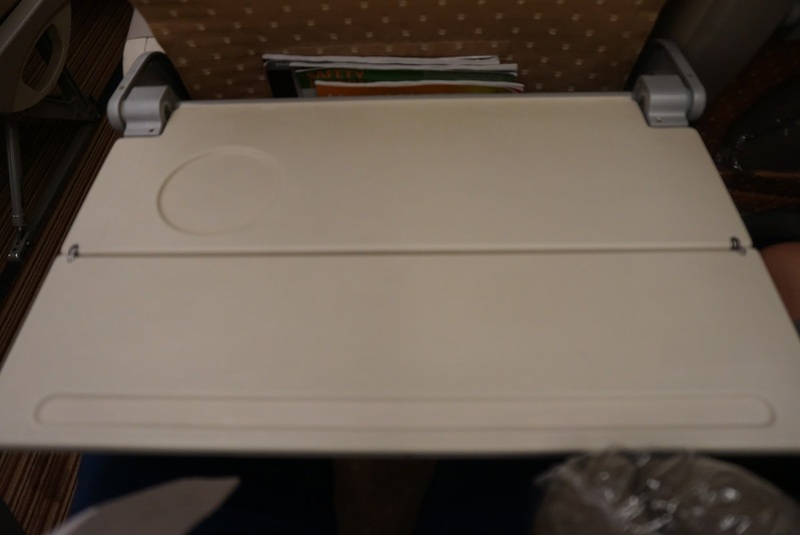 The seat also has a sliding bi-fold tray table which provided space for passengers sitting in the window to gain access to the aisle without disturbing passenger sitting at the aisle too much. 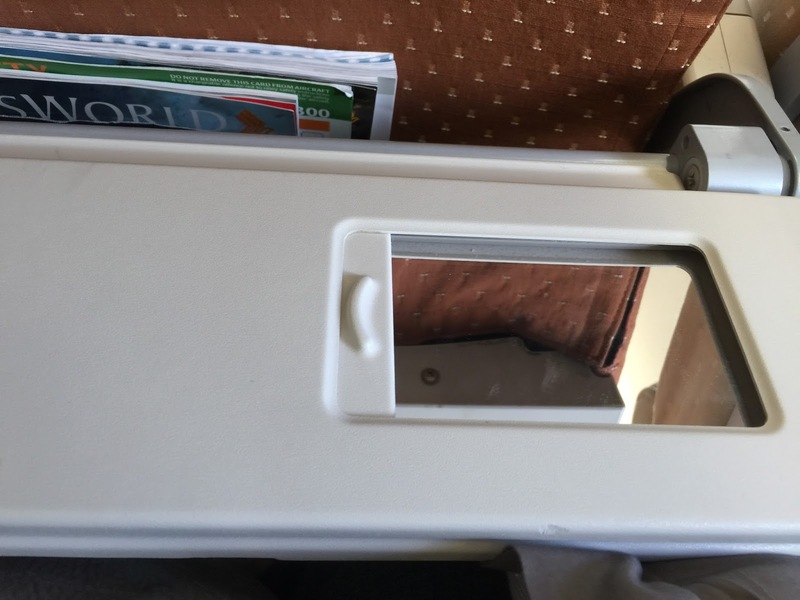 There is also a vanity mirror on the tray table. 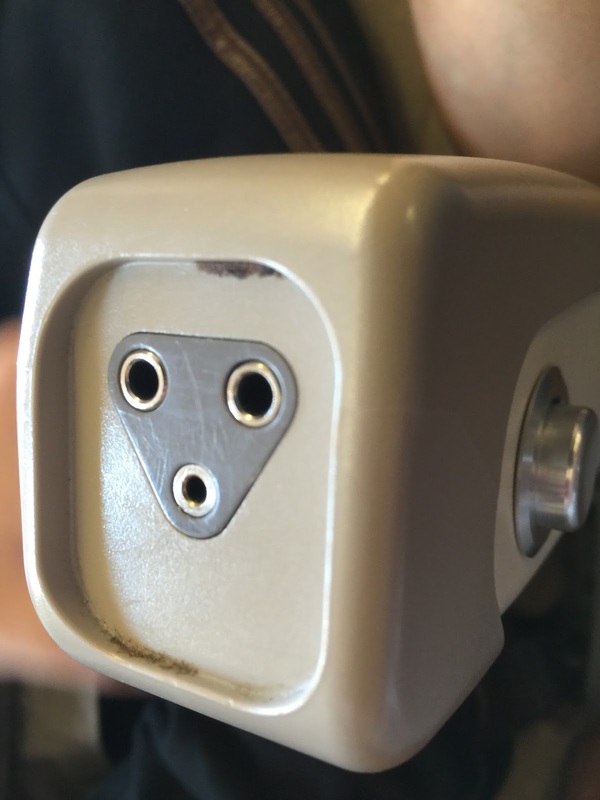 The headphone jack is located on the armrest, above a power socket for passengers to charge their lifestyle gadget. 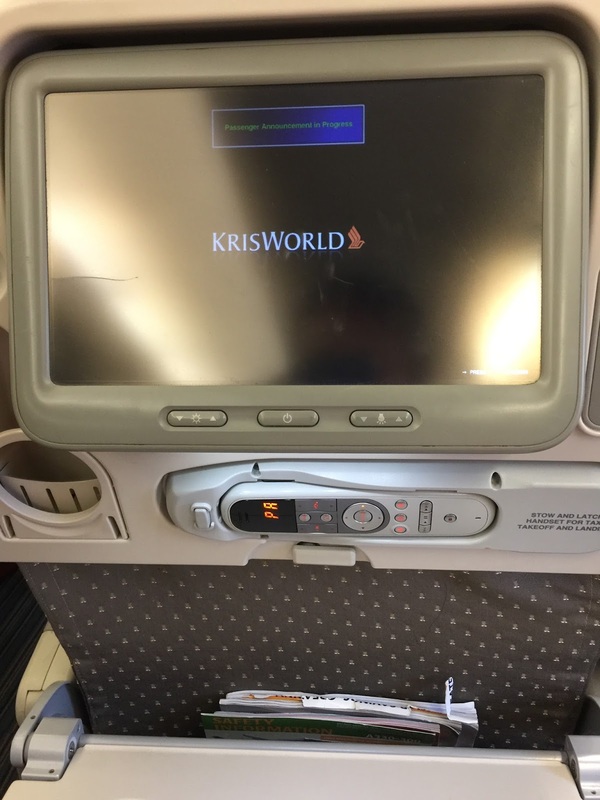 Passengers are treated with a 10.6″ Personal TV screen in every seat in the Economy Class, however these TVs are not touchscreen which is not a problem as the AVOD controller is rather responsive. 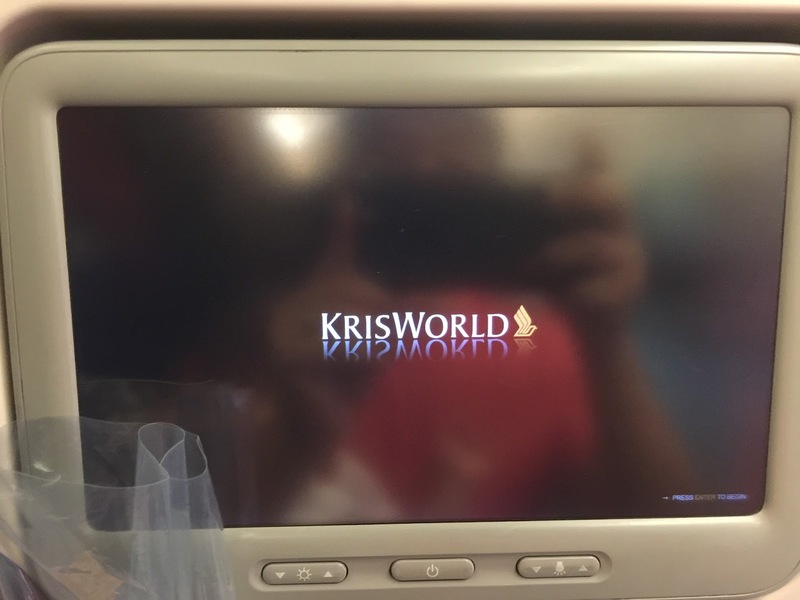 KrisWorld is SQ’s entertainment system, which has tons of options to keep passengers entertained, ranging from the latest release of movies to TV shows to games. 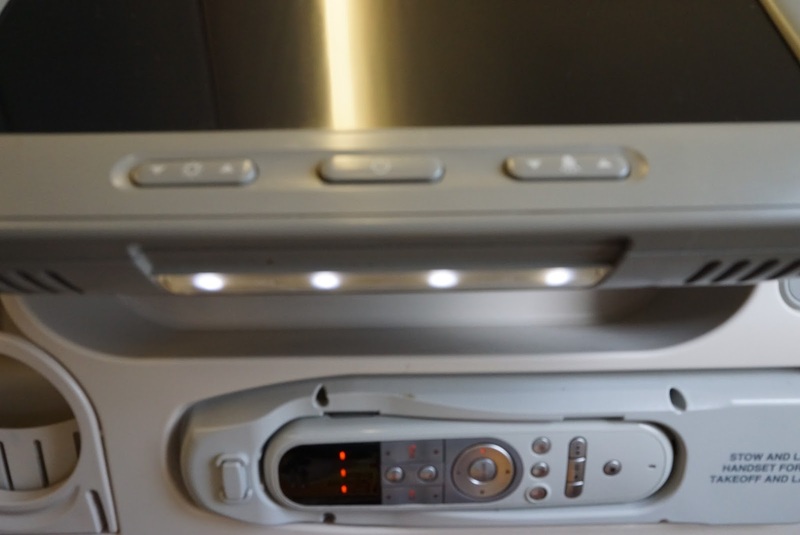 There is also a row of LED reading lights under each personal TV screen, which can be tilted to expose the reading lights. 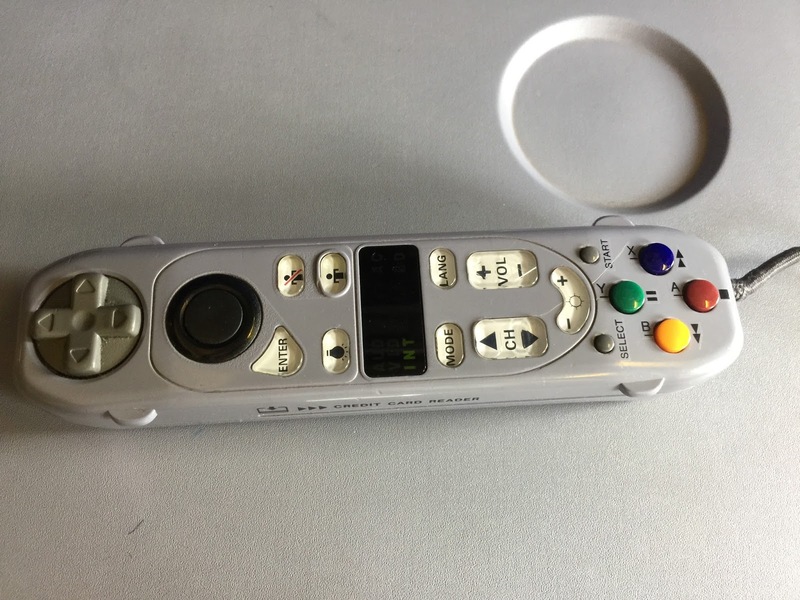 The AVOD controller is stowed underneath the personal TV screen. 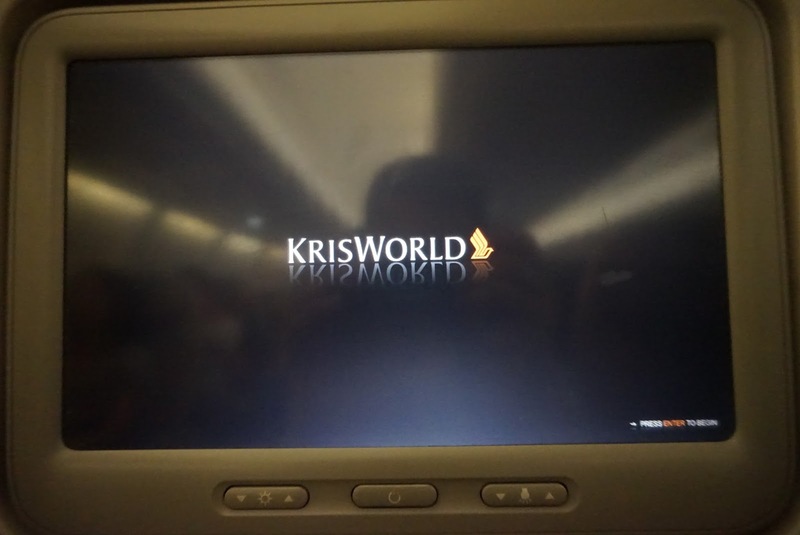 One side of the controller controls the menu for KrisWorld allowing passengers to select their preferred entertainment. 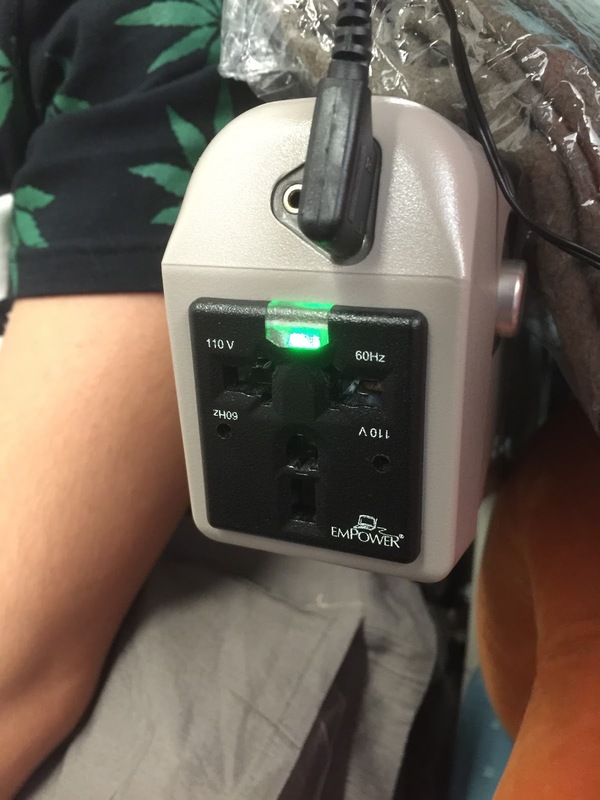 The call button and reading light switches are also located on this side of the controller. 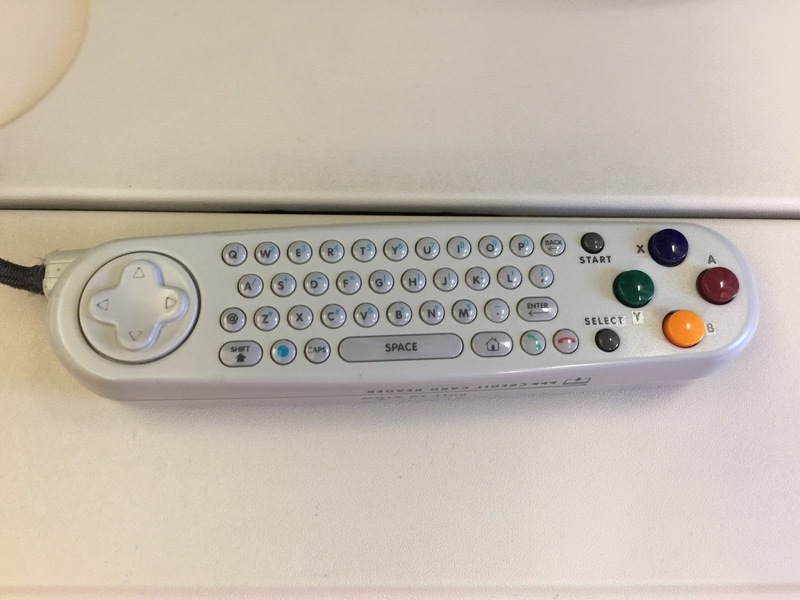 On the back side of the controller, one can find a keyboard, directional joystick as well as 4 buttons which is used for playing games on KrisWorld. 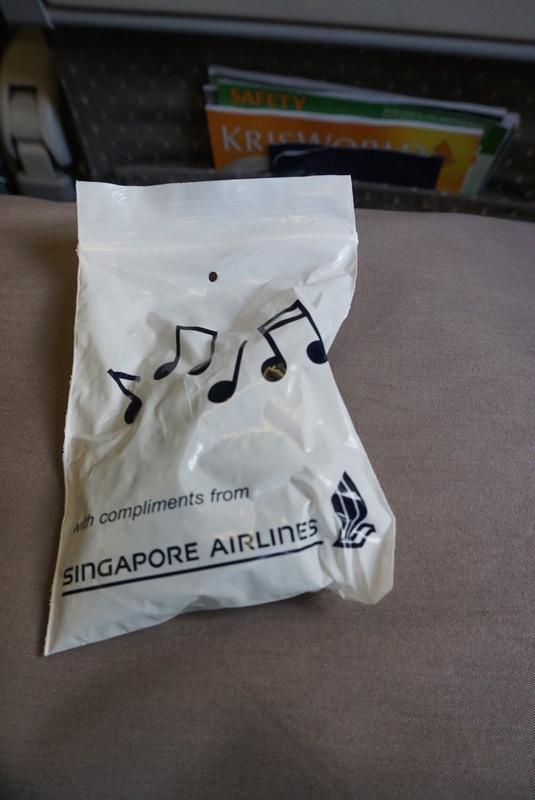 SQ distributes earplugs which passengers are free to bring them back. 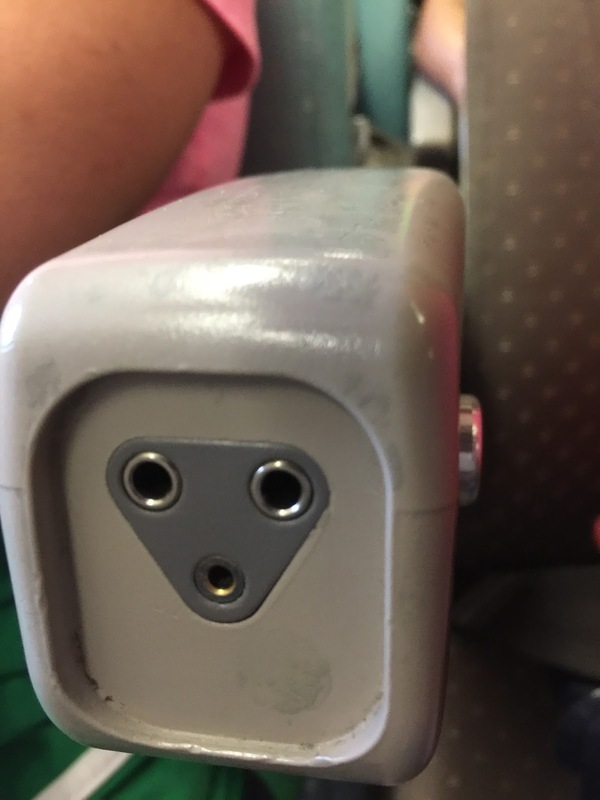 The quality of the earplugs are rather bad, nonetheless it is good enough to be used onboard. 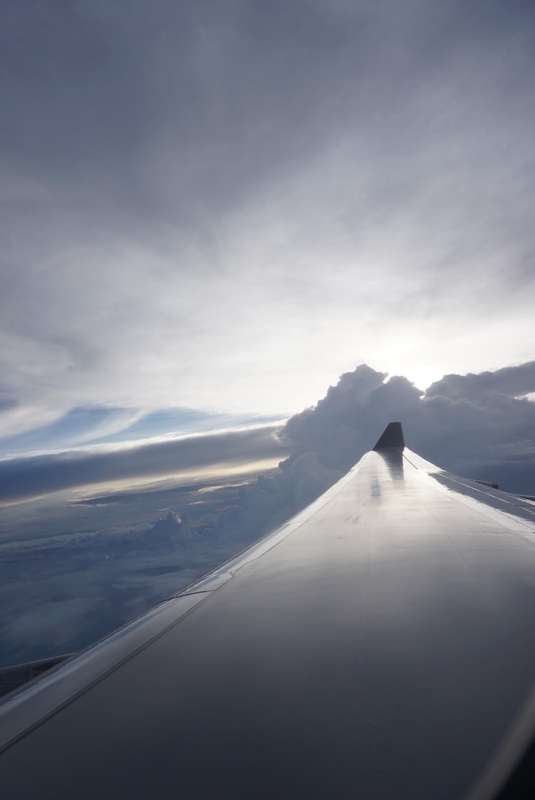 As with most other airlines that has a relatively short flight time, time is critical for the pursuers especially on a near full flight. 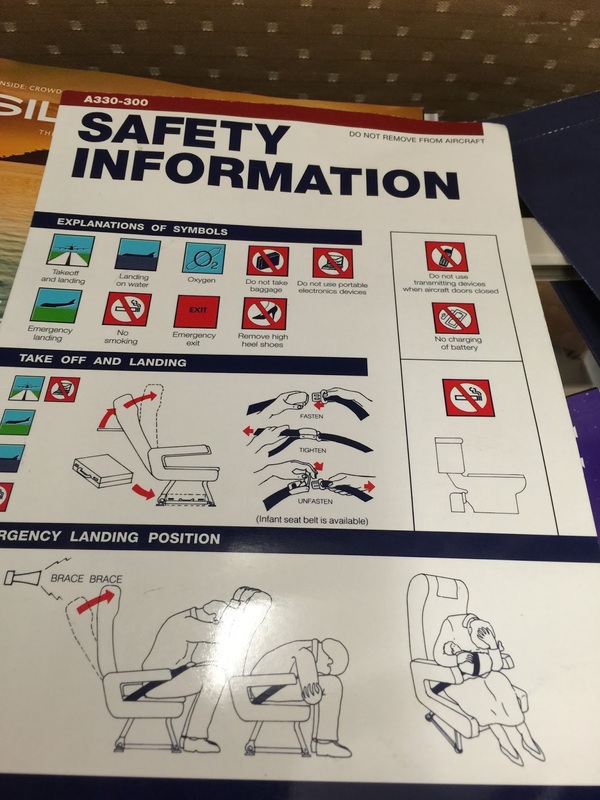 The pursuers sprung into action as soon as the seat belt sign has been turned off. 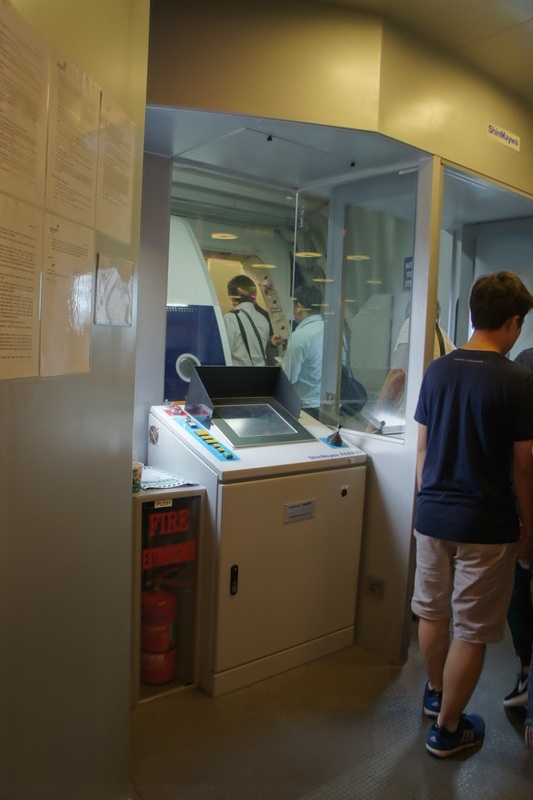 They went around preparing for food like clockwork, hoping to beat the time and get the food to all the passengers within the short flight time. I guess the safest meat to serve in this region has got to be chicken and fish. 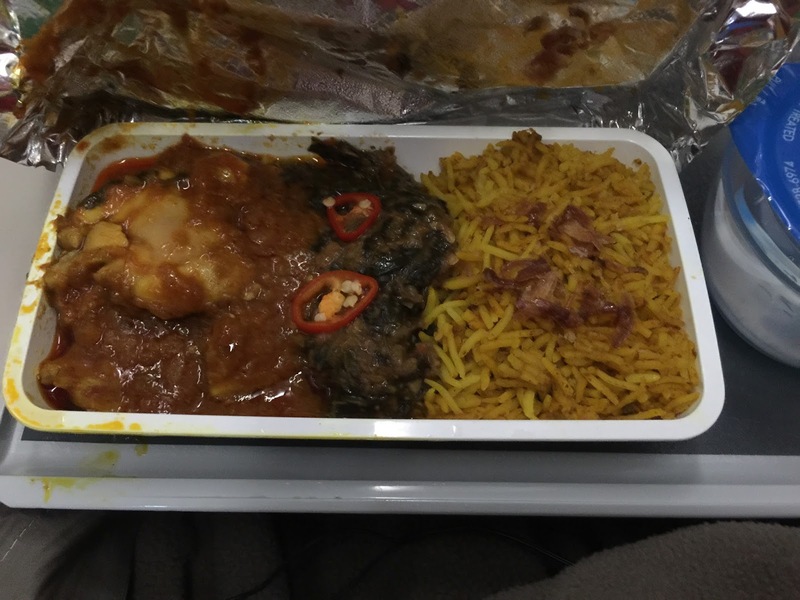 The options for this flight we had was pan seared fish or curry chicken. I had the curry chicken. The chicken tasted tender and the spice in the curry wasn’t too overpowering. When eaten with the rice, the curry is very delicious. My only qualm is there is too little of the delicious curry for the bed of rice. My friend opted for the fish. I was told the fish tasted fresh and the seasoning on the fish is just perfect. Also on the menu was a salad for starter (nothing fantastic, the dressing was “normal”) and chocolate mousse for desert. I find the chocolate mousse to be a tad too sweet for my liking. The pursuer went around serving coffee and tea after all the passengers got their food. Pursuers also went around serving drinks. The options for this leg of the flight is again restricted to chicken and fish. Both my friend and I opted for the chicken. The chicken was dressed in spicy rendang sauce served with rice over a bed of long beans, carrots and cauliflower. 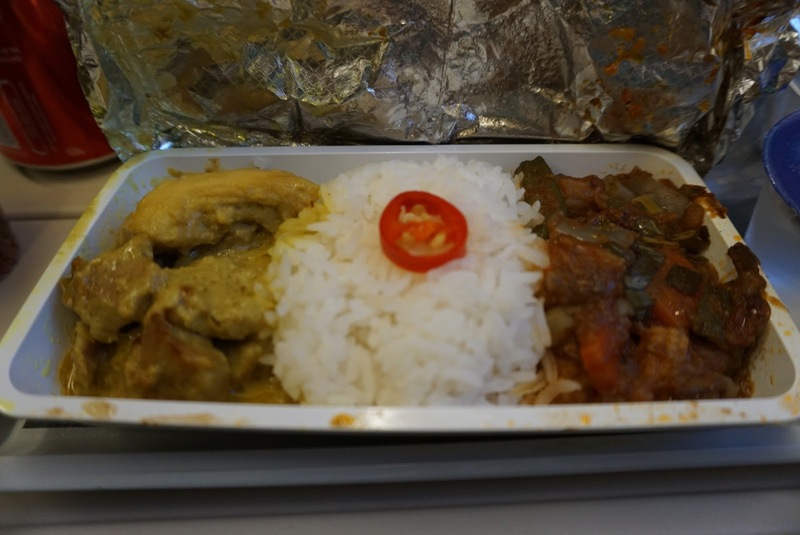 The rendang chicken is a little dry, but the level of the spicy is just nice, perfect for passengers who are not used to taking spicy food. 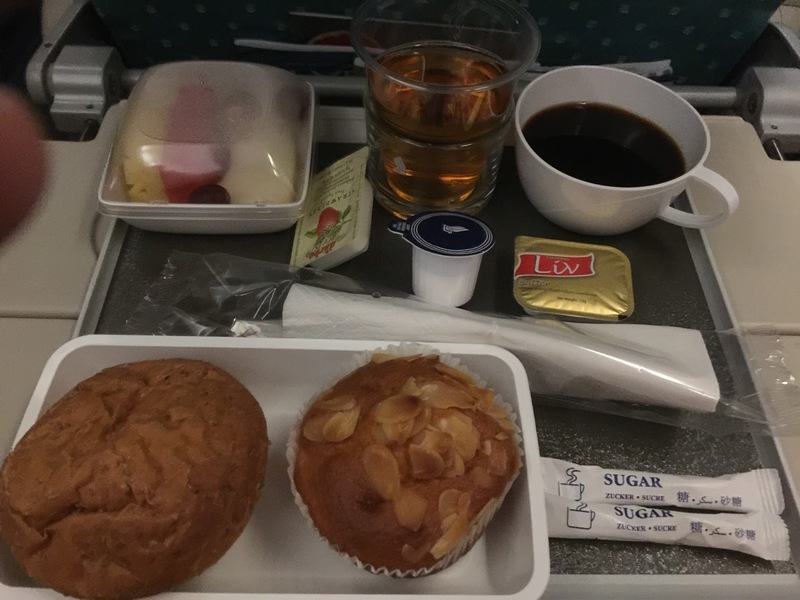 Both starters and desert are the same as the previous flight. 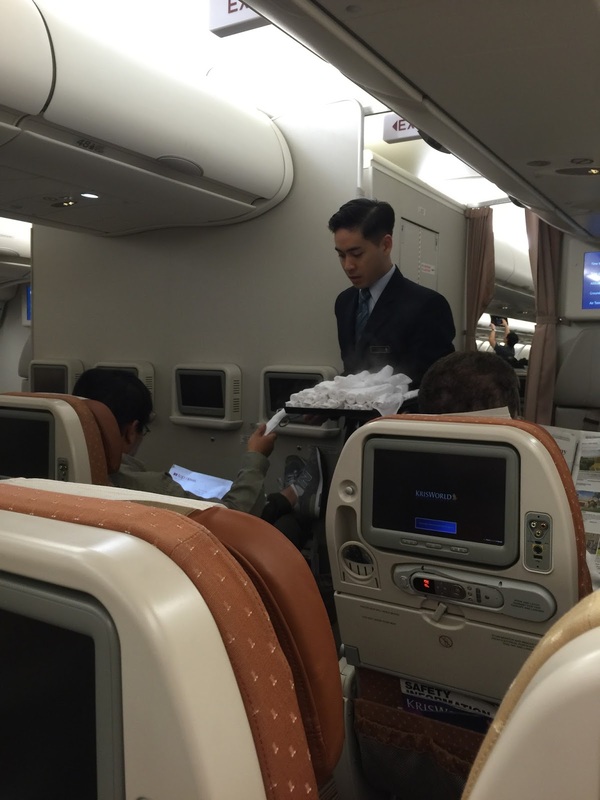 The service onboard this flight feels very standard of SQ. 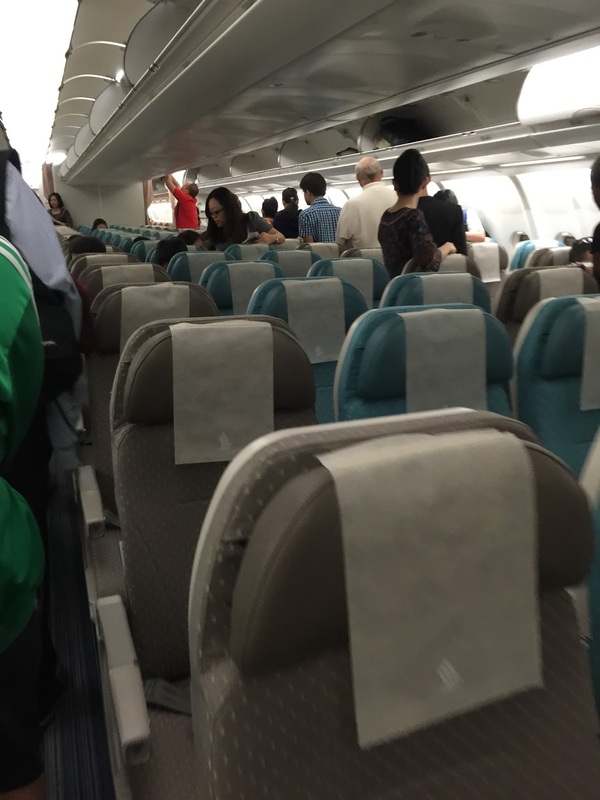 The standard warm towels are being passed to passengers shortly after take off. Somehow the pursuer working at our aisle felt a little fake in her service. Her smile is rather plastic and she some how gave me the impression that she is not sincere in her service. I requested playing cards and a can of coke from her during the flight, but these requests were not being taken note. At first I thought she might be having a bad day, however I did witness her warmth when dealing with a Caucasian passenger. Not once, but 3 times I saw her going up to the Caucasian passenger initiating conversation and checked if he was comfortable during the flight and if he needed anything like a drink during the flight. I was taken aback by such discriminating service by her. Having said that, the pursuers serving the other aisle seem friendlier and warmer. I saw they going around asking passengers if they needed anything with a very warm and sincere smile. The service onboard this leg is much much better than my outbound flight. 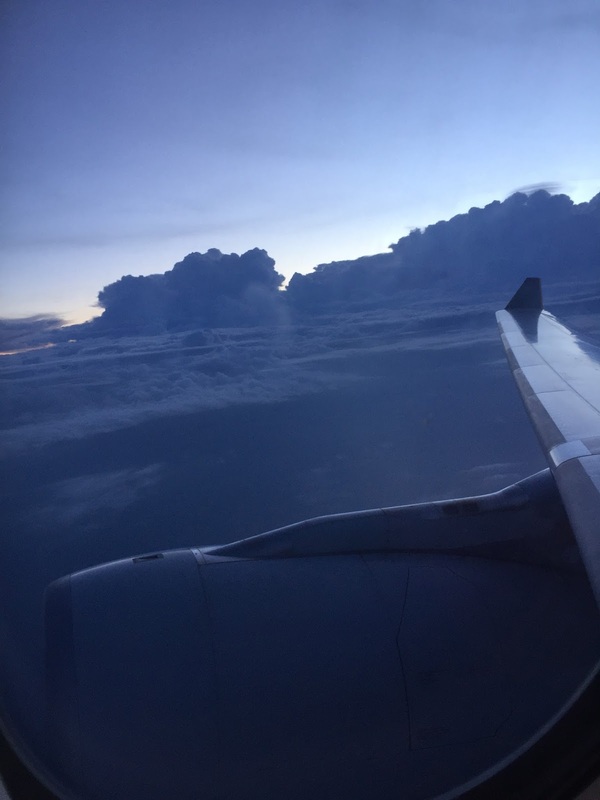 From the moment we stepped onboard the flight, the pursuers asked if we needed help with our carry ons, to the dinner service, when the pursuers asked if the food was alright and if we needed to top up our drinks. 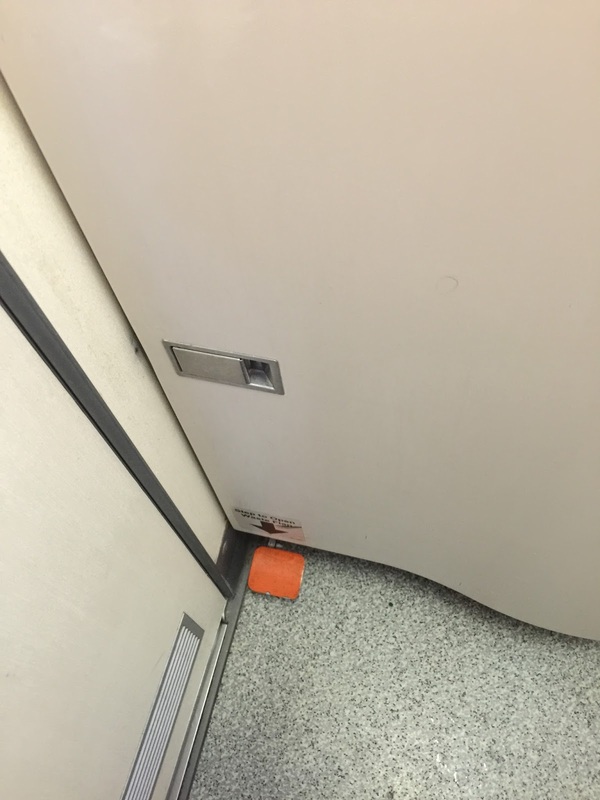 The pursuers tried their very best to accommodate to our request. 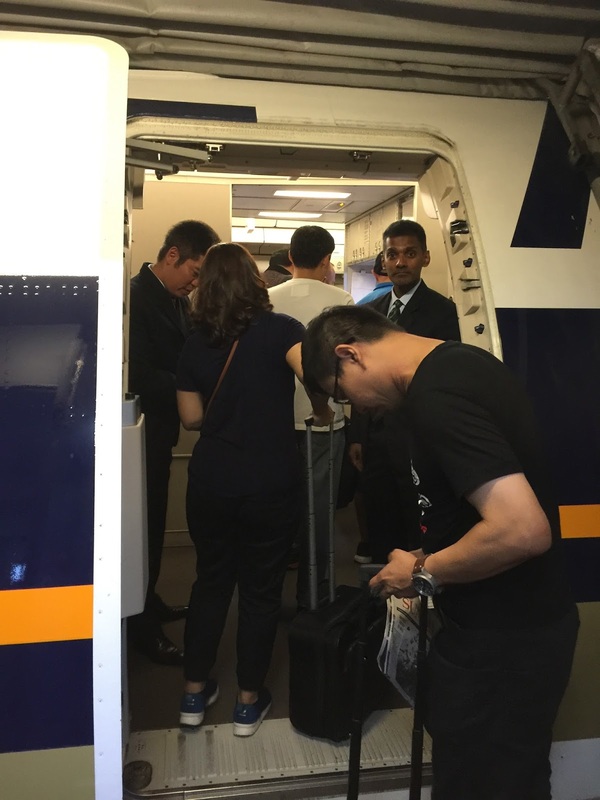 We requested to change seat prior to taking off and were assisted by the pursuers in securing our new seats. The pursuers have warm personality and occasionally popping by to ask if we needed more drinks. They were seen joking with my friends and other passengers during their free time. We were also given extra deserts by the pursuers as my friend complemented that they liked the desert. 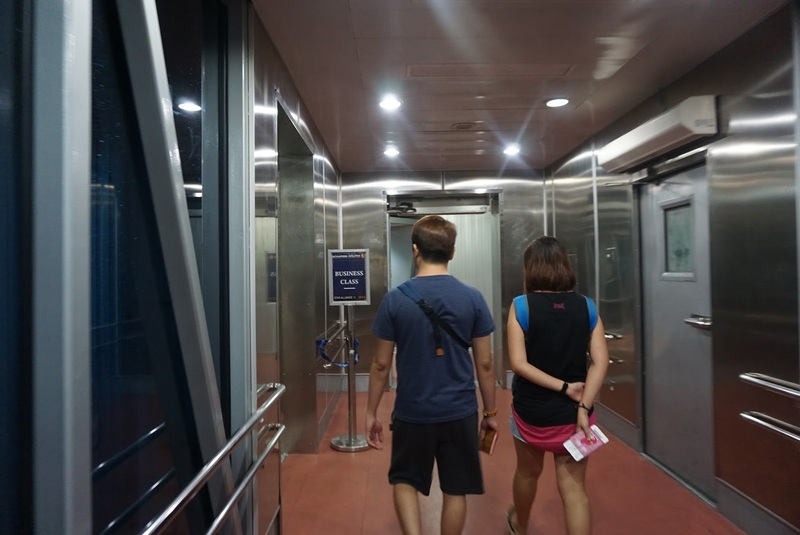 The pursuers felt sincere in their service onboard SQ949. 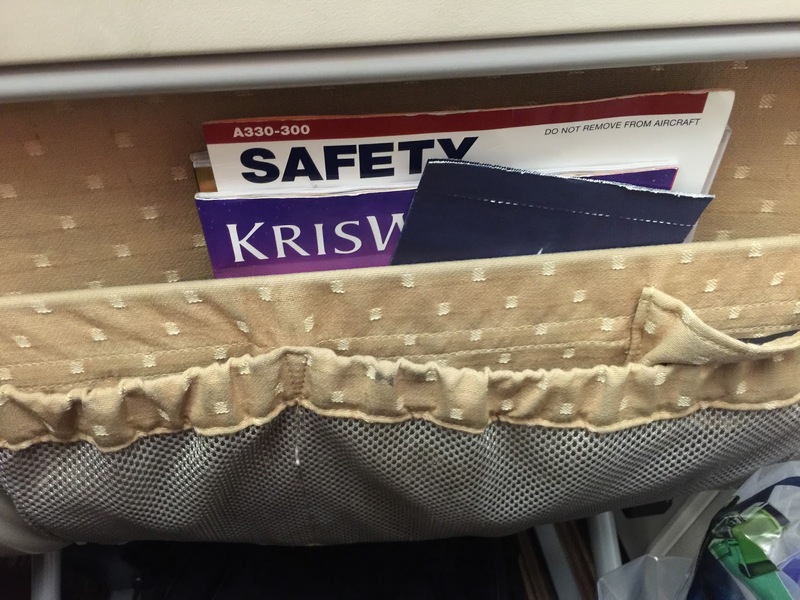 SQ provided very comfortable flight on their seats even in Economy Class. The cabin decor felt warm and cosy and the amenities found in the lavatories are a notch above their competitors. 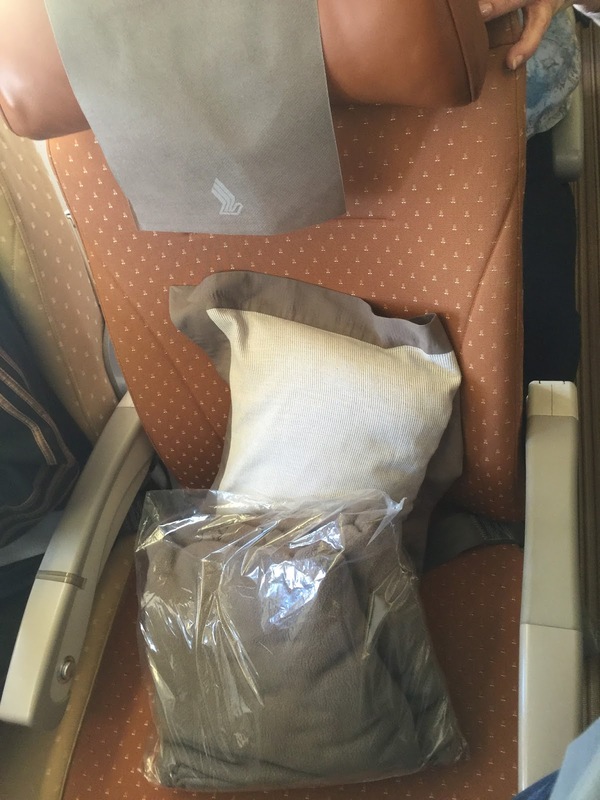 The pillow found on the seat is large for Economy Class and the fleece blanket gives Economy Class passengers a feeling of premium. 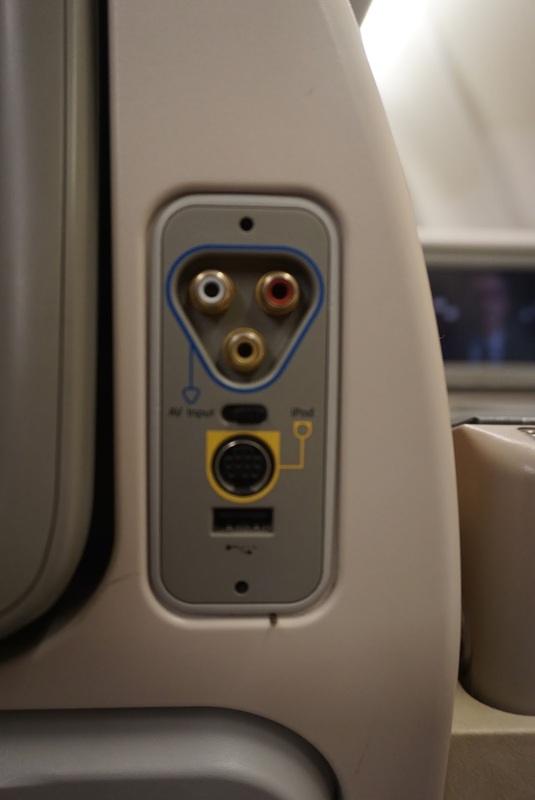 Passengers will be spoilt for choices in the entertainment system, especially on a large screen (larger than most other airlines of the same class). 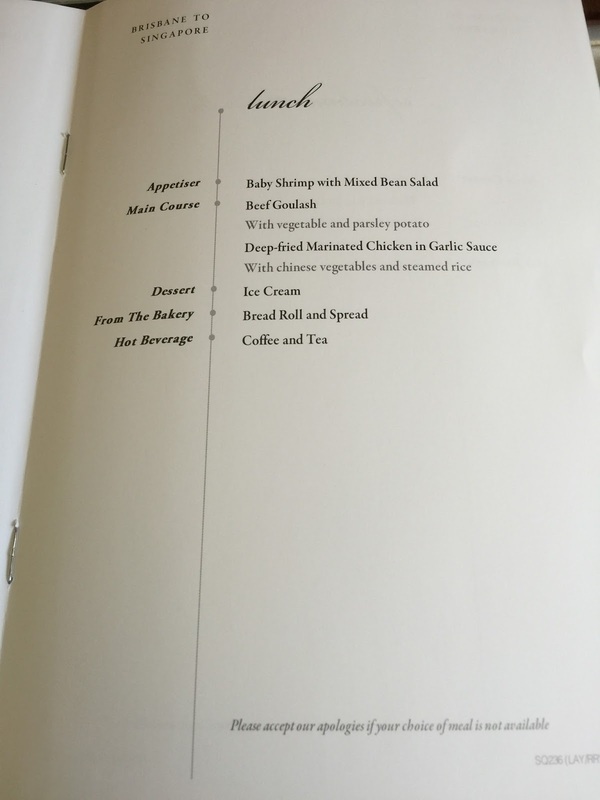 The food is great onboard and very delicious. 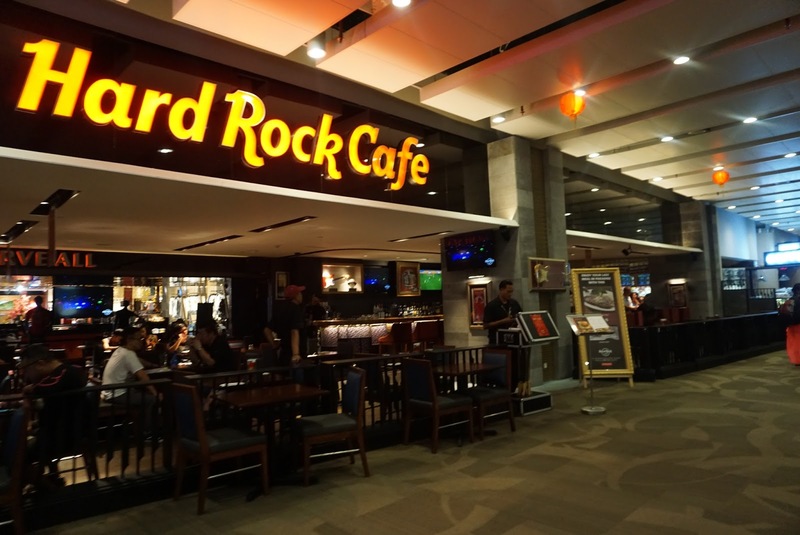 However the service was mixed, giving me a feeling that luck plays a huge part in determining if we got good service, depending on who served our aisle. I booked my tickets through the Singapore Airlines website about 3 months before my travel to Bangkok. 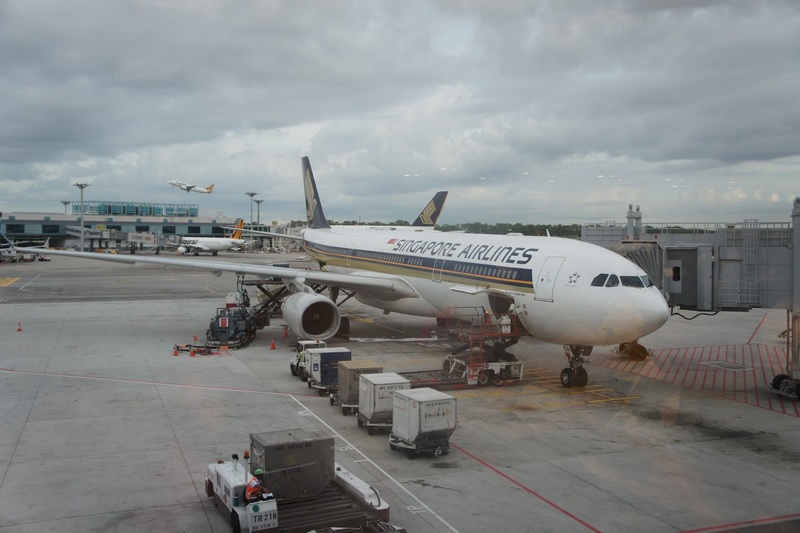 Singapore Airlines offers cheap airfare from time to time. Booking via the website is a breeze. The booking is easy and allows one to choose their seats after payment has been made. At the time of booking, SQ scheduled 777 for both legs of the flight. 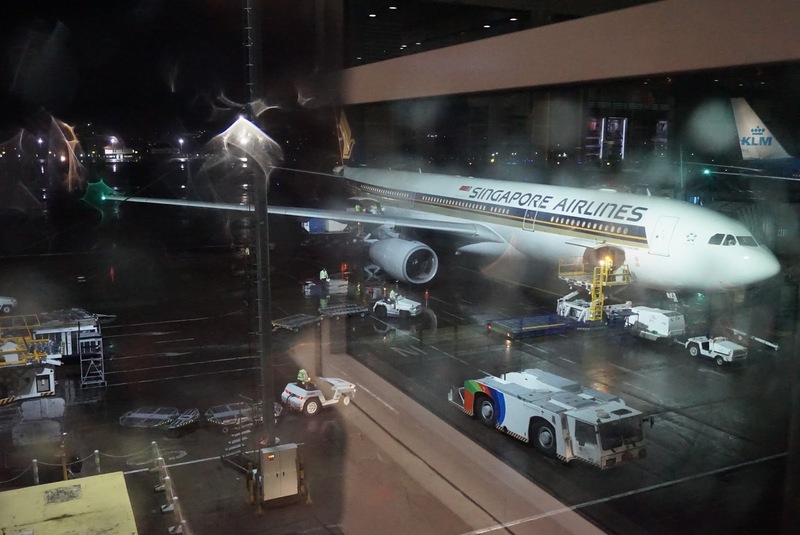 However a month before the scheduled flight, I received an email from SQ stating that they will be using A330 for both legs of the journey. Checking in using the SQ mobile app is easy as well. One is allowed to choose the seats even after checking in. 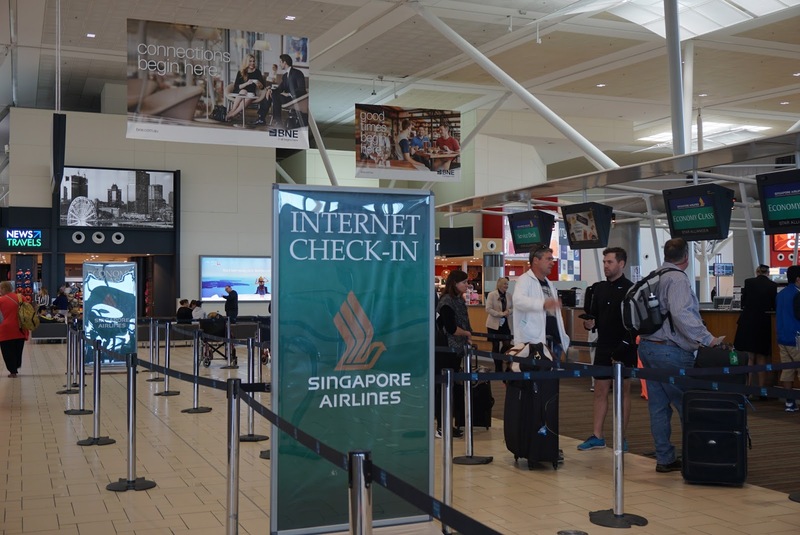 Internet check-in is opened 48 hours prior to the scheduled flight. 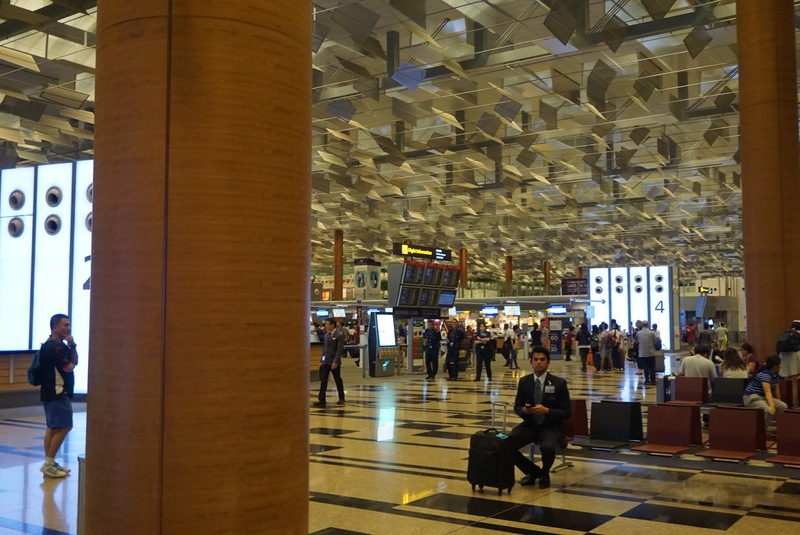 SQ uses Singapore Changi Airport Terminal 2 for flights leaving for and arriving from Bangkok. 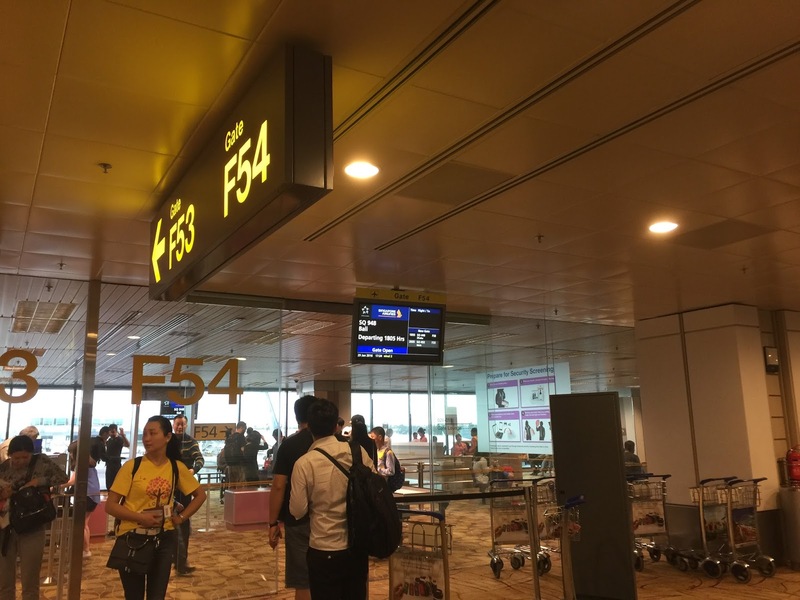 SQ uses Rows 1 to 6 of the terminal to handle all the flights leaving Singapore. 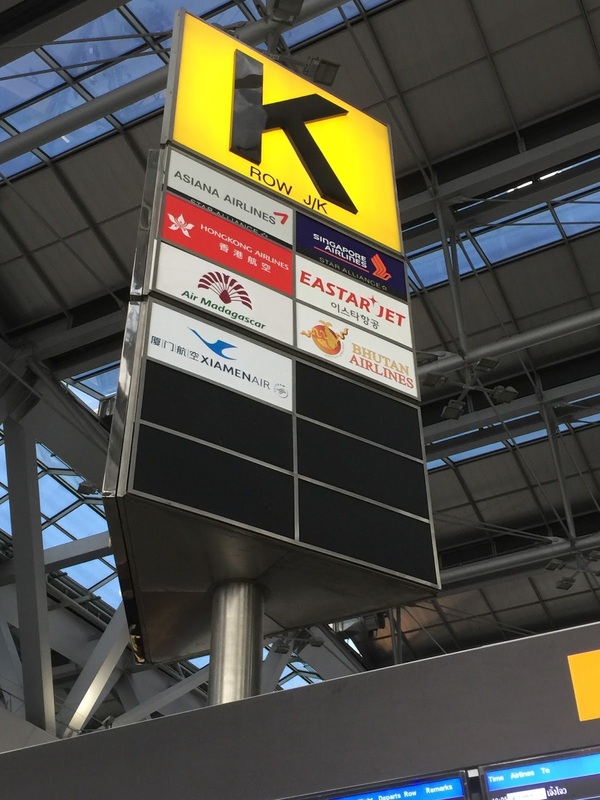 For online check-ins, the airline uses check-in row 3. 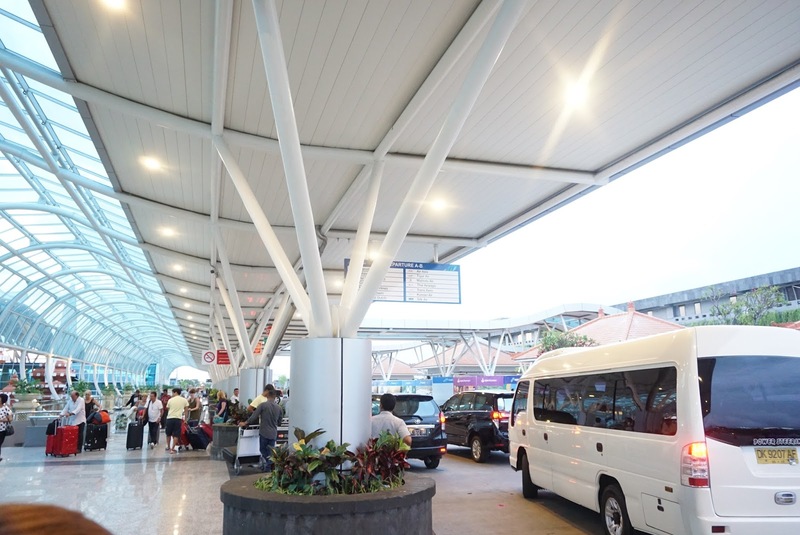 The check-in rows are situated to the left of the terminal building and is not difficult to locate. 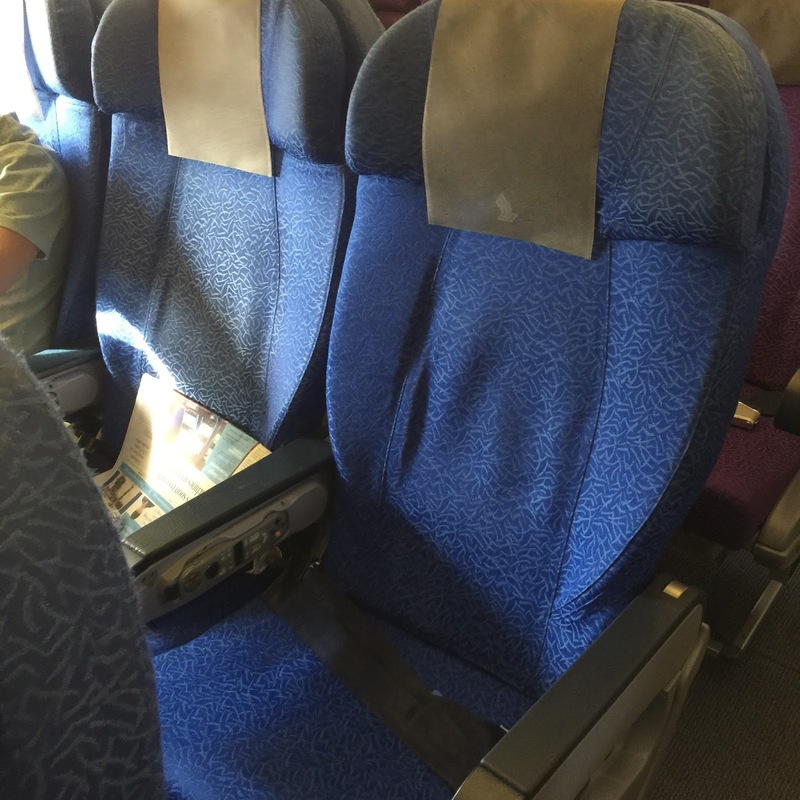 Rows 1 and 2 are reserved for premium class passengers. The queue for online check-ins is very light, I only have to wait for 5 mins to check in my luggage and be handed with my boarding pass. 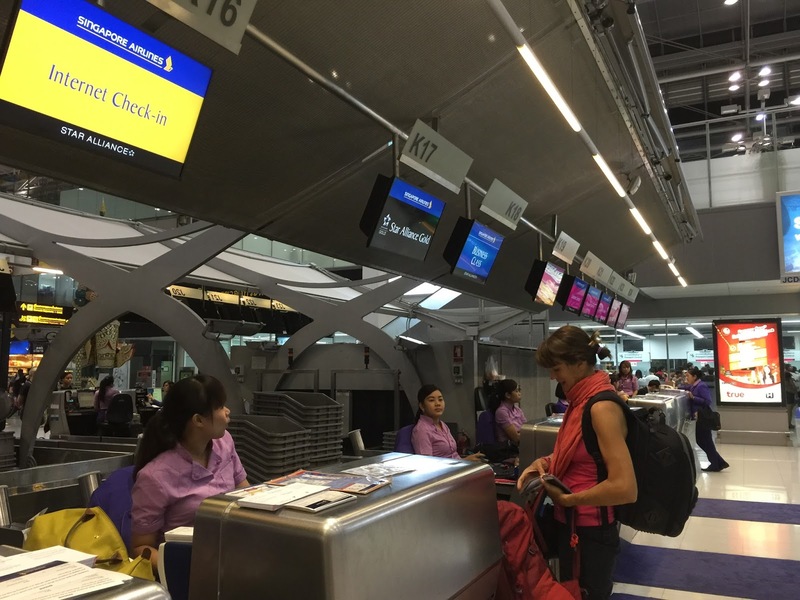 The staff handling the check in is very friendly and efficient. I was promptly handed my boarding pass within 5 mins and the staff gave me brief instructions such as what time to be at the boarding gate and directions for the boarding gate. 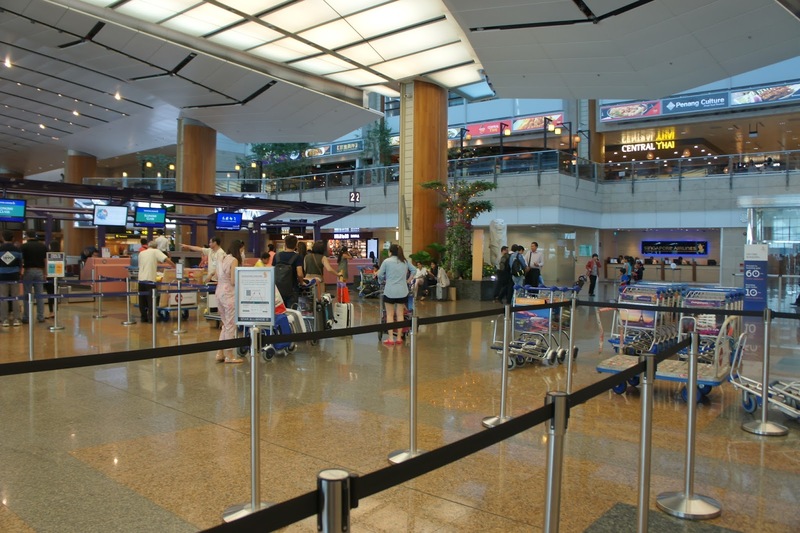 Passengers can check in their luggage 48 hours before departures for flights out of Singapore. 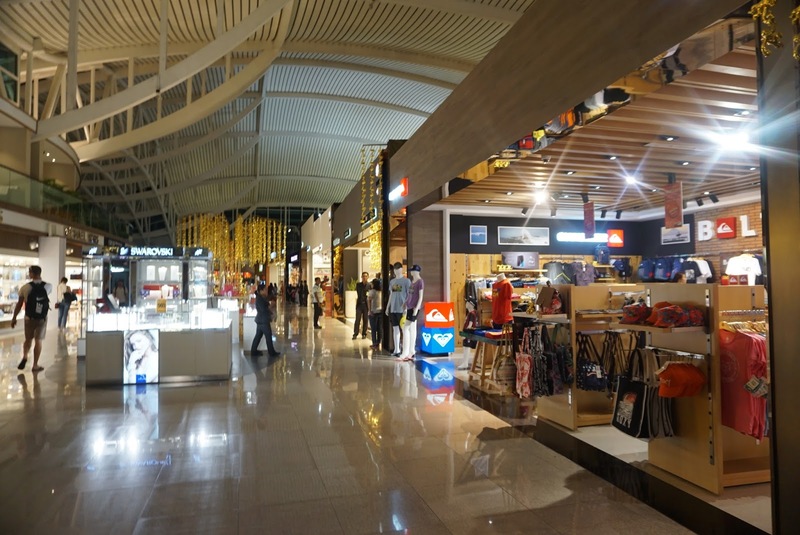 At the airside, the airport resembles shopping mall, with loads of shopping outlets and activities such as movie screenings, gardens and even a rooftop pool and gym, the wait time for boarding passed by easily. 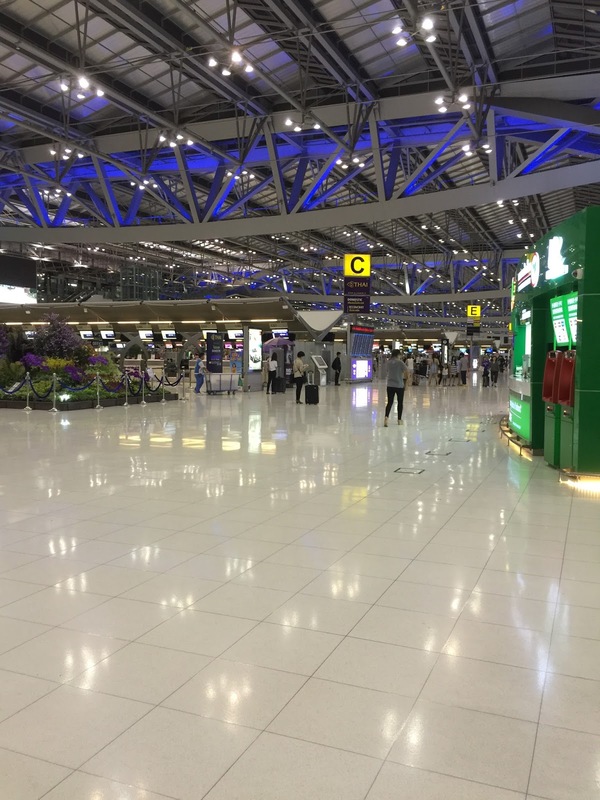 SQ check in counters is located in the middle of Suvarnabhumi Airport in row K. There is no queue at the airport for internet check-ins. 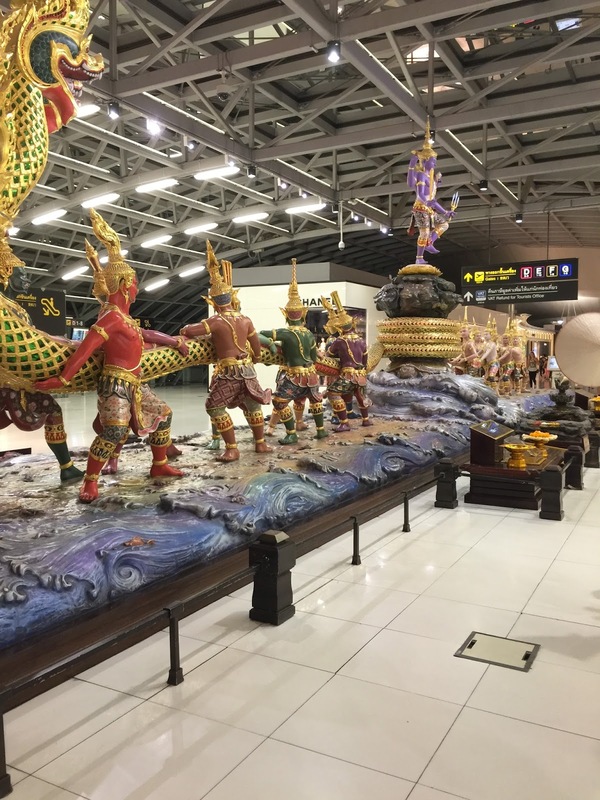 As with my outbound leg to BKK, the ground staff at Suvarnabhumi was very friendly and efficient in handing my check in. I was given my boarding pass in 5 mins as well. 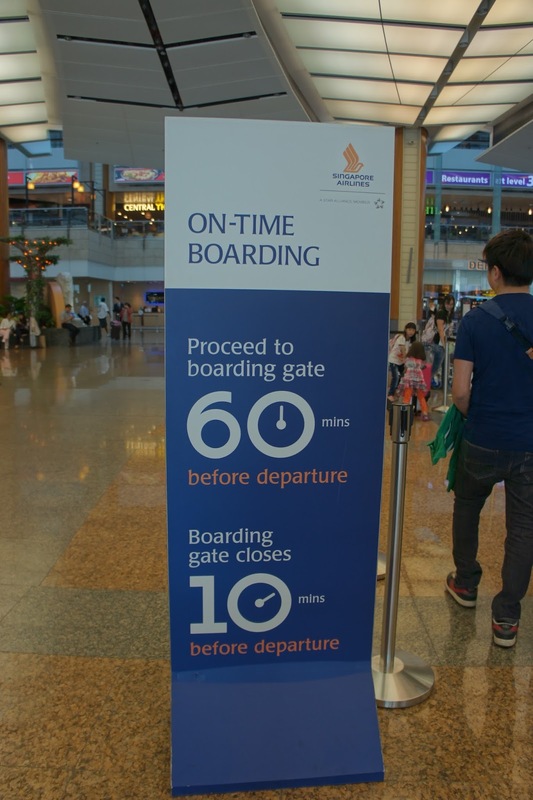 The staff also gave instructions on which gate to board and by what time I need to be at the boarding gate. However, directions were not given on where the gate is located. 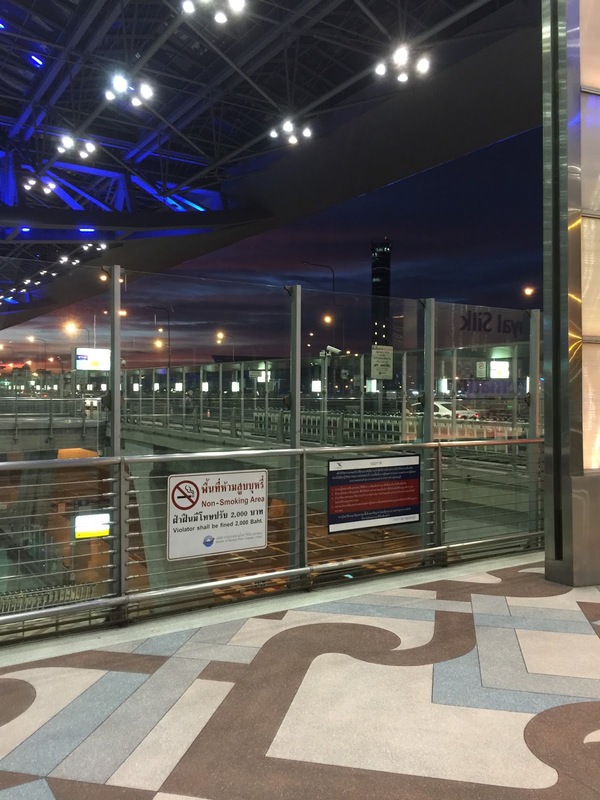 Passengers who are not familiar with Suvarnabhumi Airport are advised to arrive at the airport terminal early to cater time for immigration clearance. 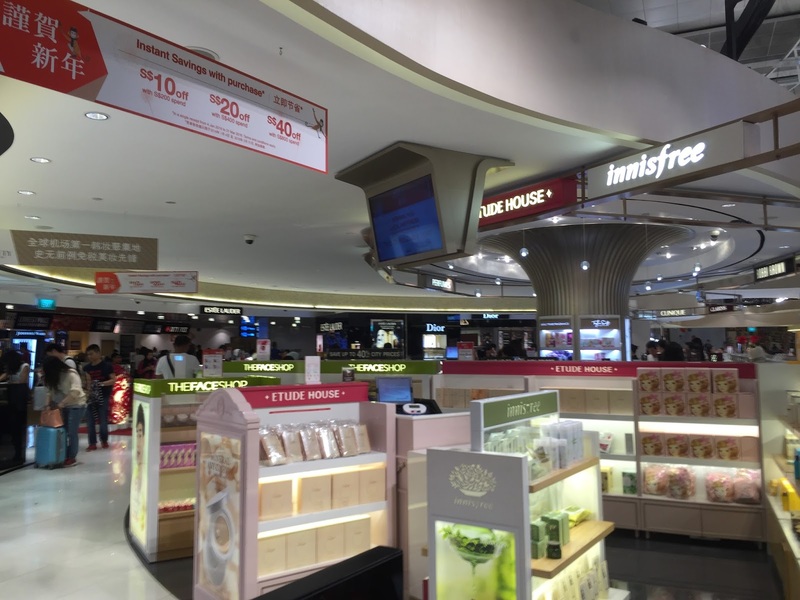 There are several duty free shops at the airside for passengers to kill time with, however, these shops mainly offer the same stuff and I found it boring after awhile. 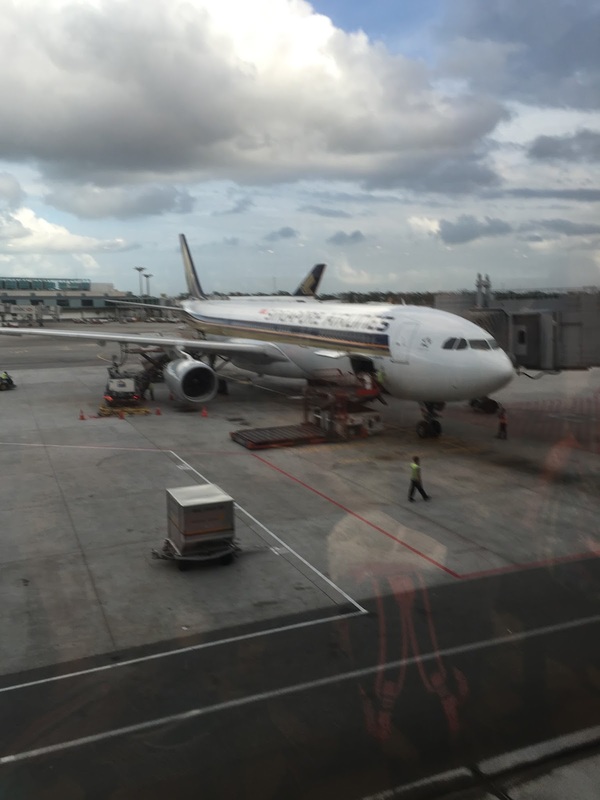 SQ changed to A330-300 for both legs of the journey. 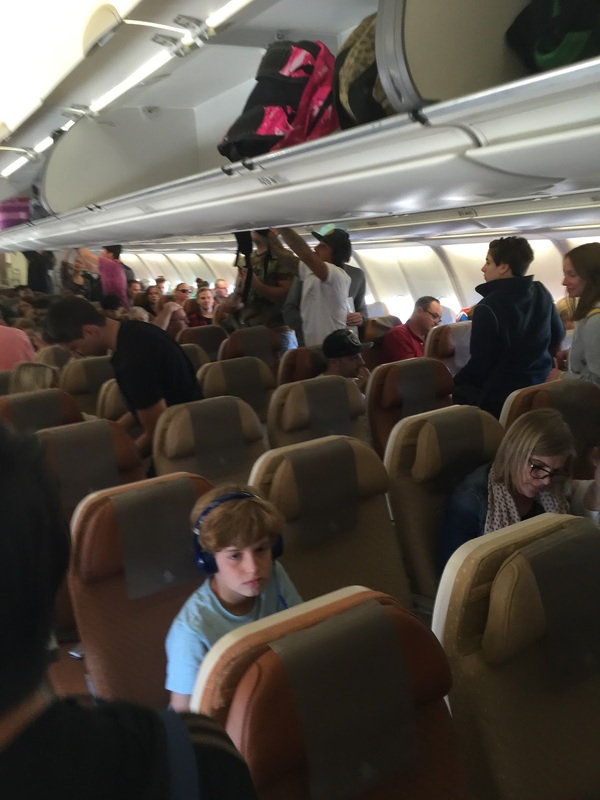 The aircraft is configured to take up to 285 passengers, with 30 in Business Class and 255 in Economy Class. 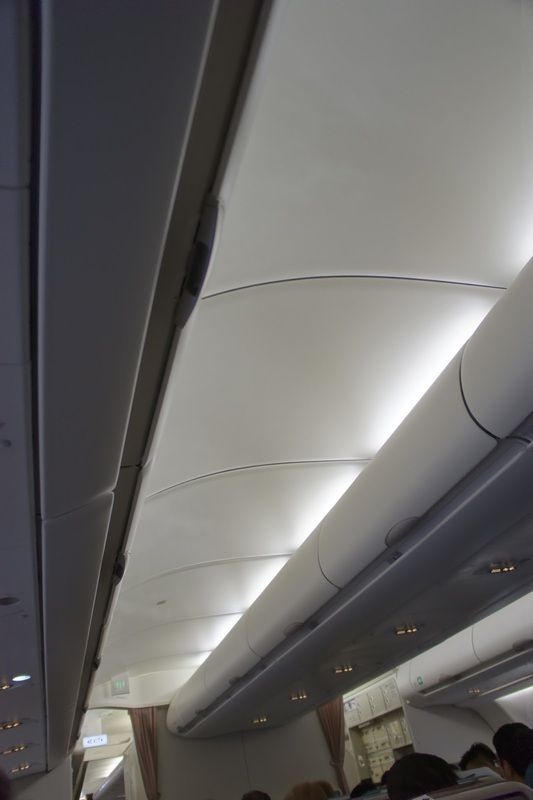 The Economy Class is further segmented in 2 sections, the forward and the aft section. 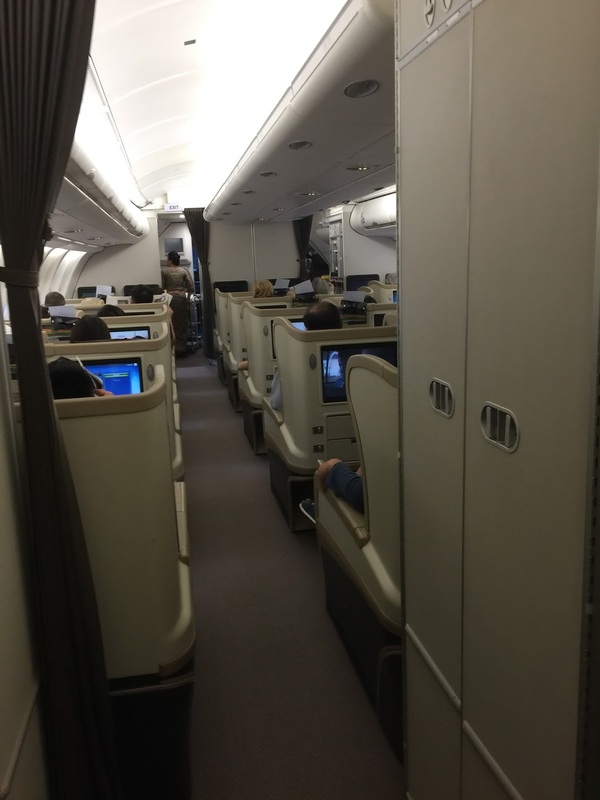 The forward section of the Economy Class is decked in Blue and Brown seats while the aft section is mainly decked out in brown seats. 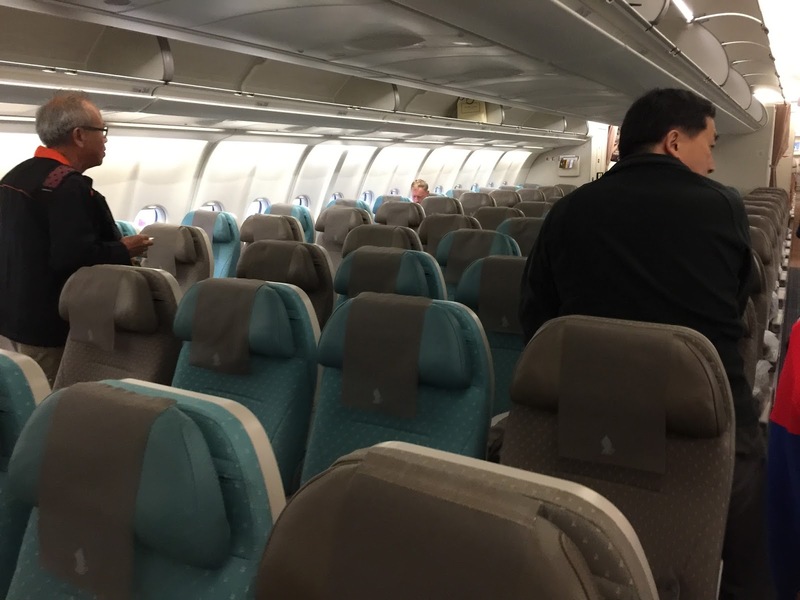 Seating configurations in Economy Class on A330-300 is 2-4-2. I took the forward section for my outbound flight to BKK and the aft section for my inbound leg. The brightly lighted cabin does not feel cramp and the natural tone of colour used by SQ makes it feel comfortable. 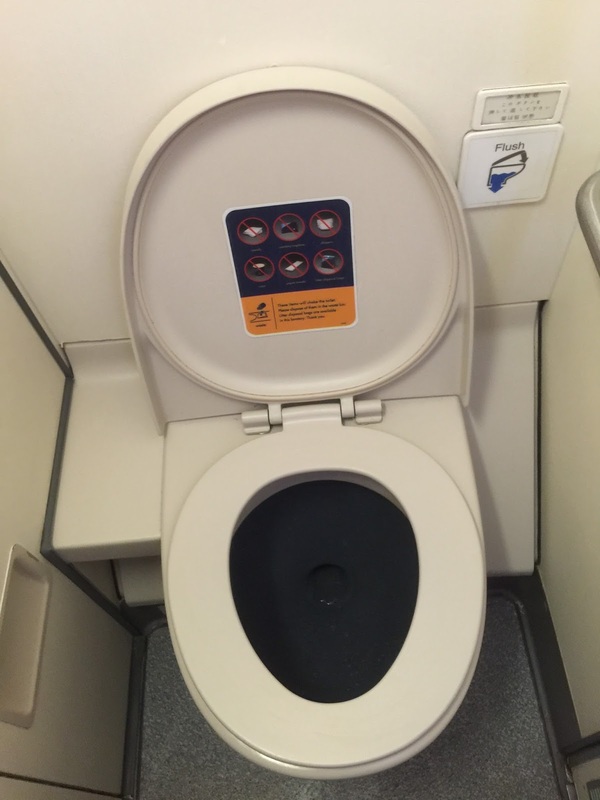 The lavatory onboard is rather cramp, however it is sufficient for one to do one’s business in. 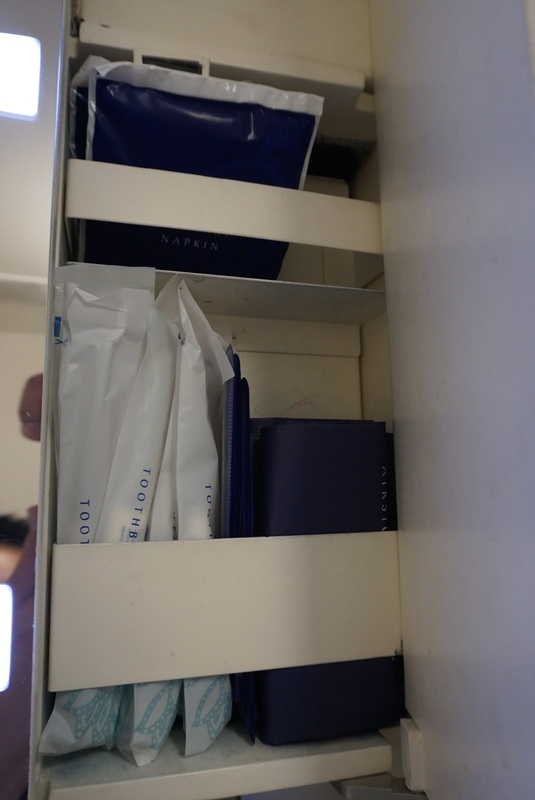 There are toothbrushes and combs as well as sanitary napkins provided in the lavatories, which is lacking in some of the airlines these days. 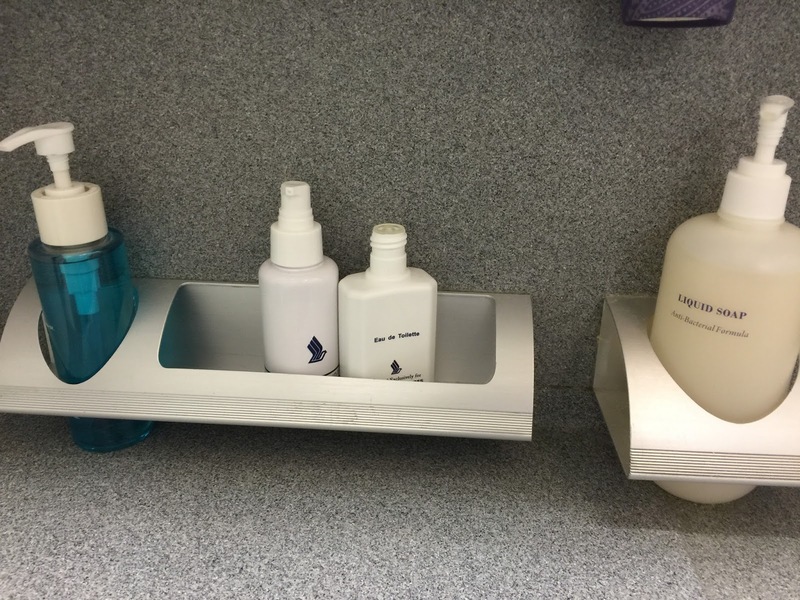 SQ also provides mouth wash, hand lotion and eau-de-toilette on top of hand soap. 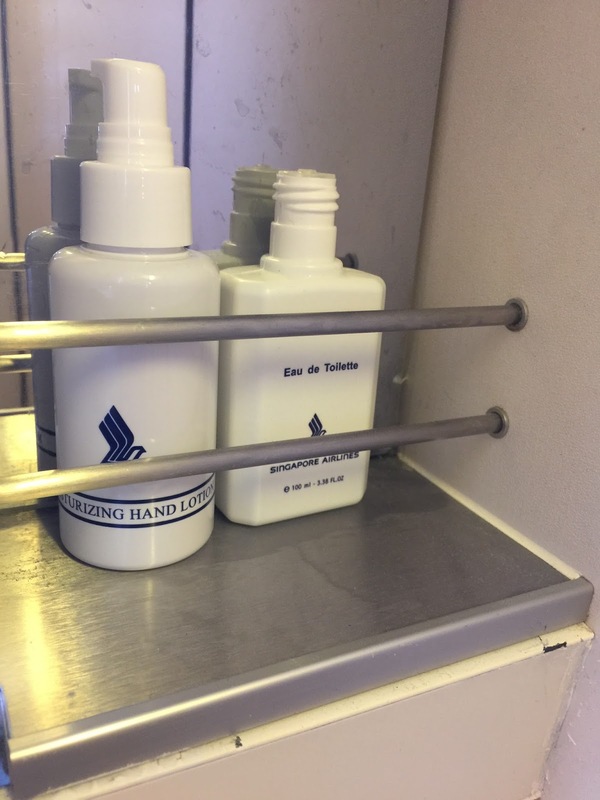 Most airlines (such as KLM) only provided hand soap in its Economy Class lavatories. 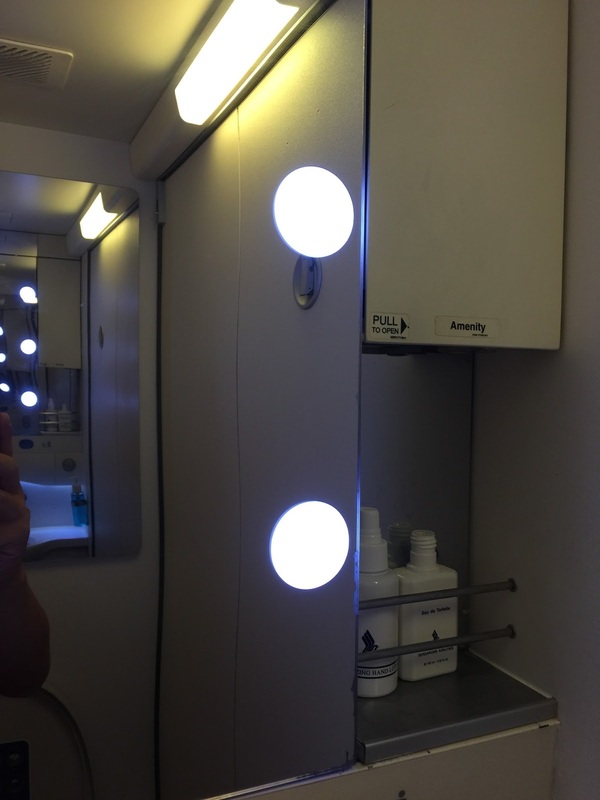 The lavatory is well-lited with make-up room lightings mounted on the mirror. 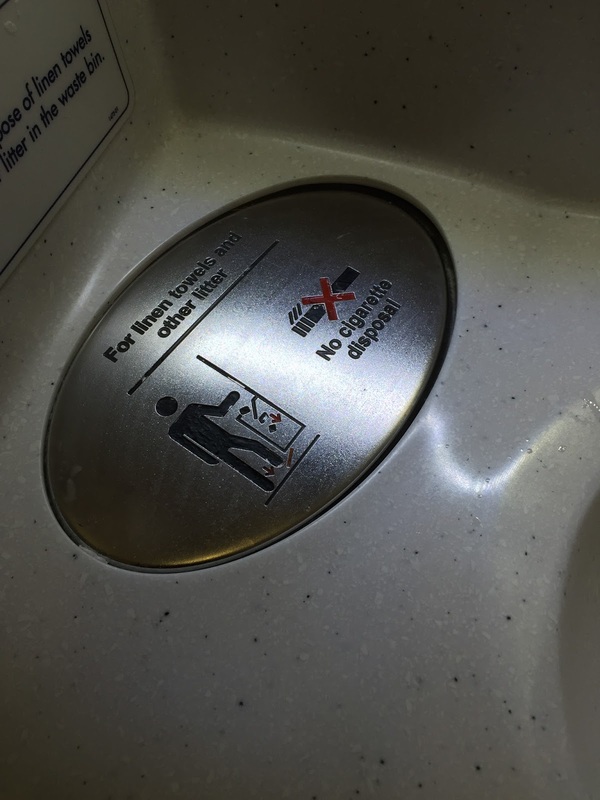 One feature I like about the lavatory is the paddle for the bin cover, which is a more hygienic arrangement. 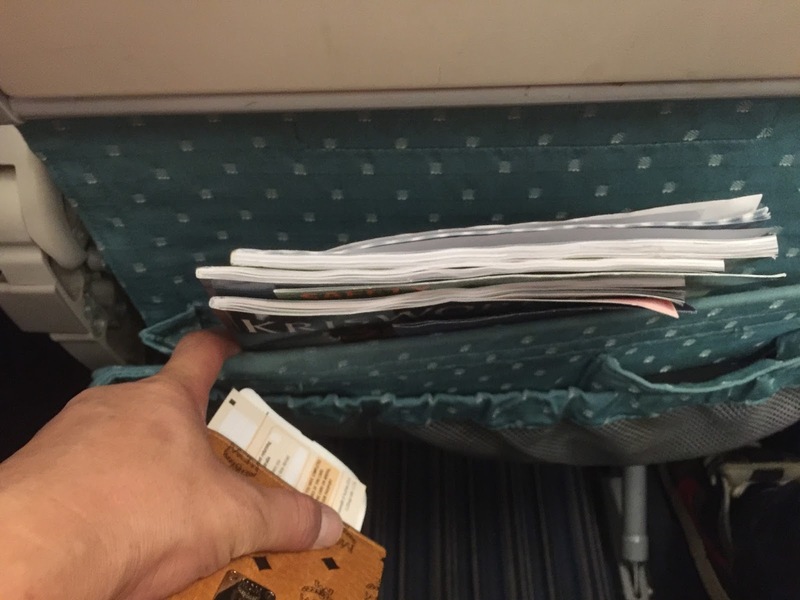 SQ has the most generous space amongst the airlines even in Economy Class. 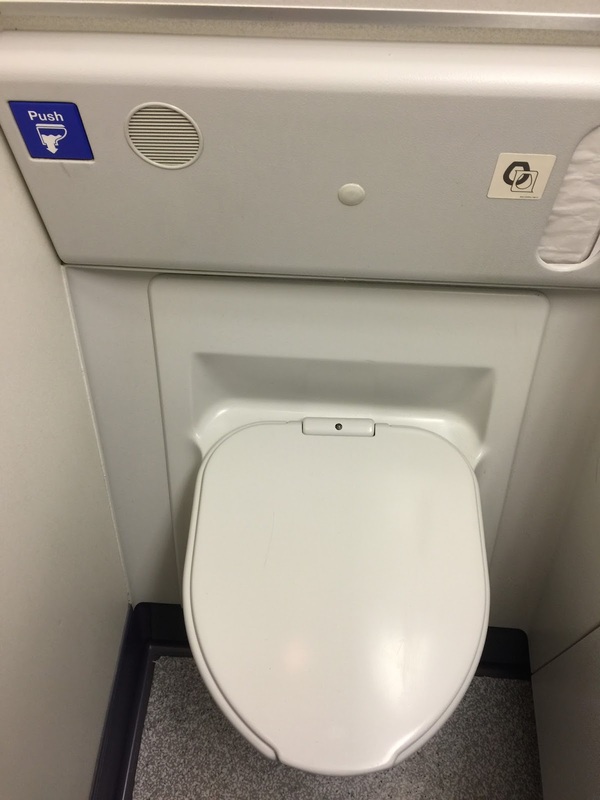 The Economy seats measures 32″ for its seat pitch and 19″ wide, providing ample leg room without feeling too cramped up in the cabin and passenger seating at the aisle seat does not necessary have to get out of his or her seat for passenger siding by the window. The fabric laden seats recline at 115°, which is very comfortable for resting. The seat slides forward during the reclining motion, passengers seating behind the seat does not feel too much space being intruded. 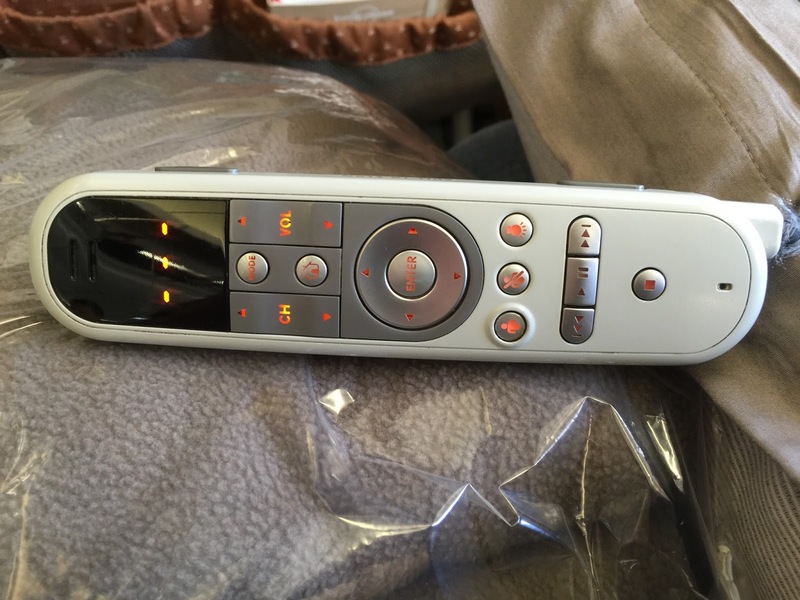 As with most Economy Class seats, the reclining button is located on the armrest. 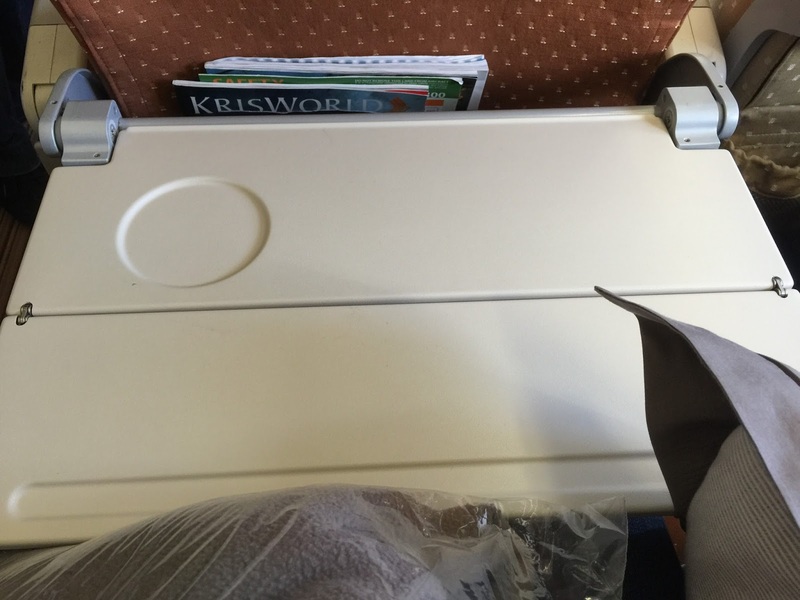 The seat comes with a dual fold tray table, with a small vanity mirror mounted on it. 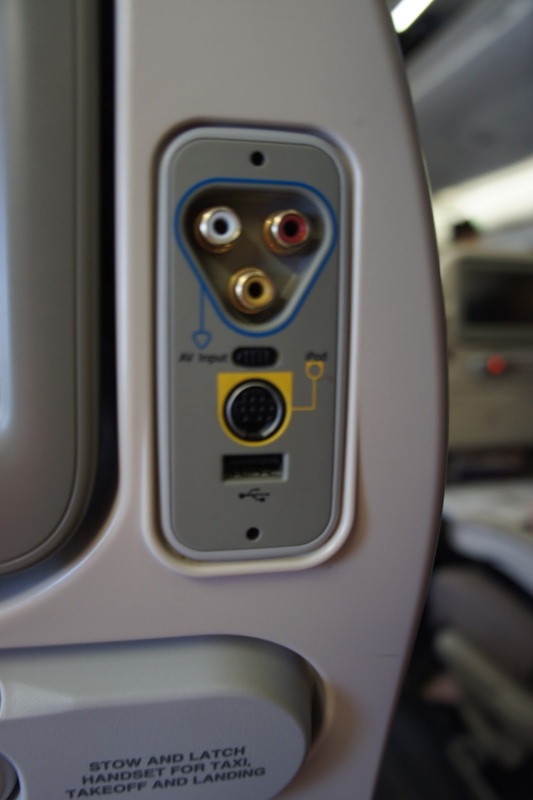 There is a USB charging port located on beside the IFE screen, together with the audio-visual jacks, allowing passengers to charge their mobile devices. 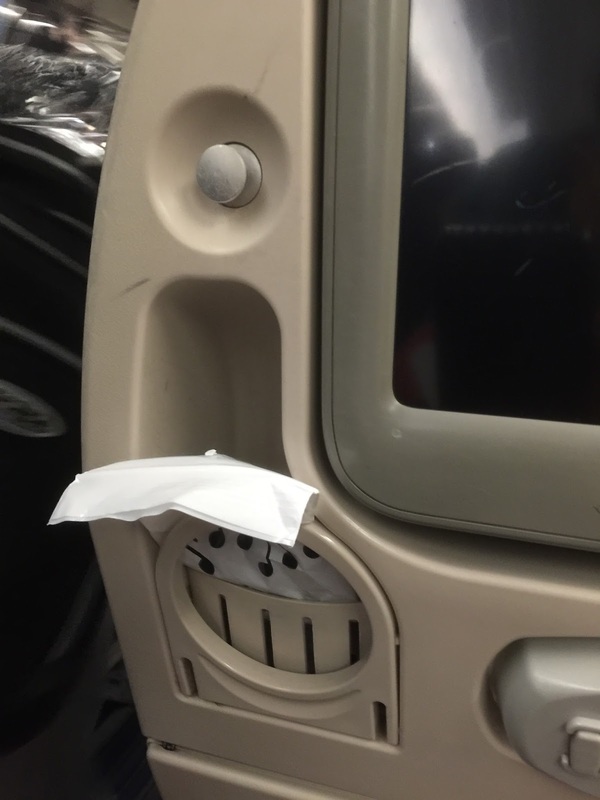 There is a small knob beside the IFE screen for passengers to hang their jackets. 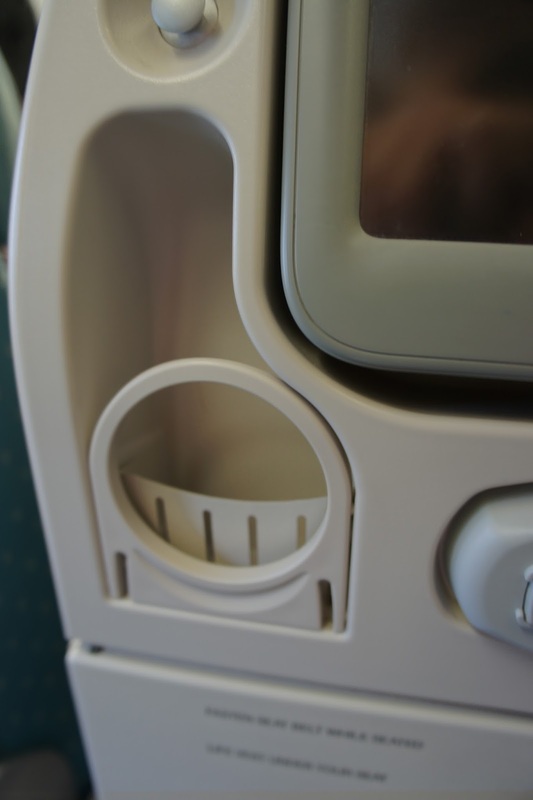 The cup holder is located beside the IFE with a small pocket for passenger to stow small items. 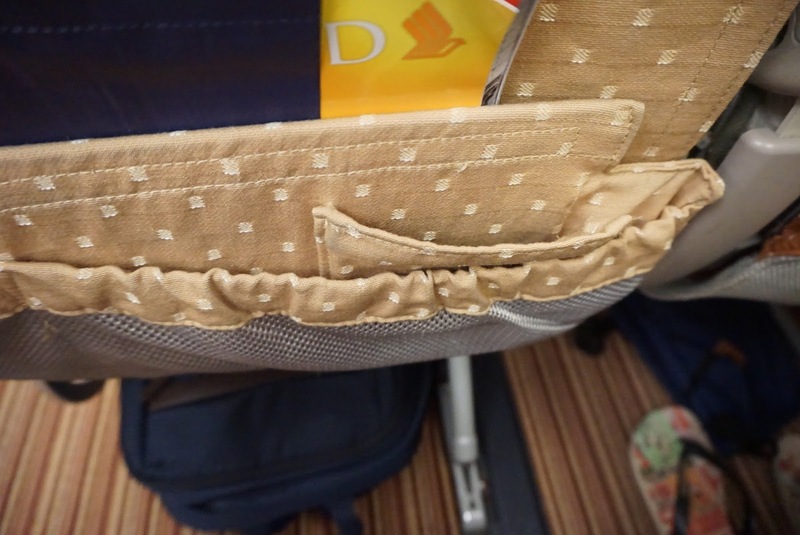 The seat pocket is compartmentalised into 2 packets with the front pocket having 3 sections. 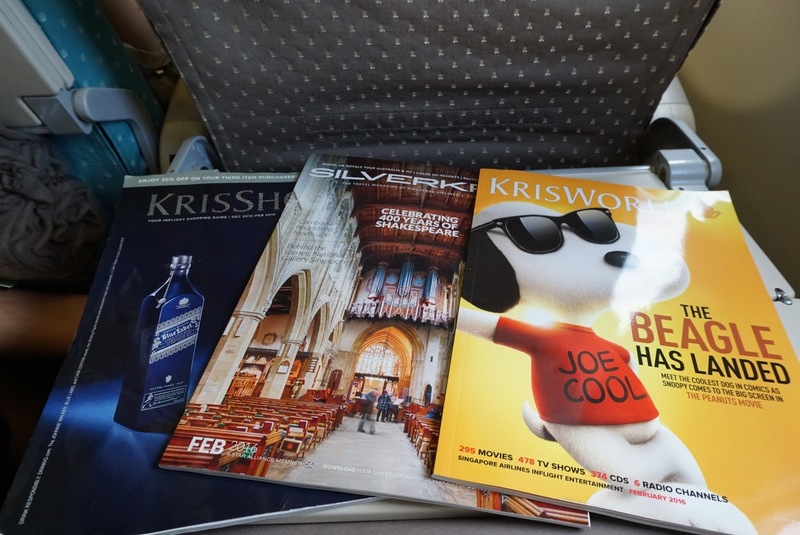 The usual inflight magazines are stored in the inner section of the seat pocket, allowing passengers to put their smaller items in the outer pocket. The head rest can be adjusted to match the head level of the passenger occupying it. It is also foldable to provide more comfort. 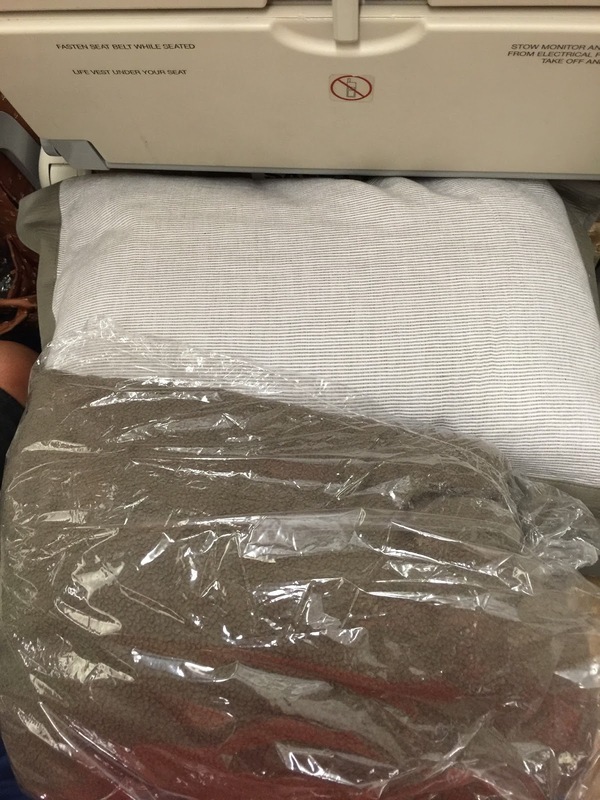 Pillow and Givenchy fleece blanket are distributed on the seats before boarding passengers. The pillow provided by SQ seem larger than other airlines in the Economy Class, however I find the blanket a tad too thin. 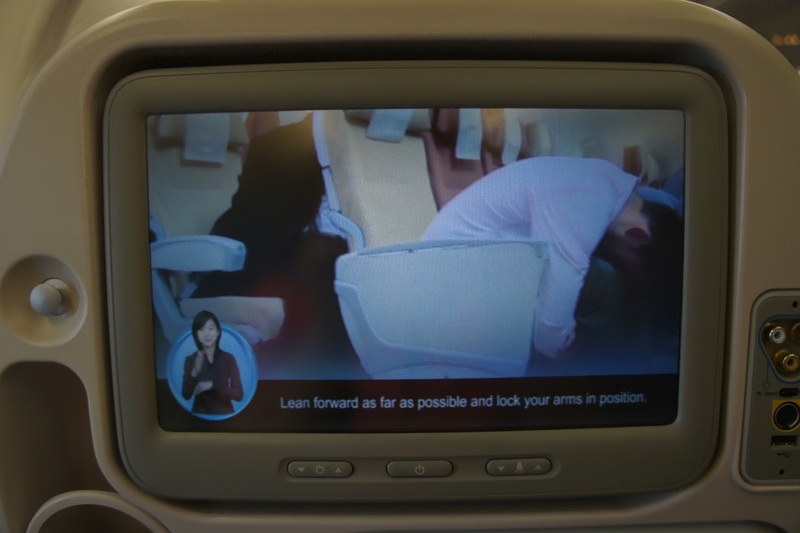 The personal screen in Economy Class cabins measures 10″, which is larger than most other airlines offers. However the personal screen is not touch screen, which does not matter to me. The controller provided is responsive enough. 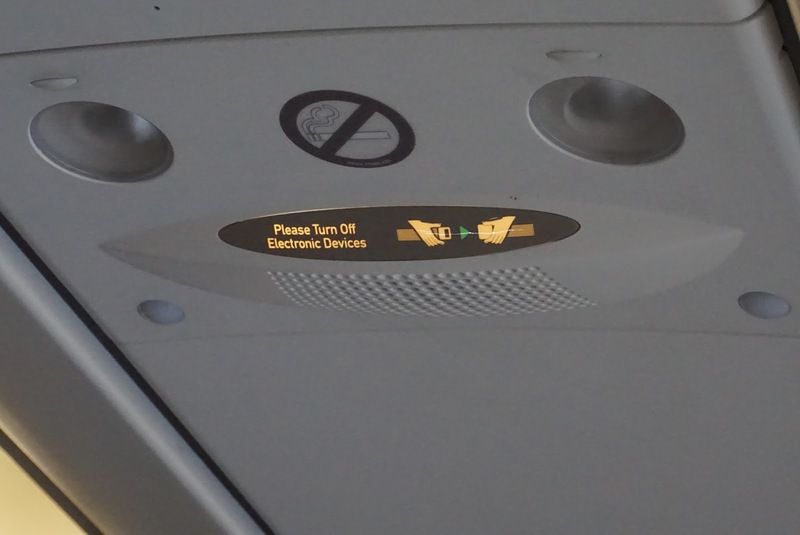 There is a row of LED lights mounted on the bottom part of the screen, providing more lighting to passengers if required. The IFE has numerous programmes, ranging from movies to TV programmes. 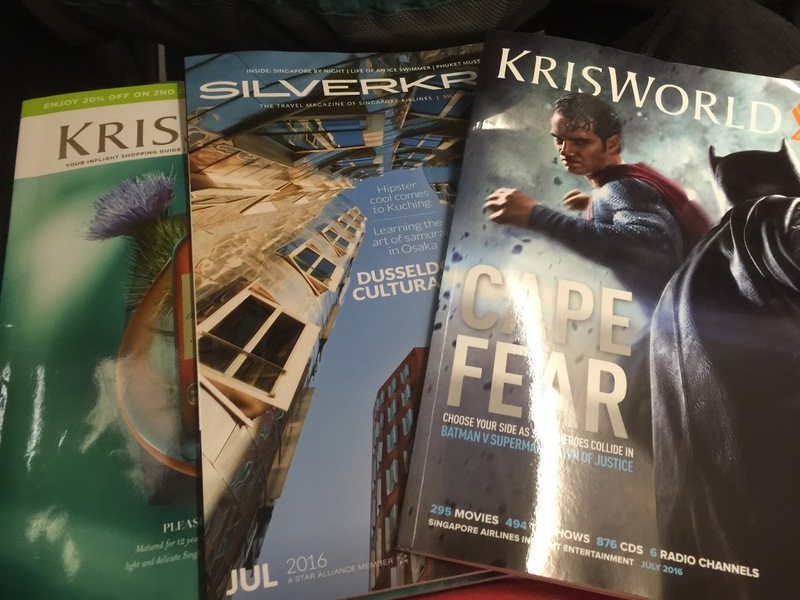 There is even a preview section for in-flight movies that will be screened in the month to come. 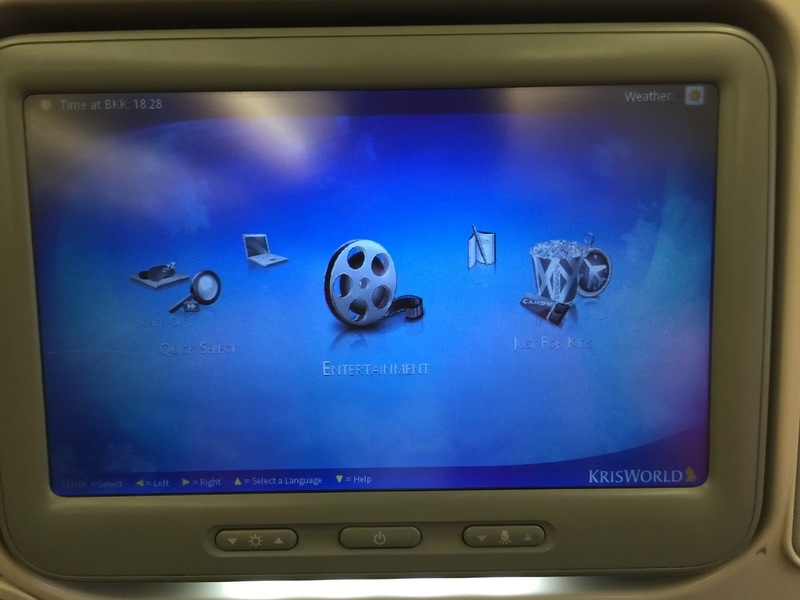 Games are also available as part of the IFE system provided by SQ. 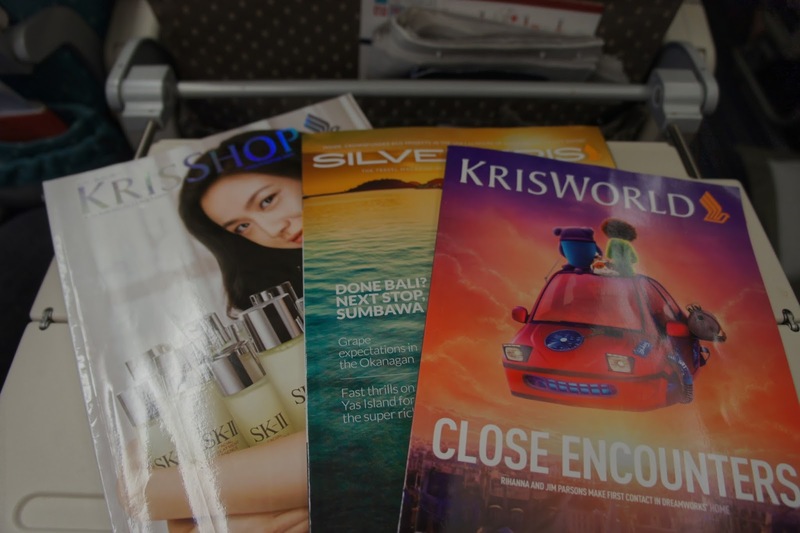 Unlike my previous experience with SQ (it has been awhile since I last flown on SQ), menus are not distributed. 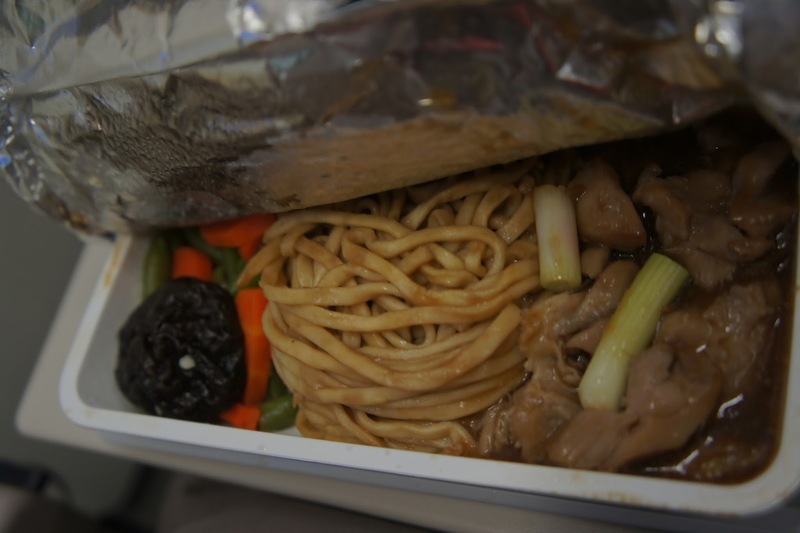 Passengers will only know of what is served during meal service. On this leg, we were given options of Chicken with Stir-Fried noodles or Fish & Potato. 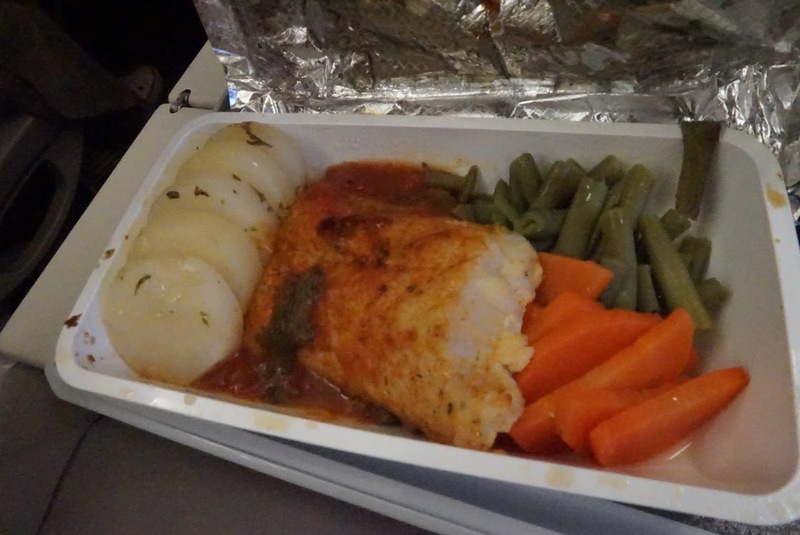 The chicken meal does not look appetising, while the fish meal tasted rather fresh. The portion of food is sufficient to fill one’s stomach. 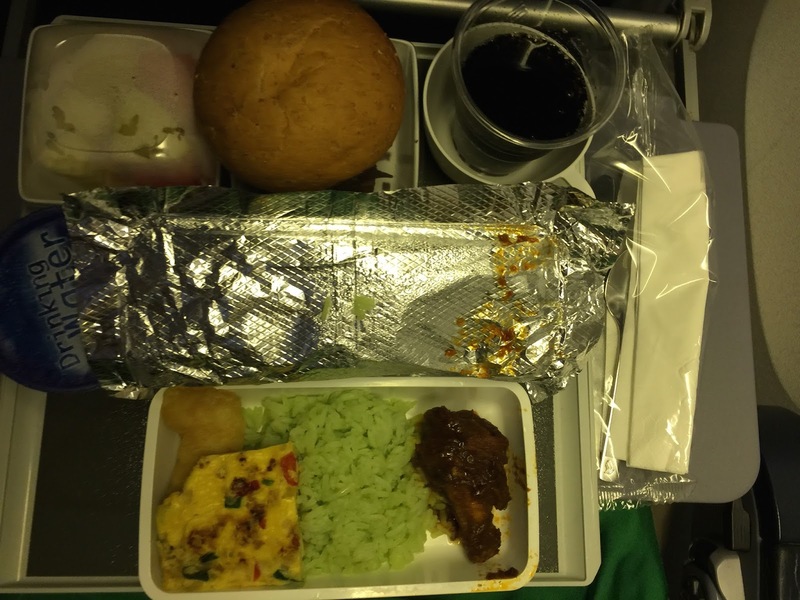 On this leg of the flight meal options were Fish & Potatoes and Chicken Nasi Briyani. I opted for the chicken meal on this leg and it is very tasty. The flavourful Nasi Briyani is much better than some of the those found in Singapore. 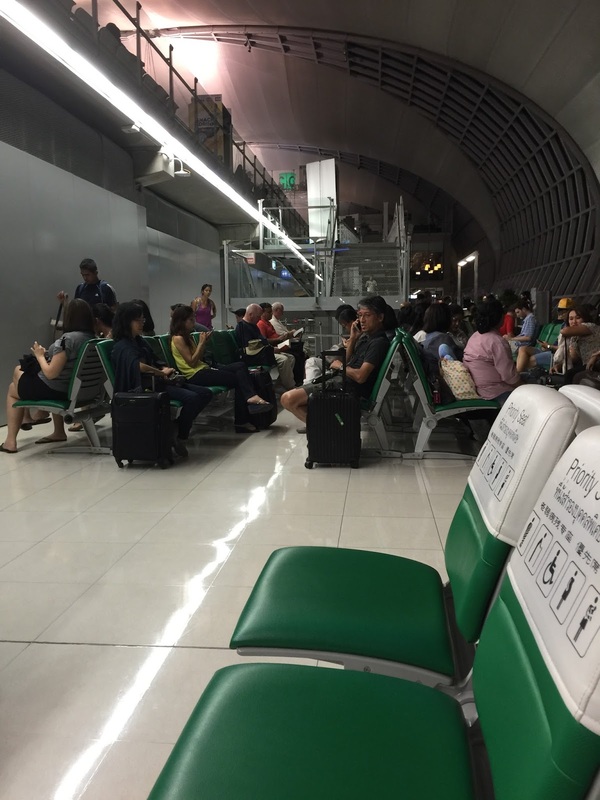 As SIN – BKK route is a short route, ice-cream were not provided, dessert was sponge cake for both legs. The service onboard for both legs were impeccable. 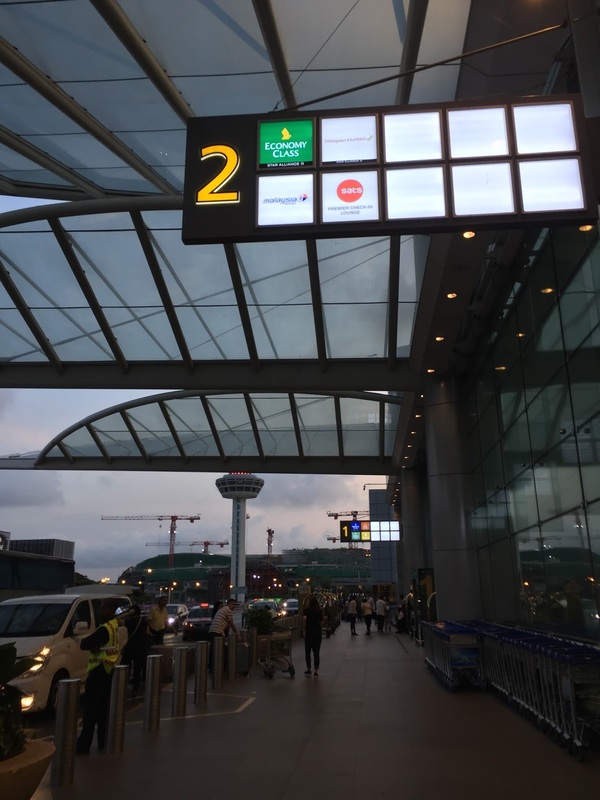 The ever friendly Singapore Girl and flight attendants welcomed passengers with a warmth and genuine smile at the door when boarding. 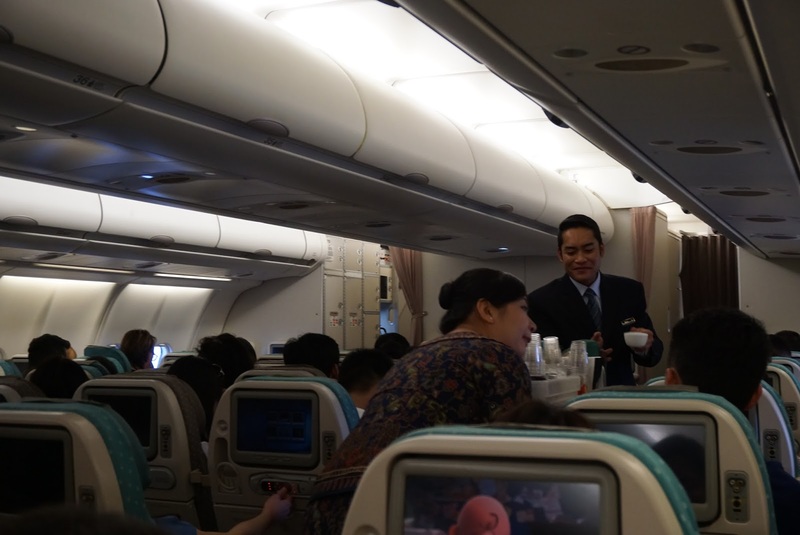 Even in Economy Class, the flight attendants were friendly and tries their best to accommodate to requests. The flight attendants were always seen smiling to the passengers, be it during meal service or other times. On my outbound leg, I witnessed the flight attendants paying particular attention to a family with 2 kids. 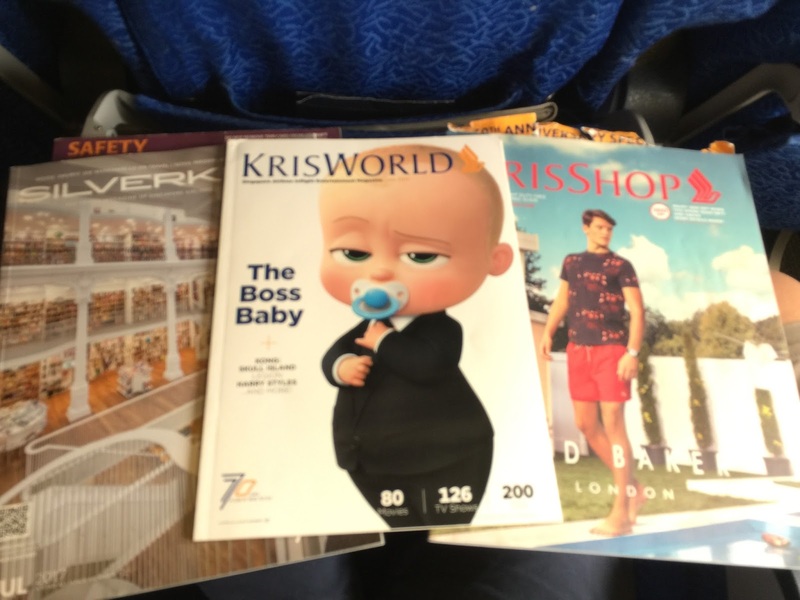 They ensured that the kids are well taken care of, occasionally popping by to check if these young passengers are comfortable on the short 2 hour flight. 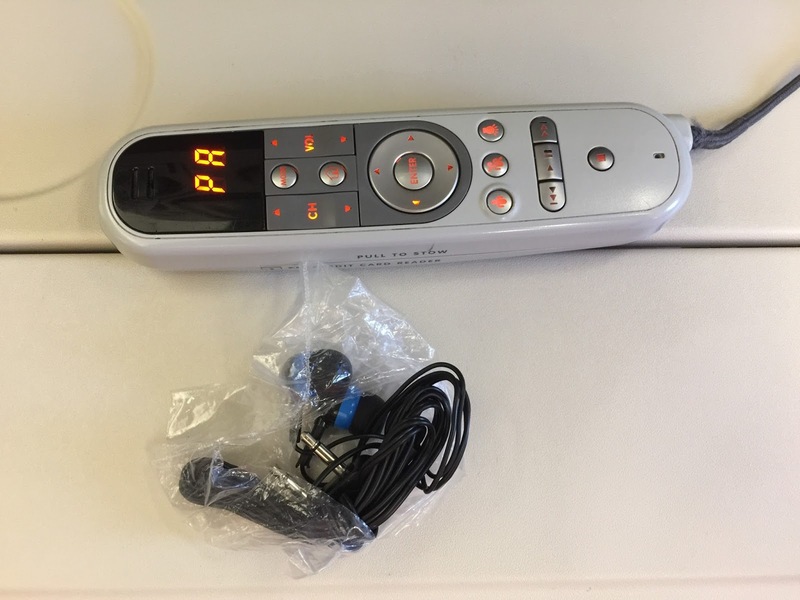 My seat wasn’t provided with earphones, when requested for, the flight attendants apologise for the oversight (although it is definitely not their fault, but the Singapore Girl apologised for the inconvenience). I requested for some soda prior to the meal service, the soda was delivered almost immediately and I did not have to wait till meal run for some water. 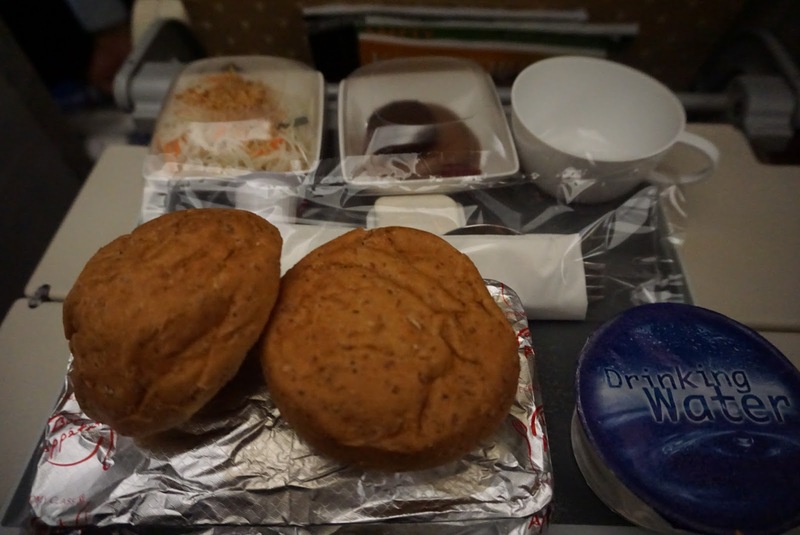 The flight attendants even checked if I had enjoyed the food, which is rarely seen in Economy Class. 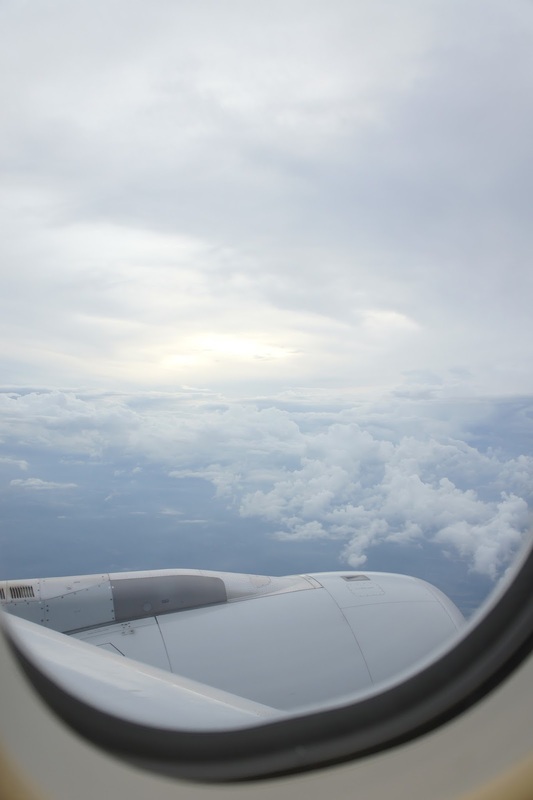 Overall, the flight is comfortable and enjoyable. 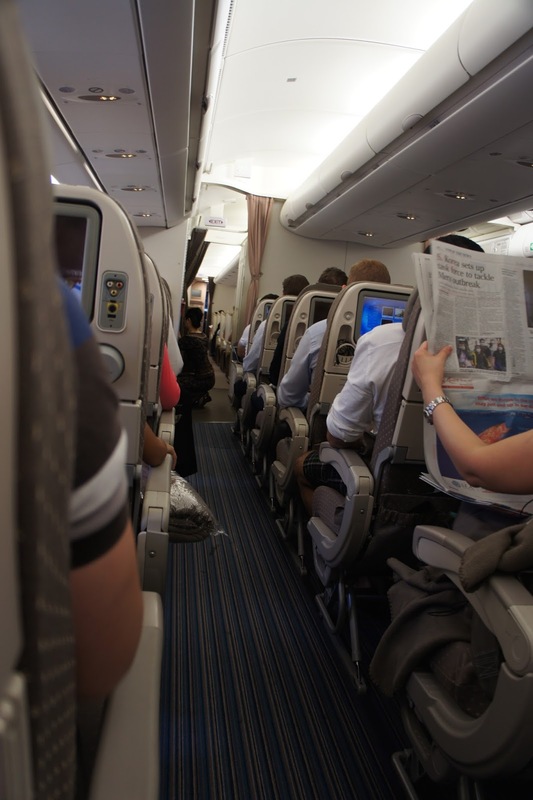 The seats are comfortable and the entertainment is plentiful to make the flight feel short. 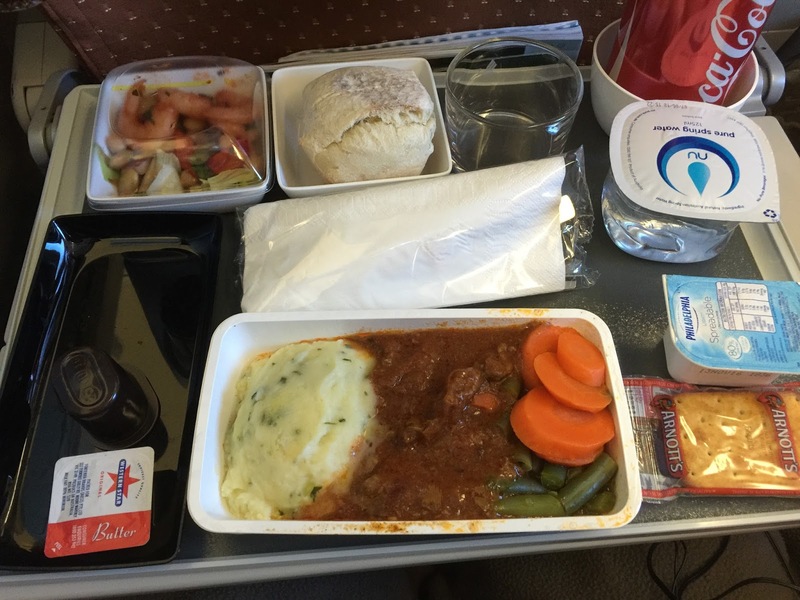 The food is acceptable but most importantly the genuine service by the flight attendants makes the flight pleasurable.